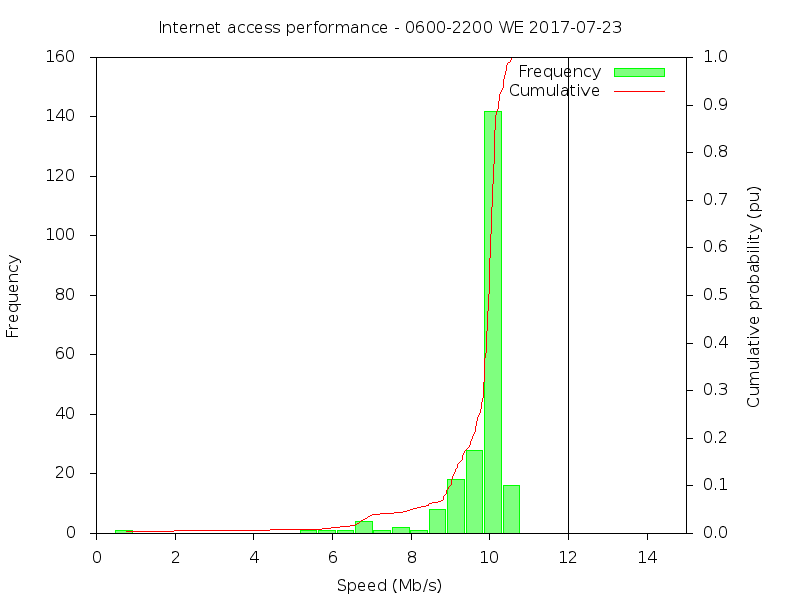 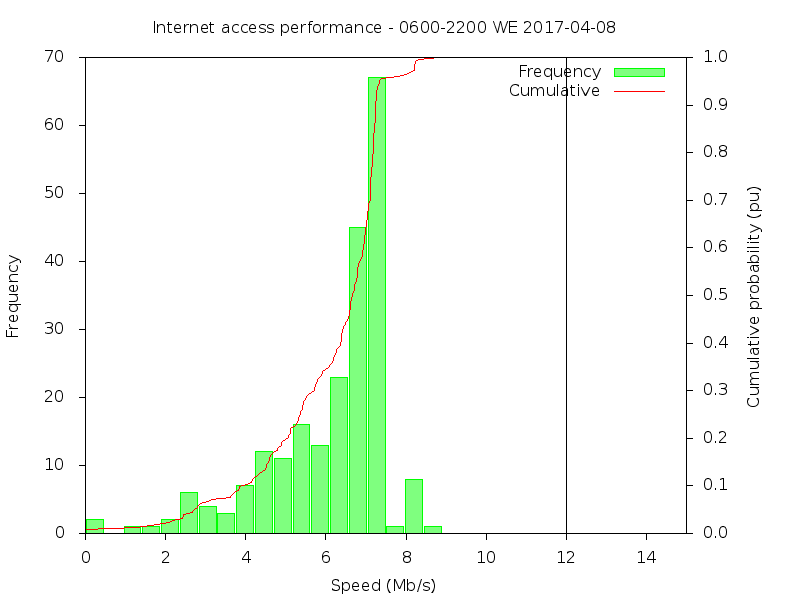 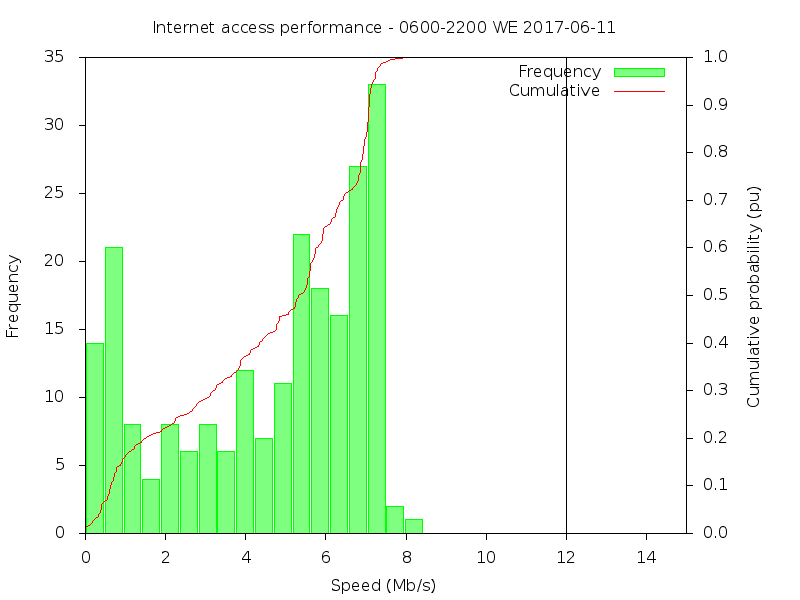 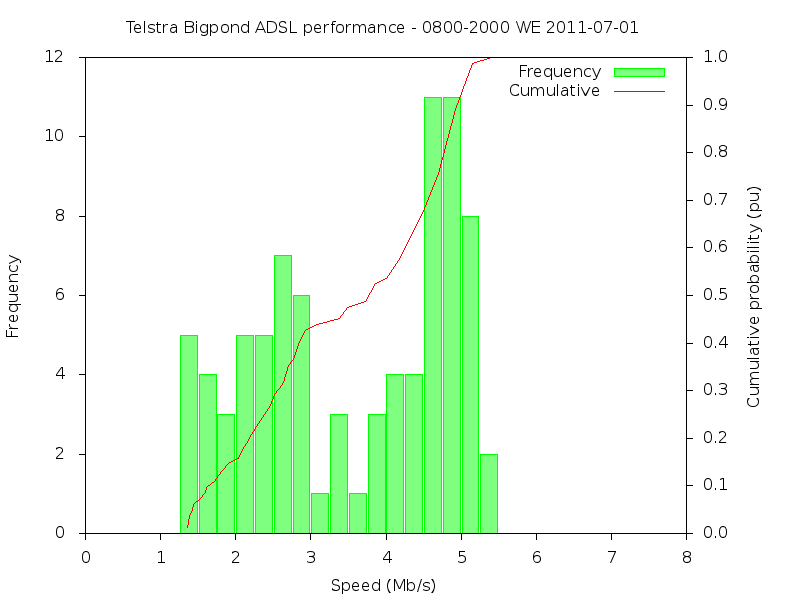 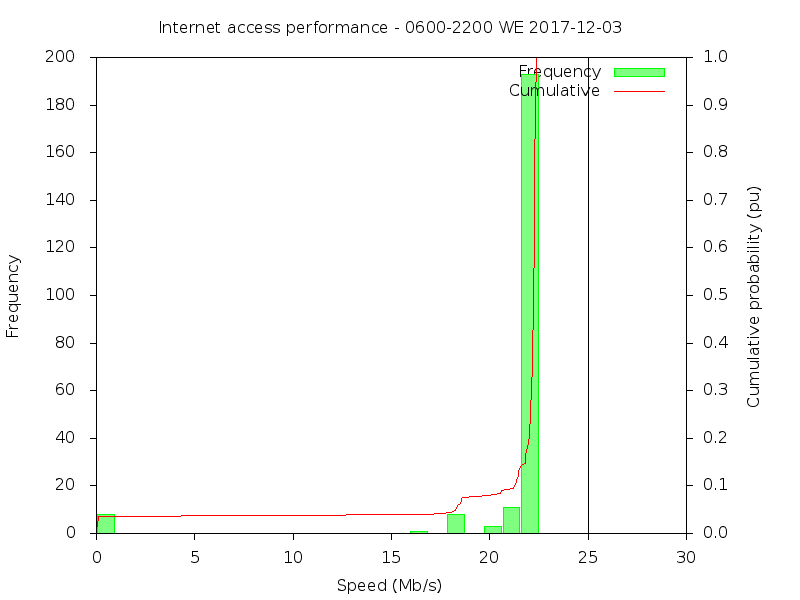 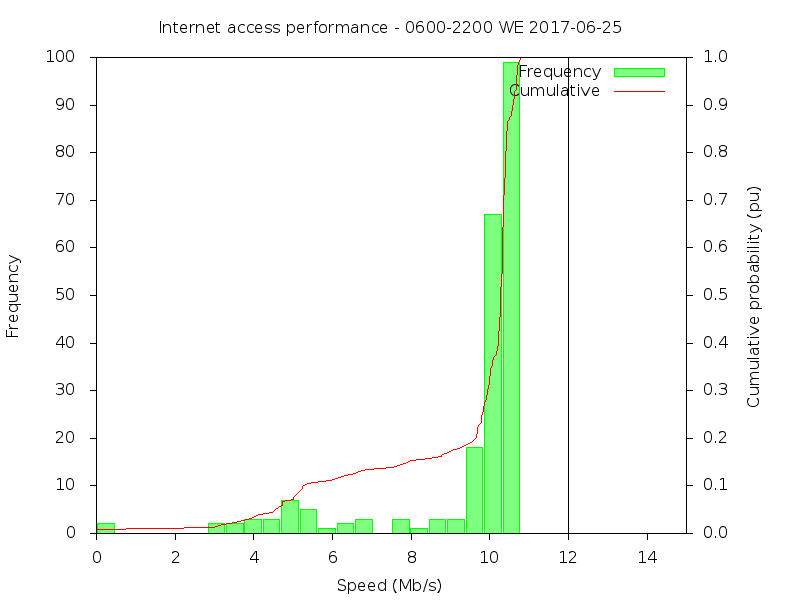 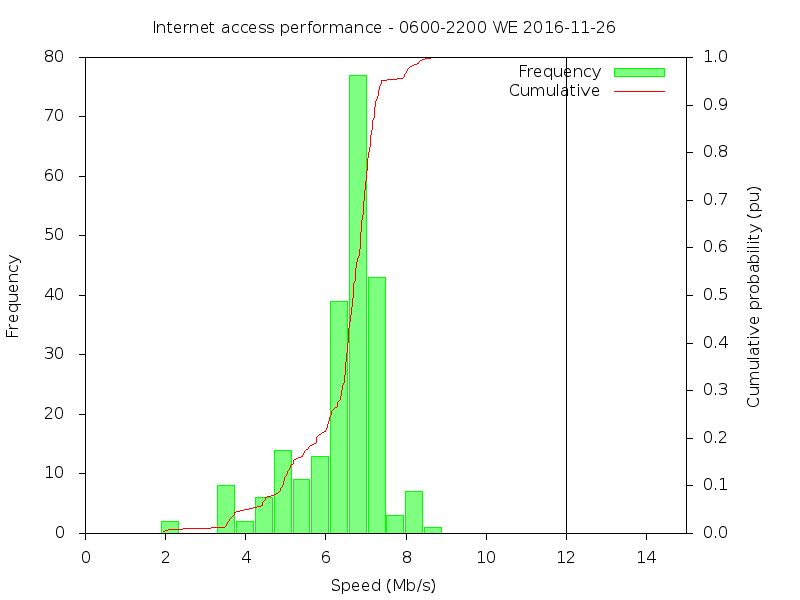 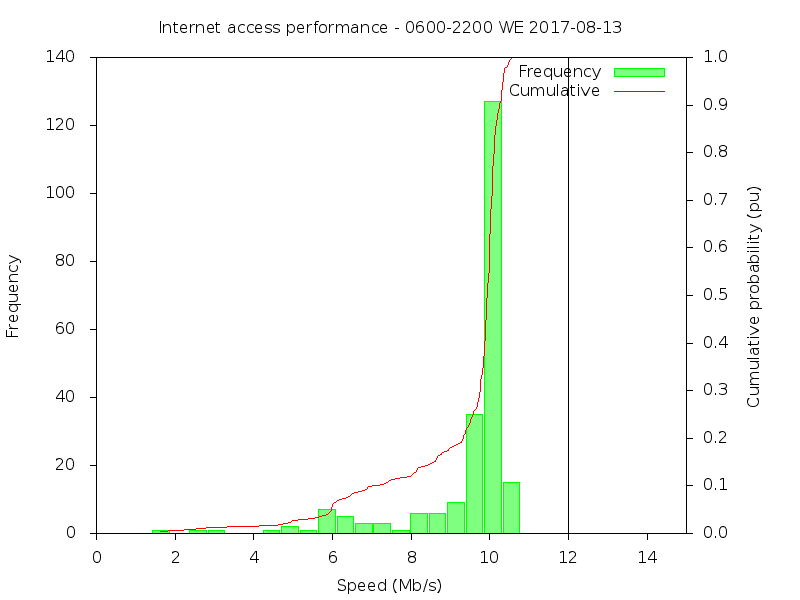 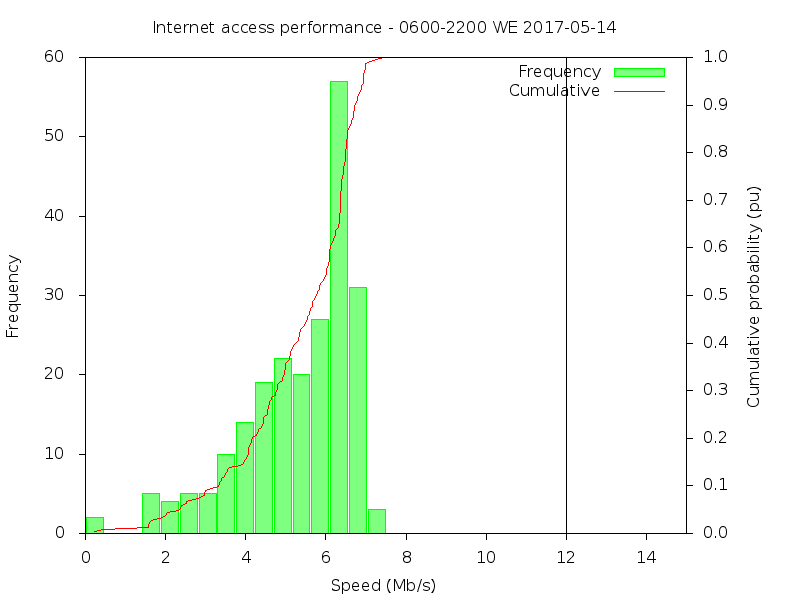 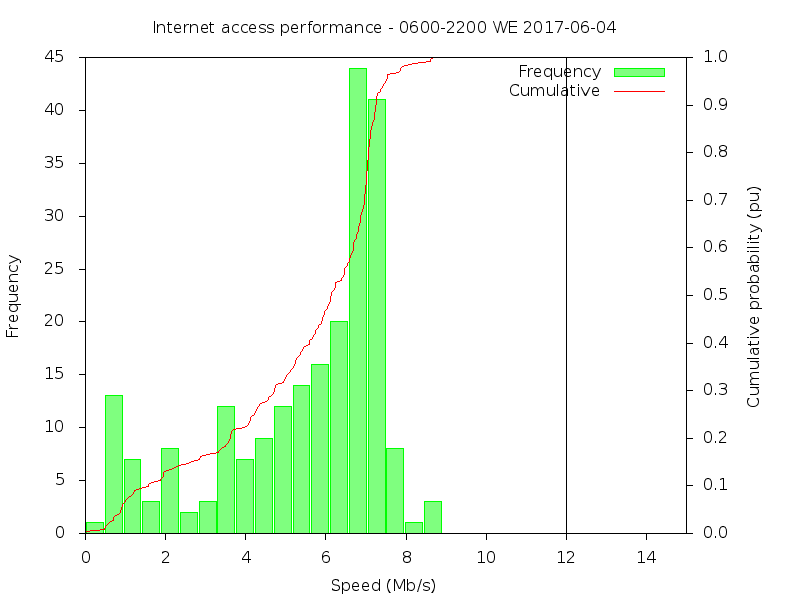 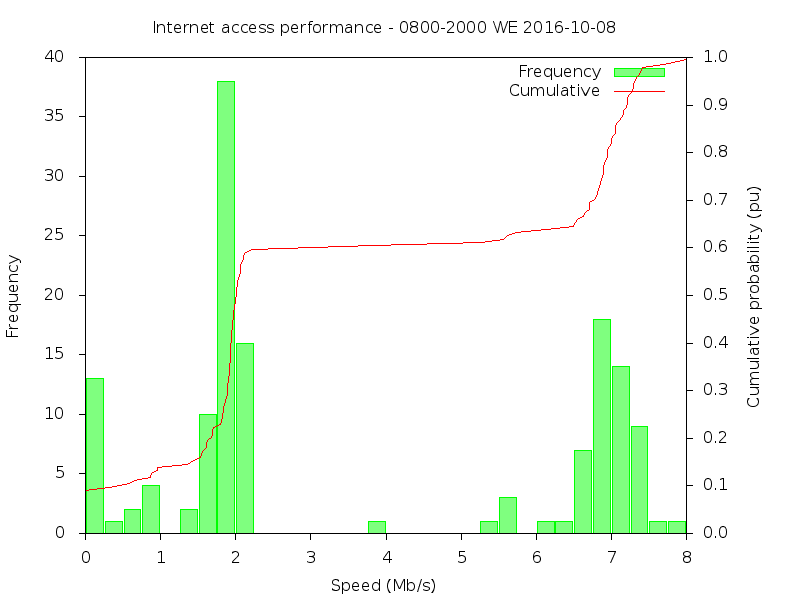 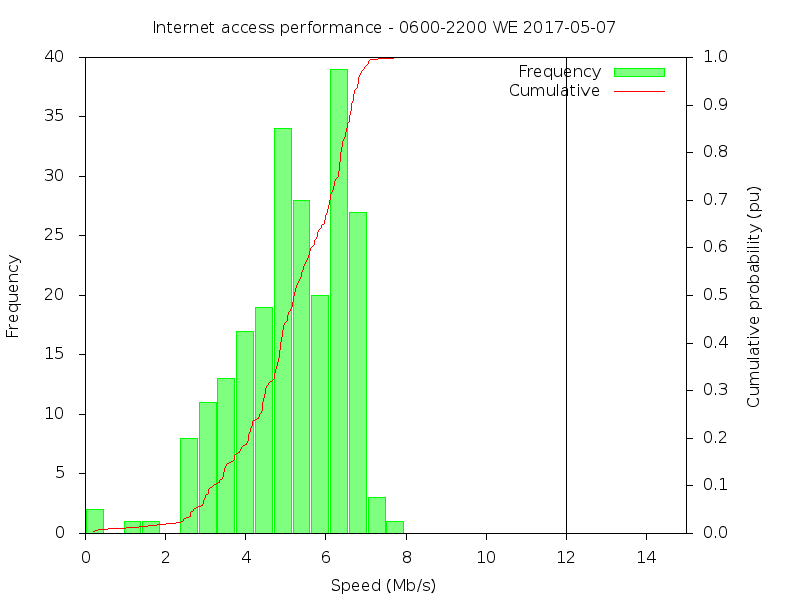 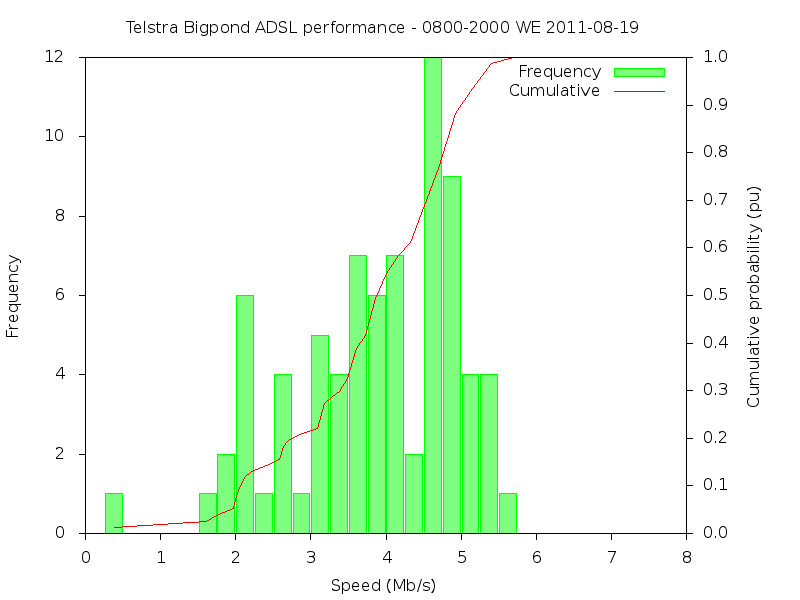 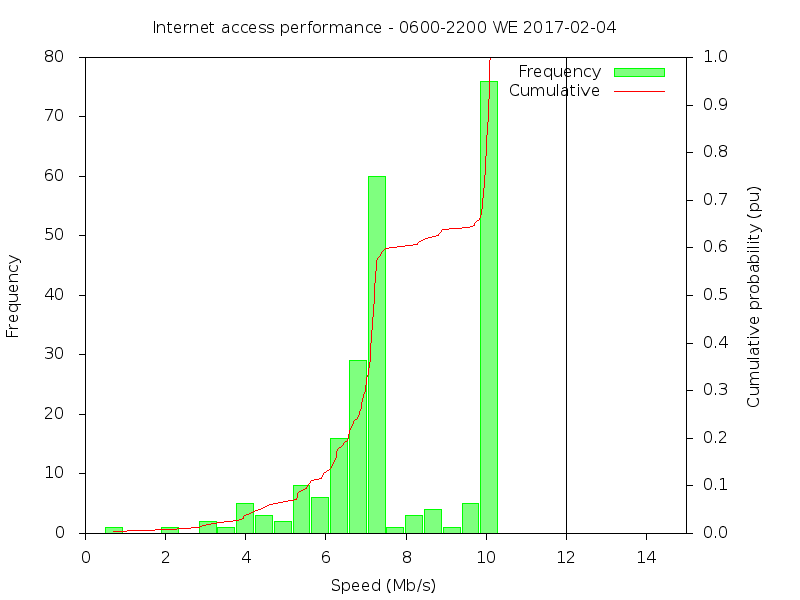 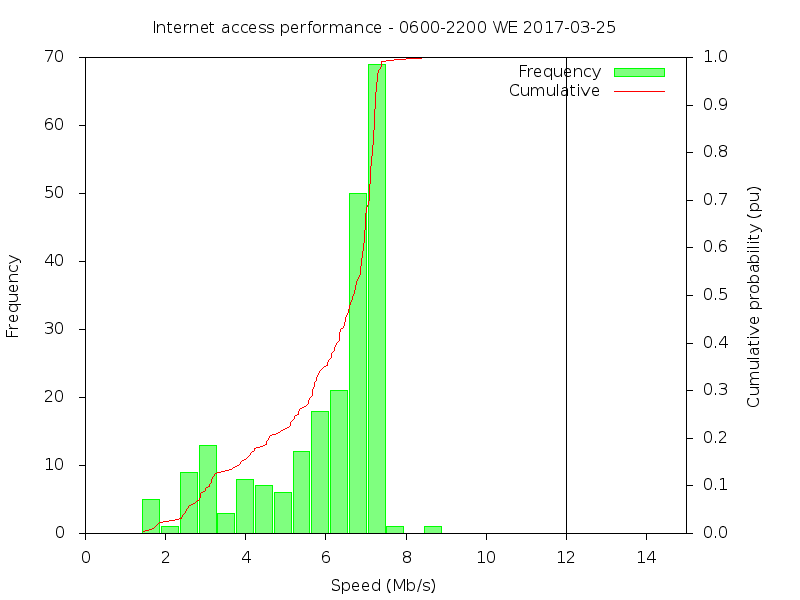 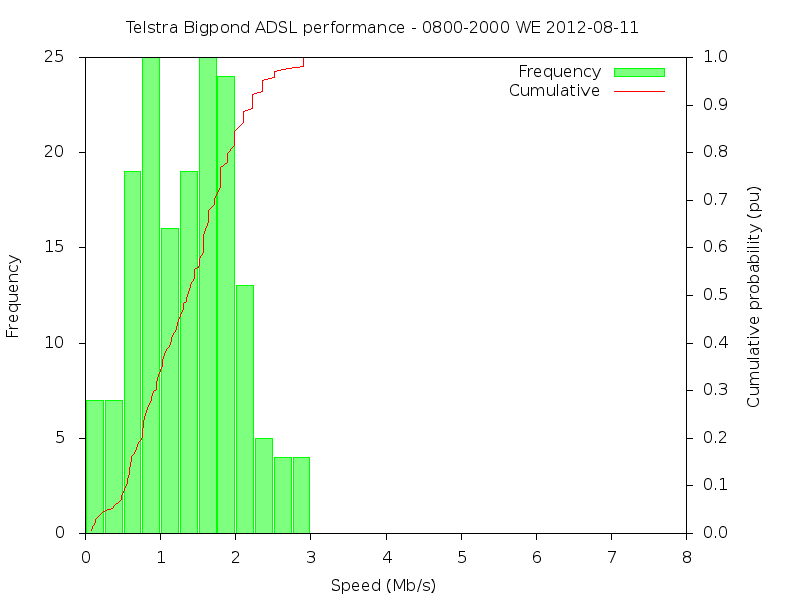 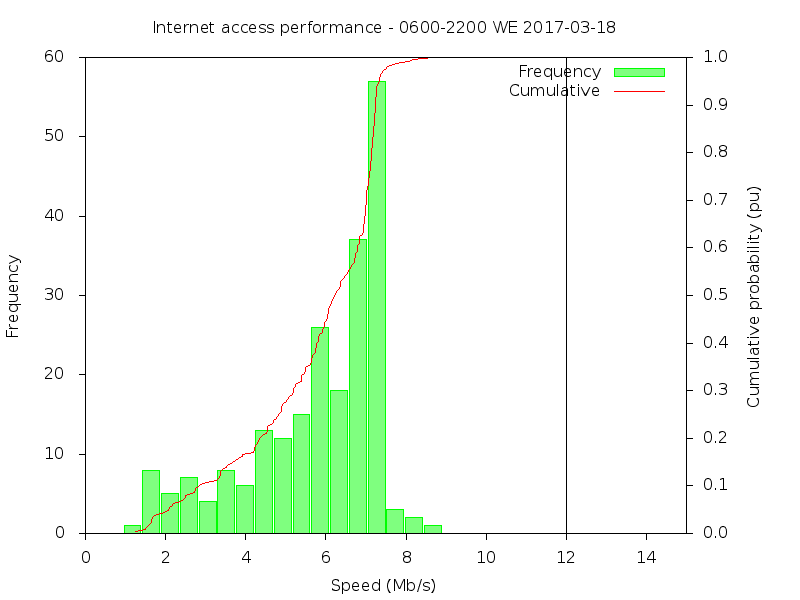 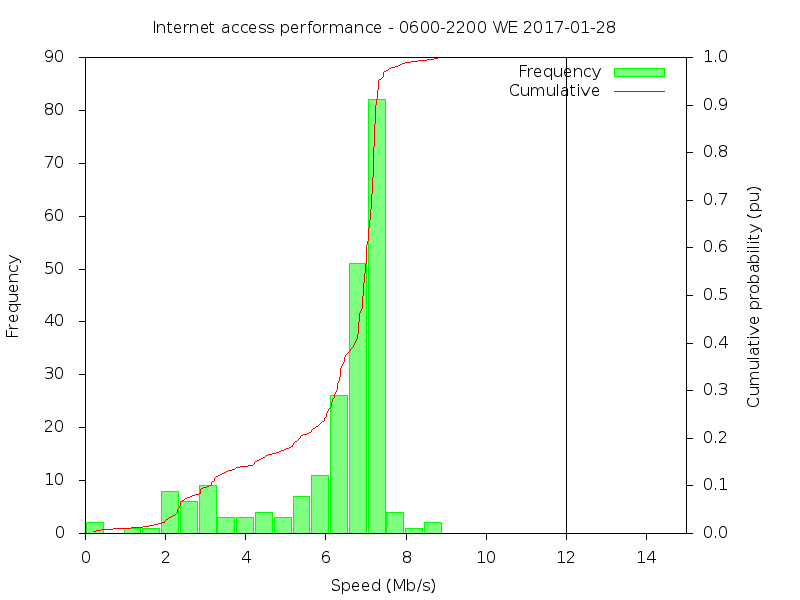 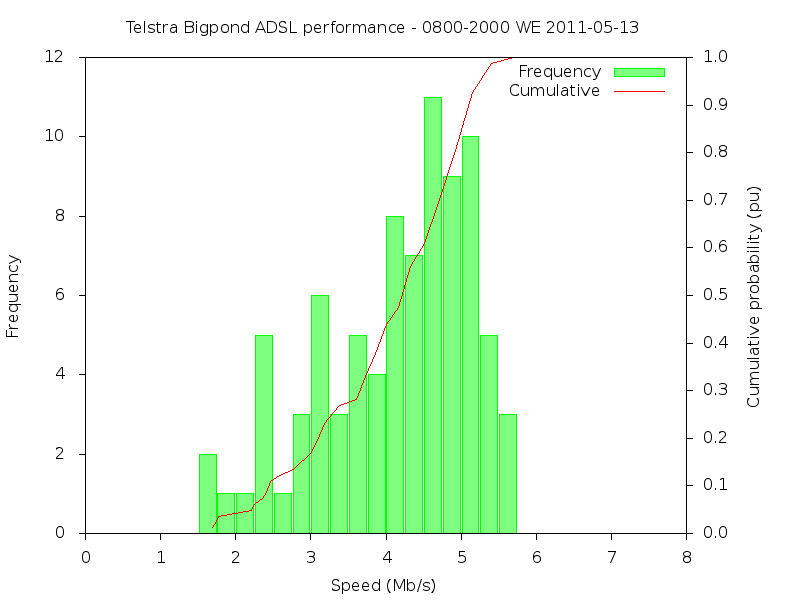 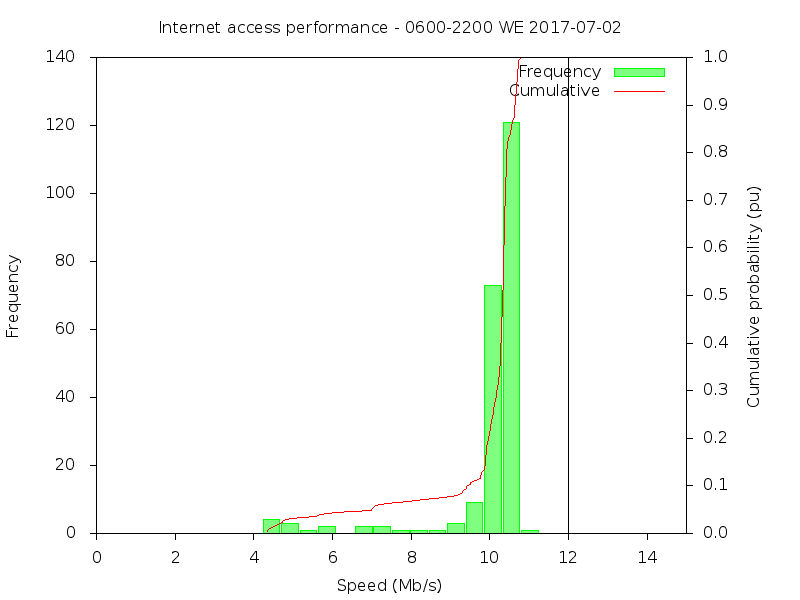 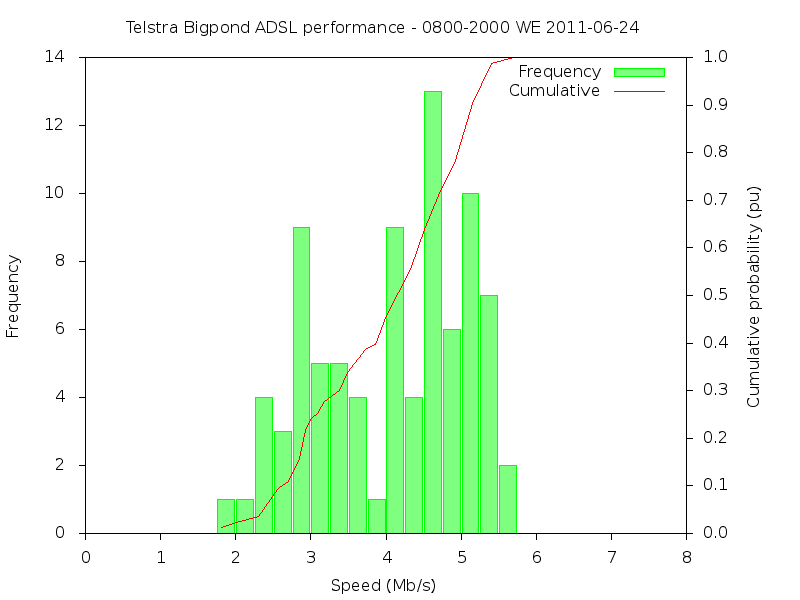 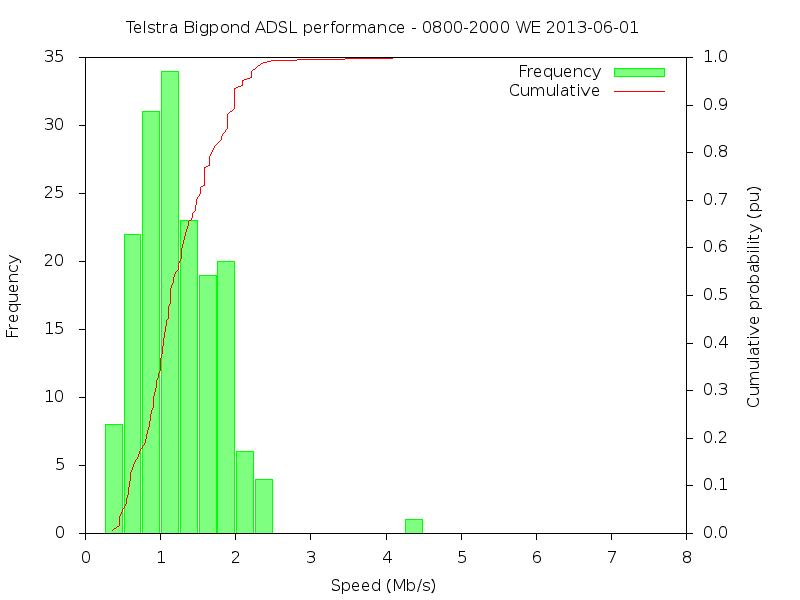 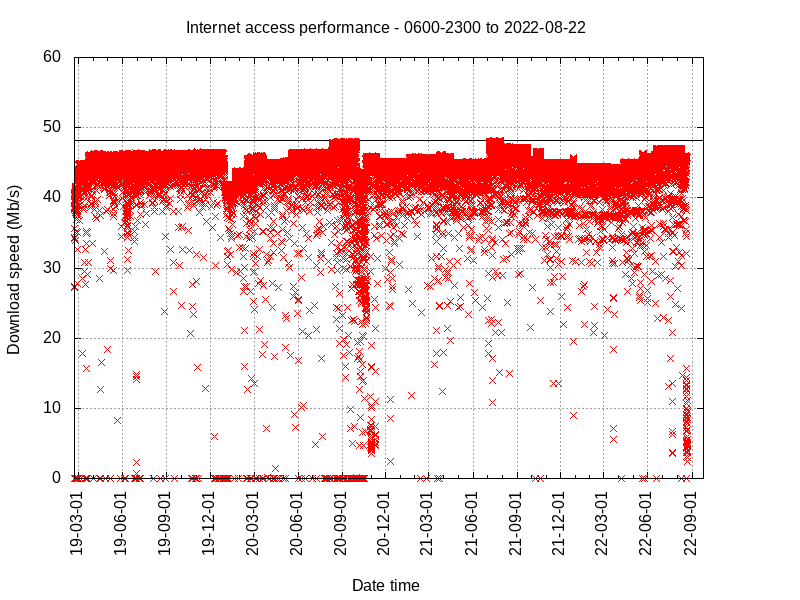 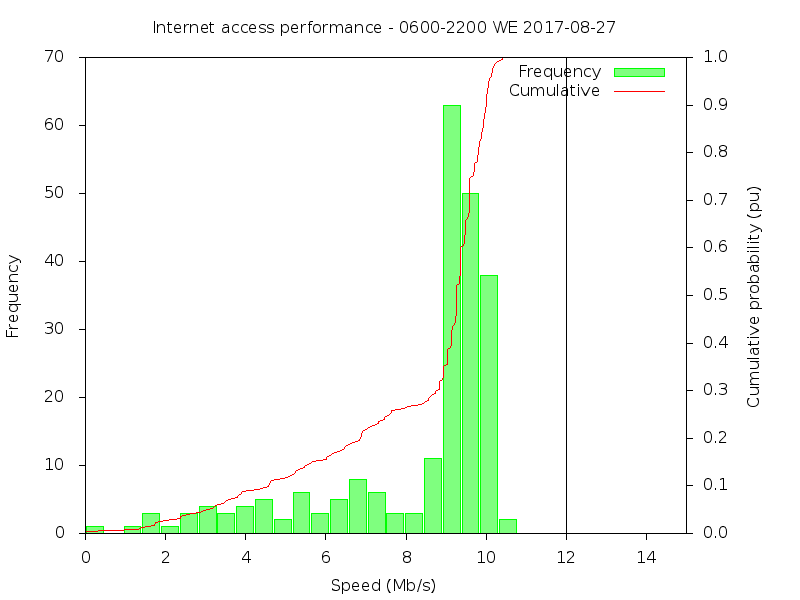 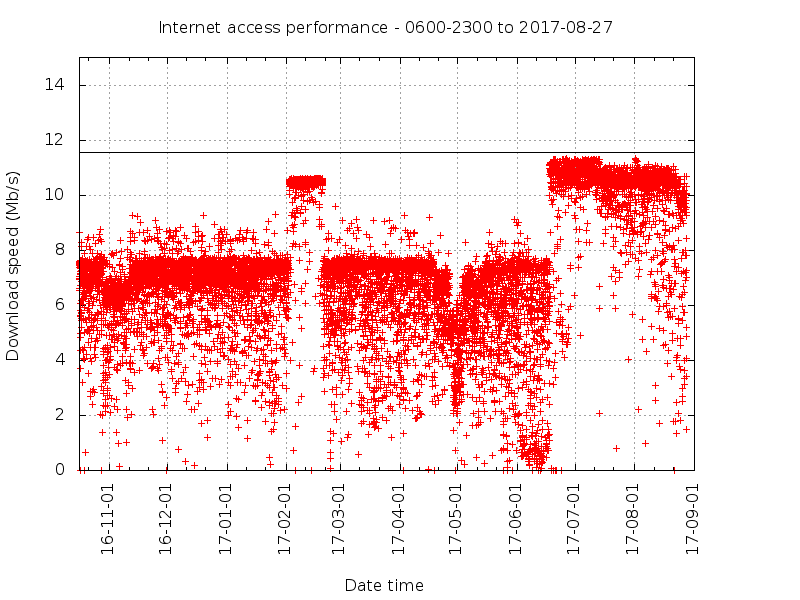 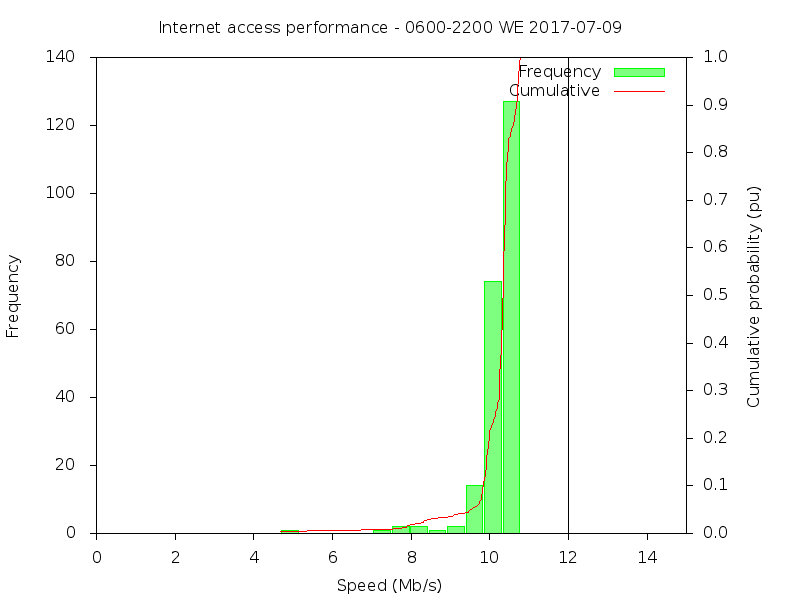 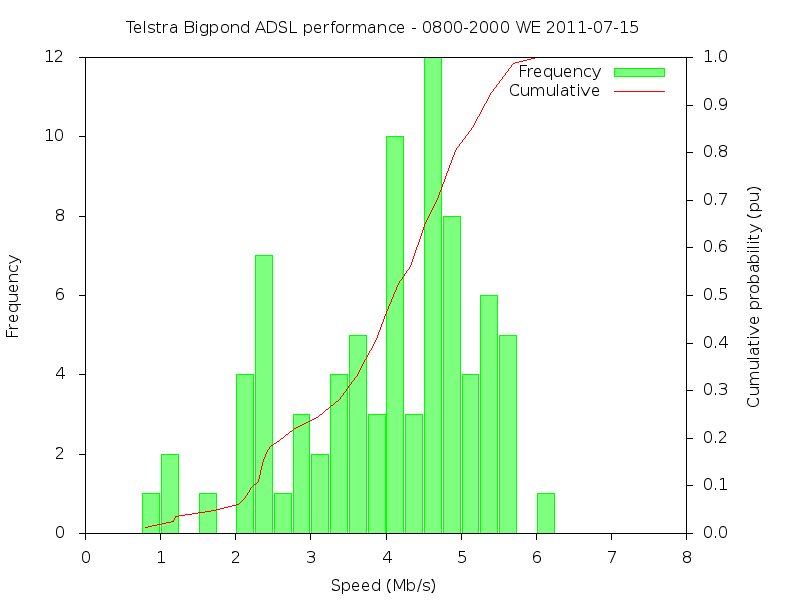 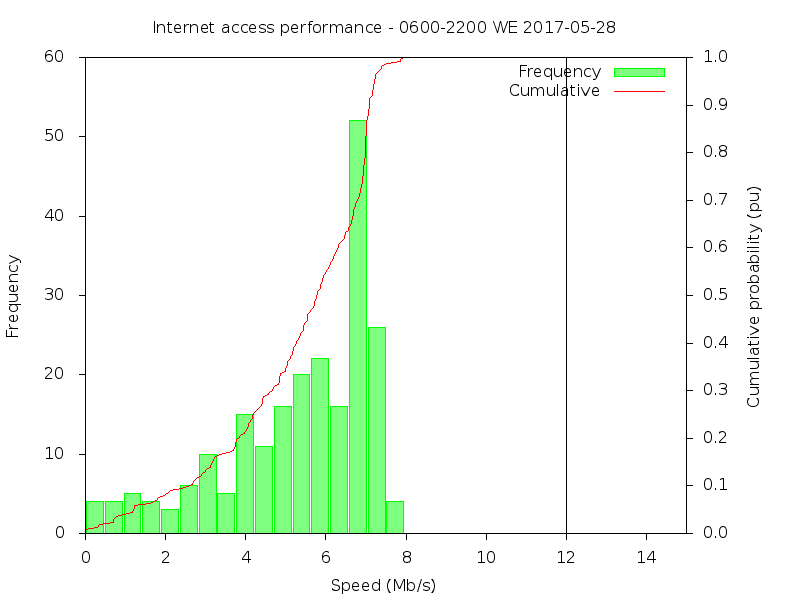 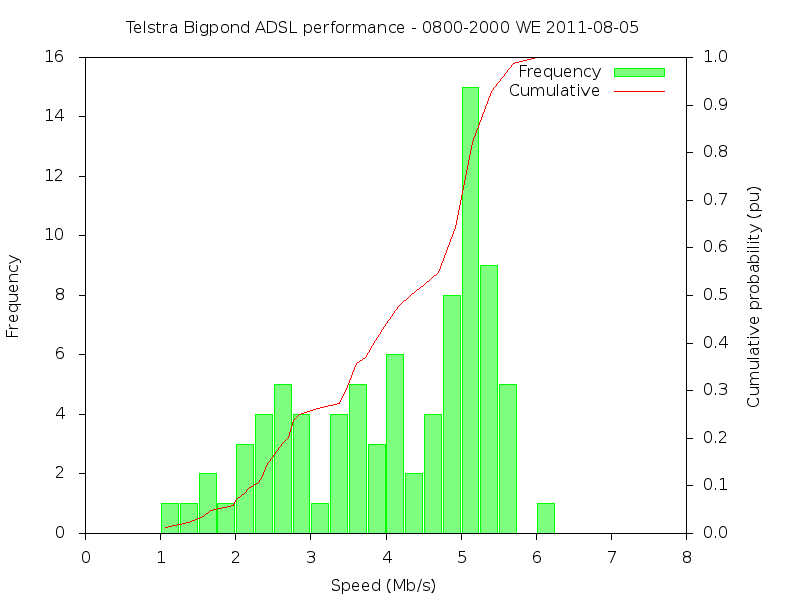 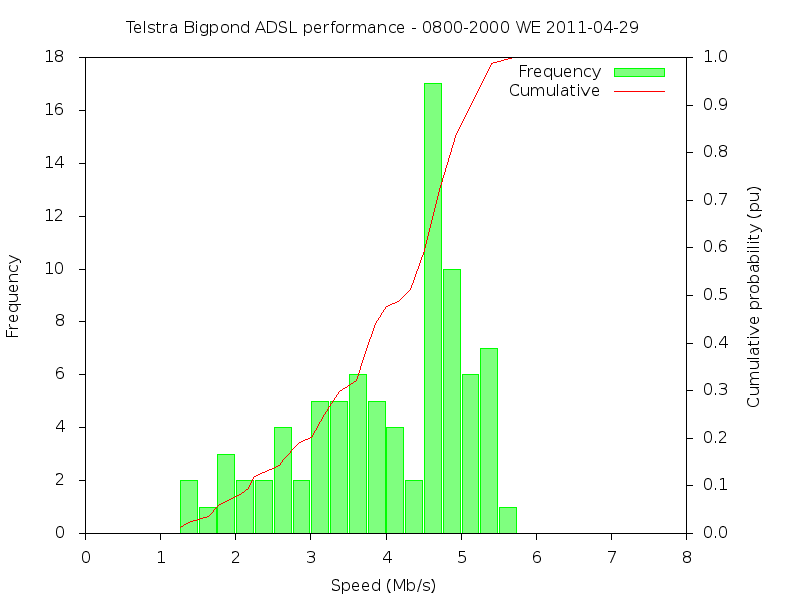 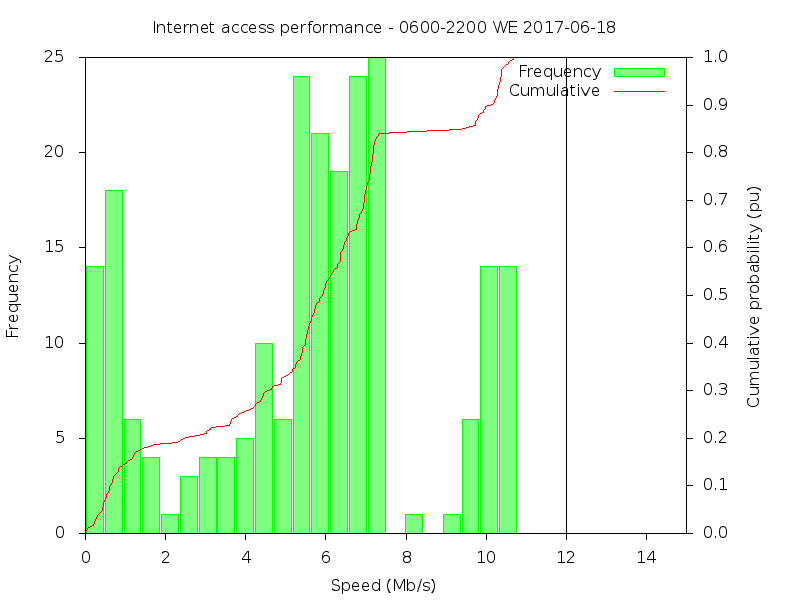 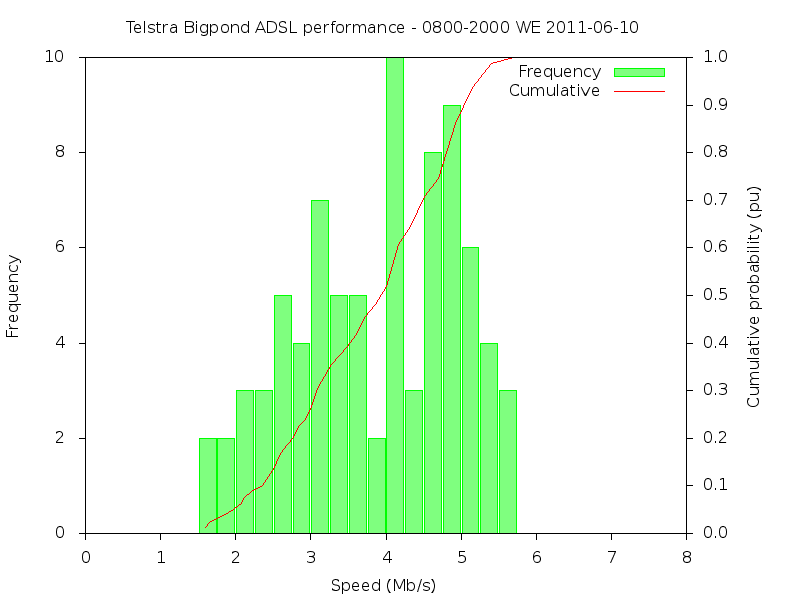 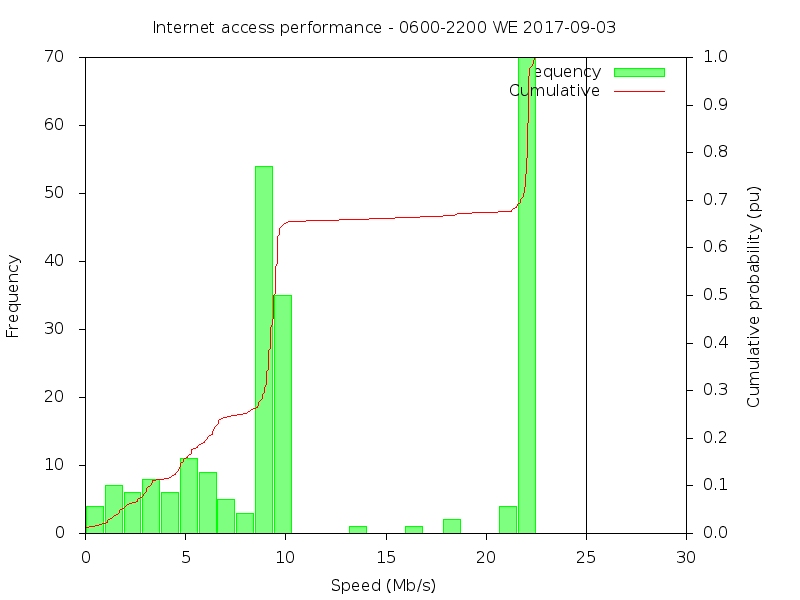 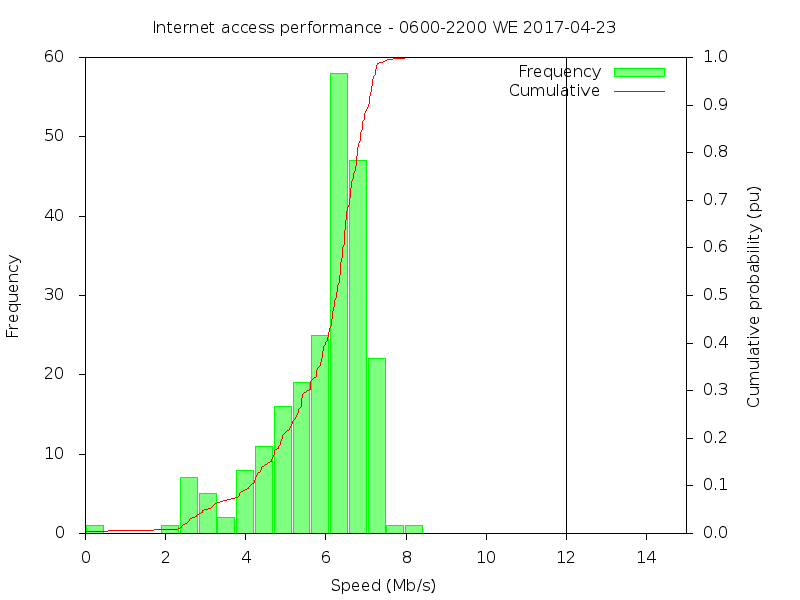 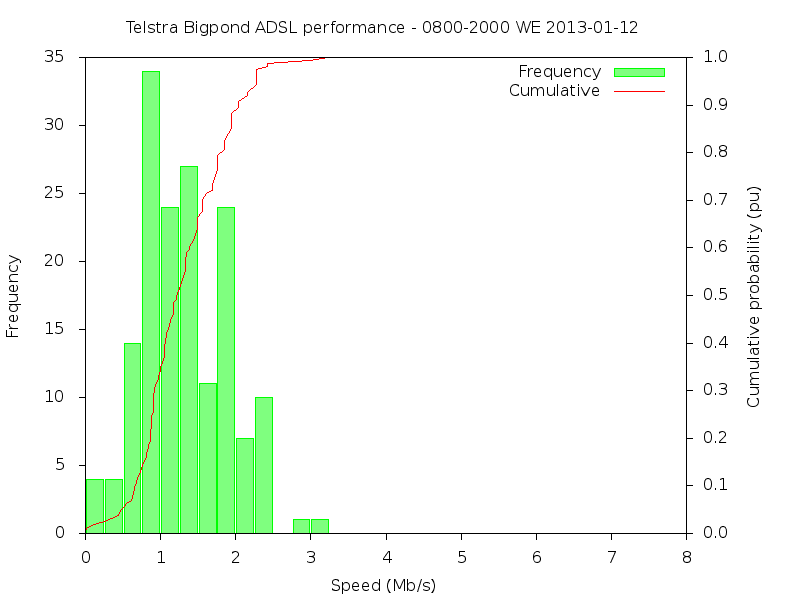 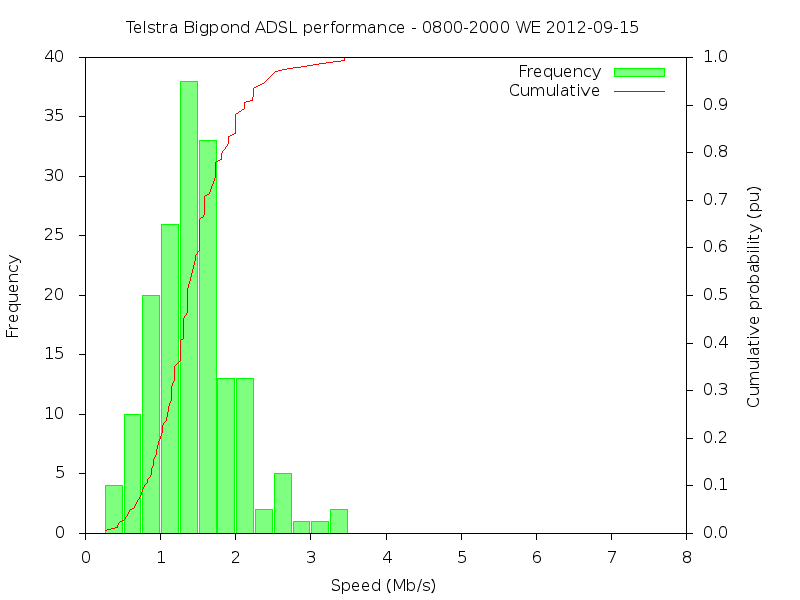 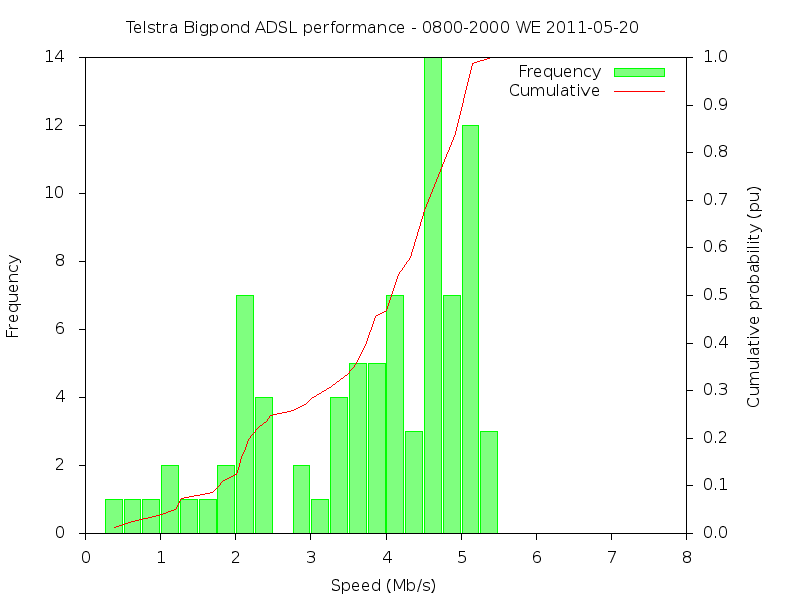 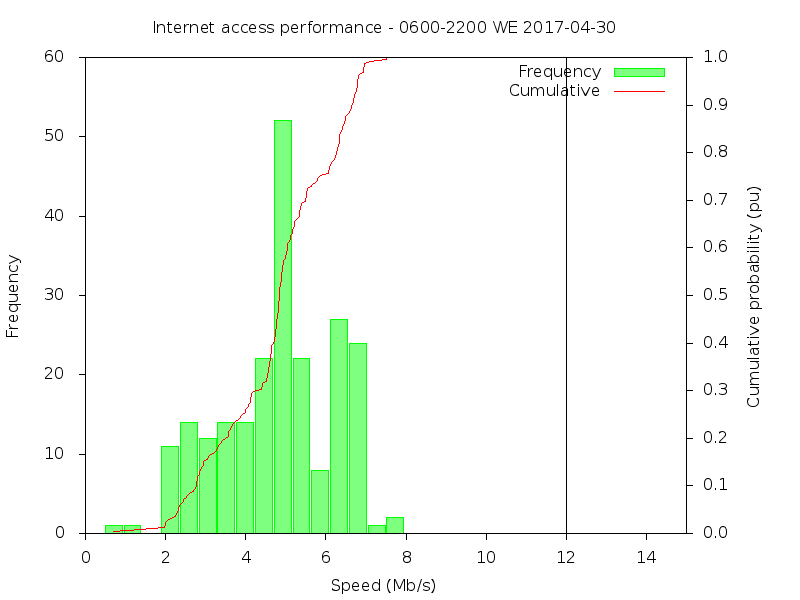 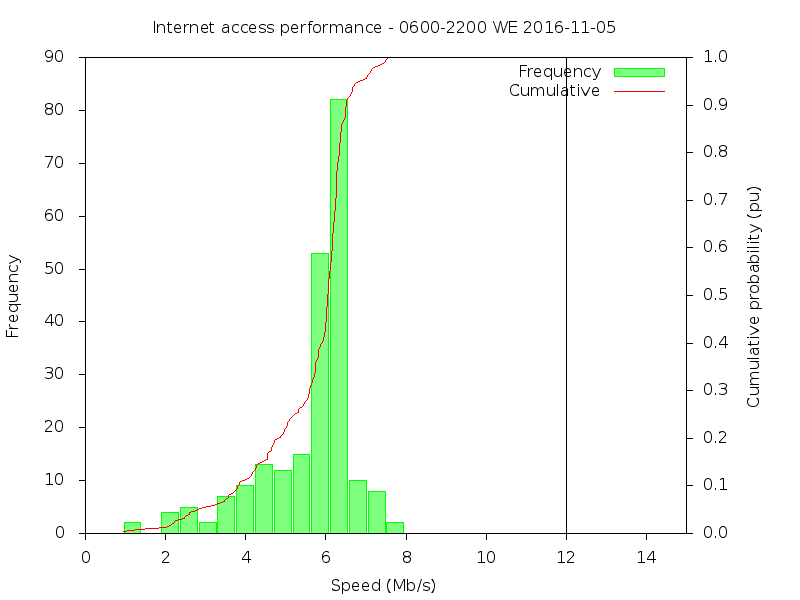 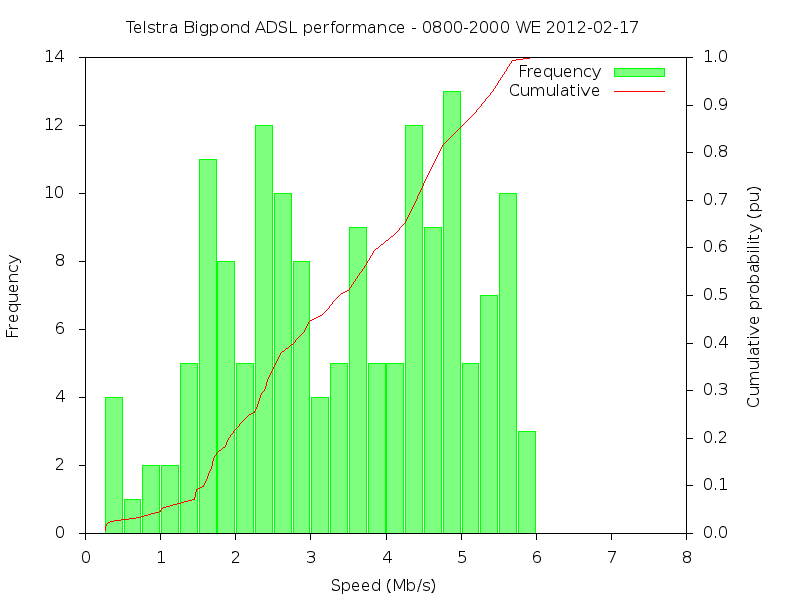 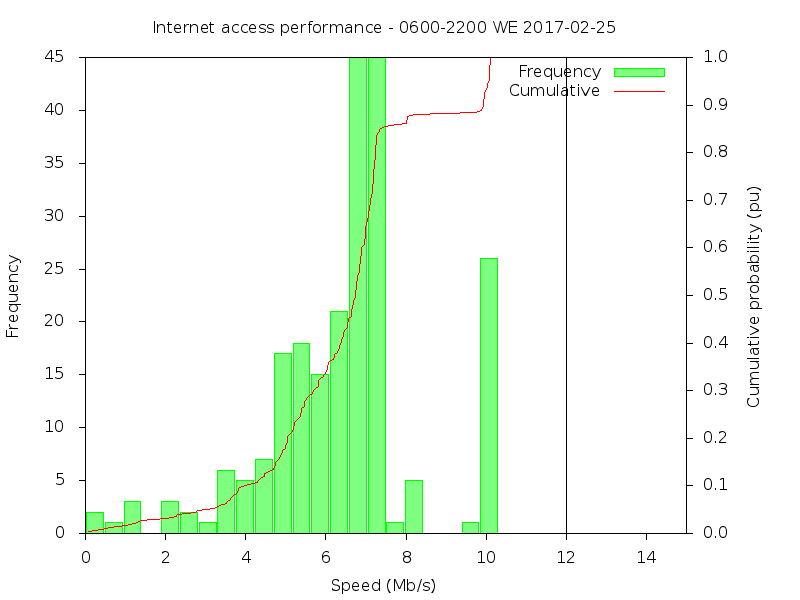 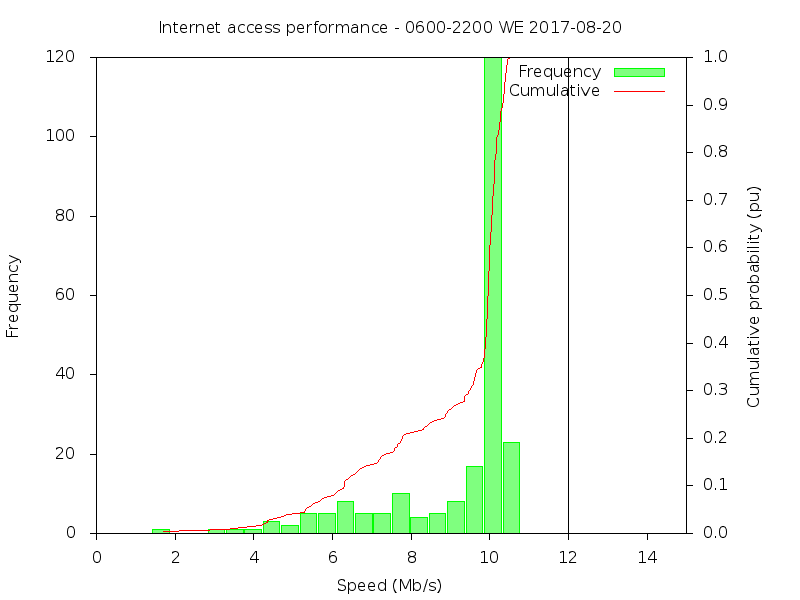 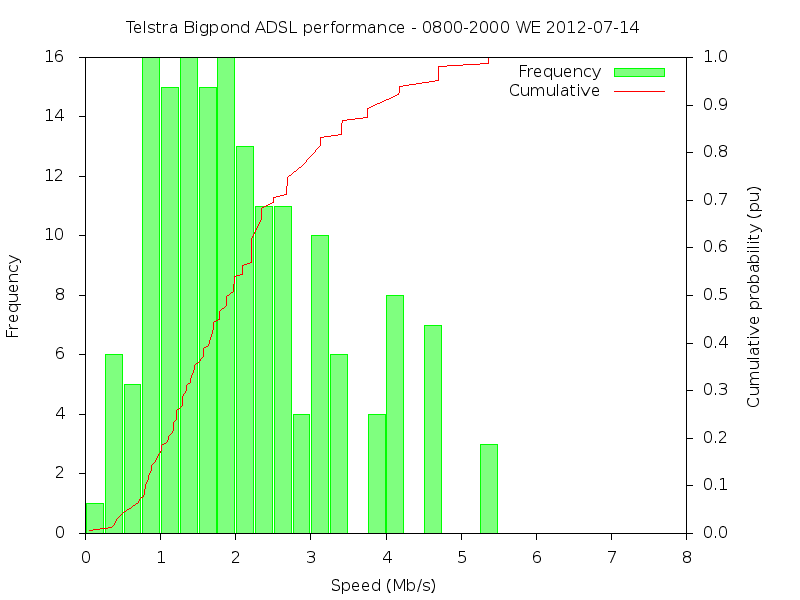 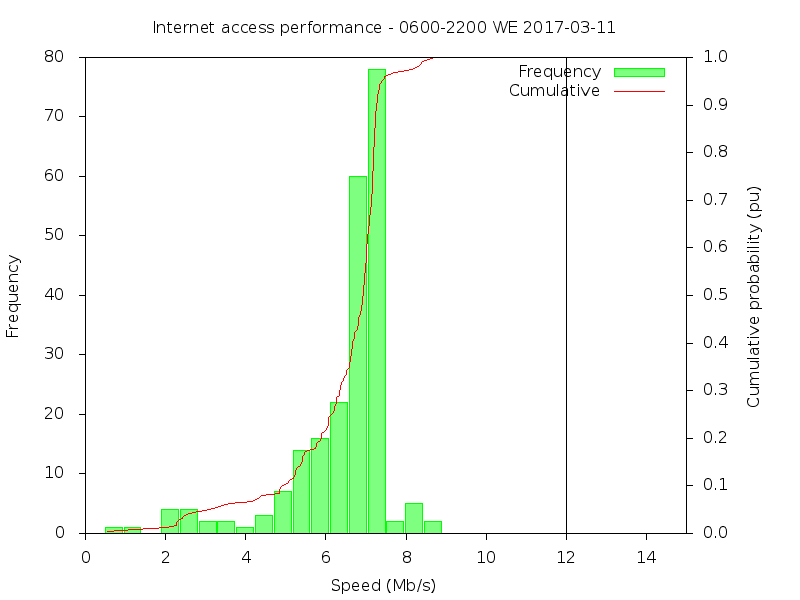 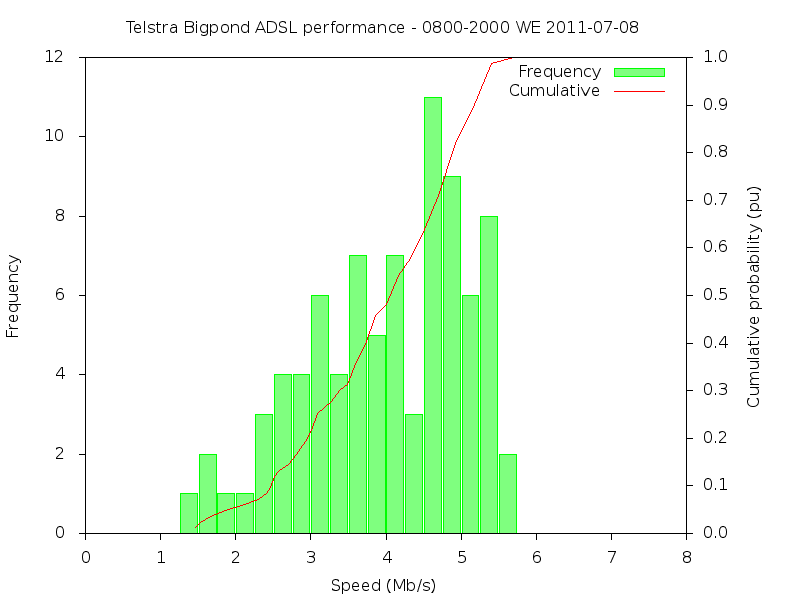 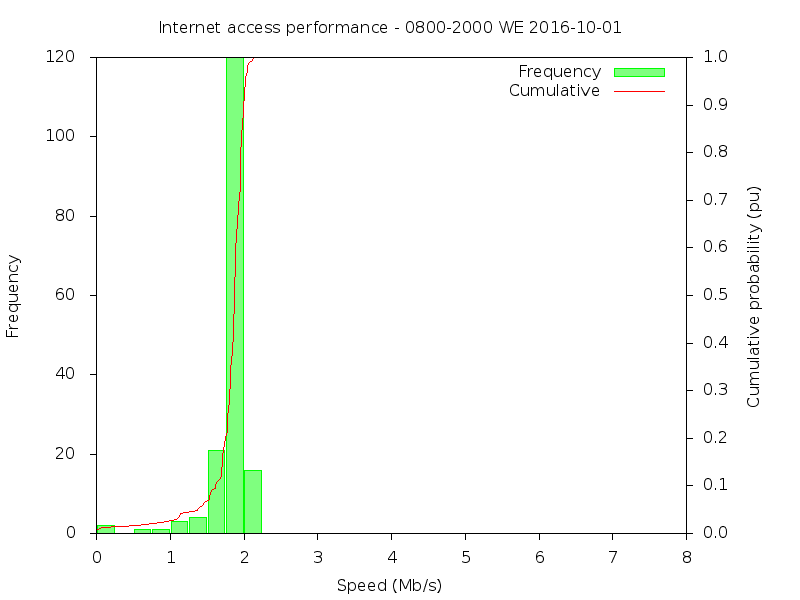 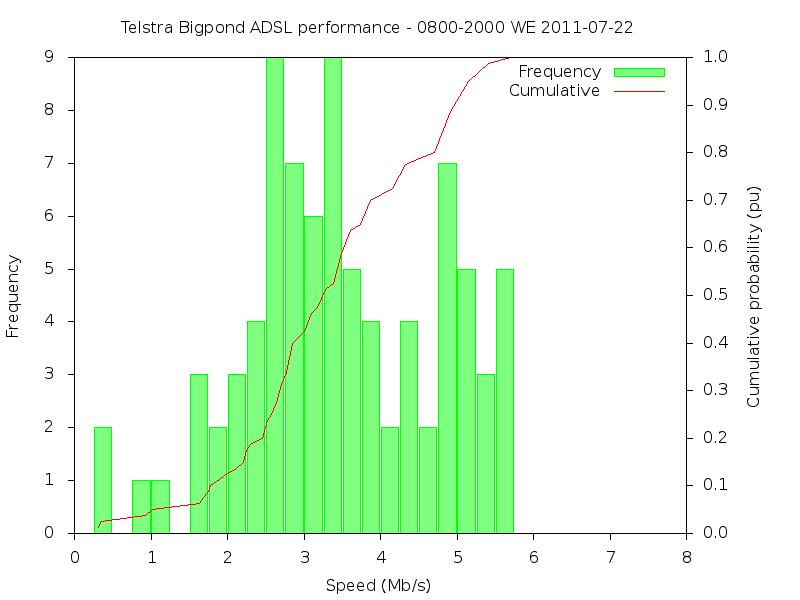 This article documents measured download speed of my Internet access service over some years. 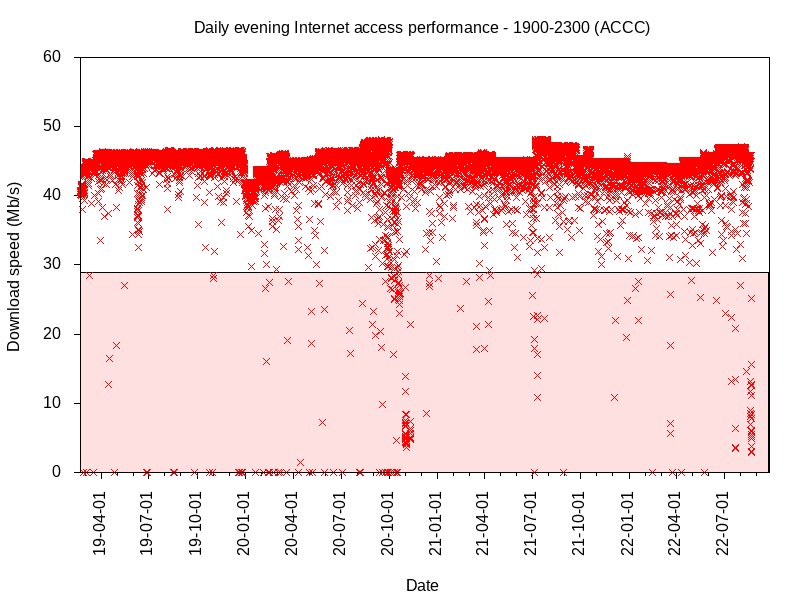 The reports are created automatically and this article updated daily. Speeds are expressed in Mb/s to mean a millions of bits per second to align with NBN who expresses speeds in millions of bit per second. 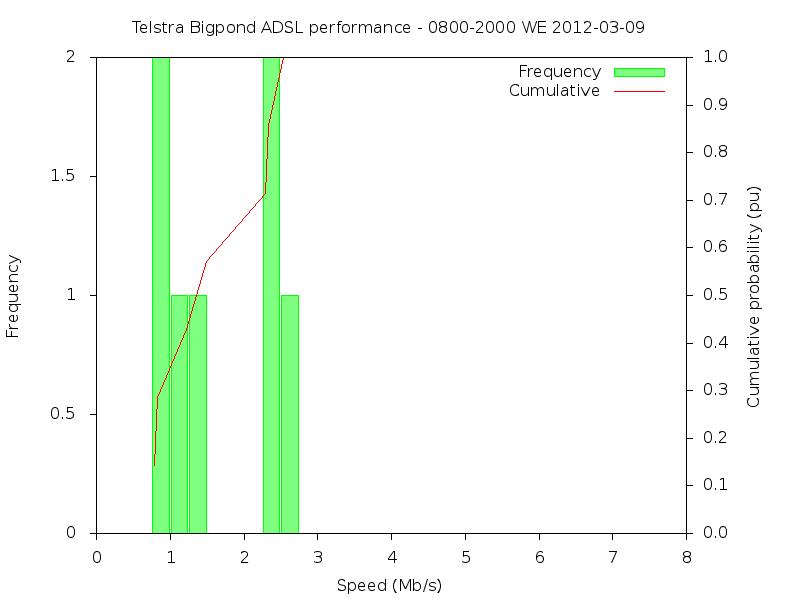 Download speeds are asured in Mb/s, and datums are adjusted for typical IP/TCP protocol overhead. 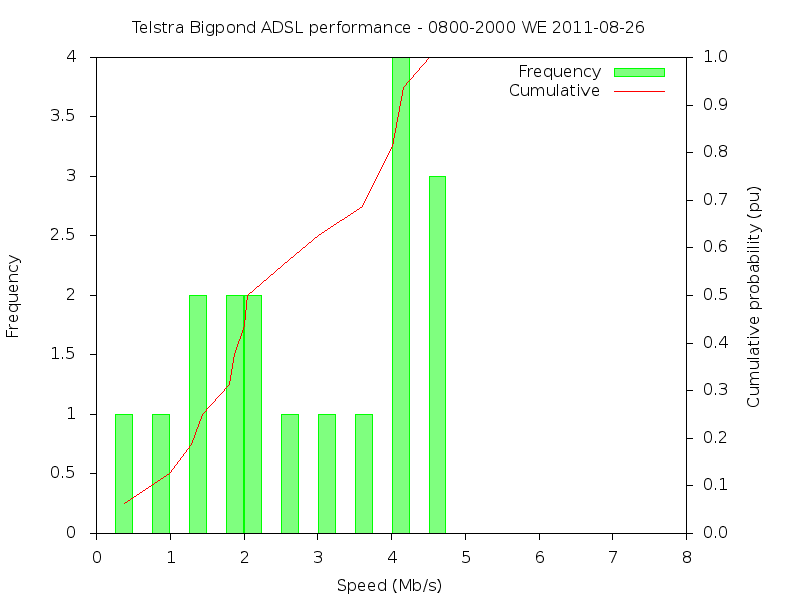 For example, an NBN 50Mb/s service has a maximum theoretical HTTP download speed of 50*1440/1494=48.19Mb/s (6.02MB/s). 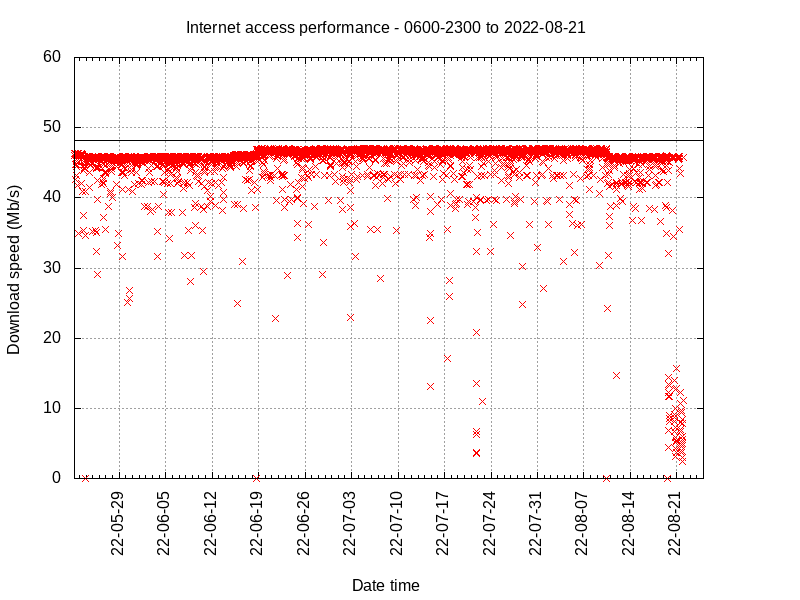 Many software packages and OS report file size in 'binary' KB or MB. Most speed measuring applications recommended by ISP/RSP report speed in millions of bits per second, including protocol overhead, and test the service in a way that is atypical and they usually achieve higher than proportionate bandwidth in a shared scenario. 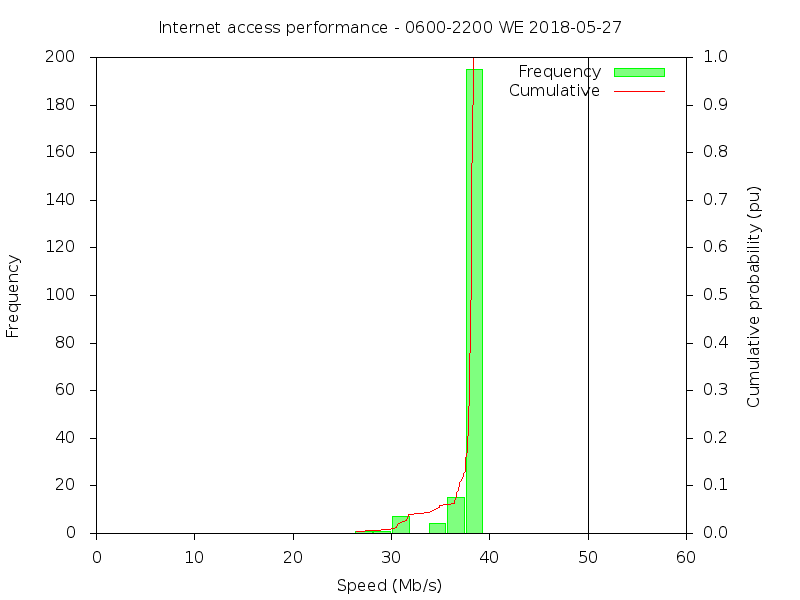 If you run an Ookla speed test while another larger download is running, the Ookla speed test is usually not half of the unshared speed measurement, but more like three quarters, and this effect can be expected to extend to congested links that are shared with other users. 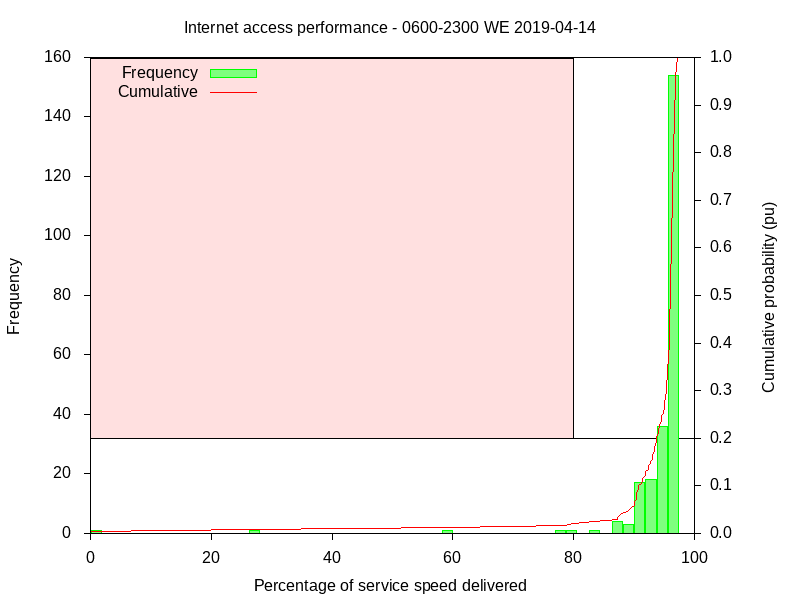 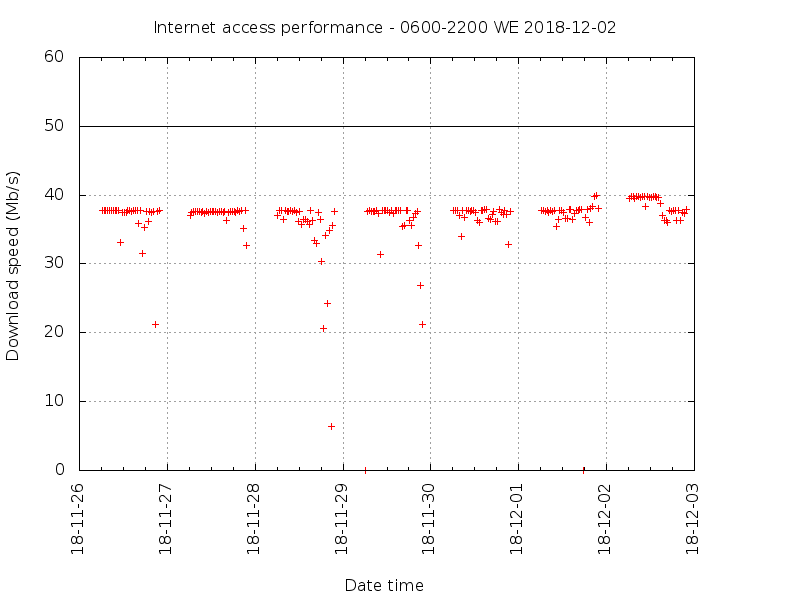 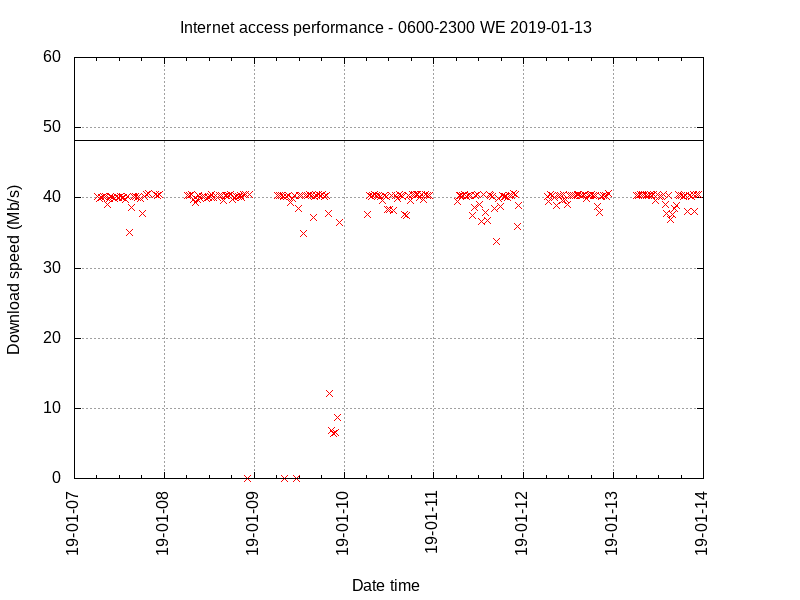 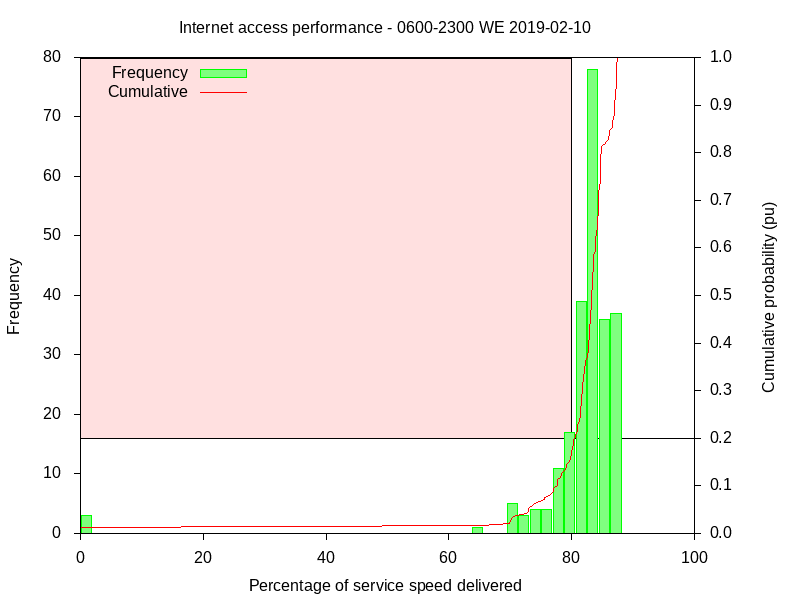 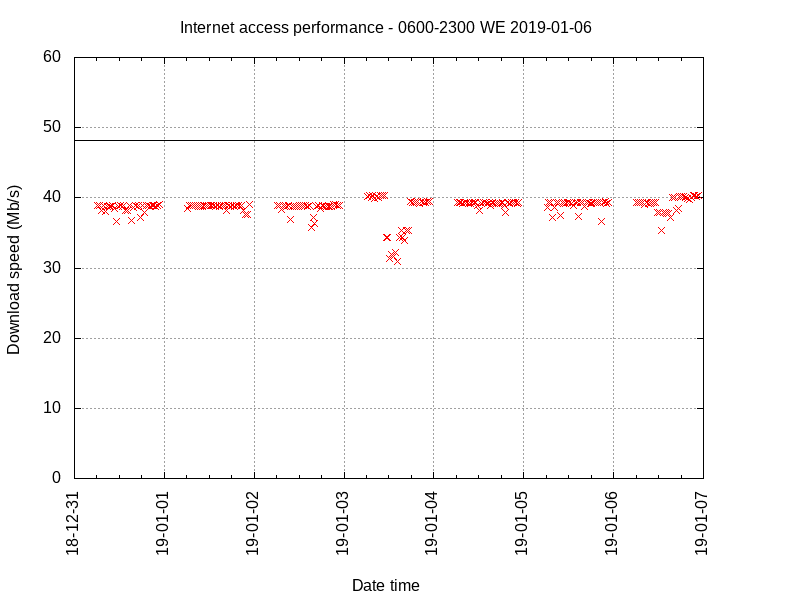 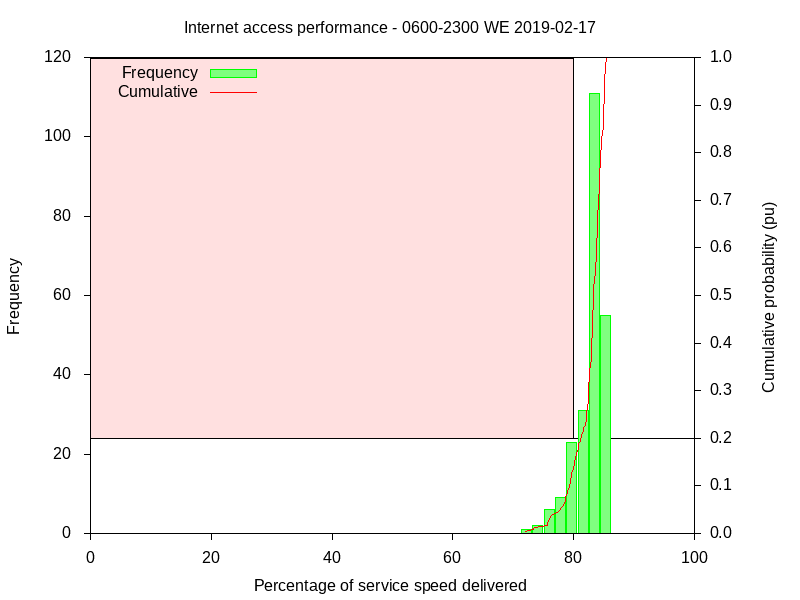 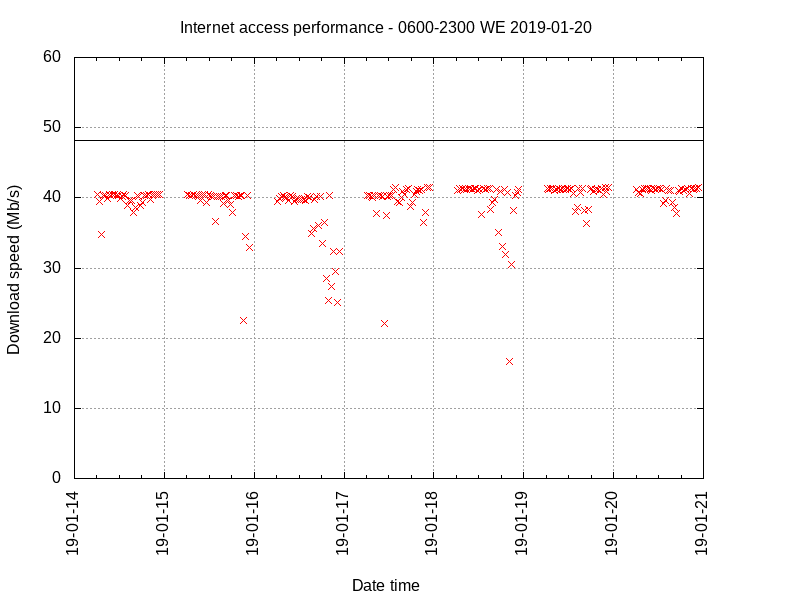 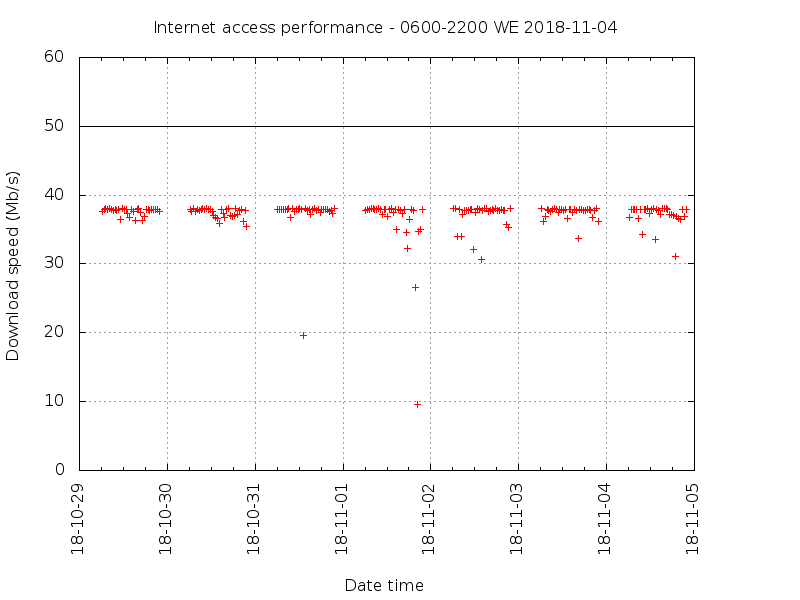 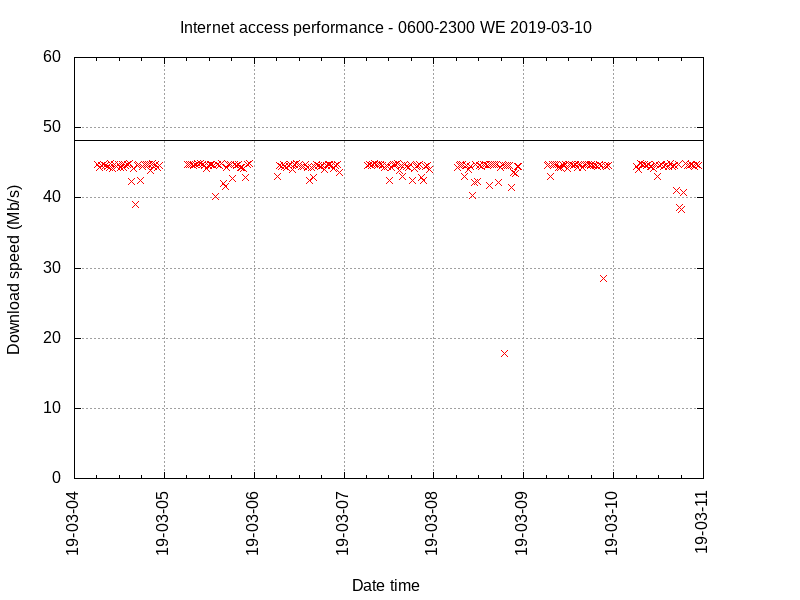 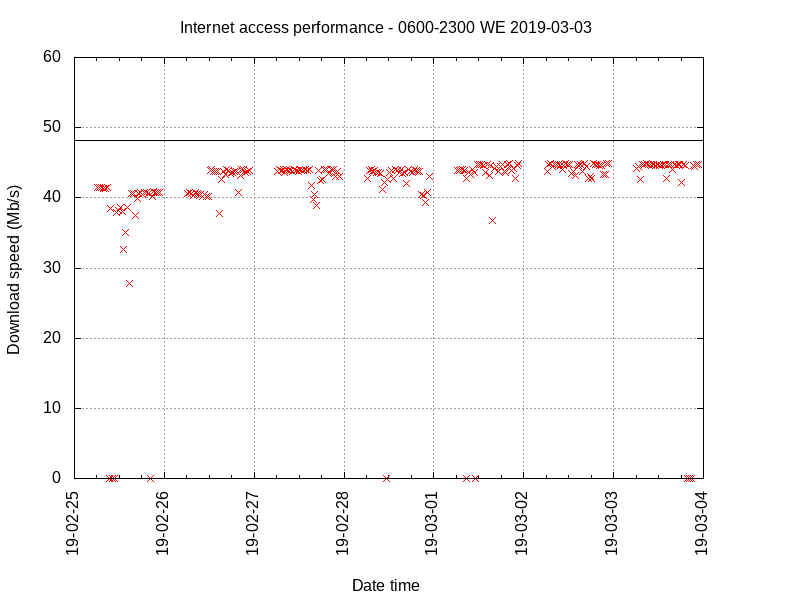 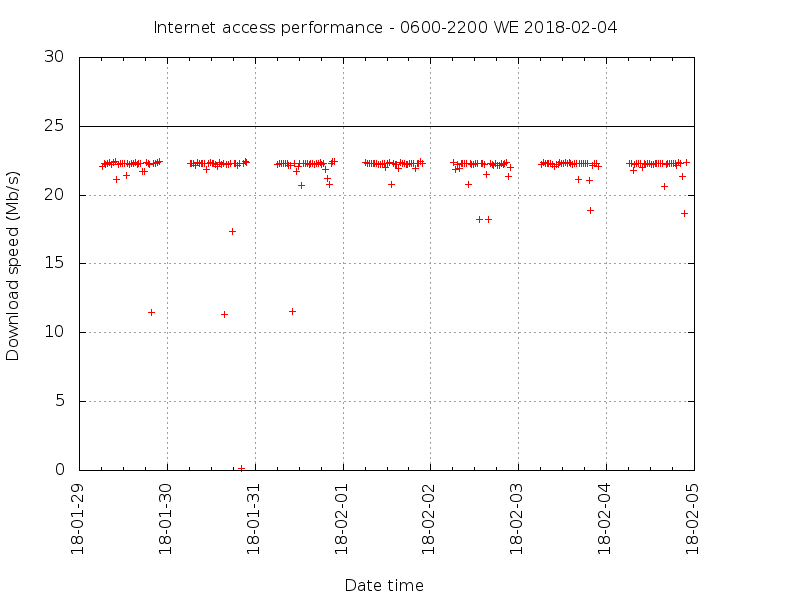 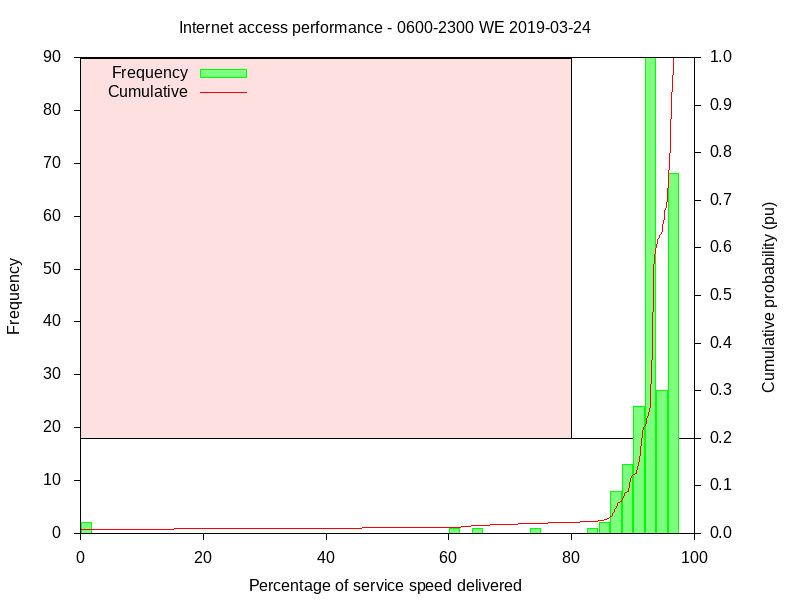 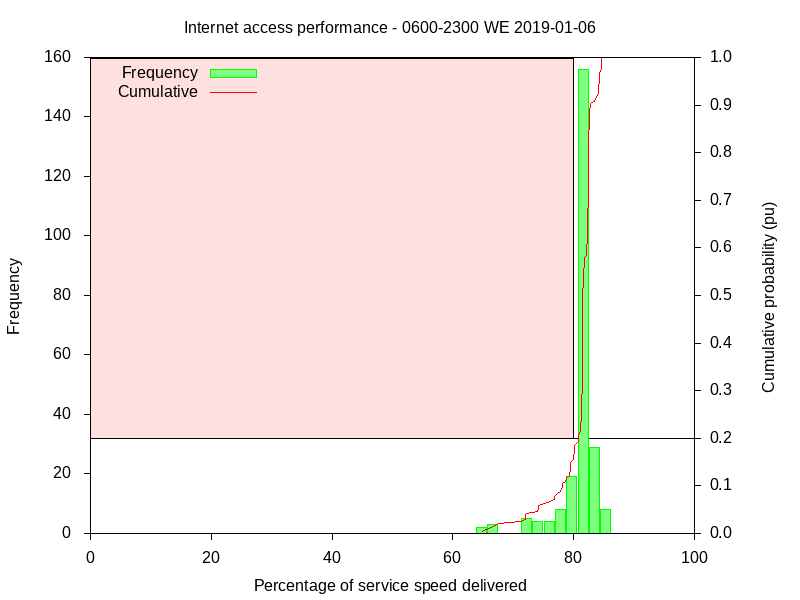 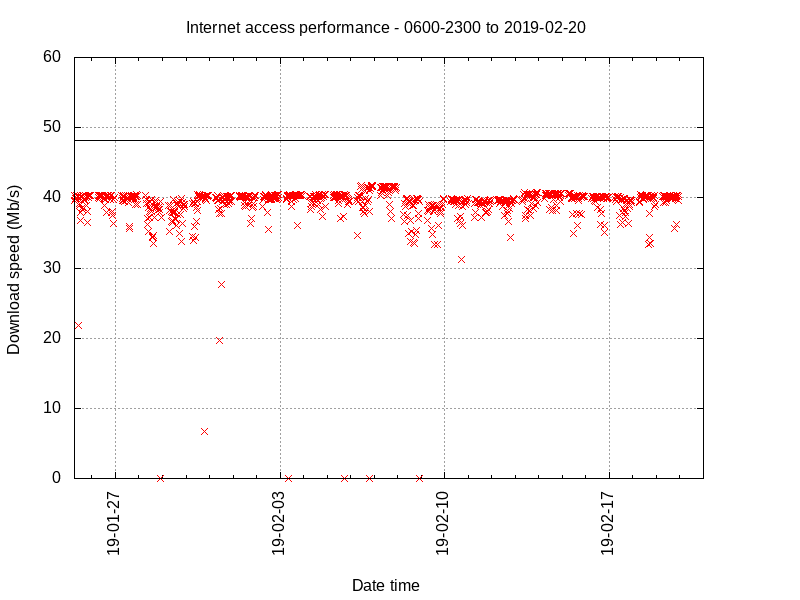 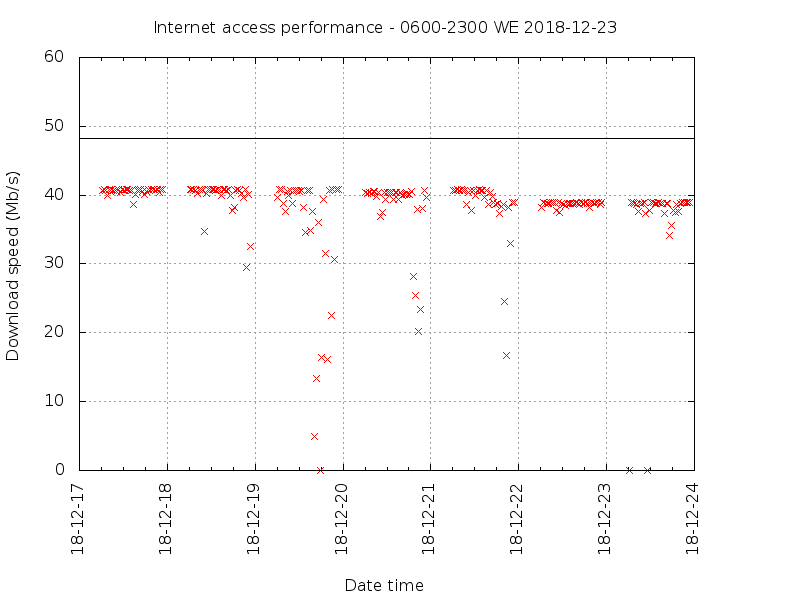 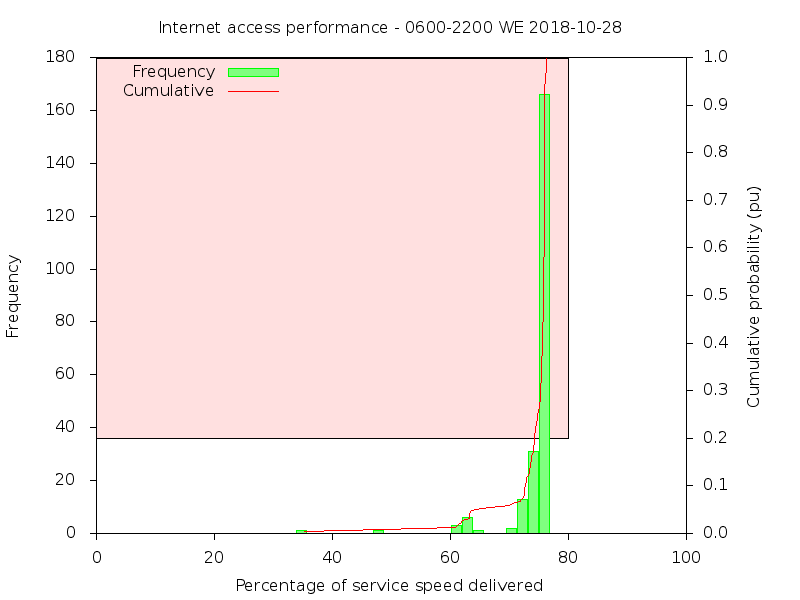 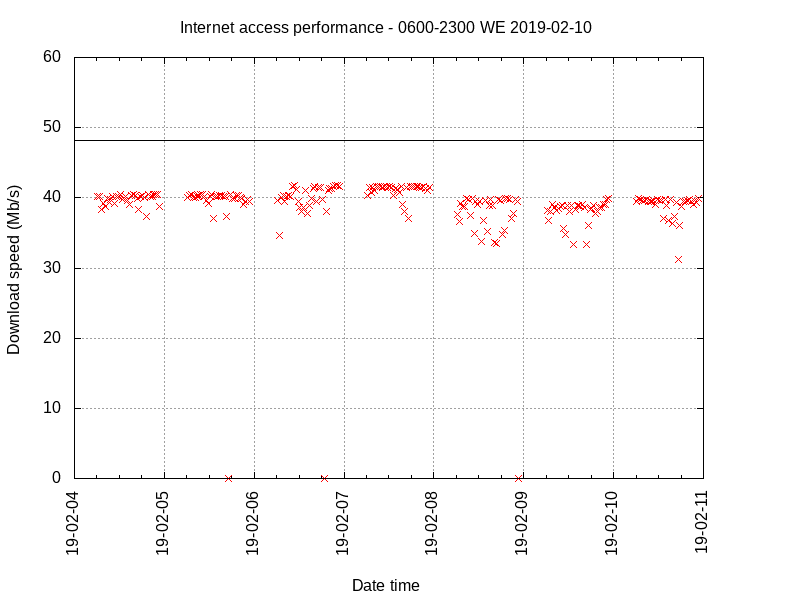 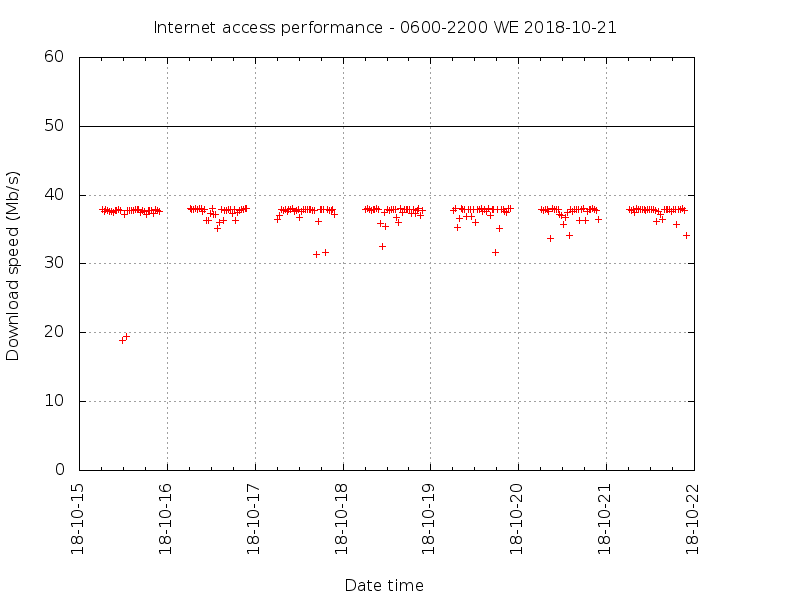 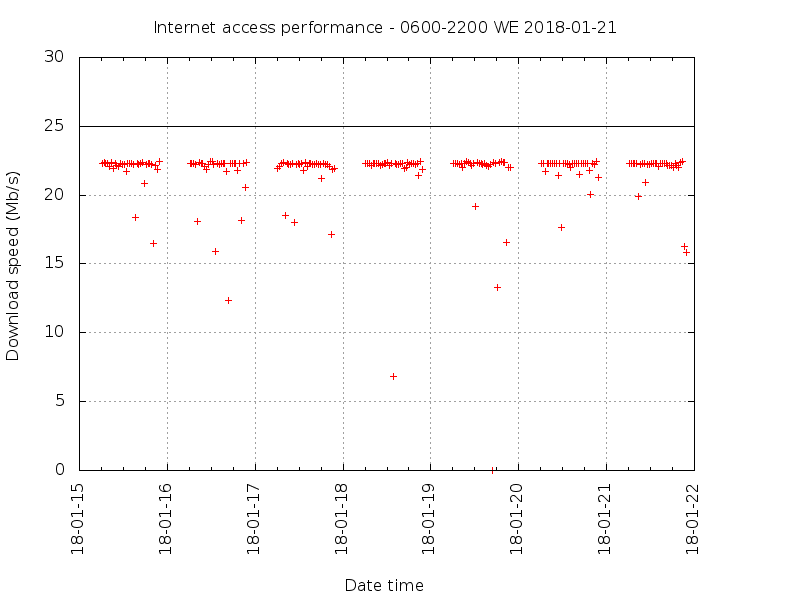 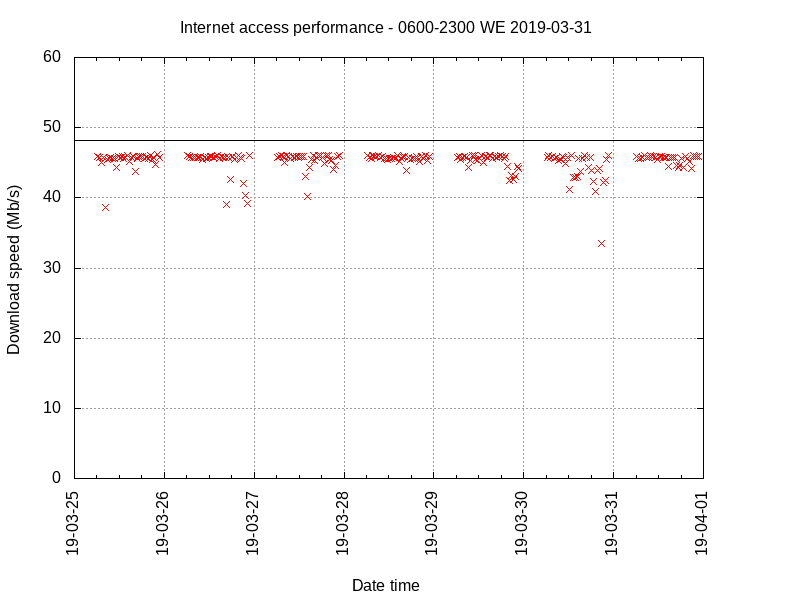 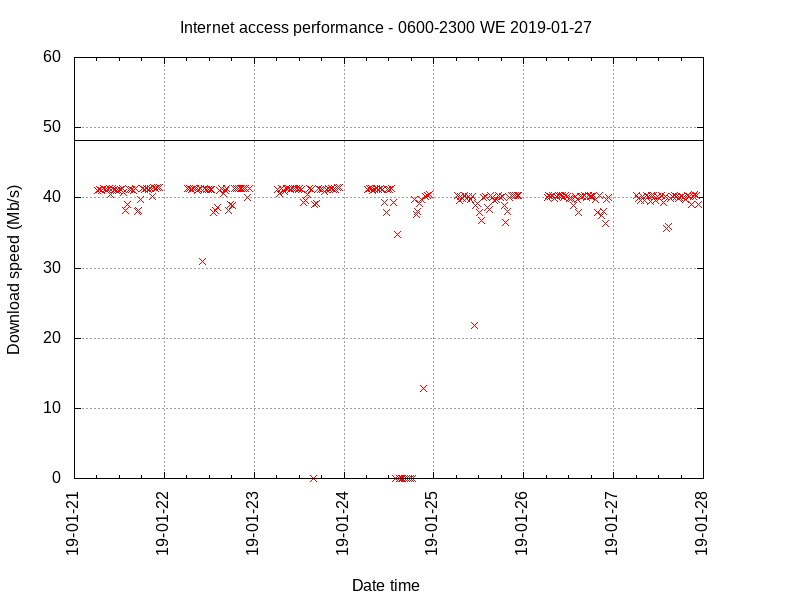 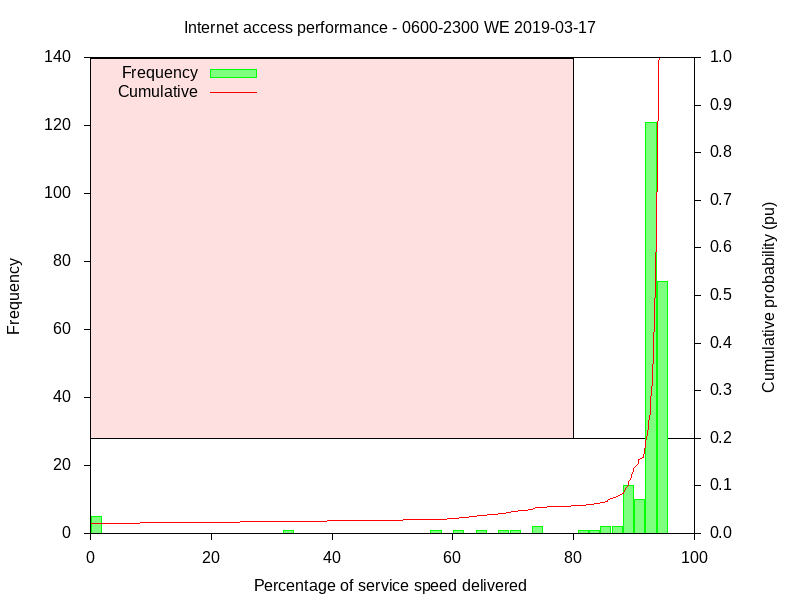 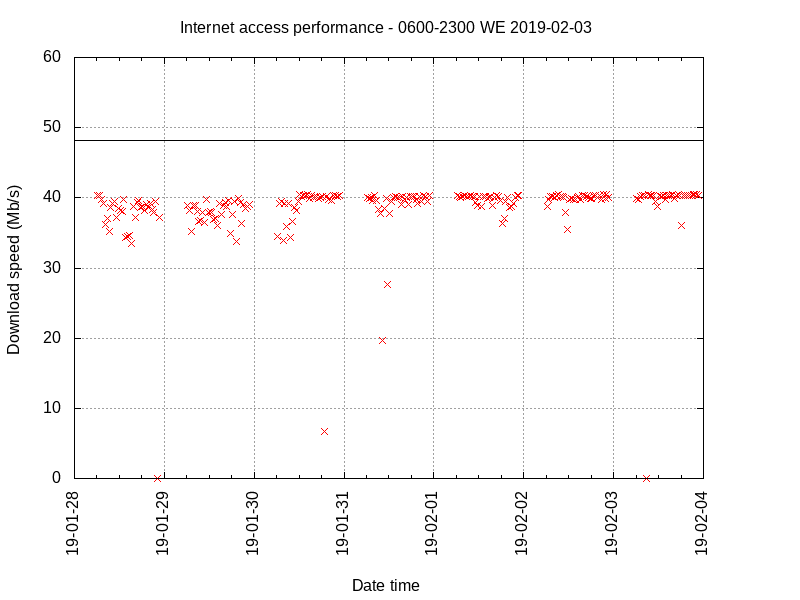 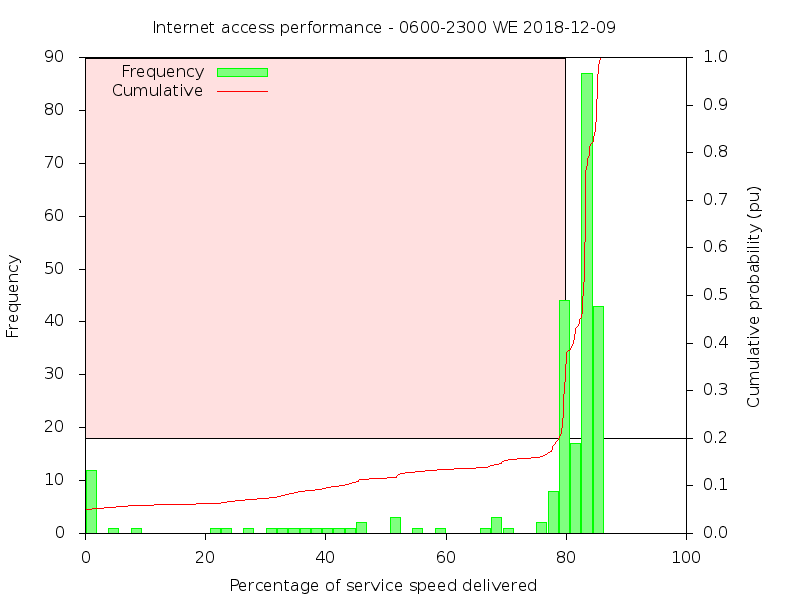 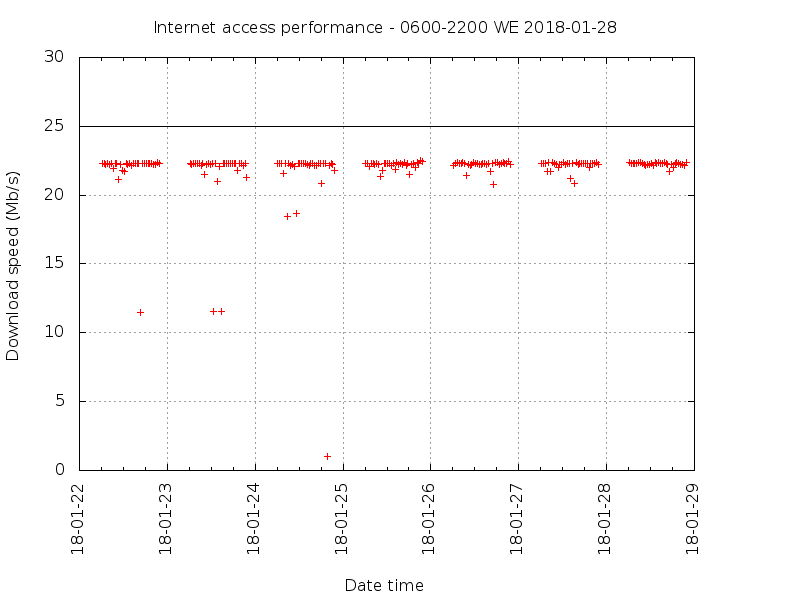 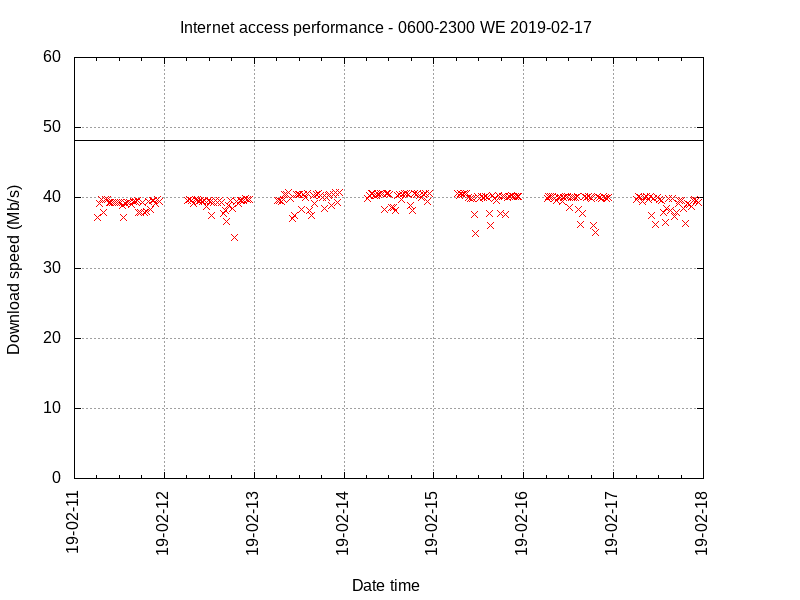 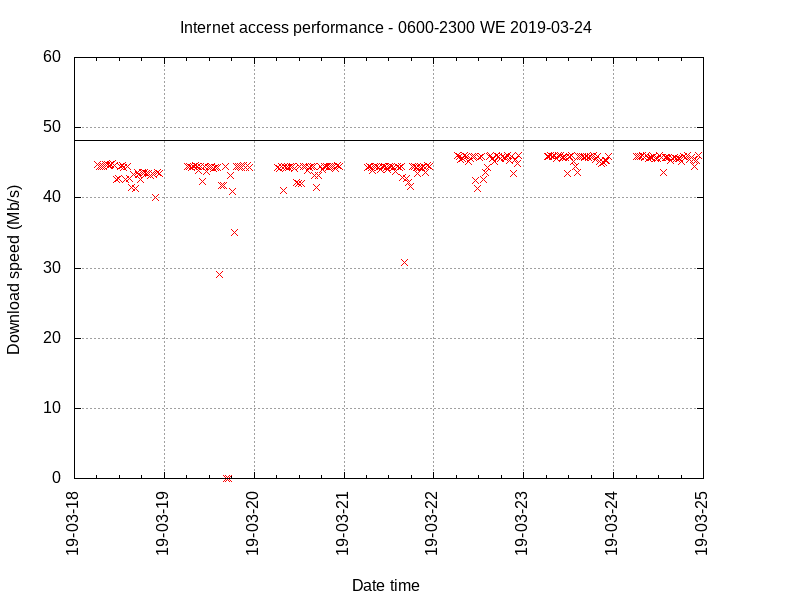 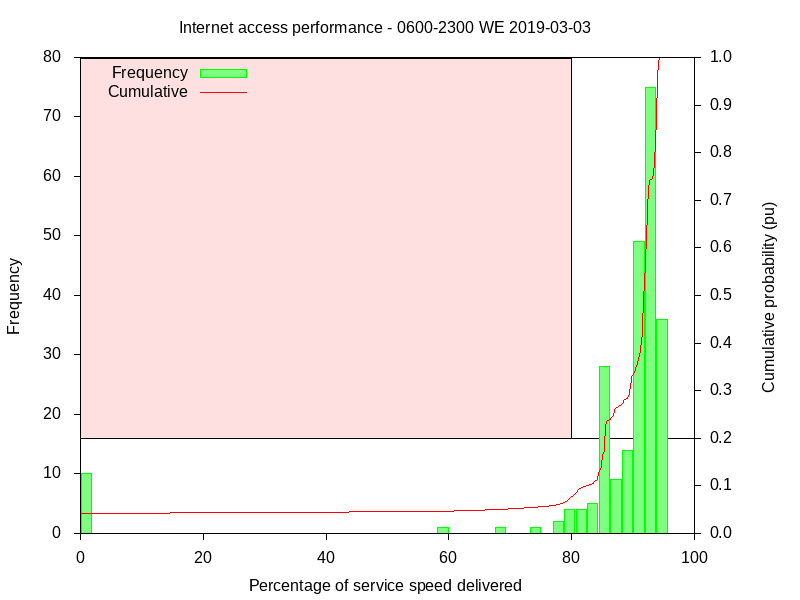 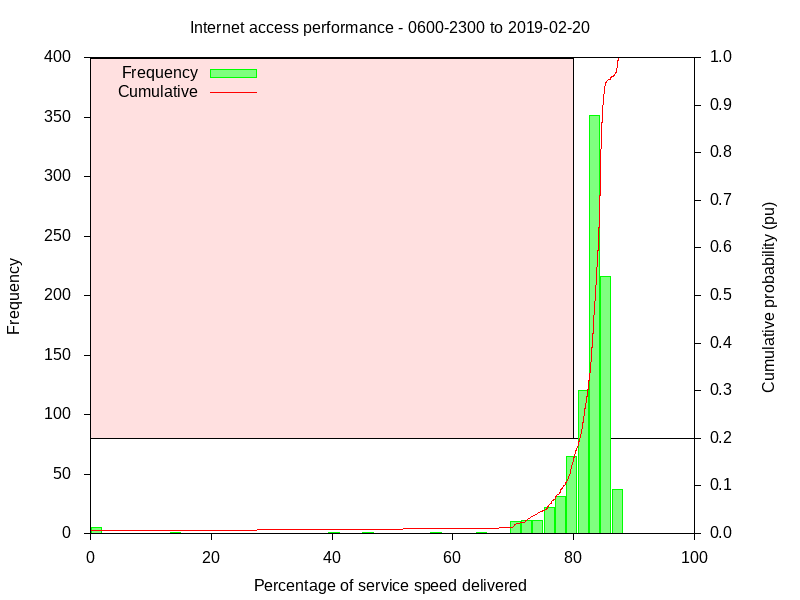 From 20/02/2019, the service was a basic unlimited download 50,000,000b/s NBN hosted FTTN/VDSL2 service from Kogan. From 24/01/2019, the service was a basic unlimited download 50,000,000b/s NBN hosted FTTN/VDSL2 service from Sumo. From 07/12/2018, the service was a basic unlimited download 50,000,000b/s NBN hosted FTTN/VDSL2 service from Exetel. 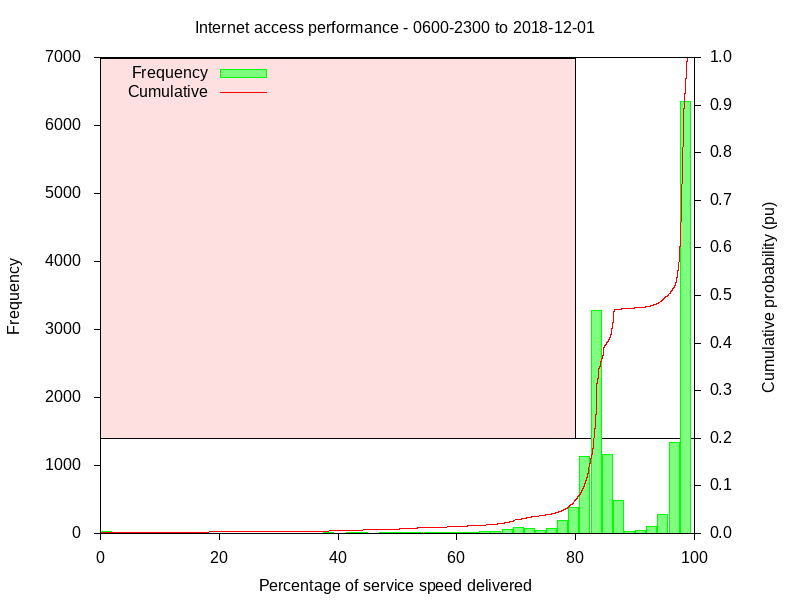 From 02/12/2018 to 06/12/2018, the service was a basic unlimited download 50,000,000b/s NBN hosted FTTN/VDSL2 service from Southern Phone / AAPT. This service was not selected, Amaysim transferred its customers to Southern Phone and functional problems were identified but not addressed by Southern Phone so the service was churned. From 01/09/2017 to 01/12/2018, the service was a basic unlimited download 25,000,000b/s NBN hosted FTTN/VDSL2 service from Amaysim / AAPT. The copper length would be about 980m modem to modem, which NBN rate at 70,000,000b/s though most other sources suggest more like 40,000,000b/s and the modem reports just over 40,000,000b/s. 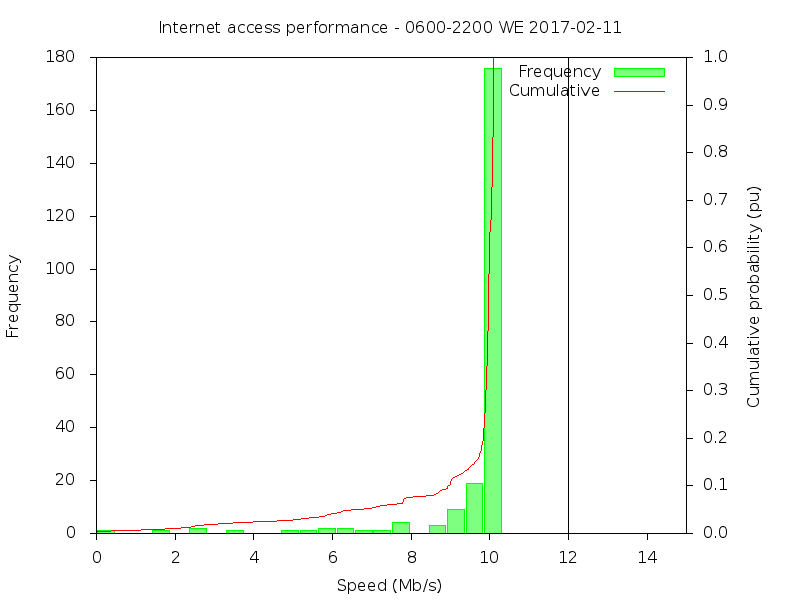 It was later upgraded to 50,000,000b/s. 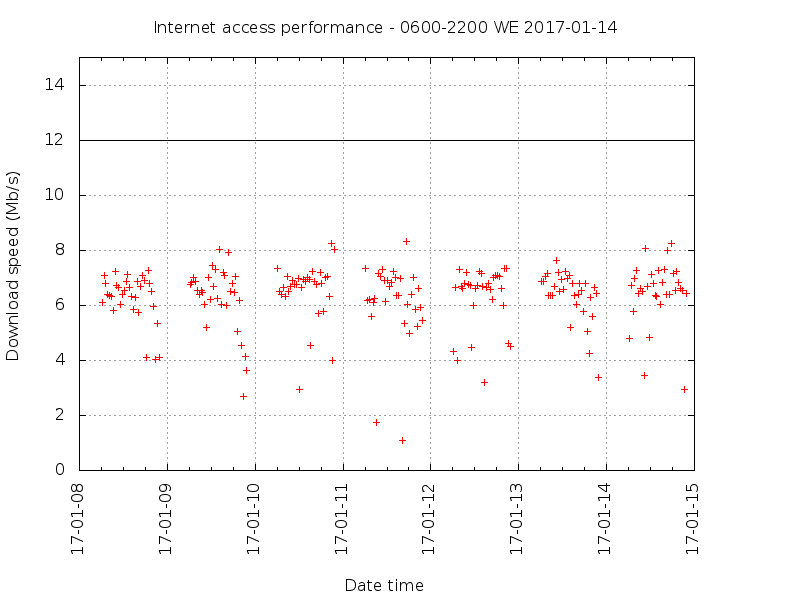 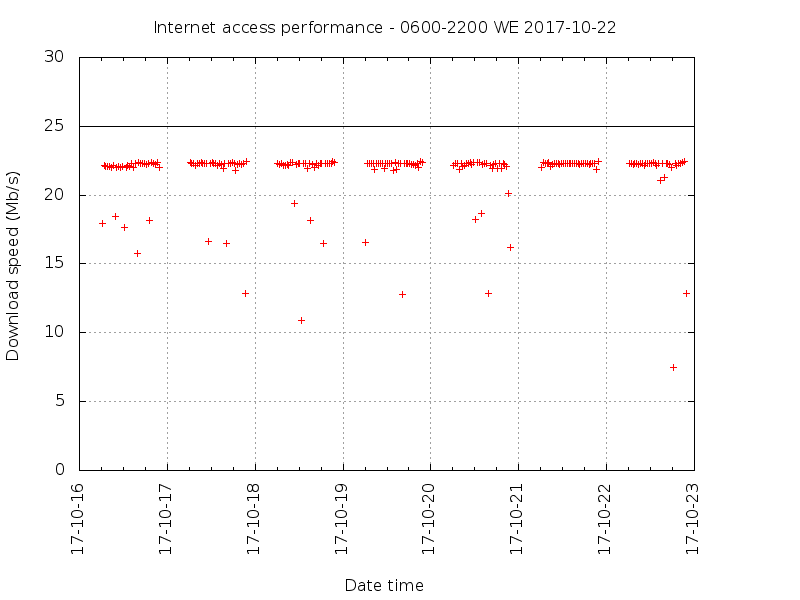 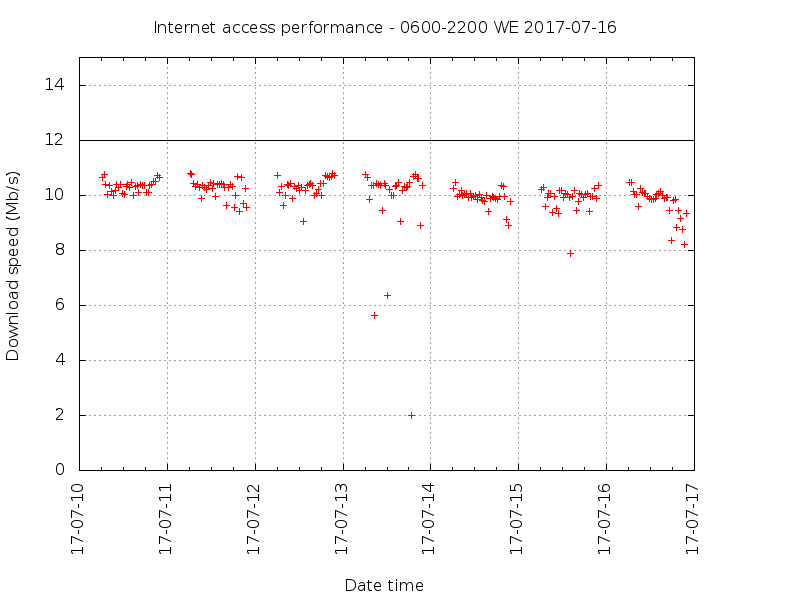 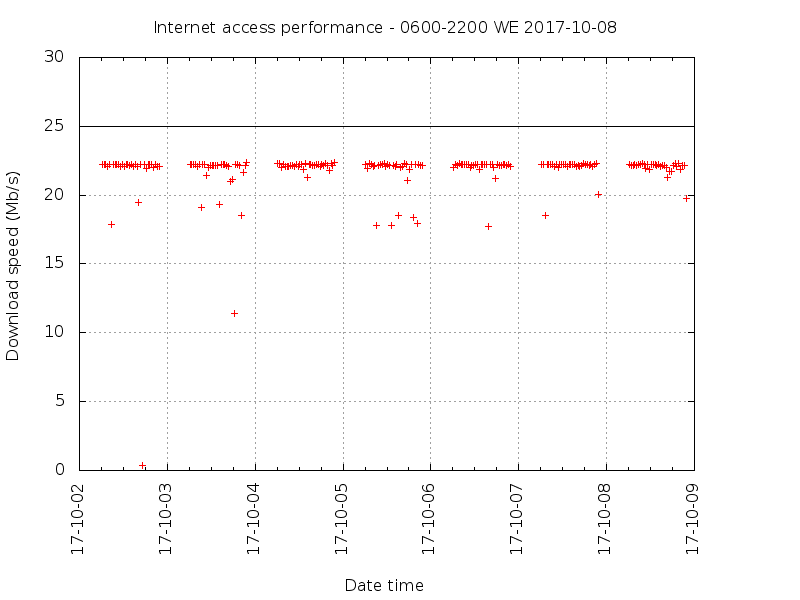 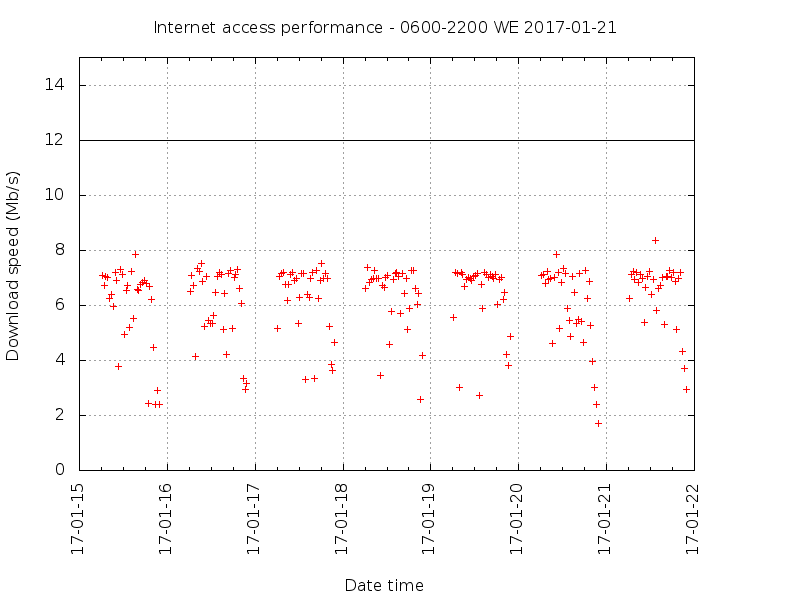 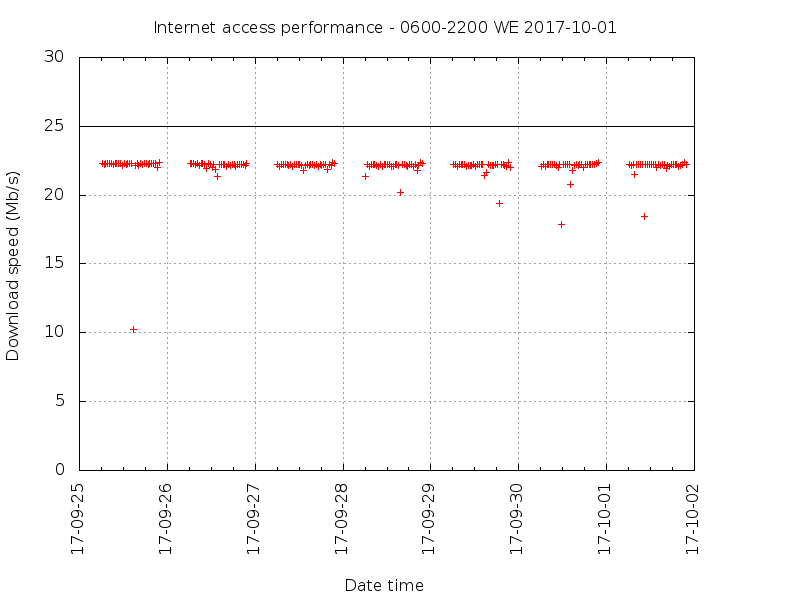 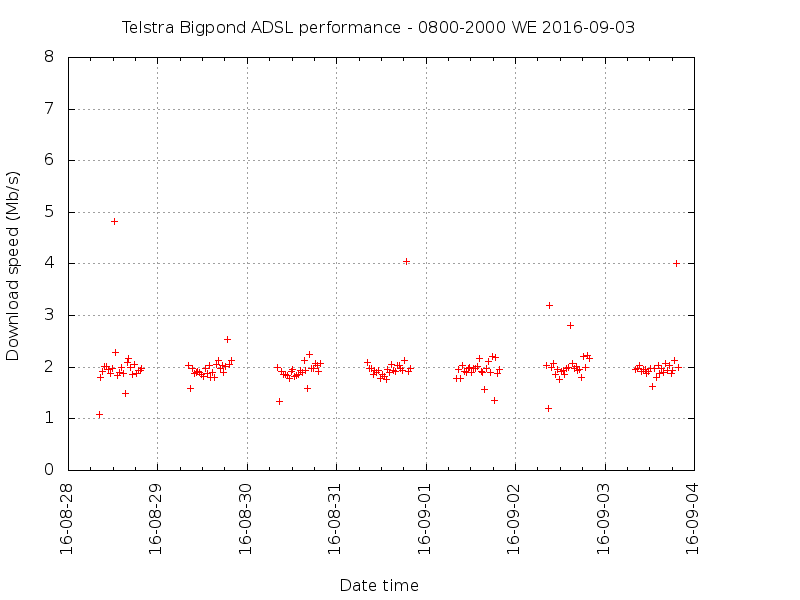 From 05/10/2016 to 01/09/2017, the service was a 12,000,000b/s NBN hosted FTTN/VDSL2 service from IINET. The copper length would be about 980m modem to modem, which NBN rate at 70,000,000b/s though most other sources suggest more like 40,000,000b/s and the modem reports 40,600,000b/s. 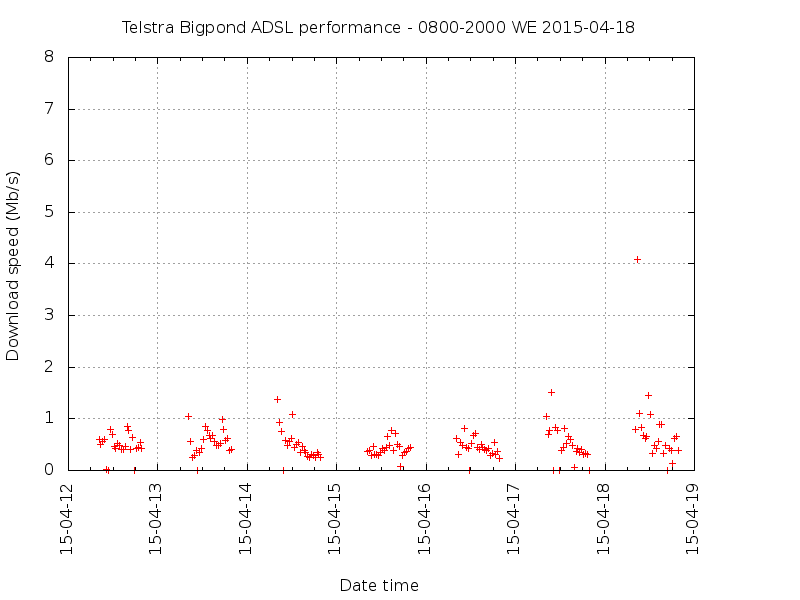 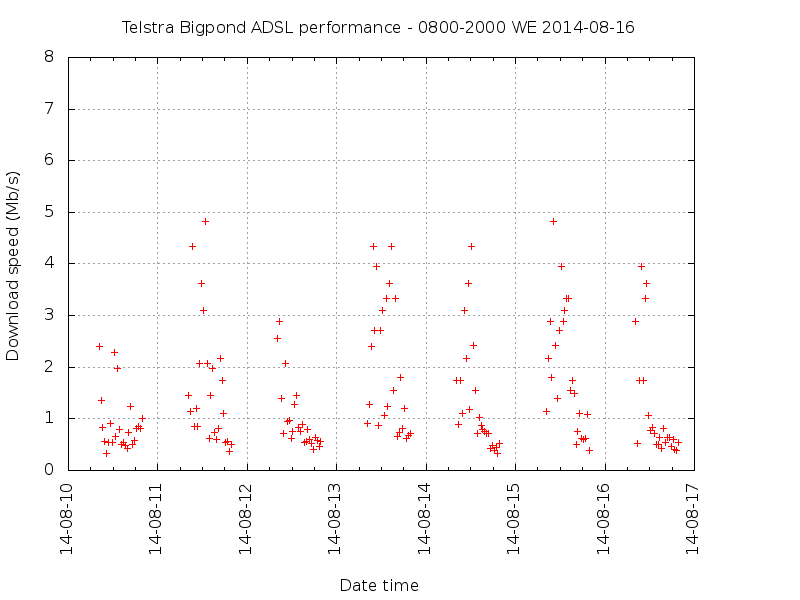 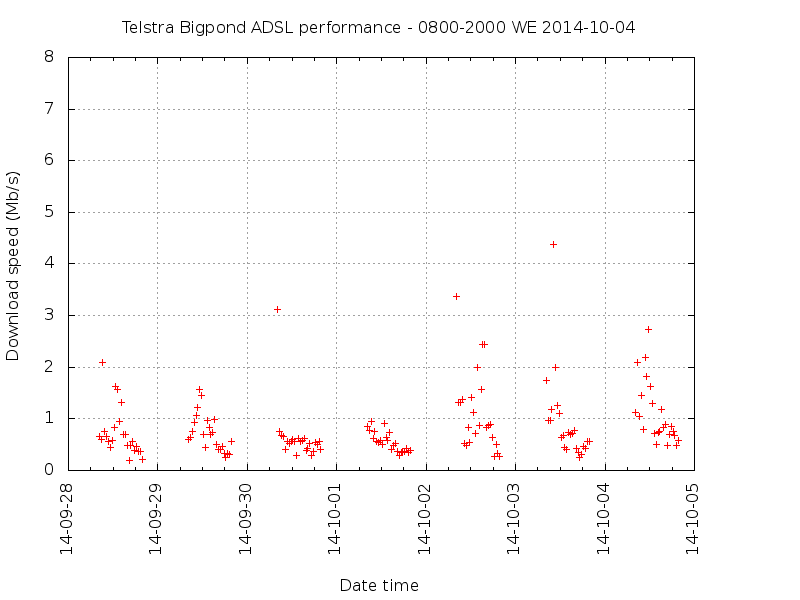 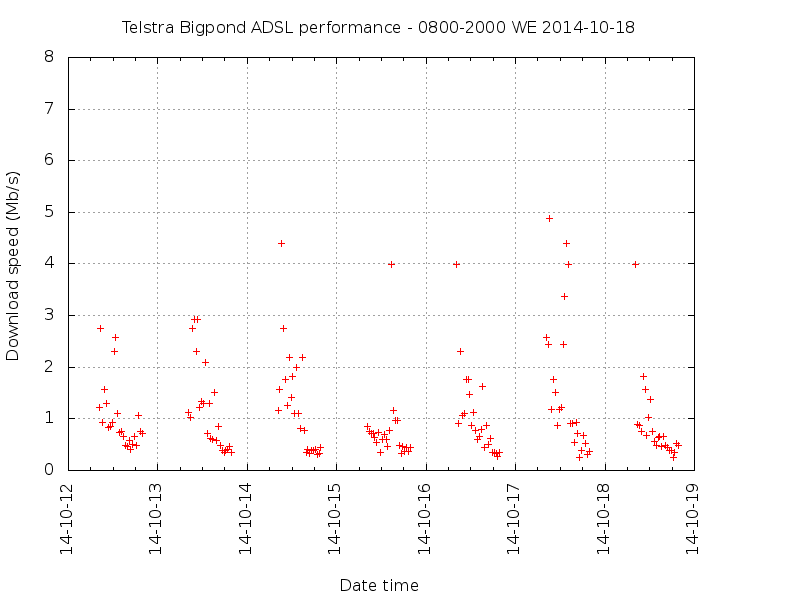 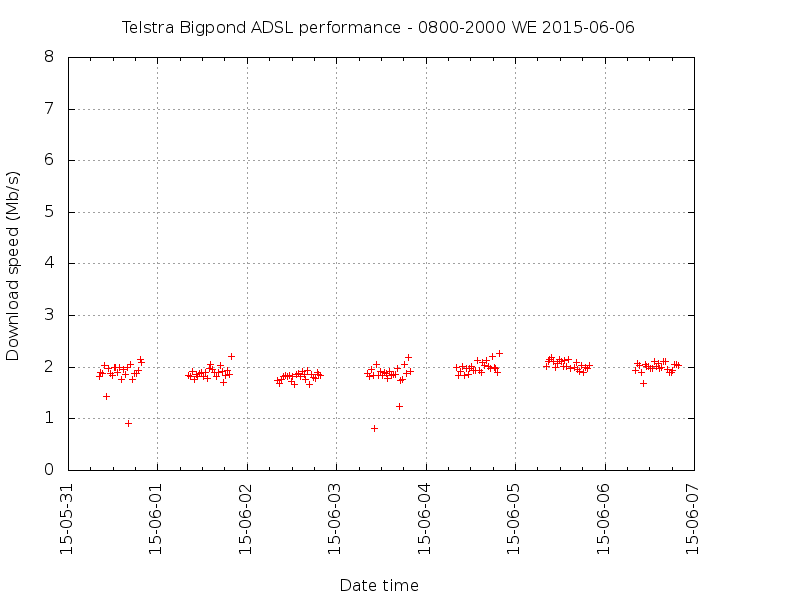 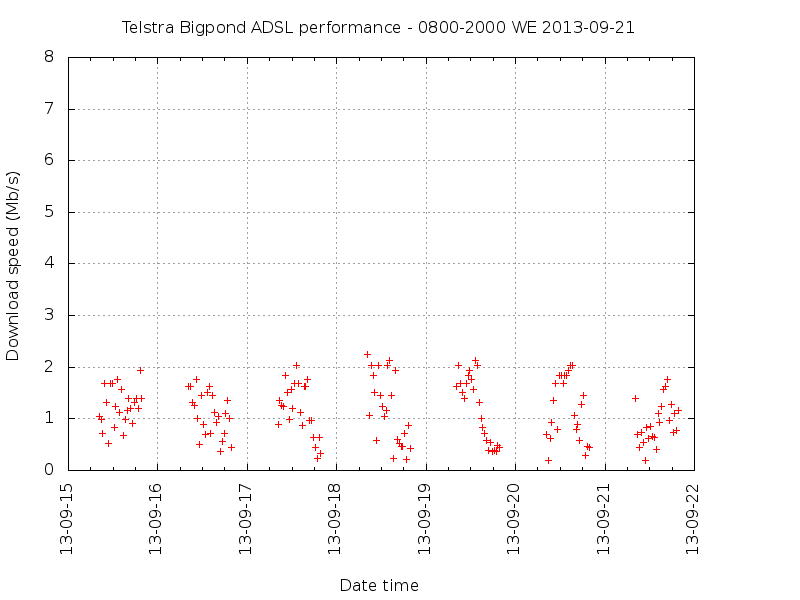 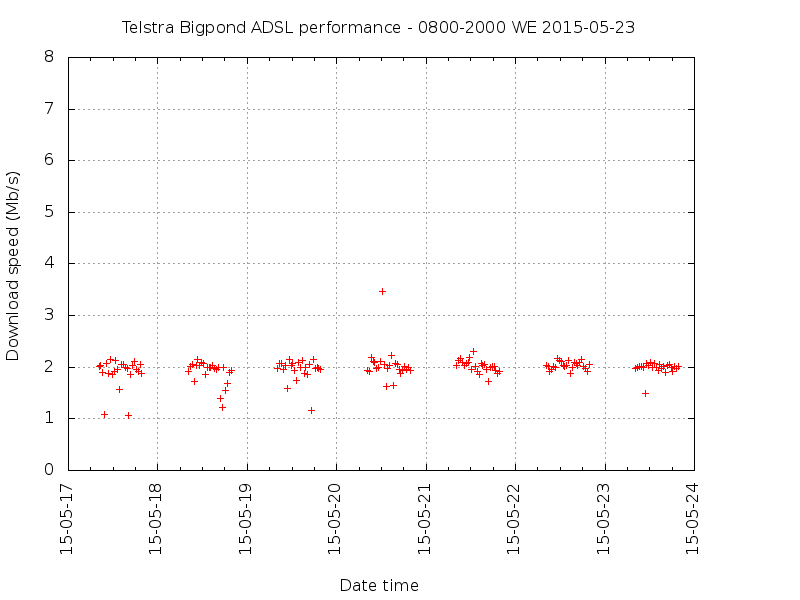 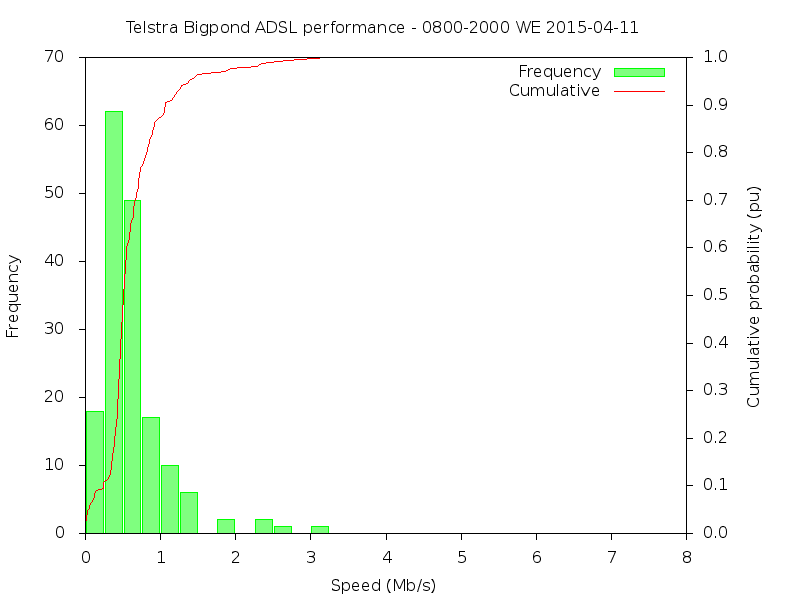 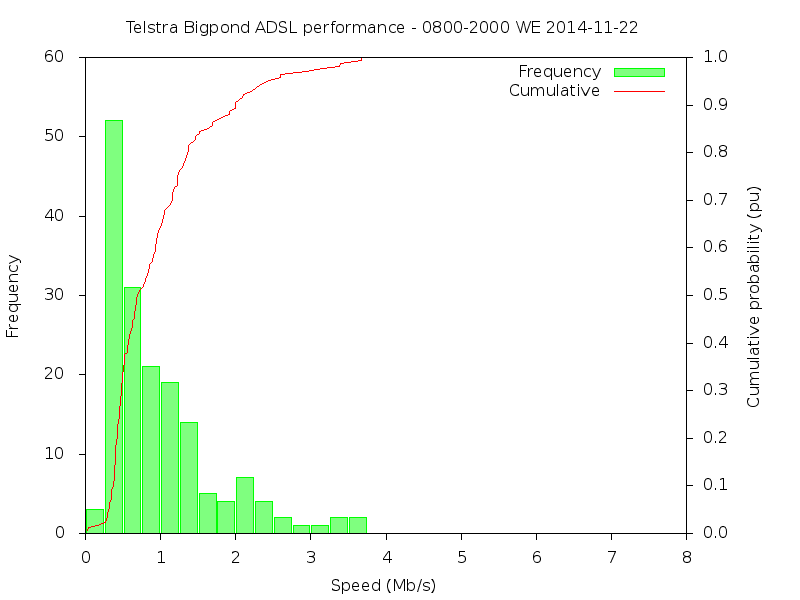 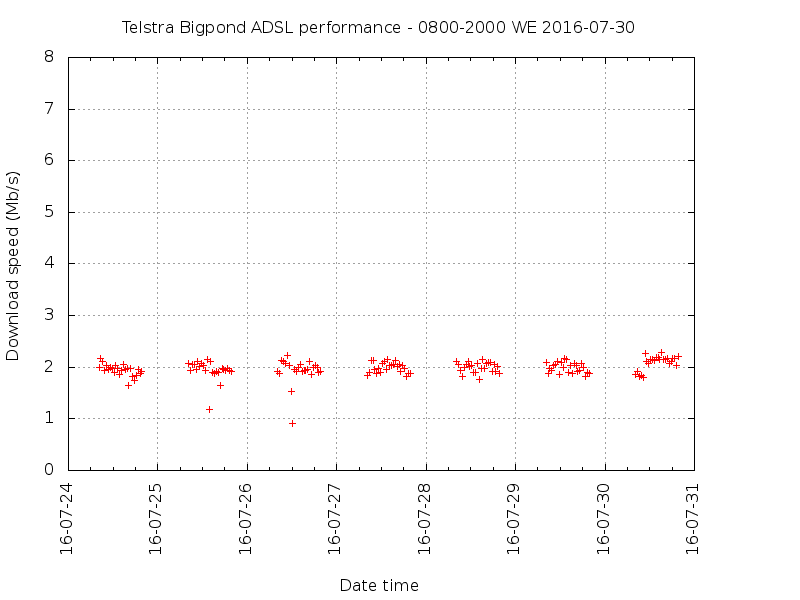 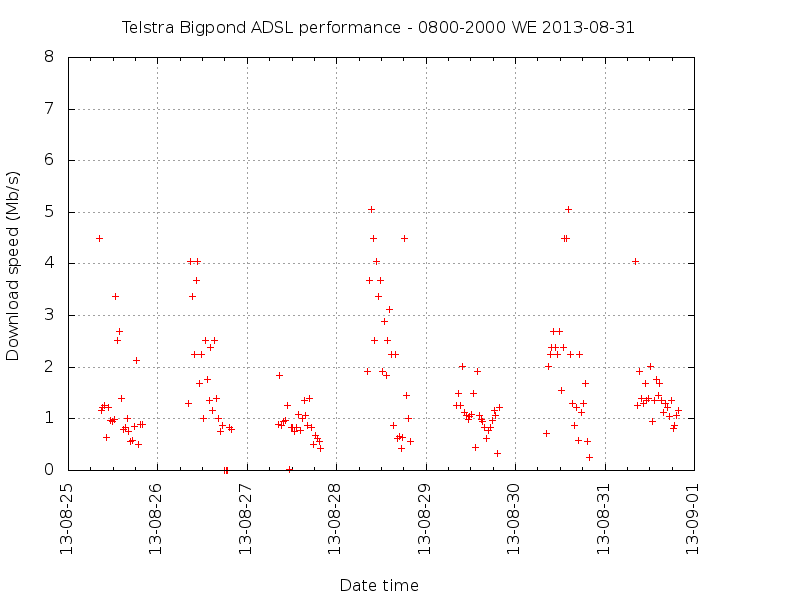 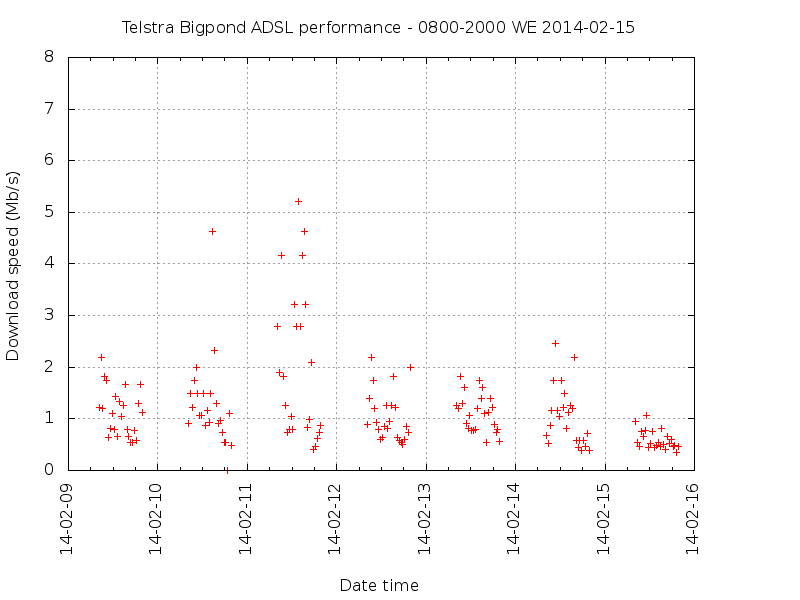 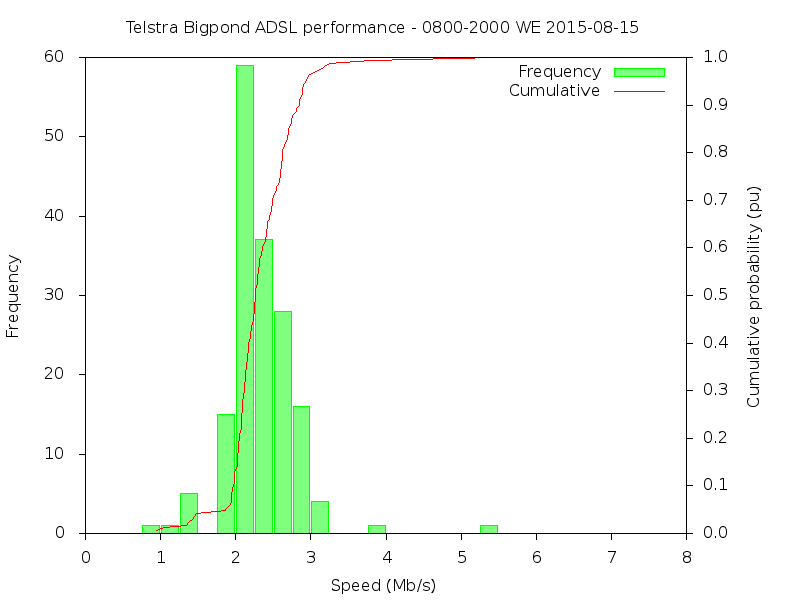 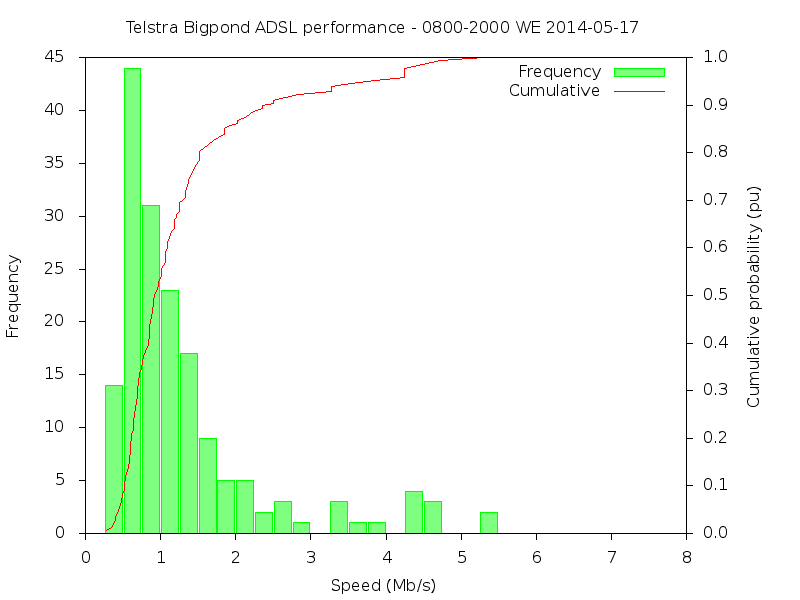 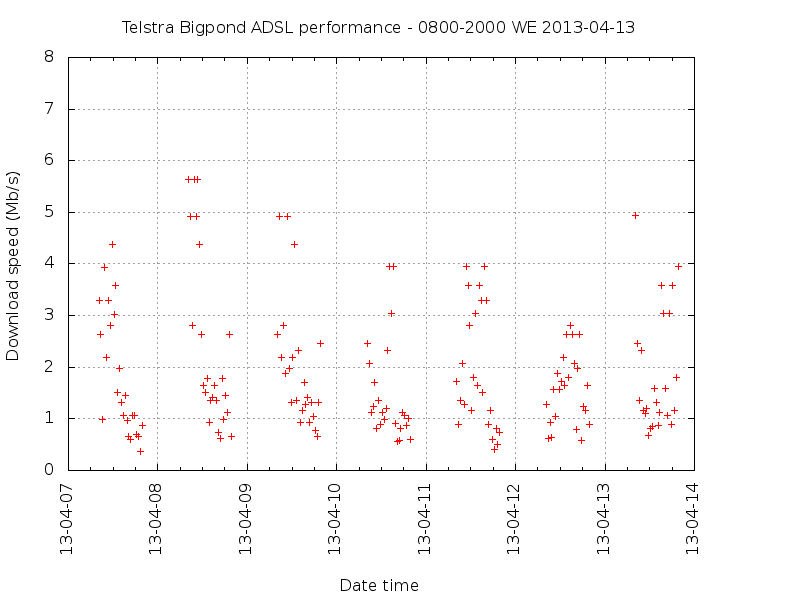 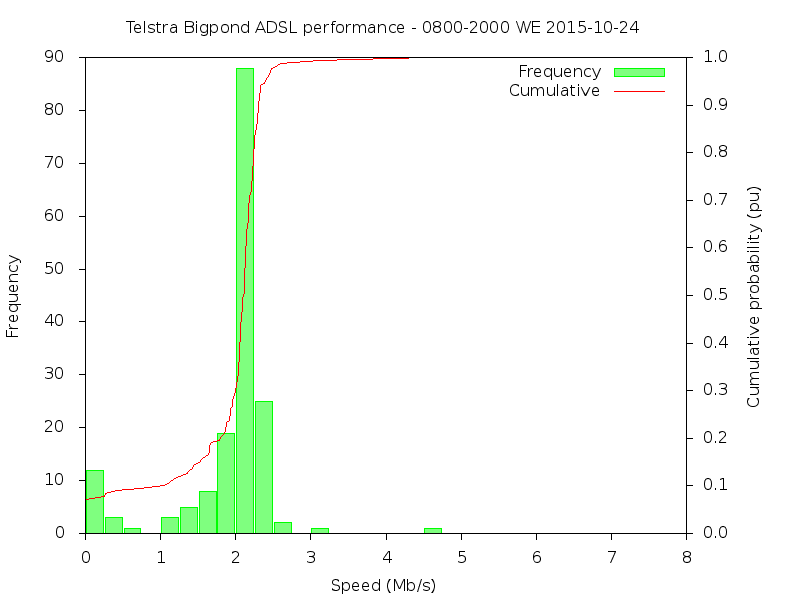 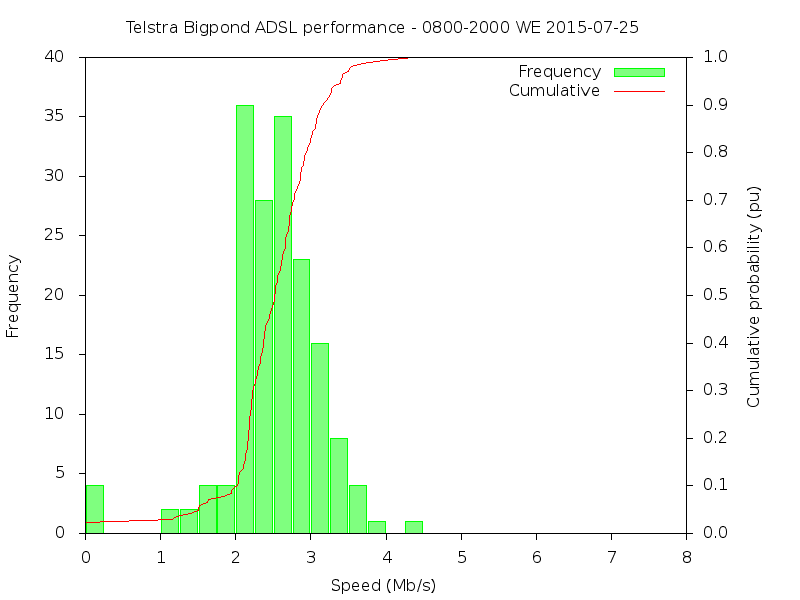 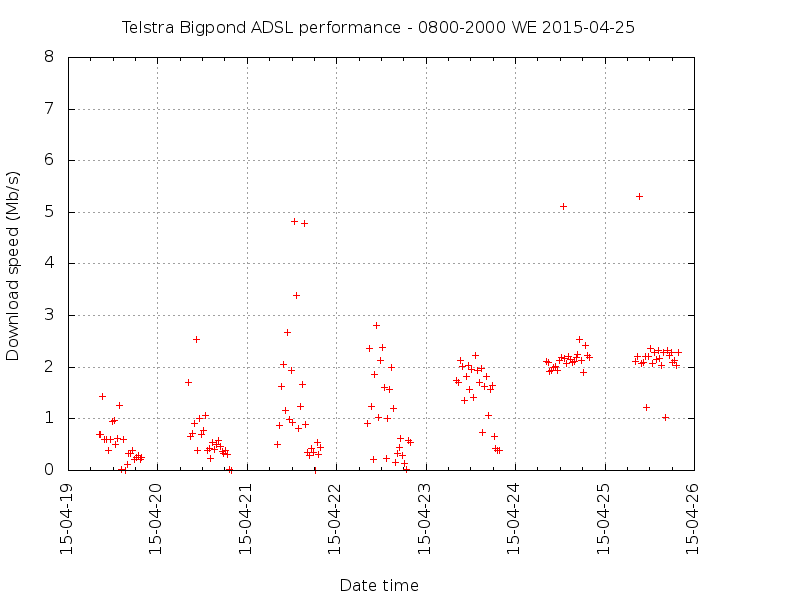 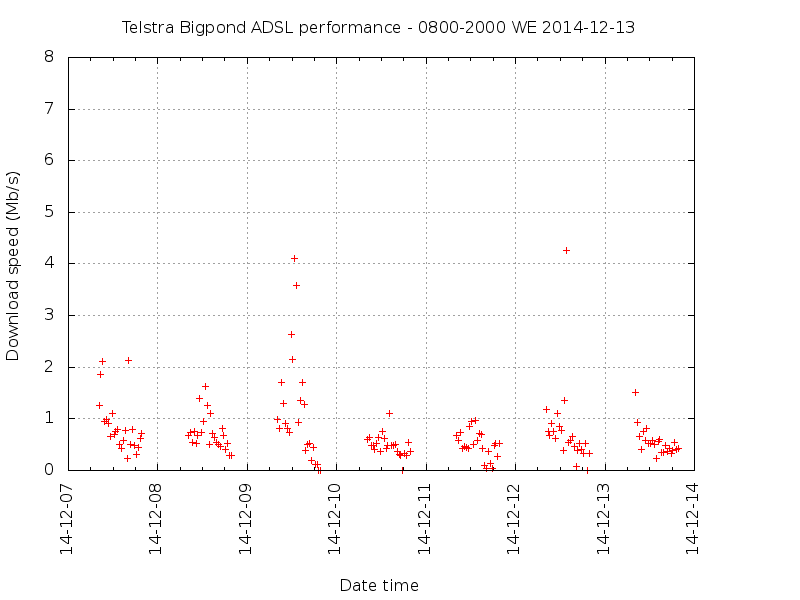 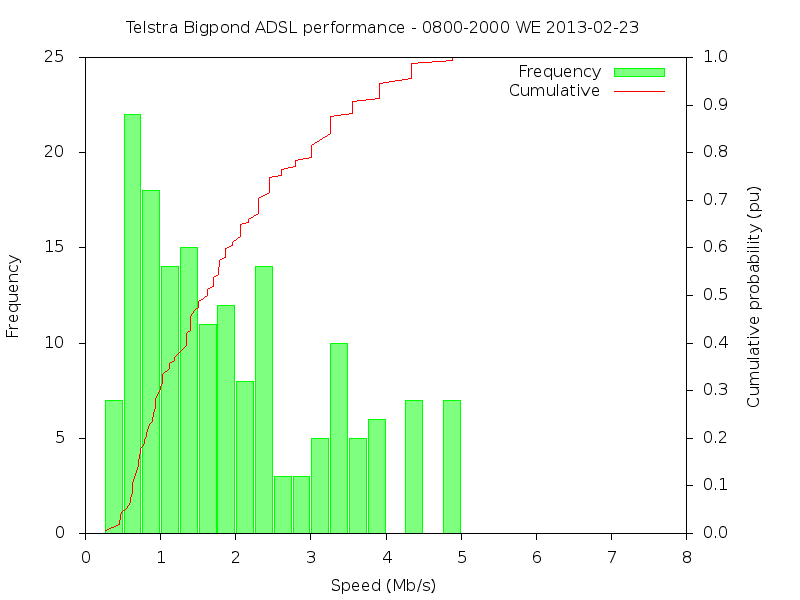 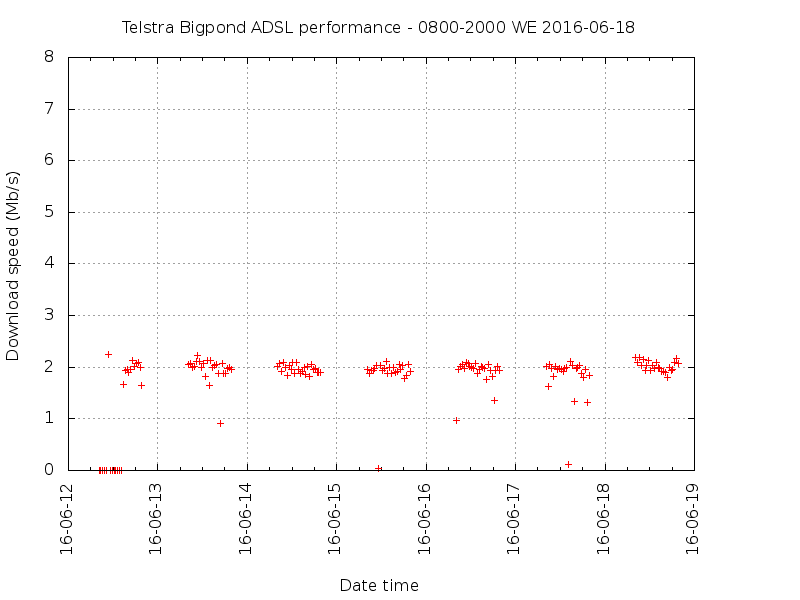 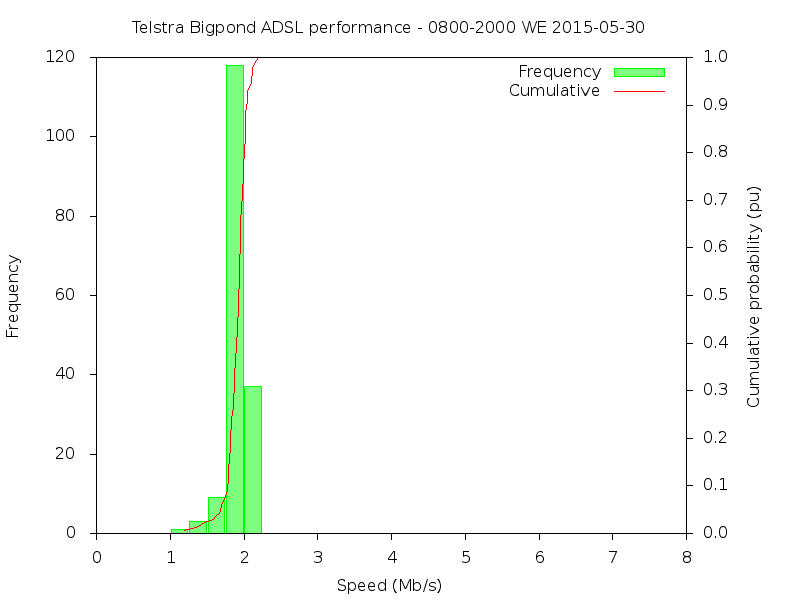 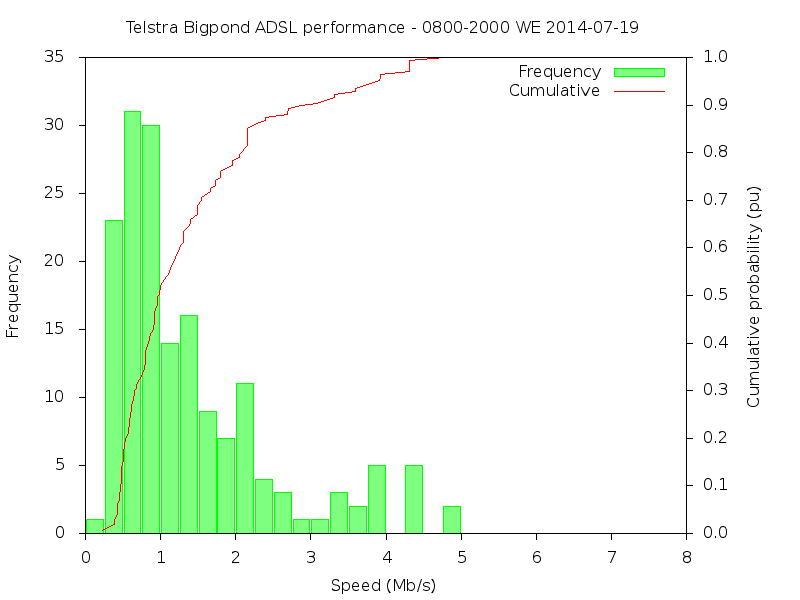 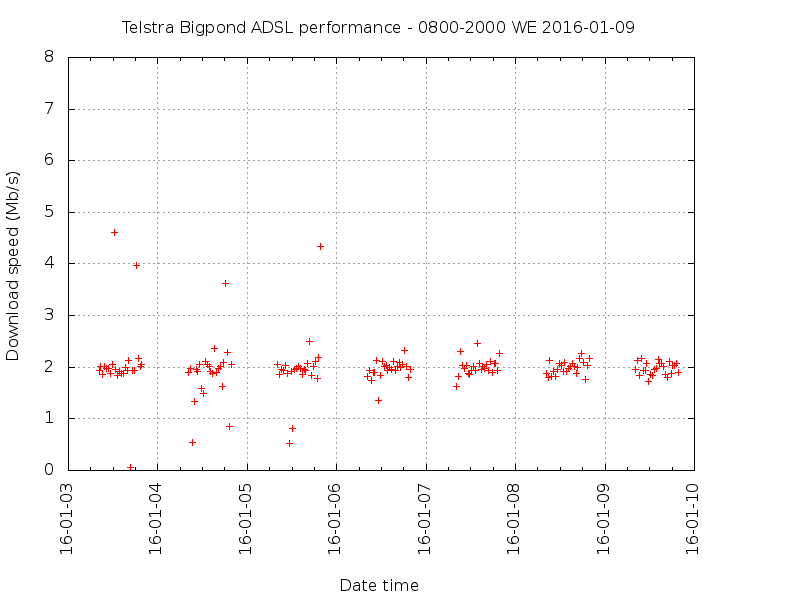 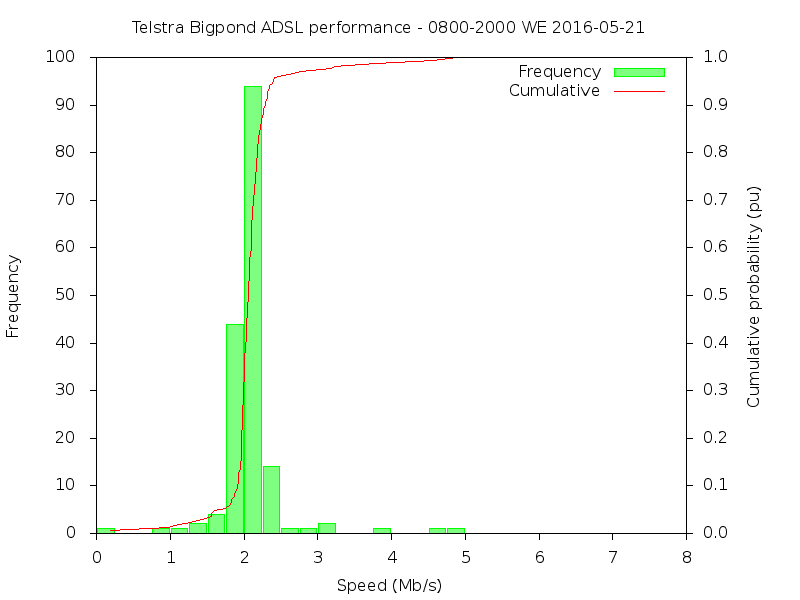 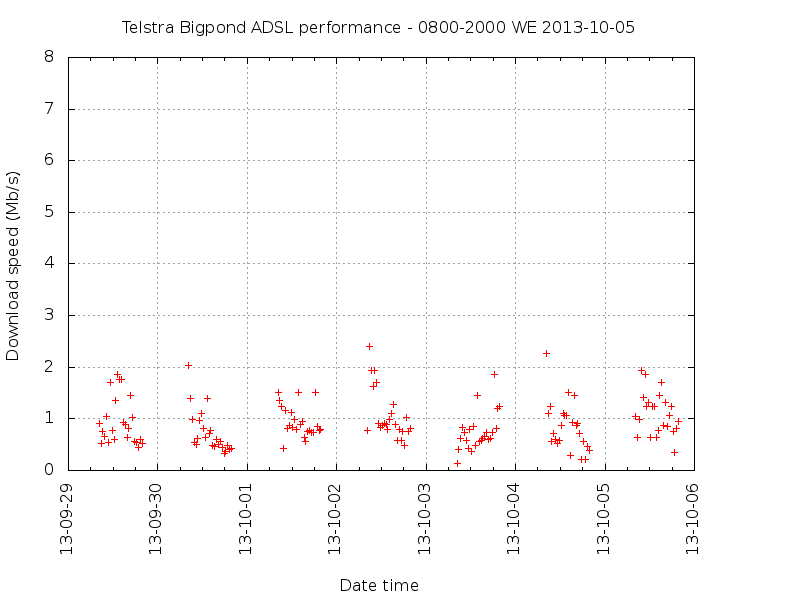 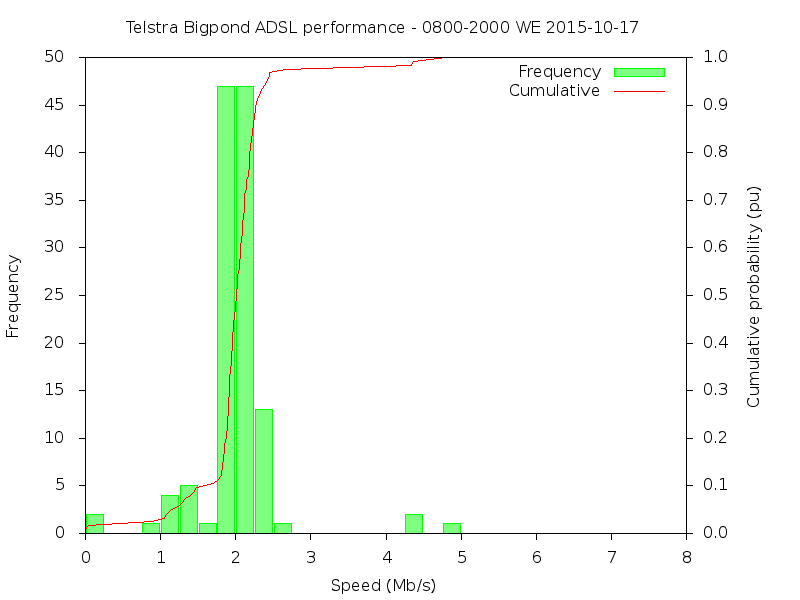 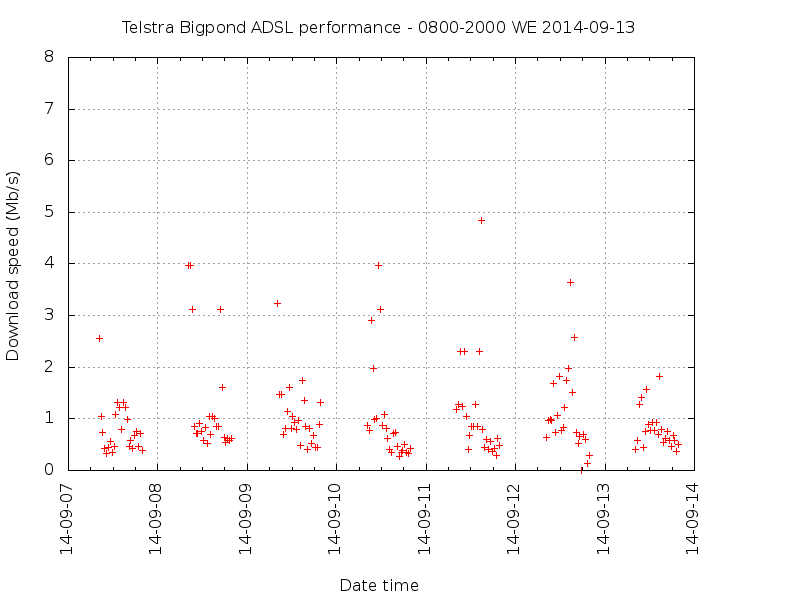 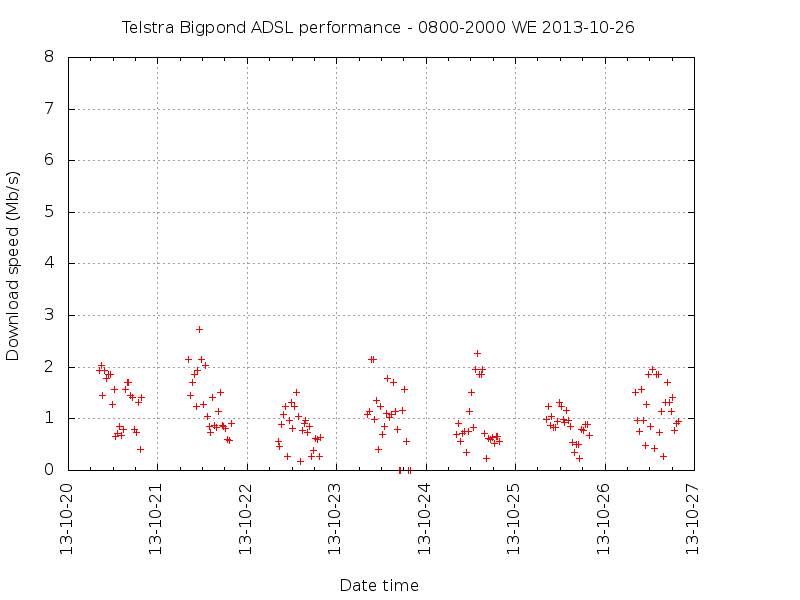 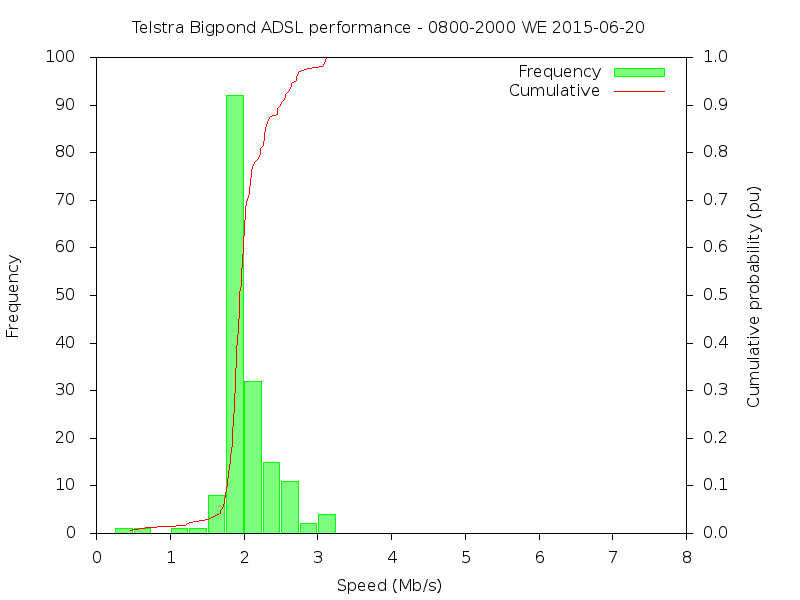 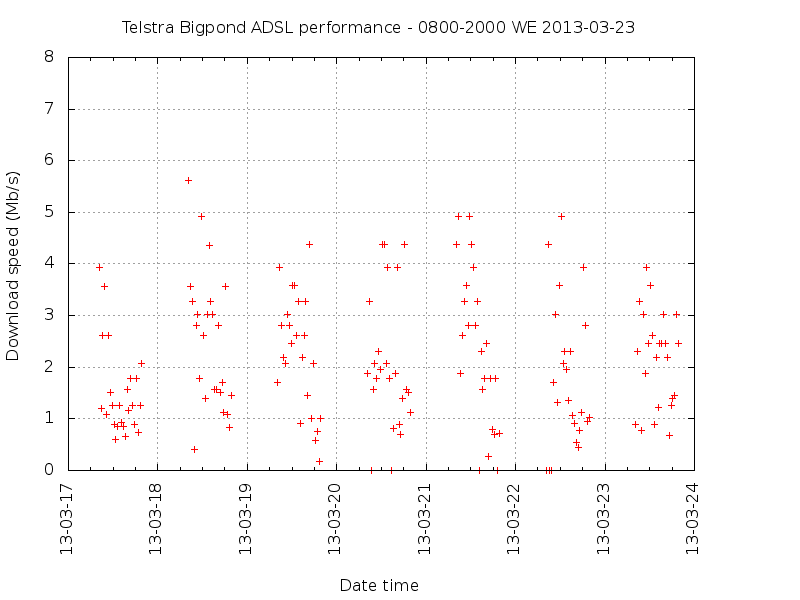 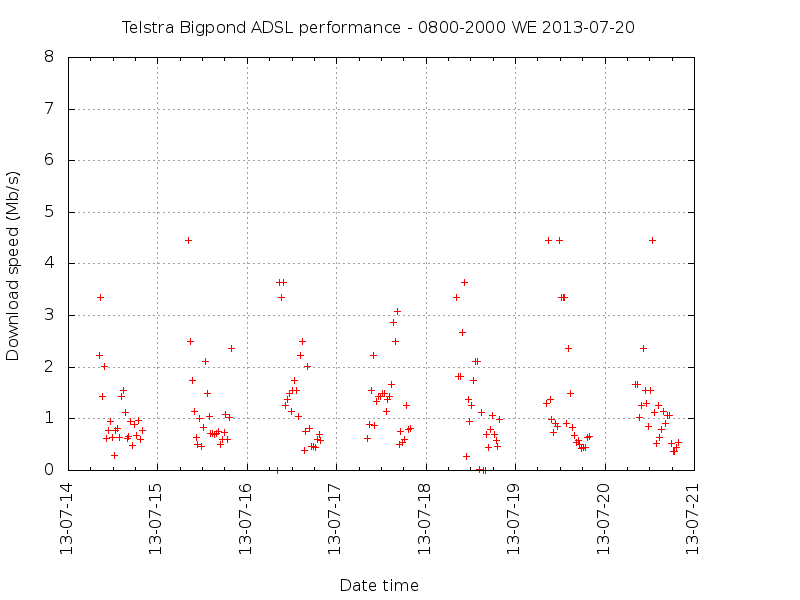 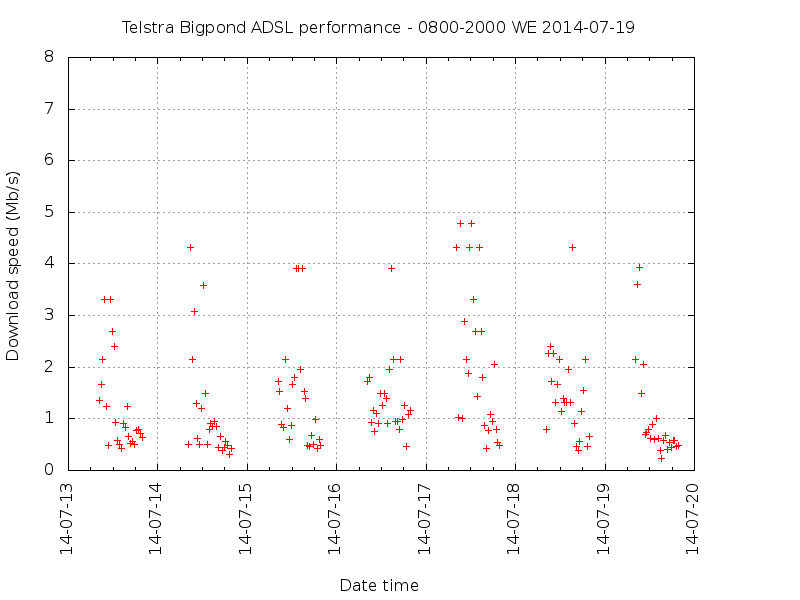 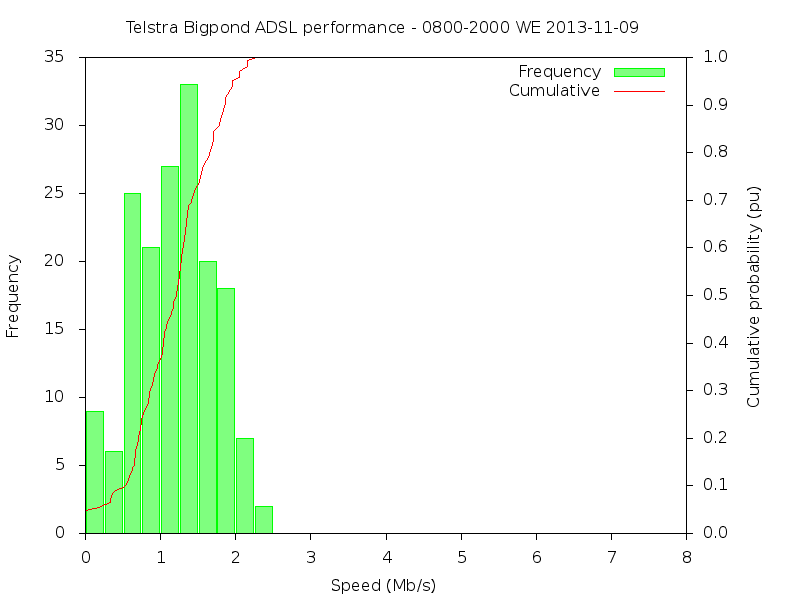 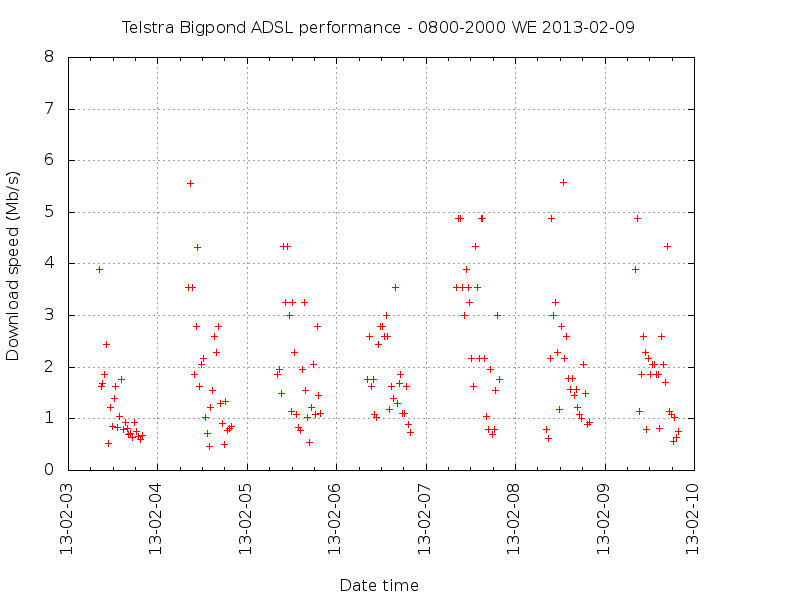 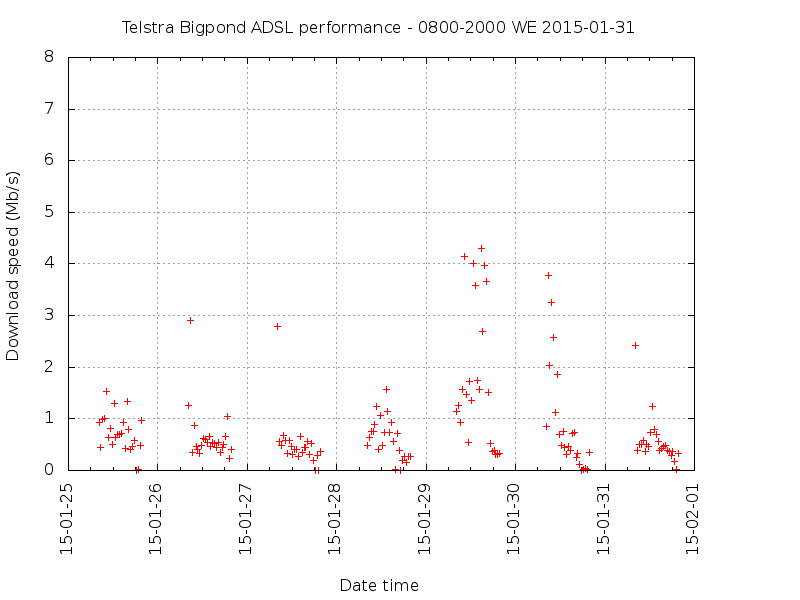 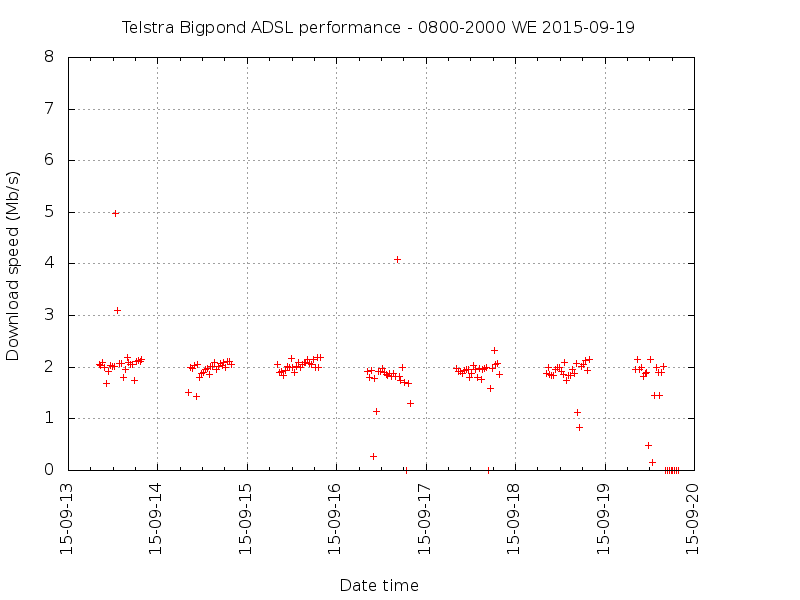 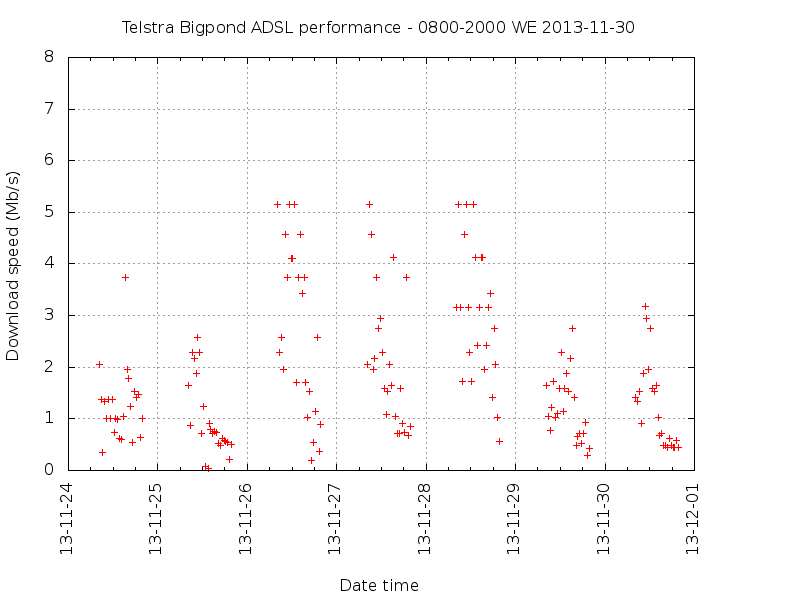 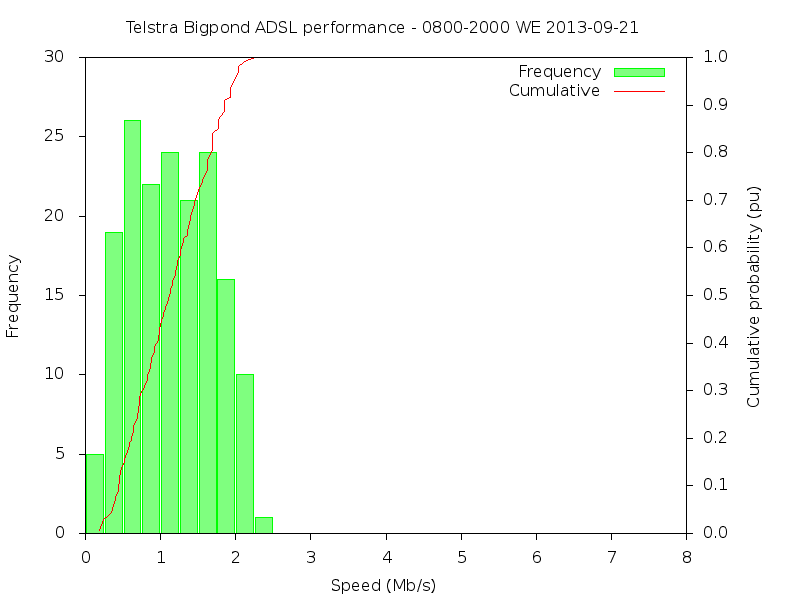 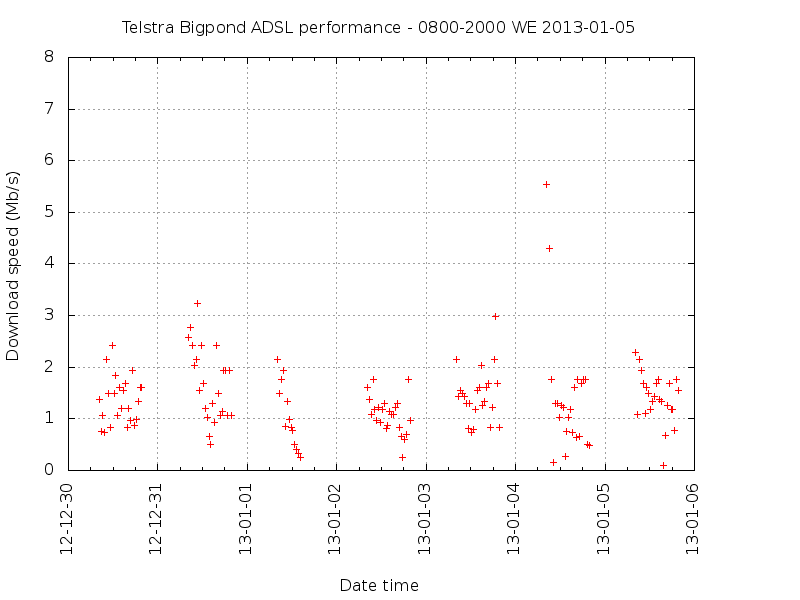 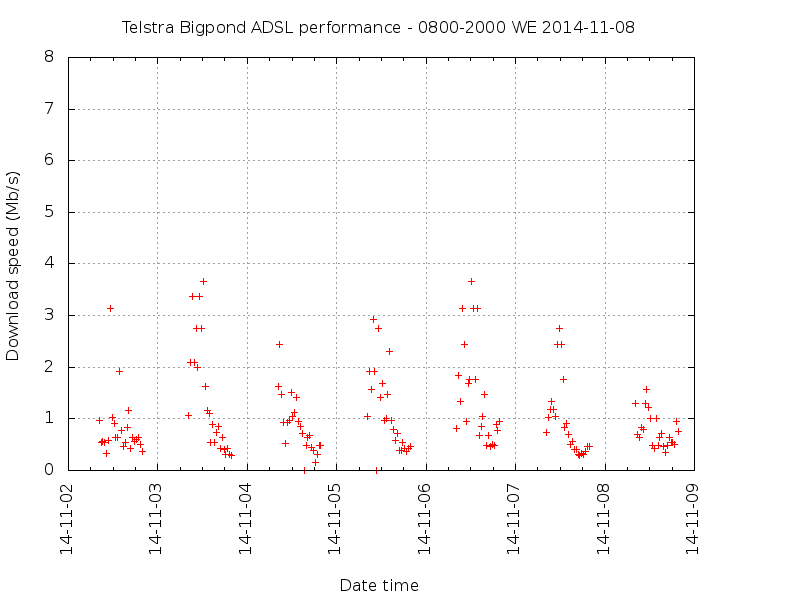 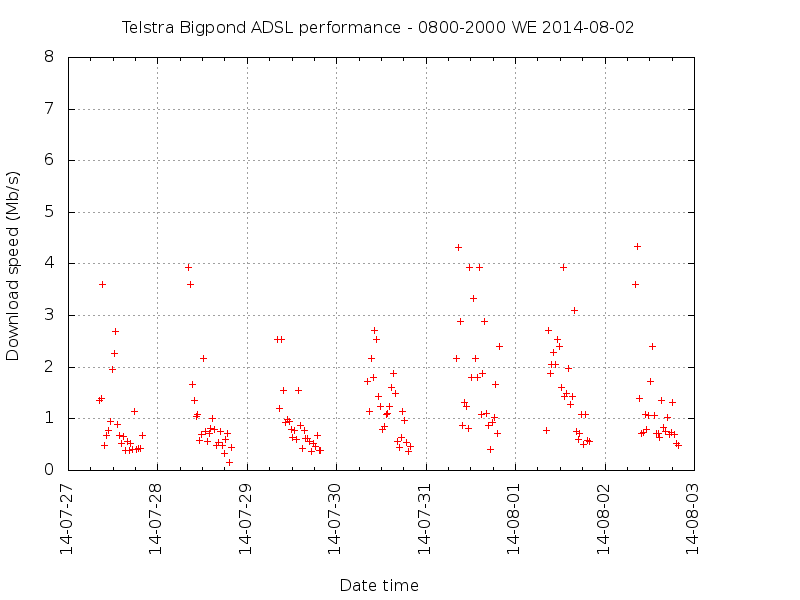 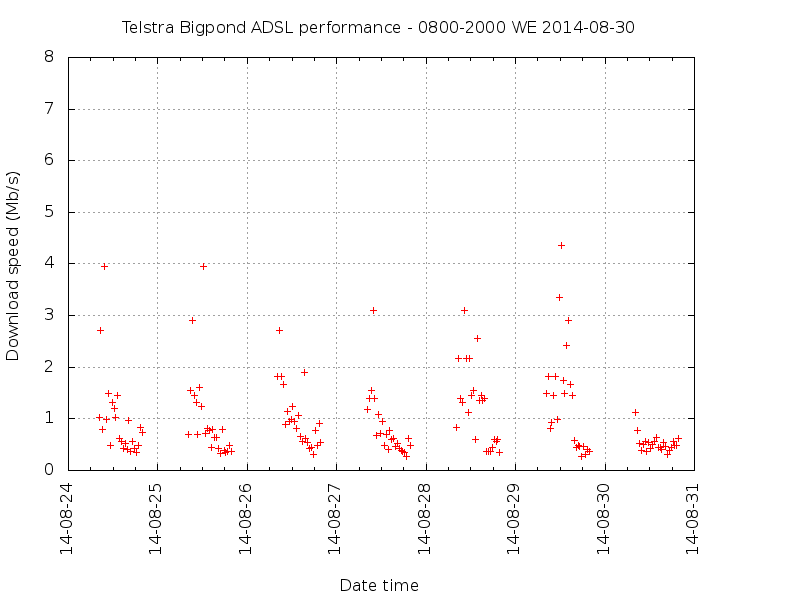 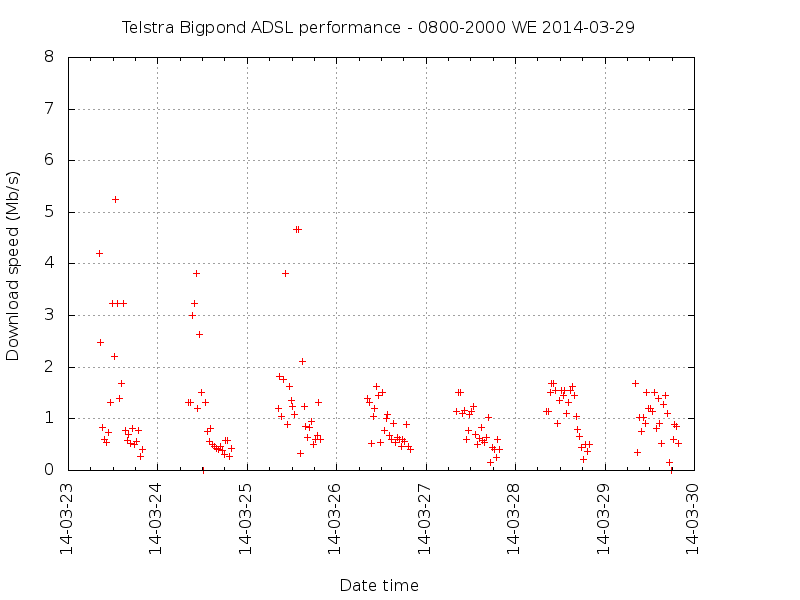 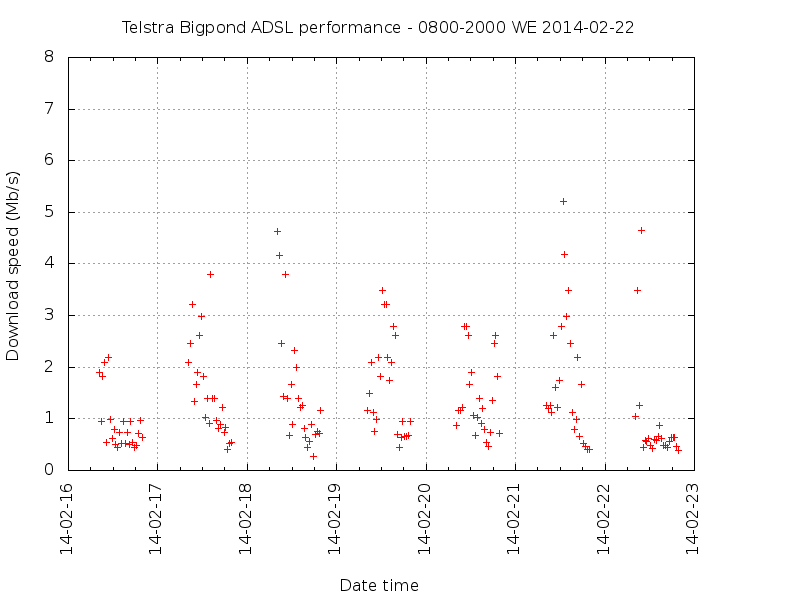 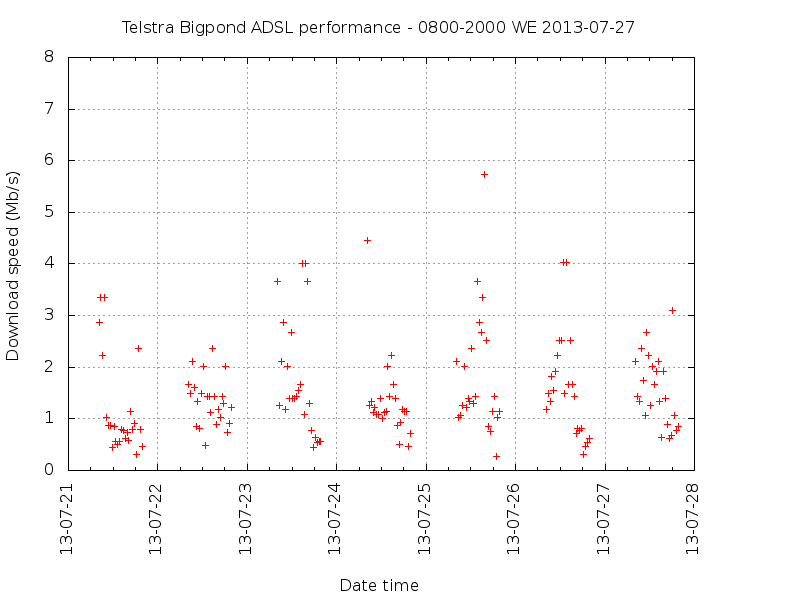 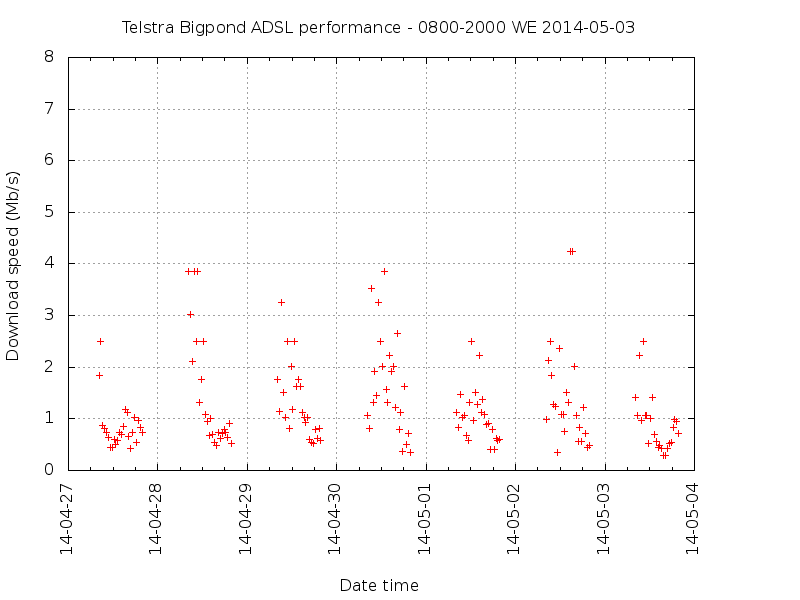 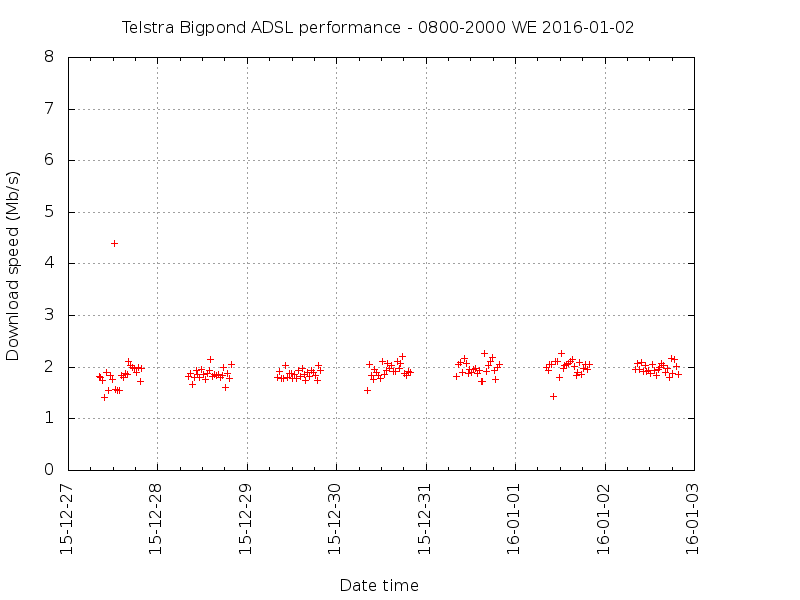 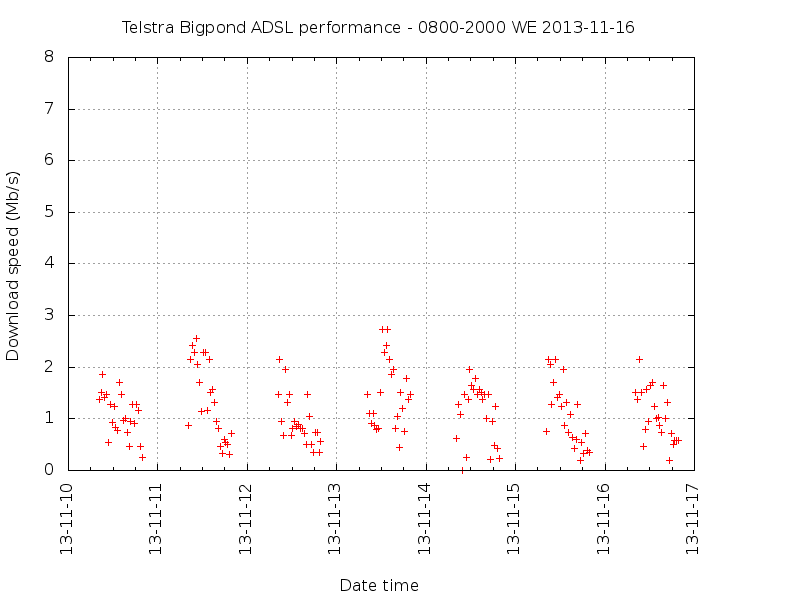 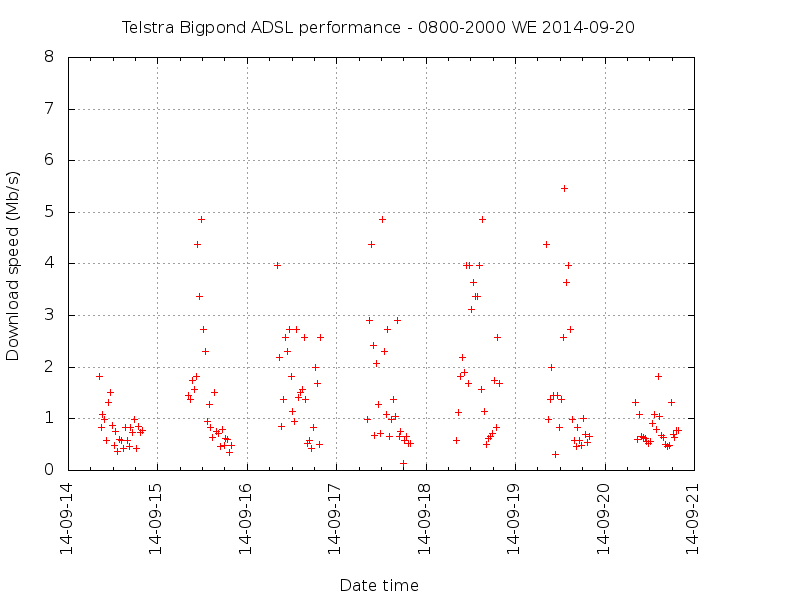 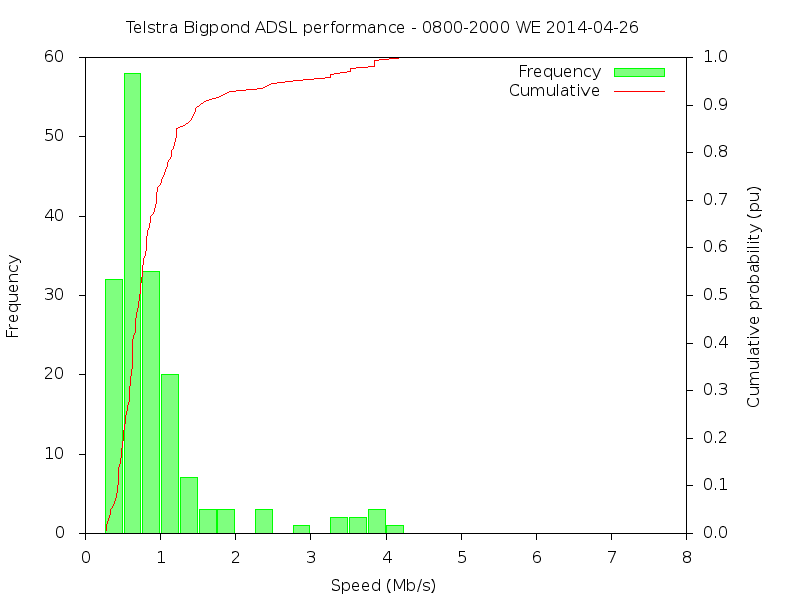 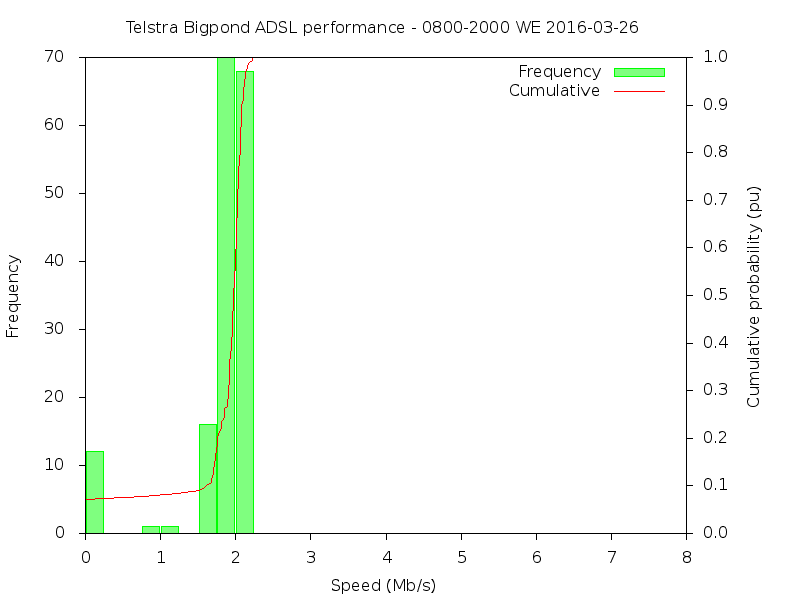 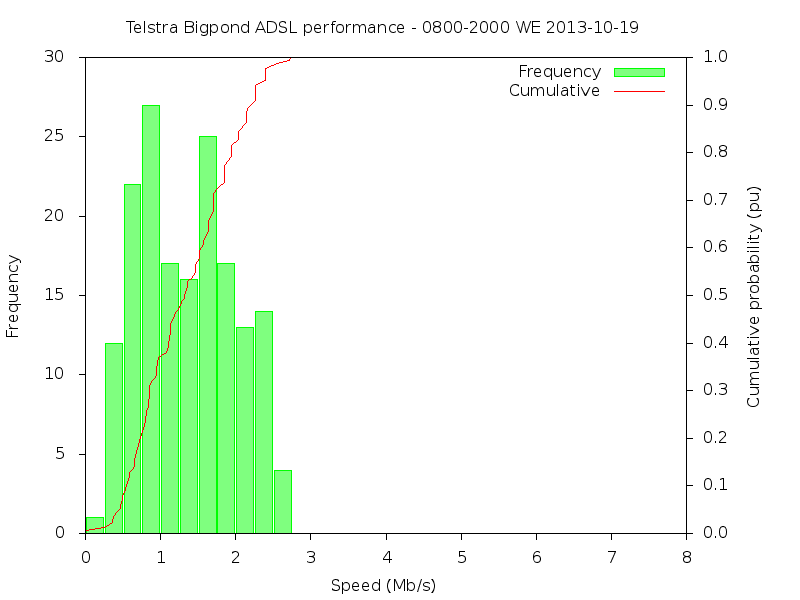 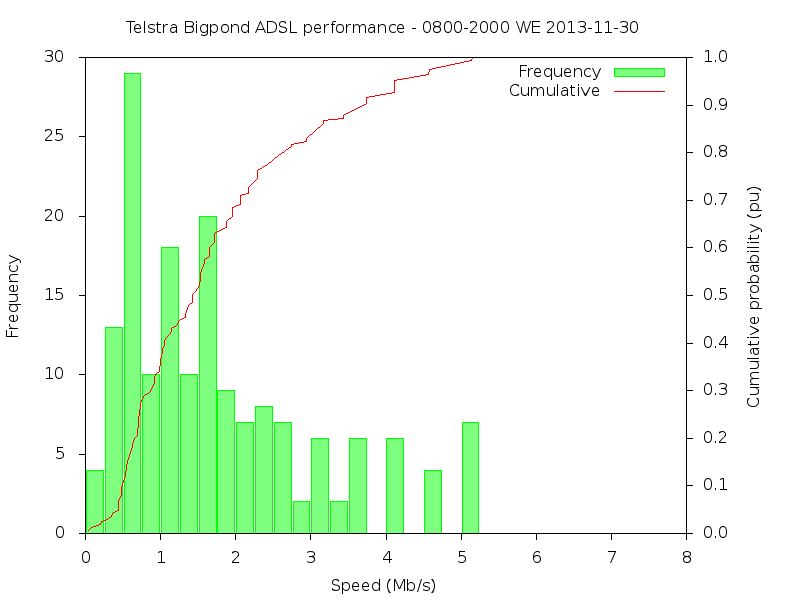 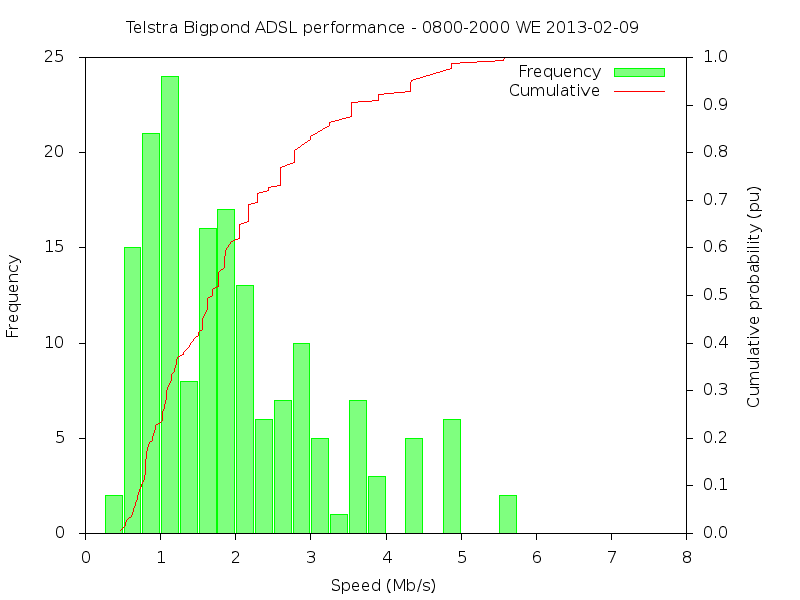 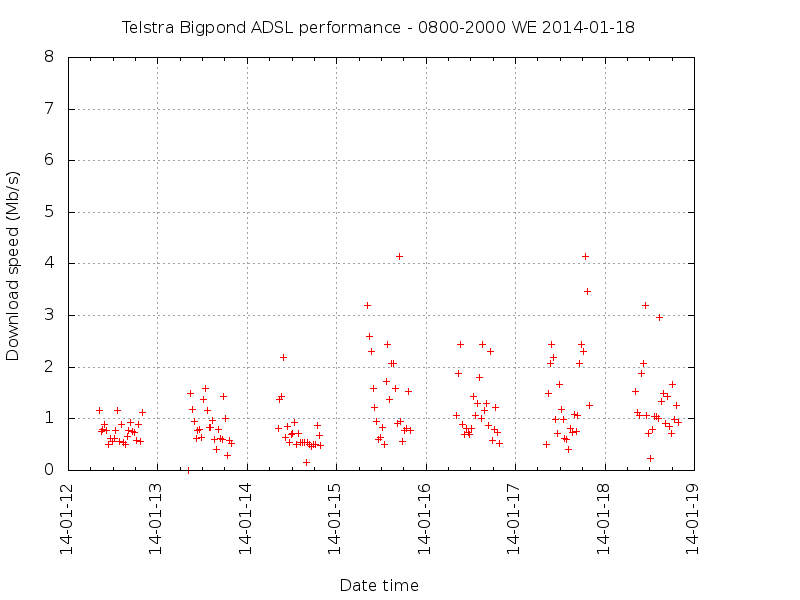 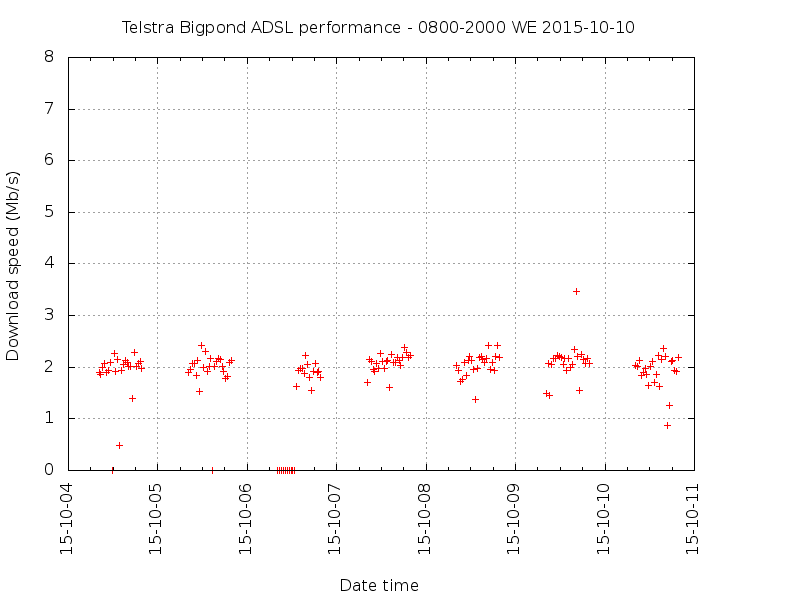 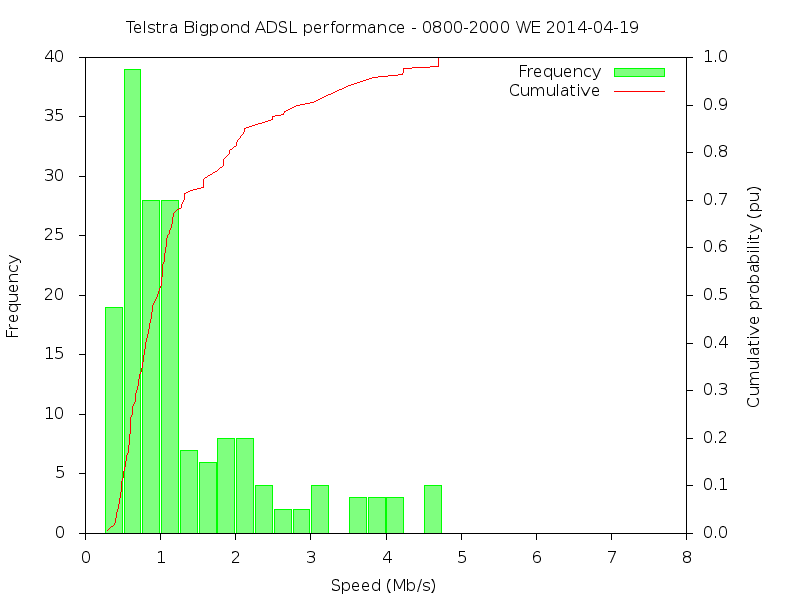 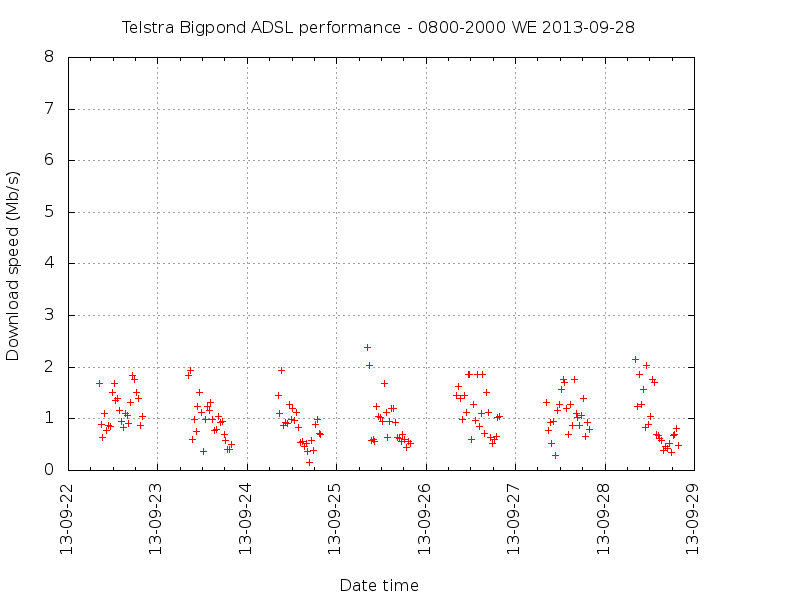 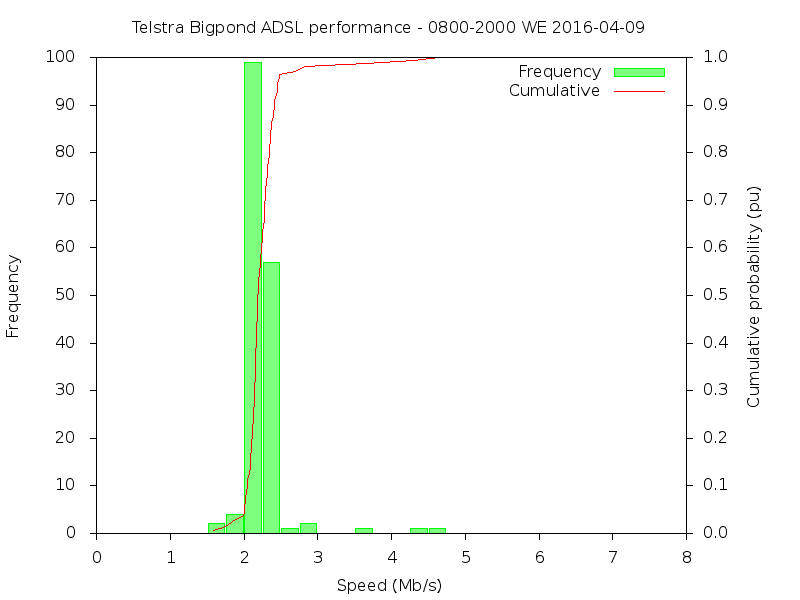 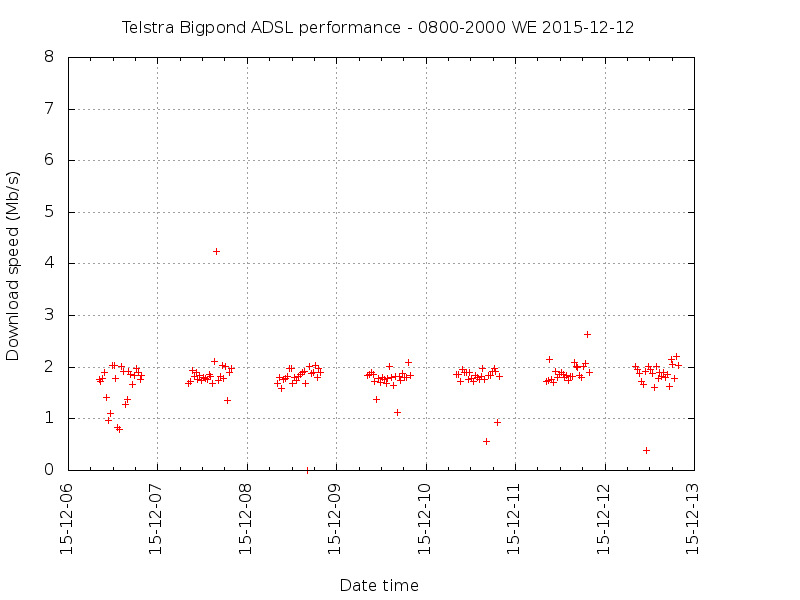 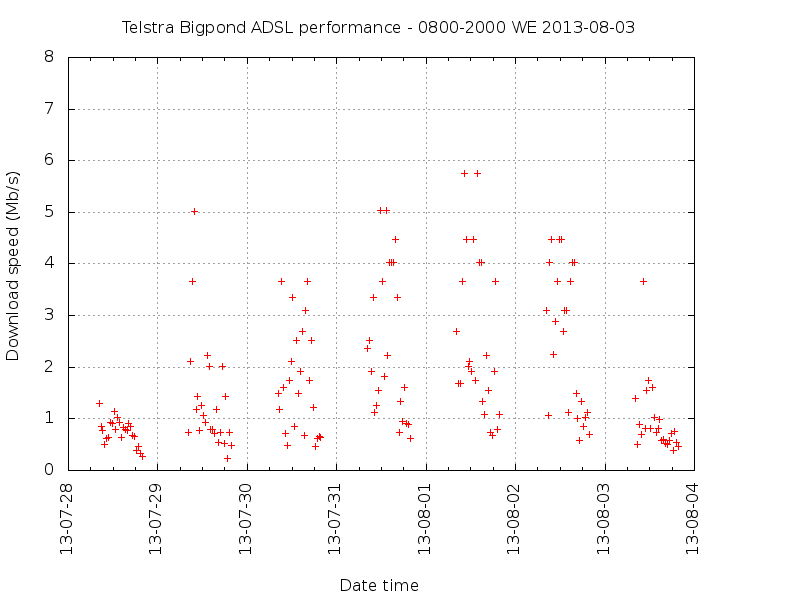 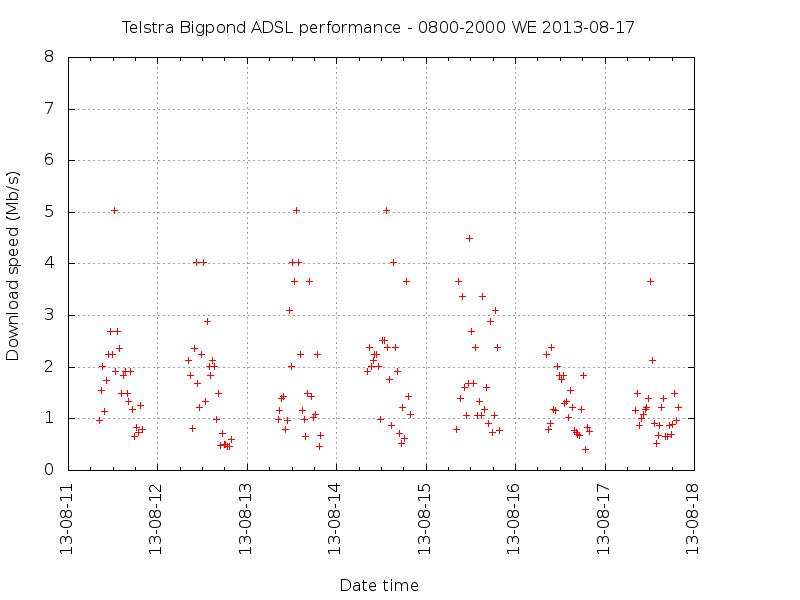 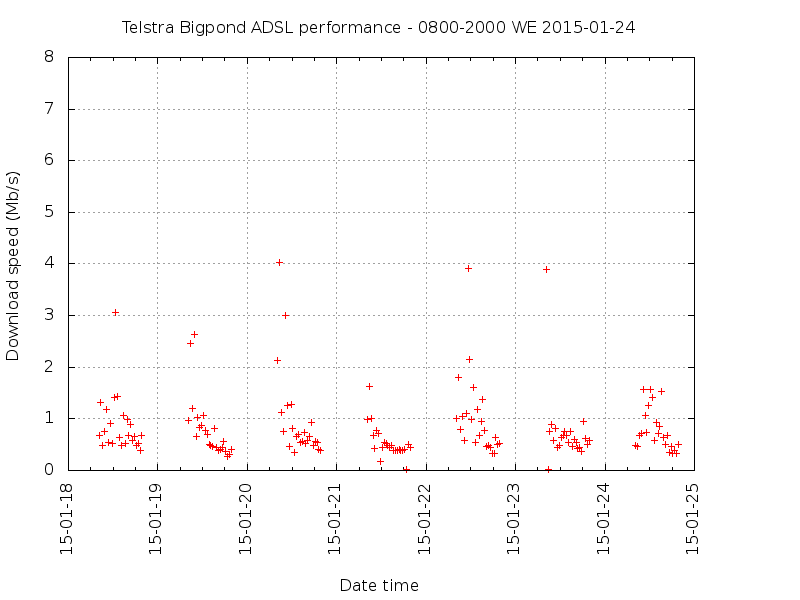 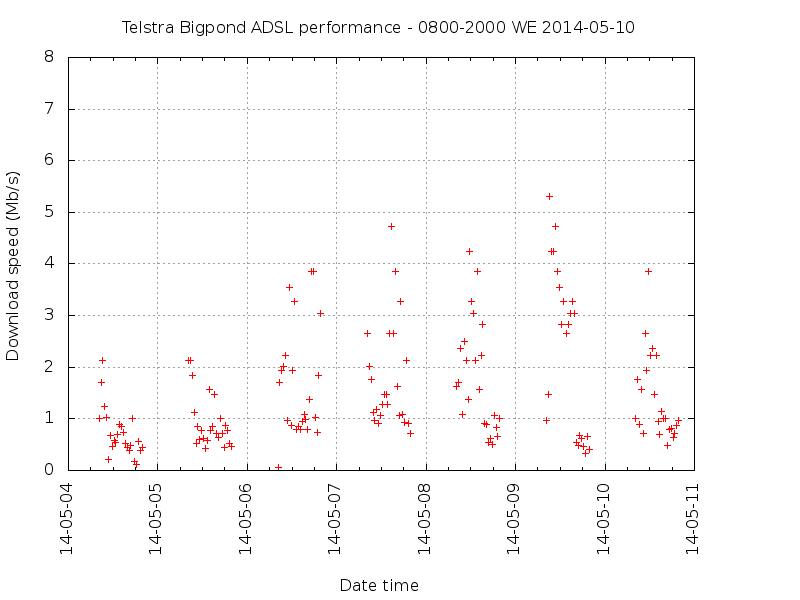 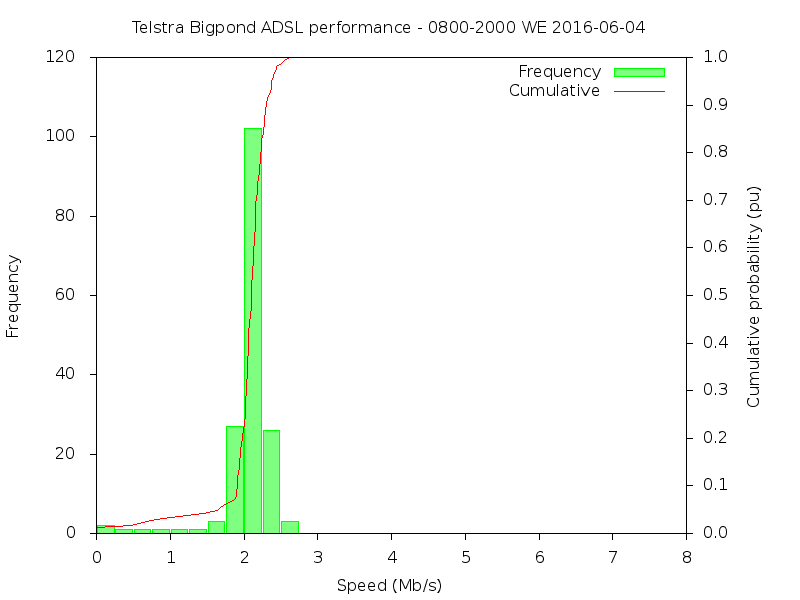 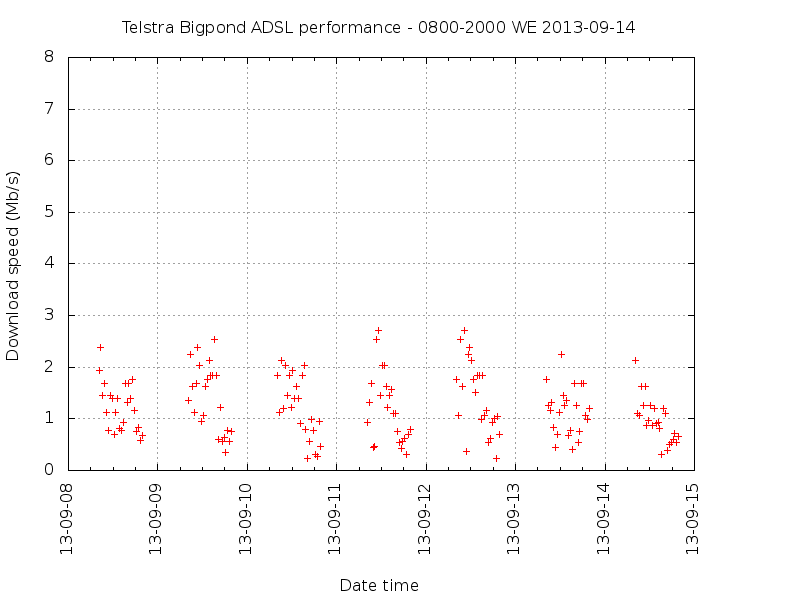 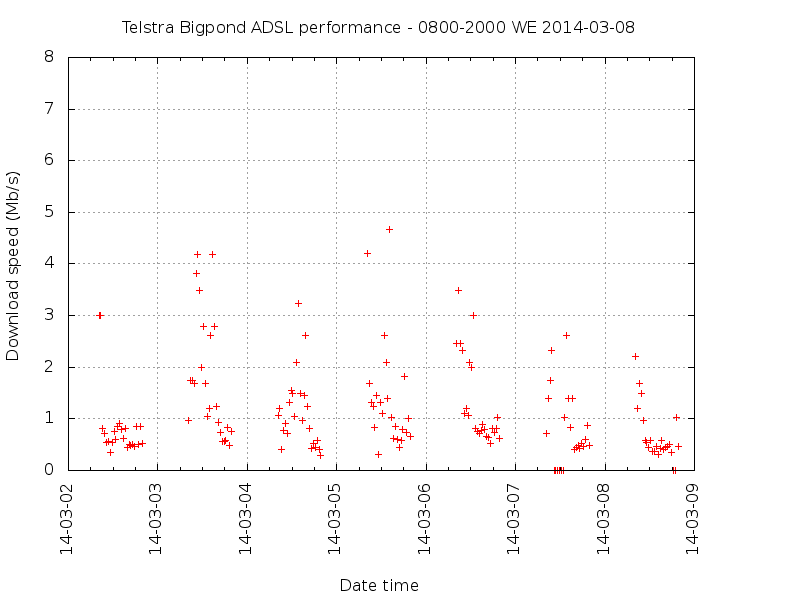 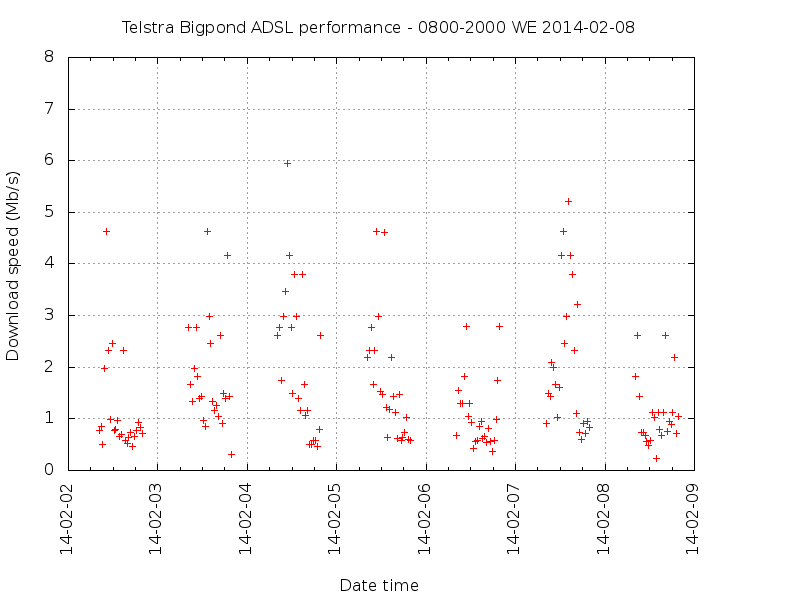 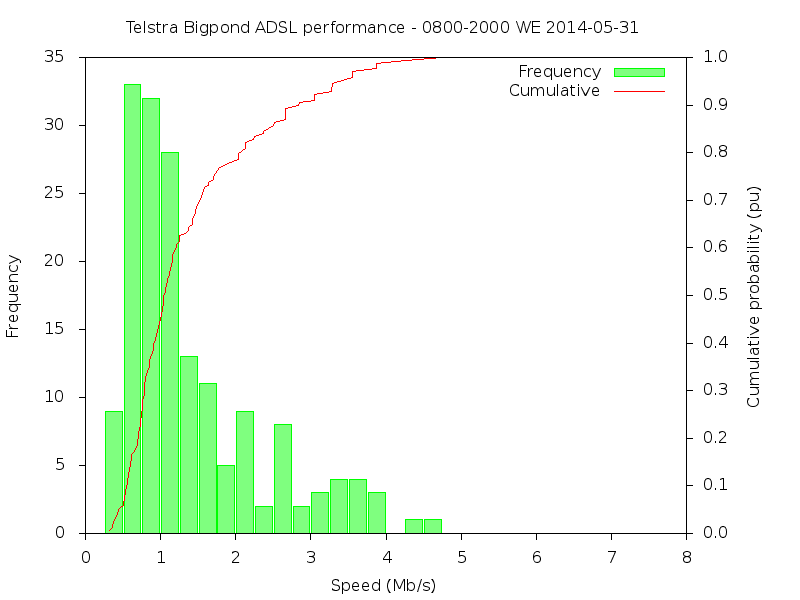 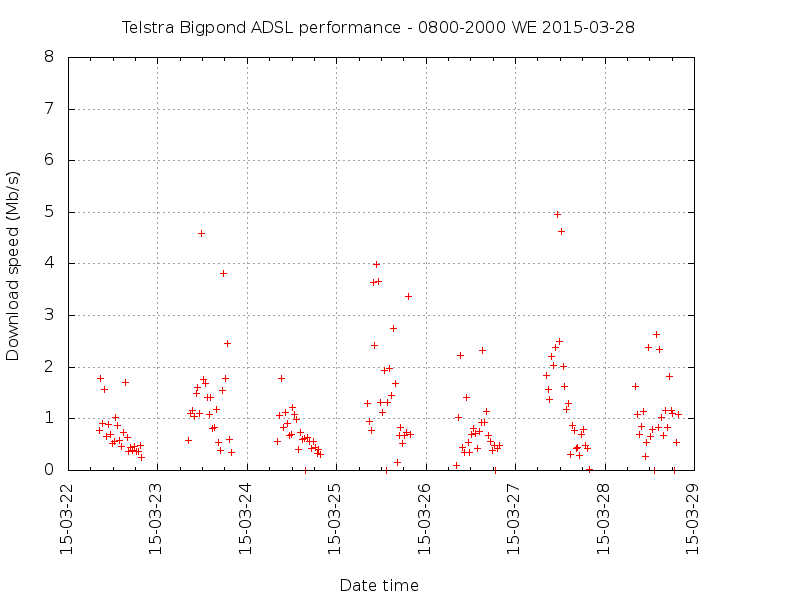 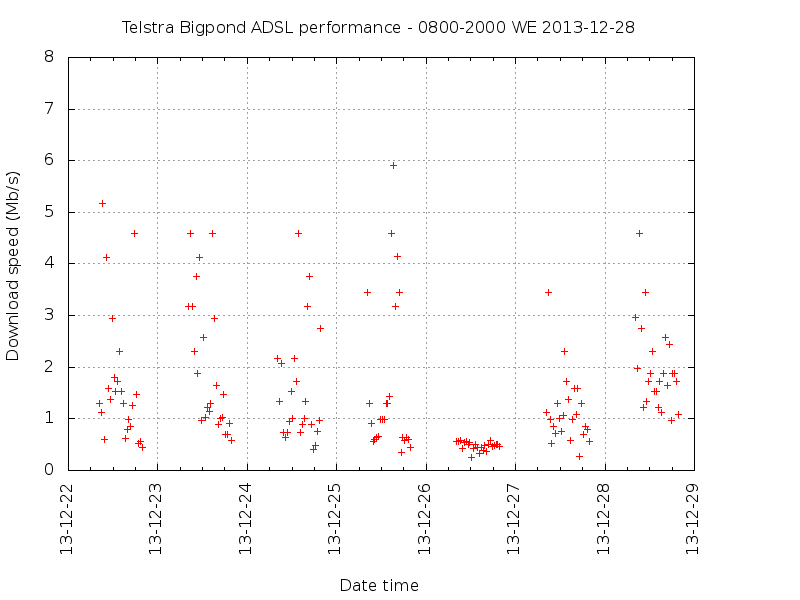 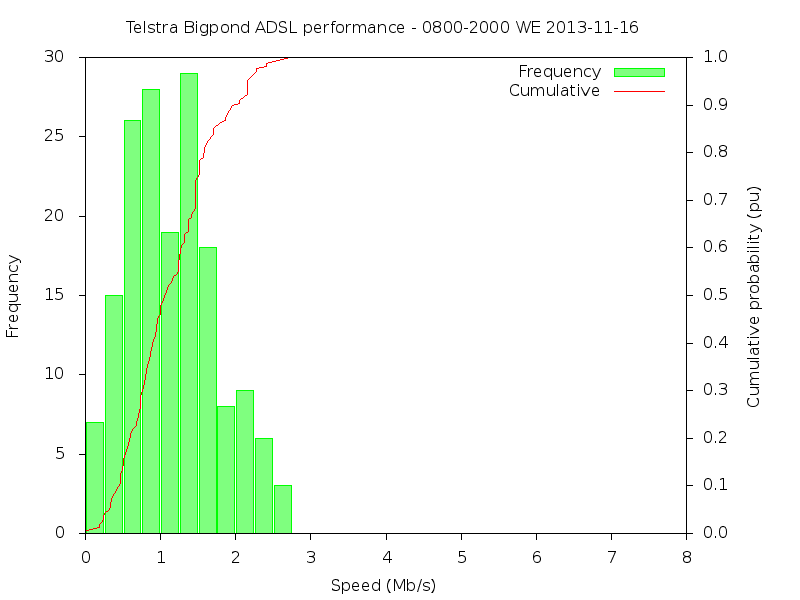 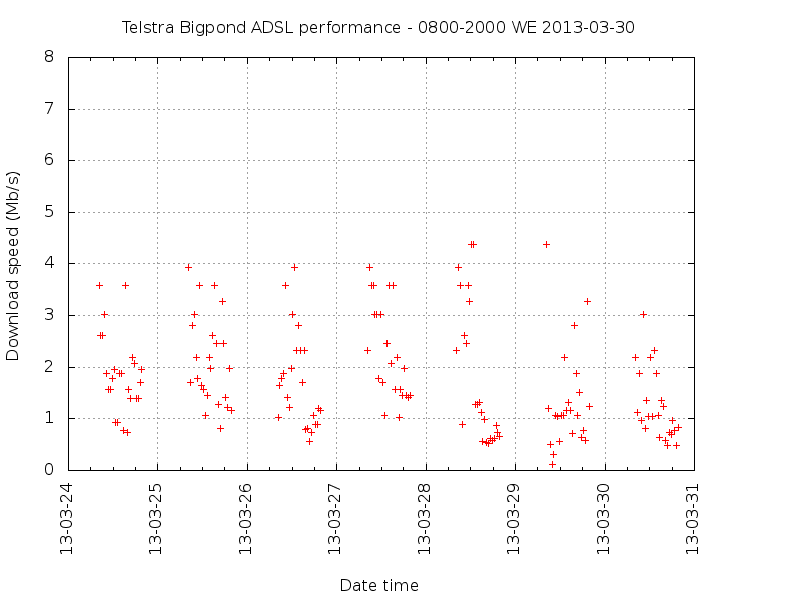 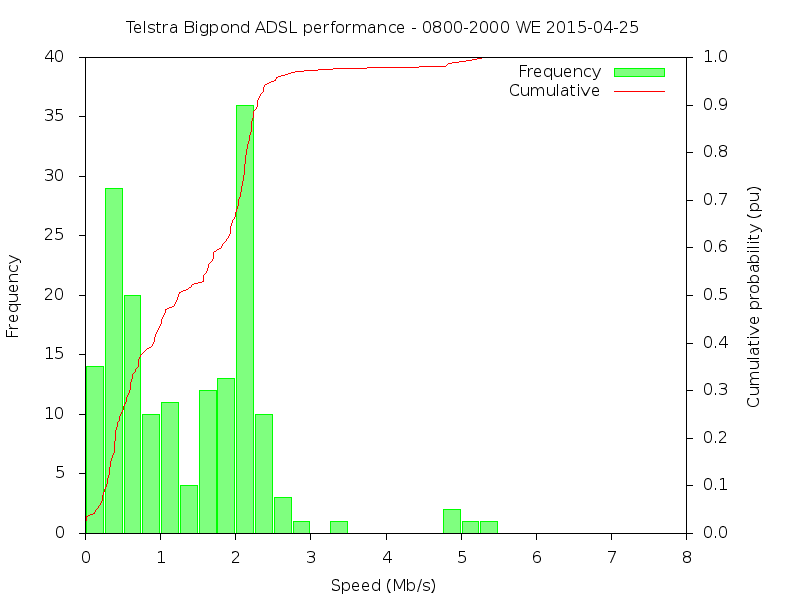 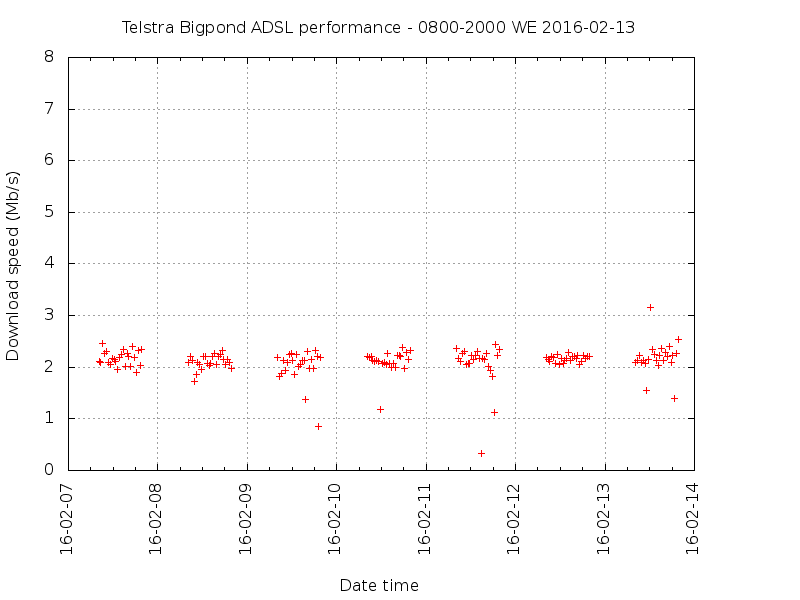 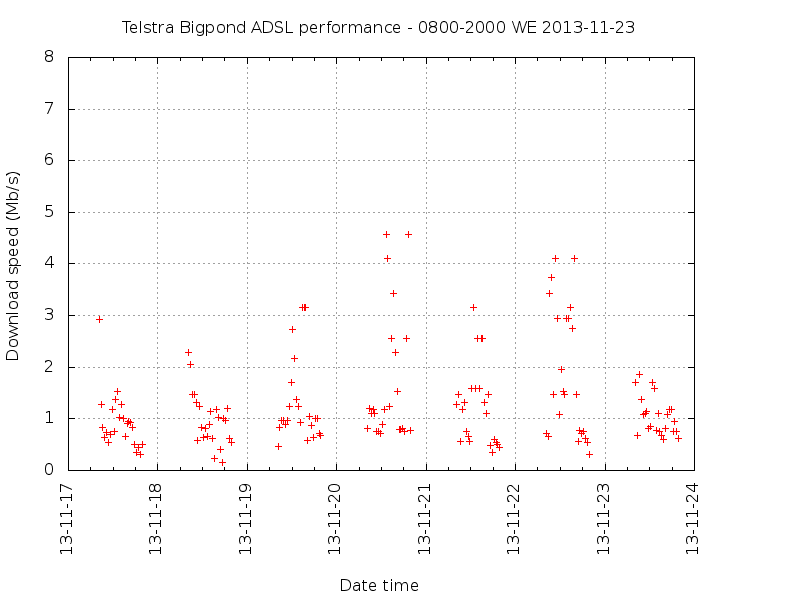 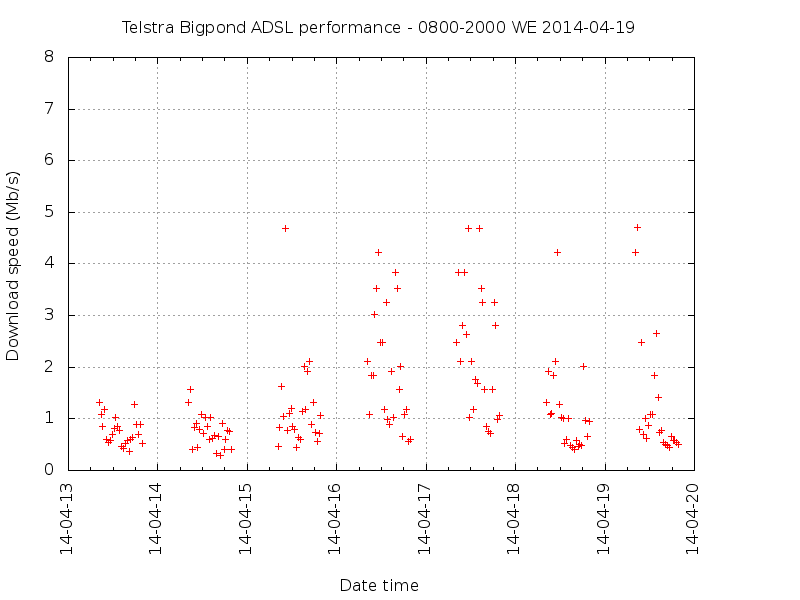 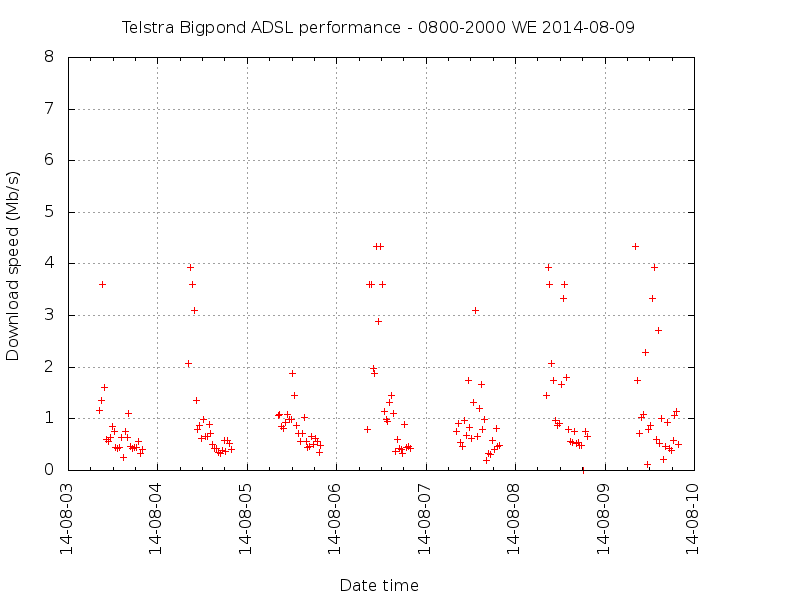 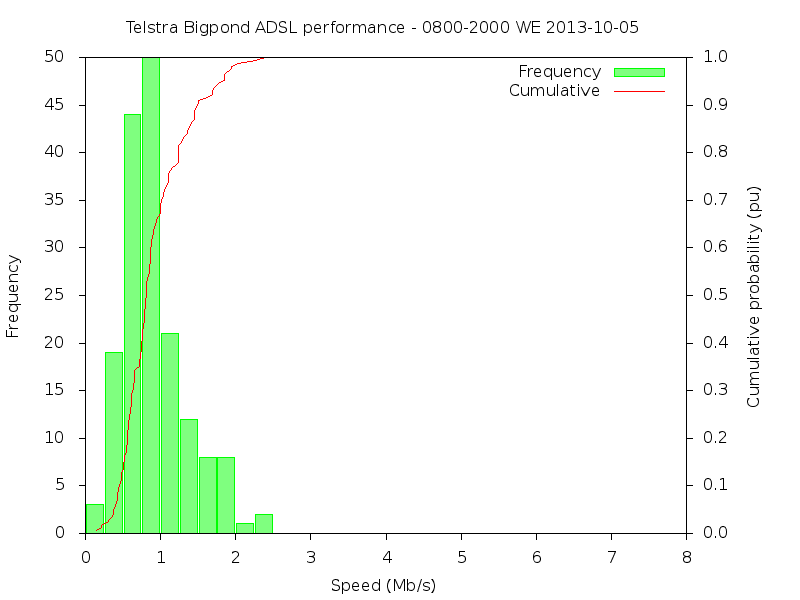 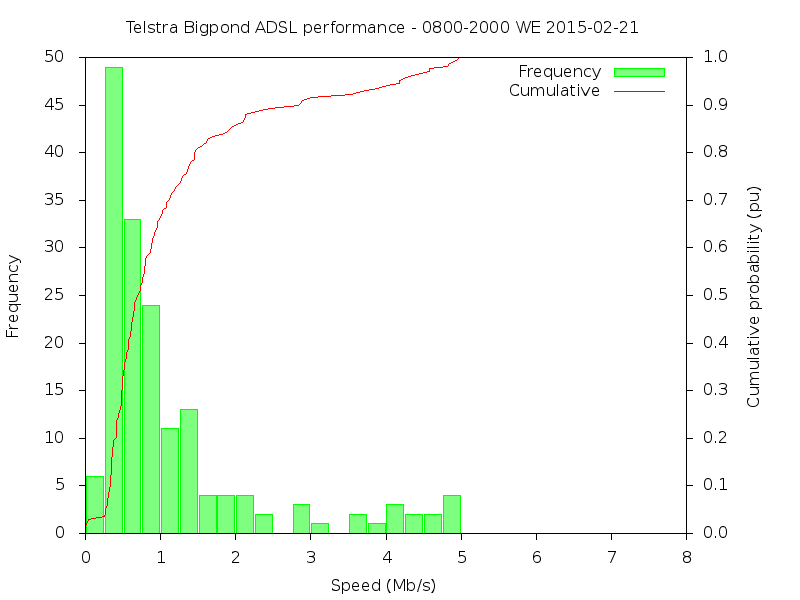 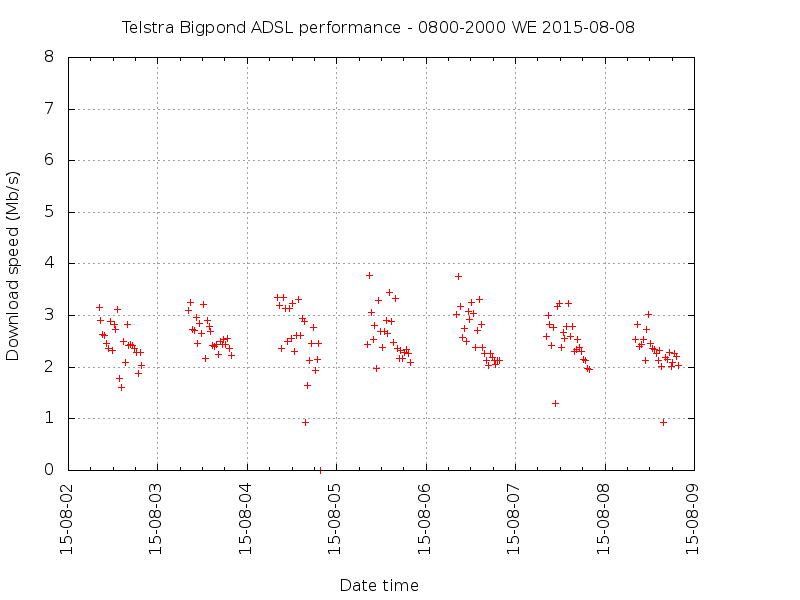 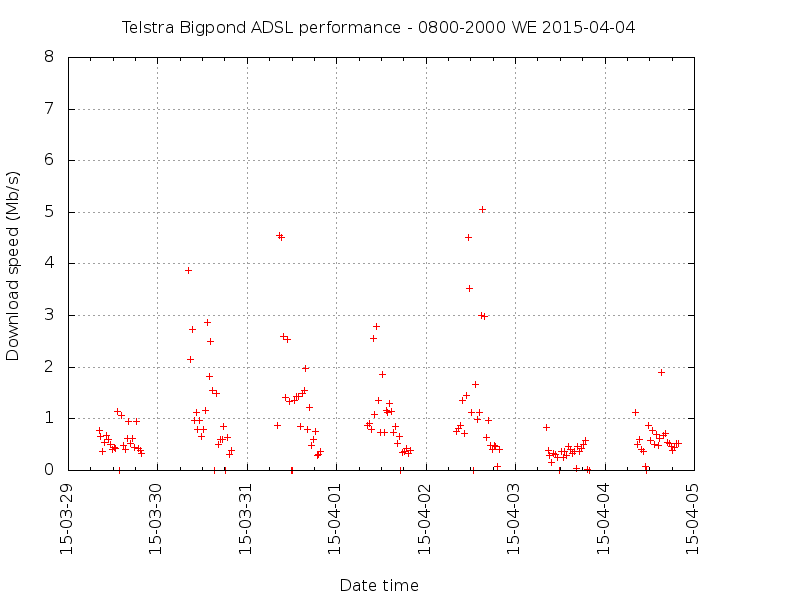 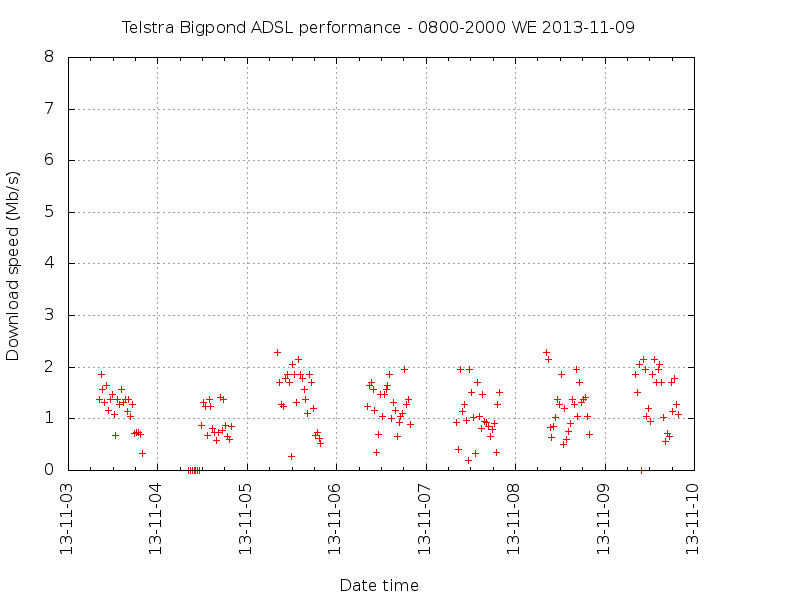 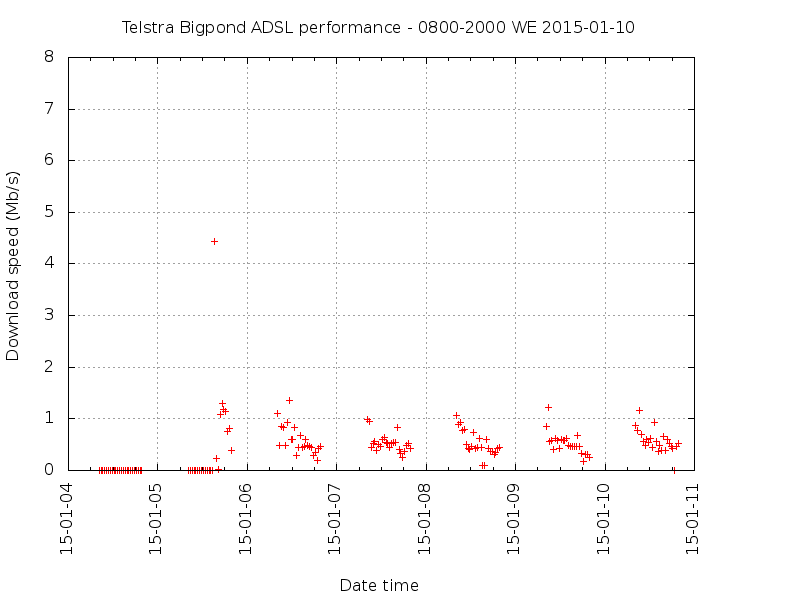 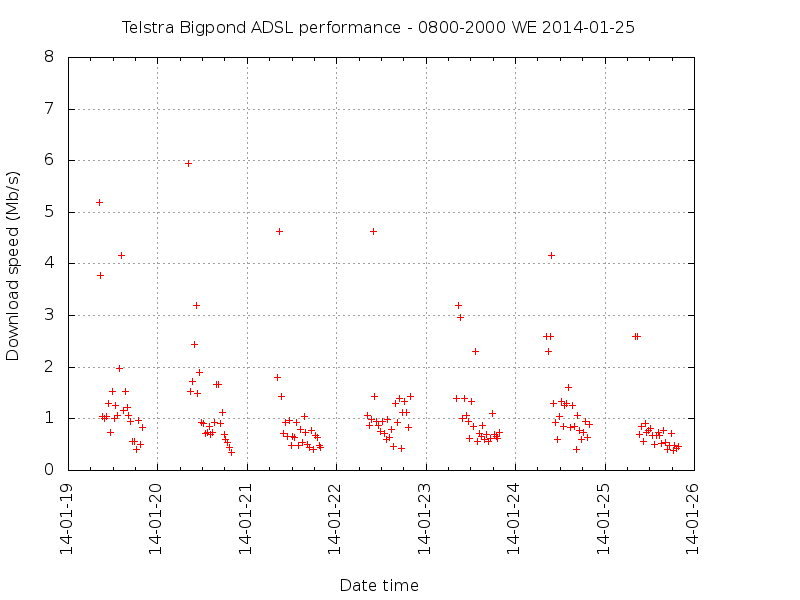 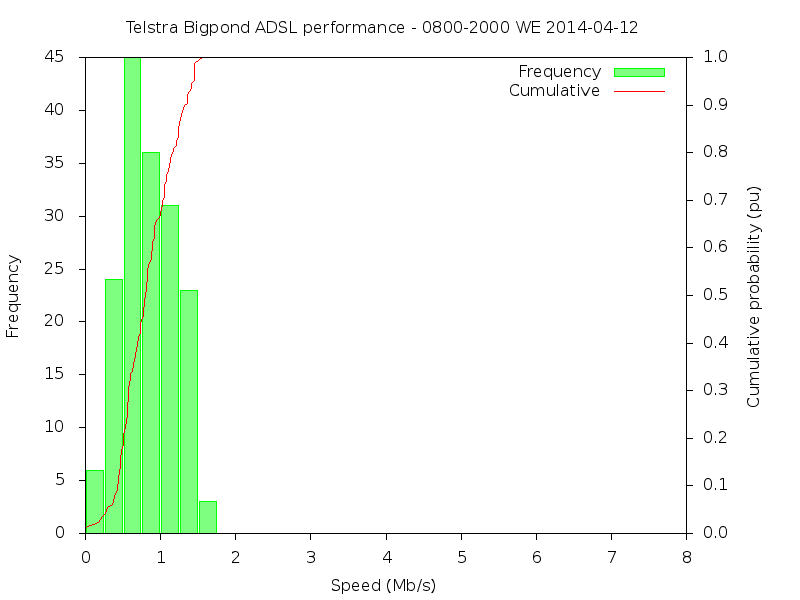 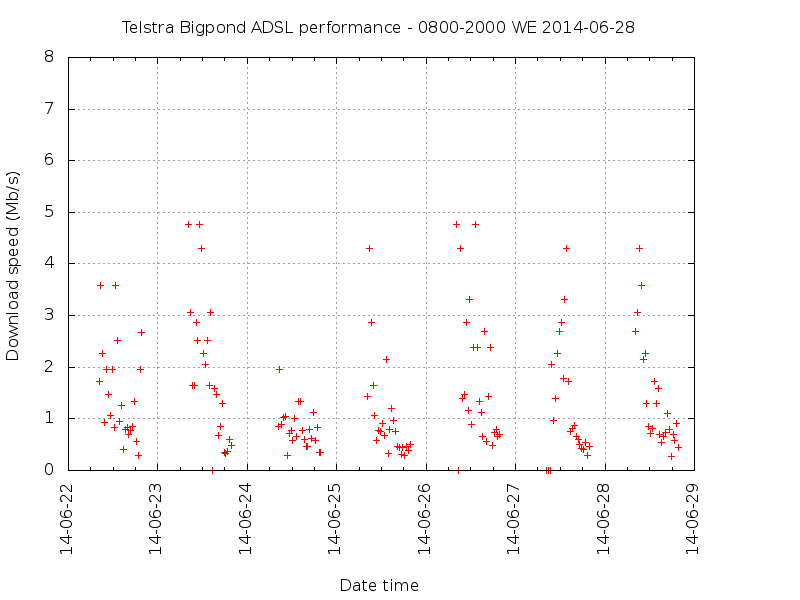 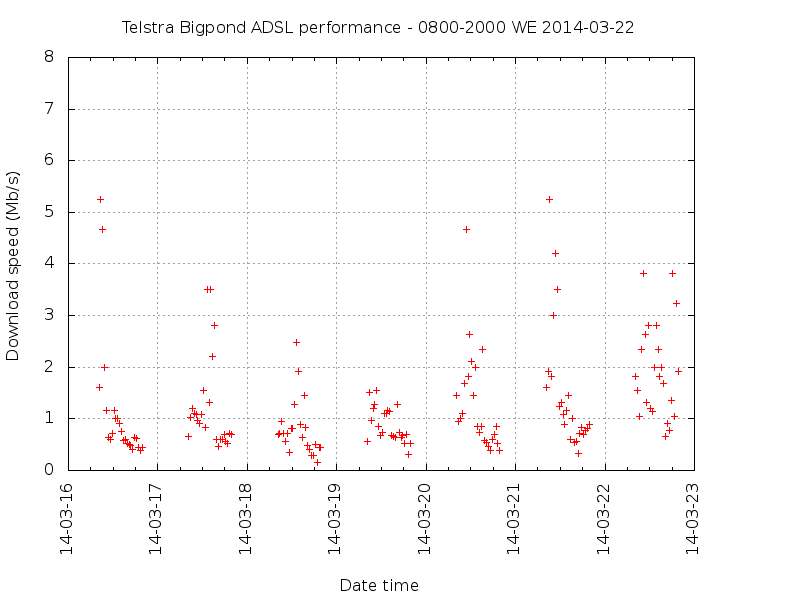 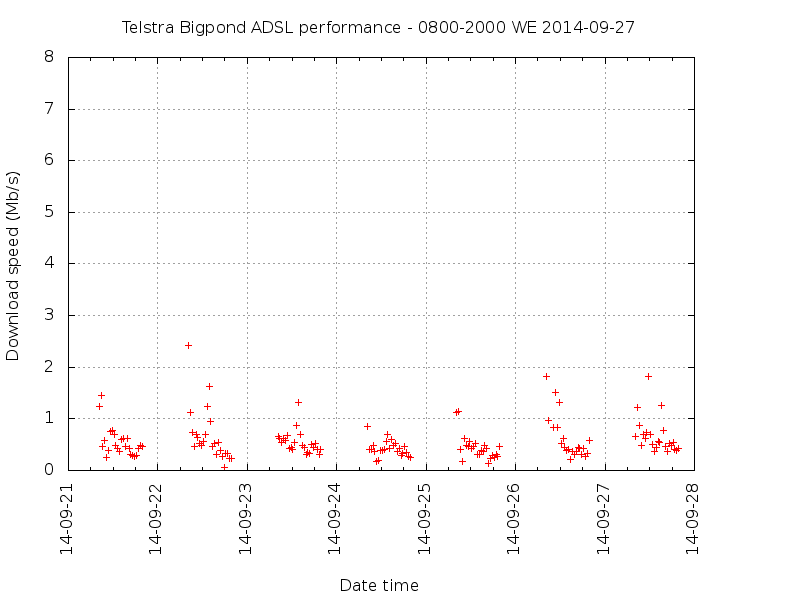 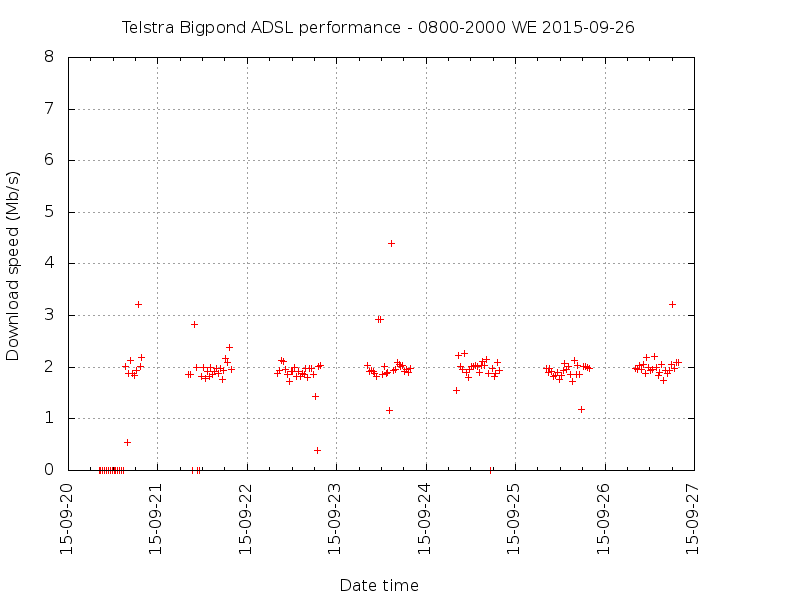 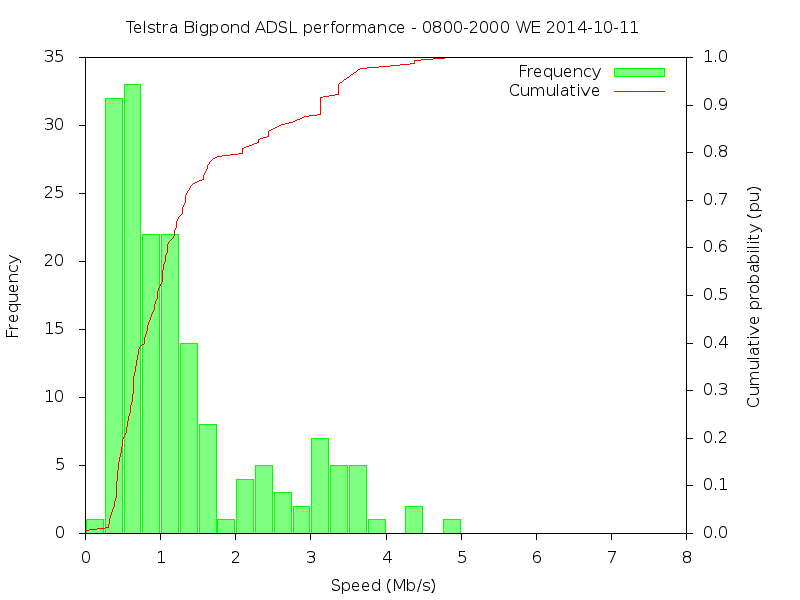 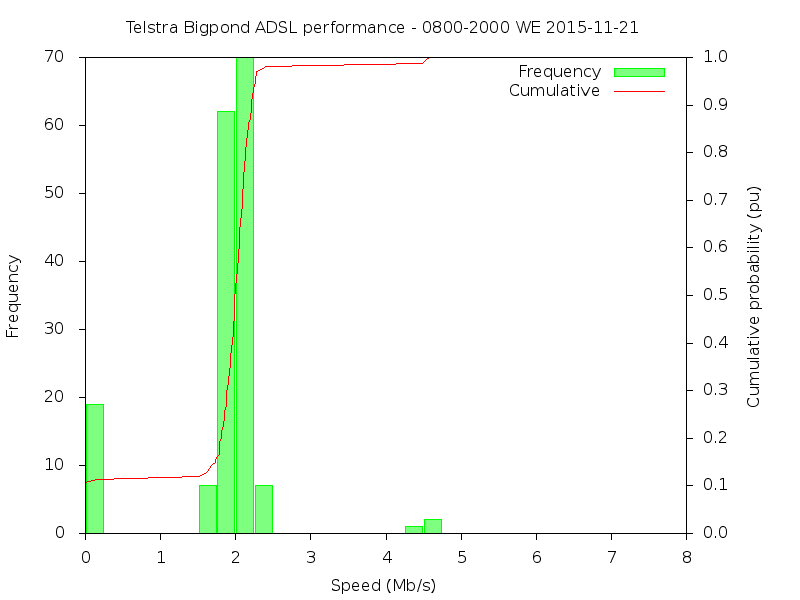 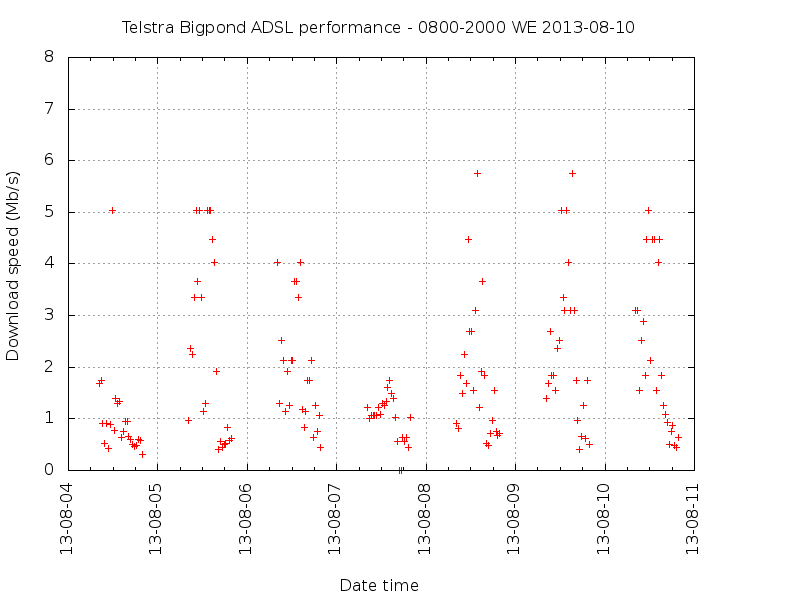 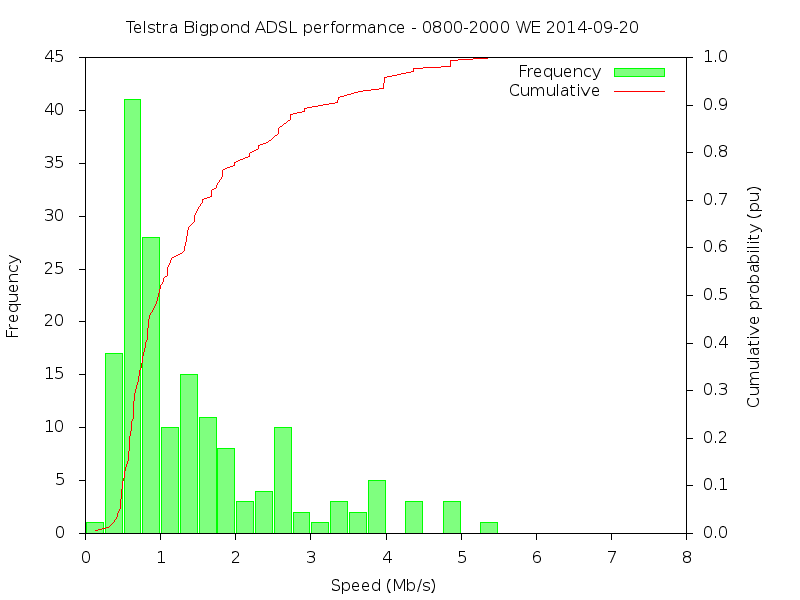 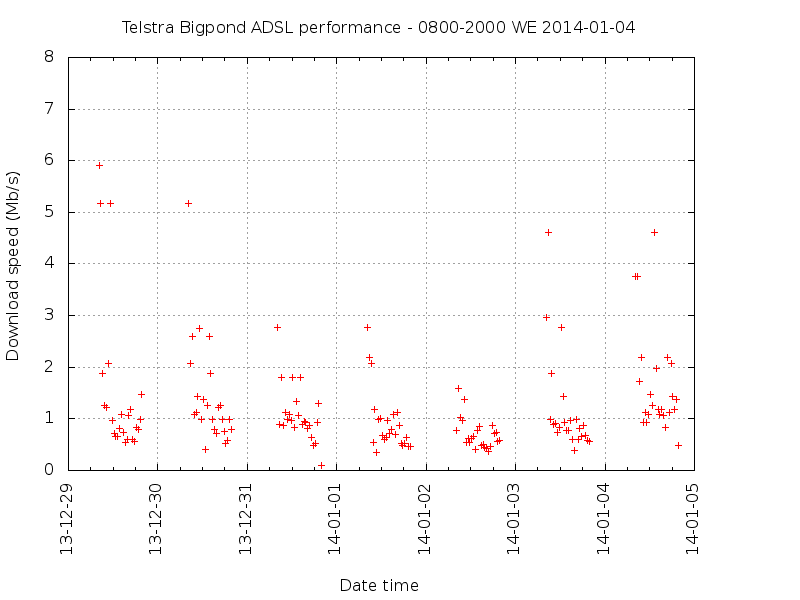 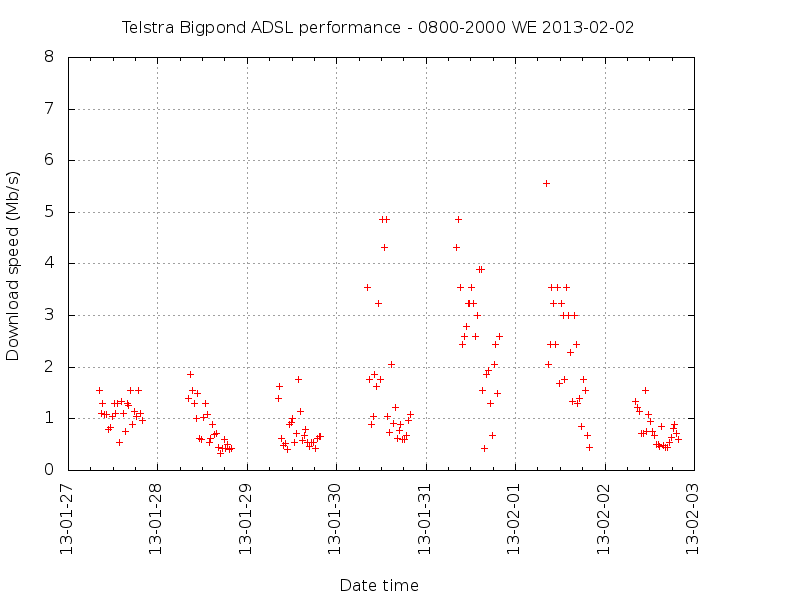 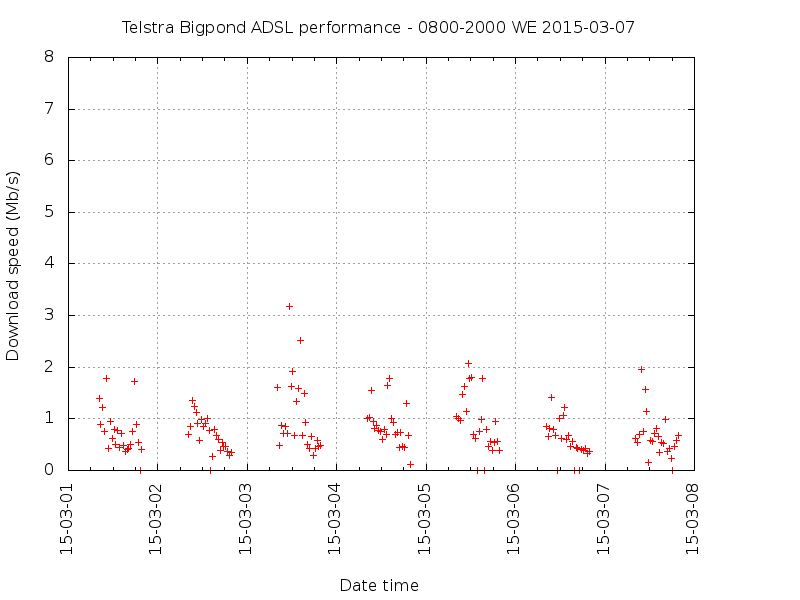 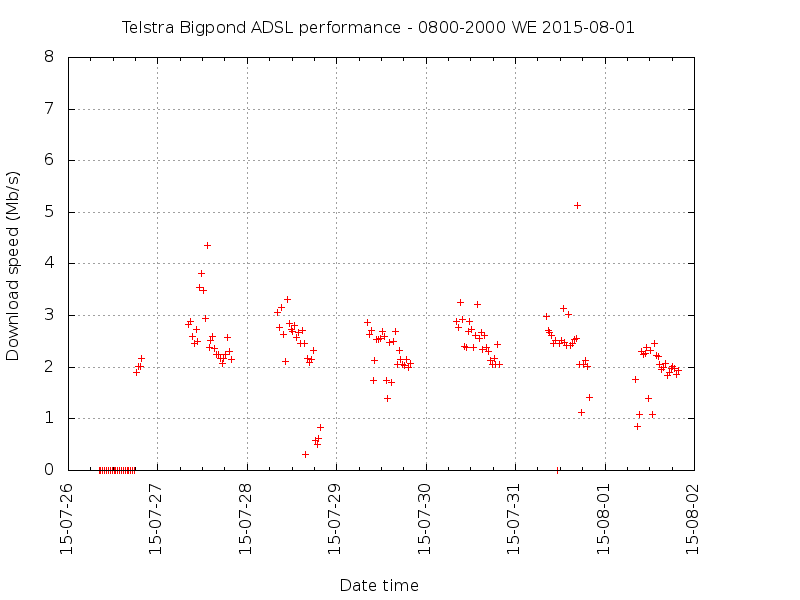 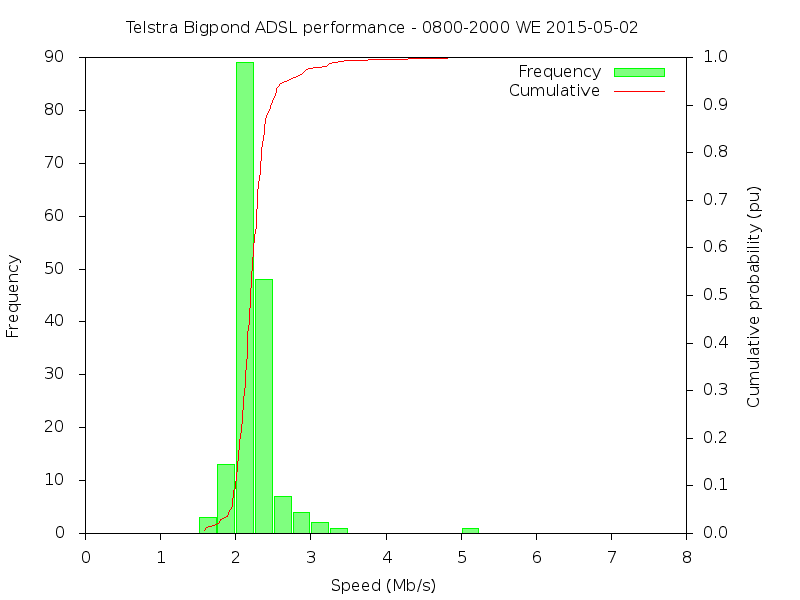 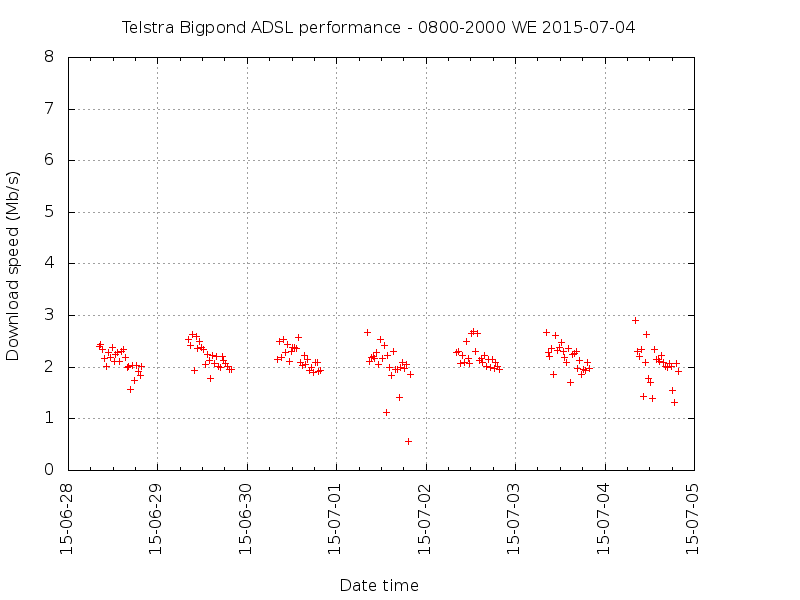 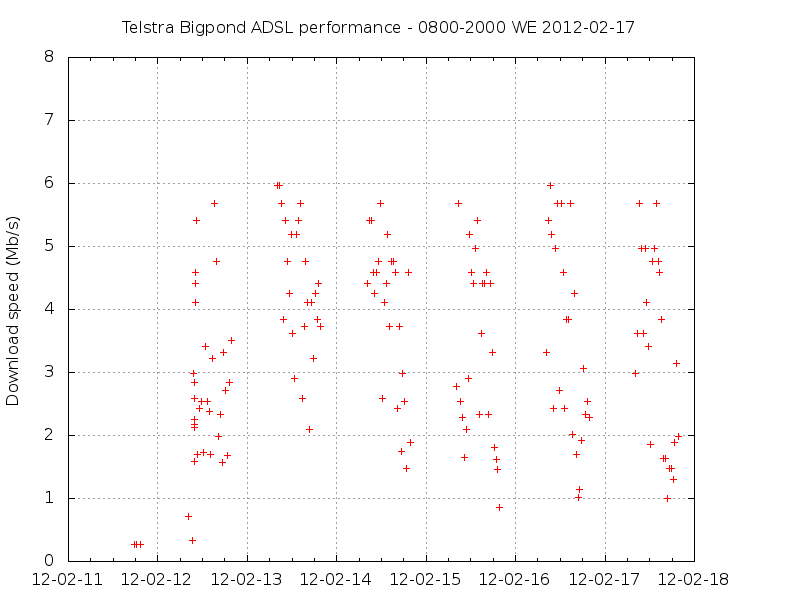 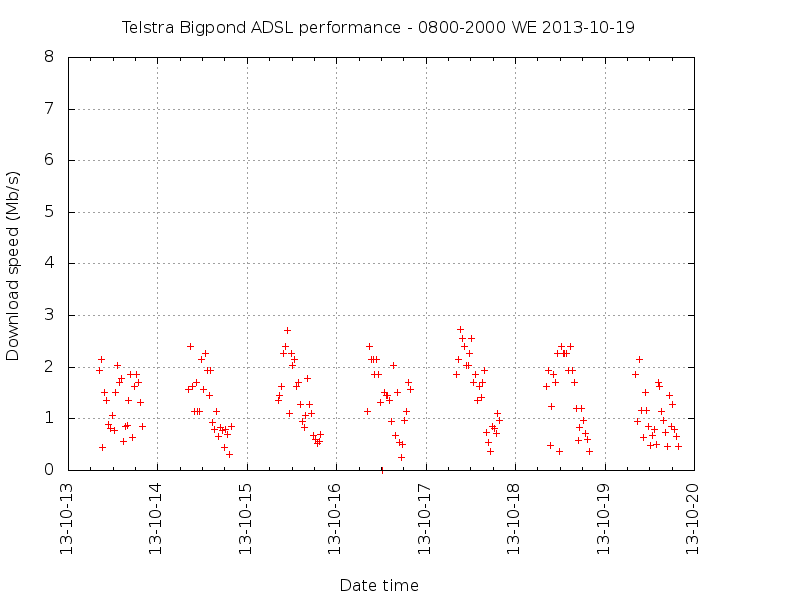 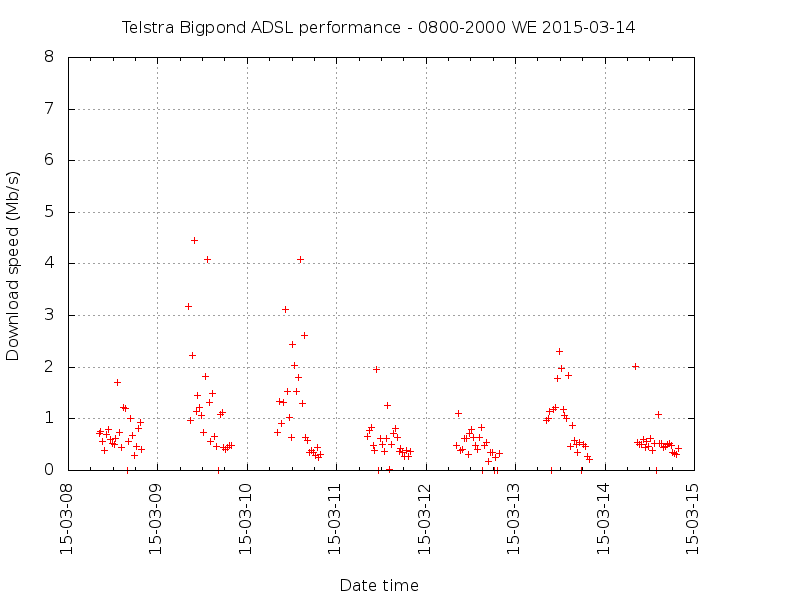 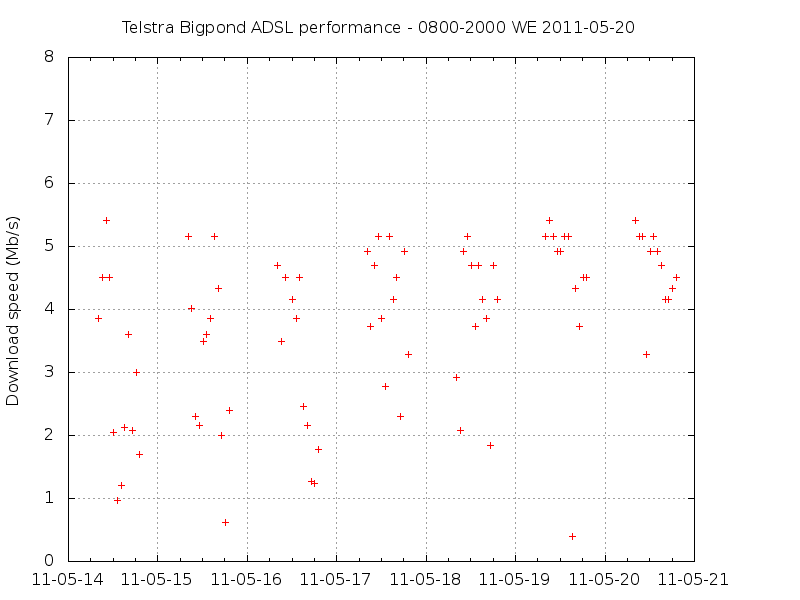 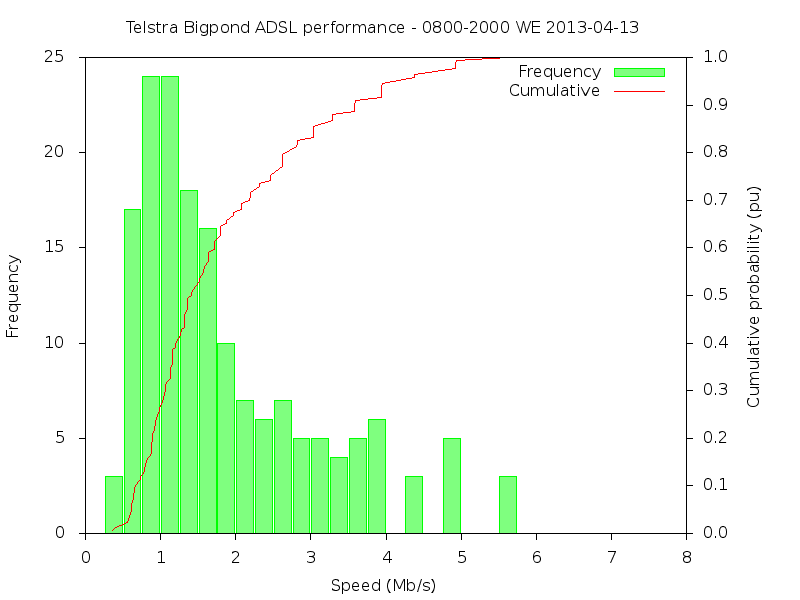 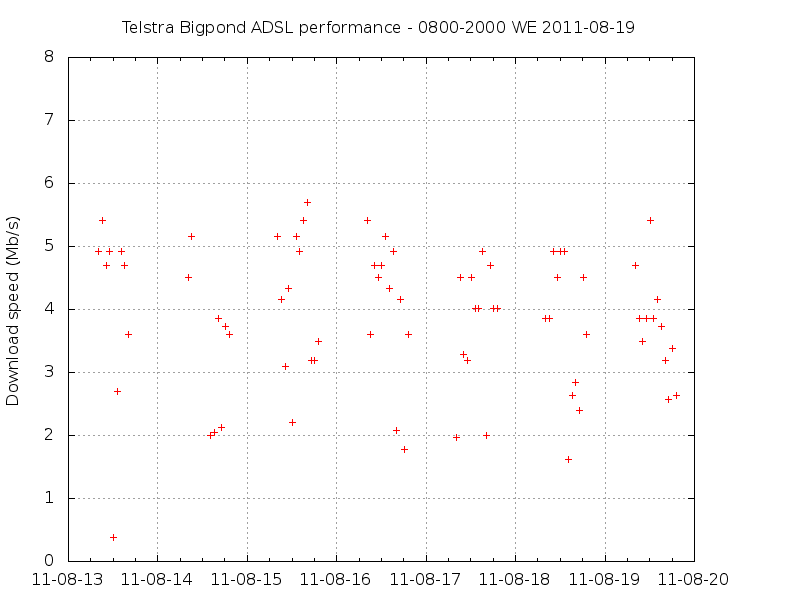 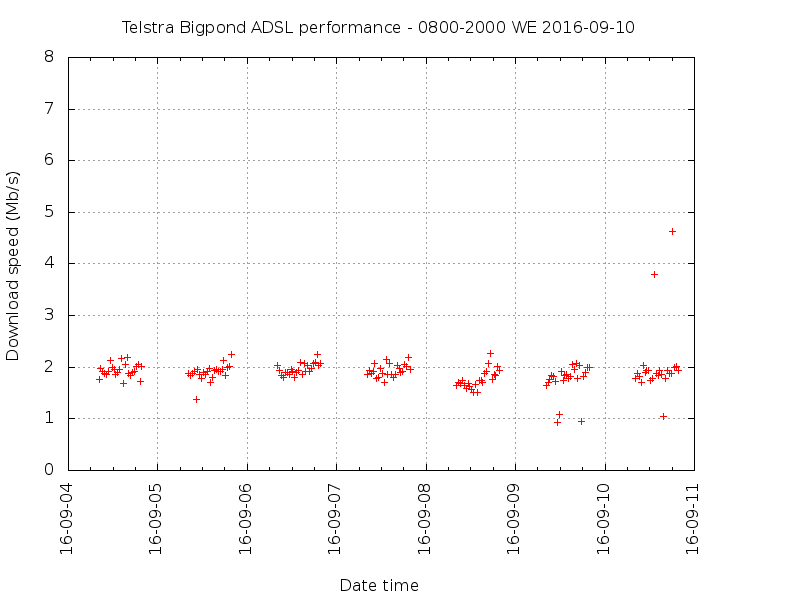 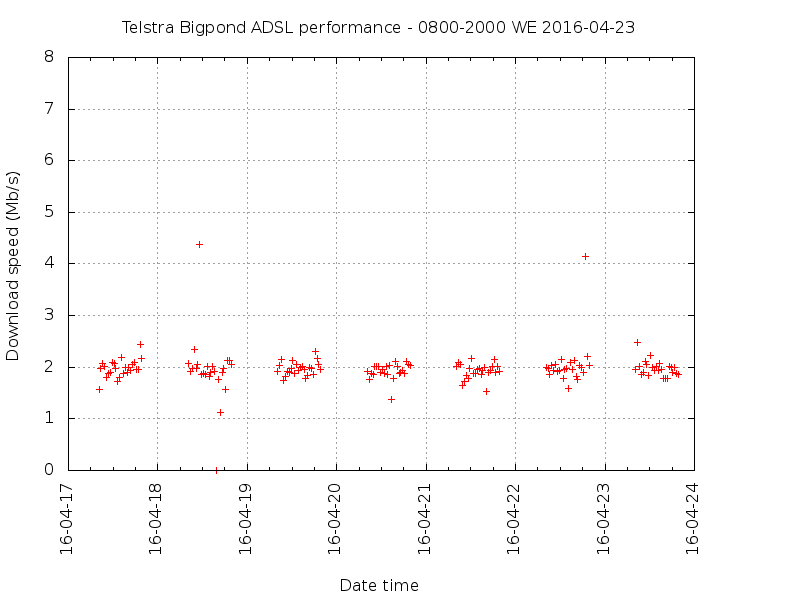 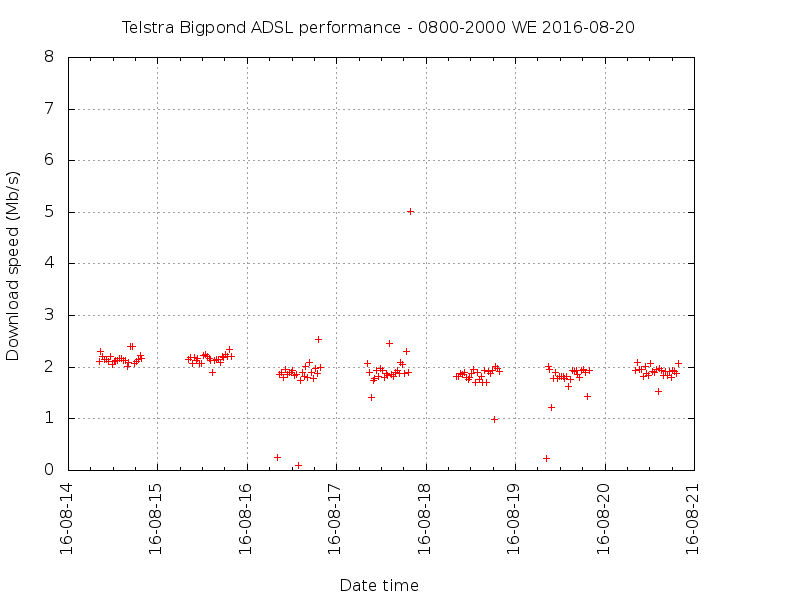 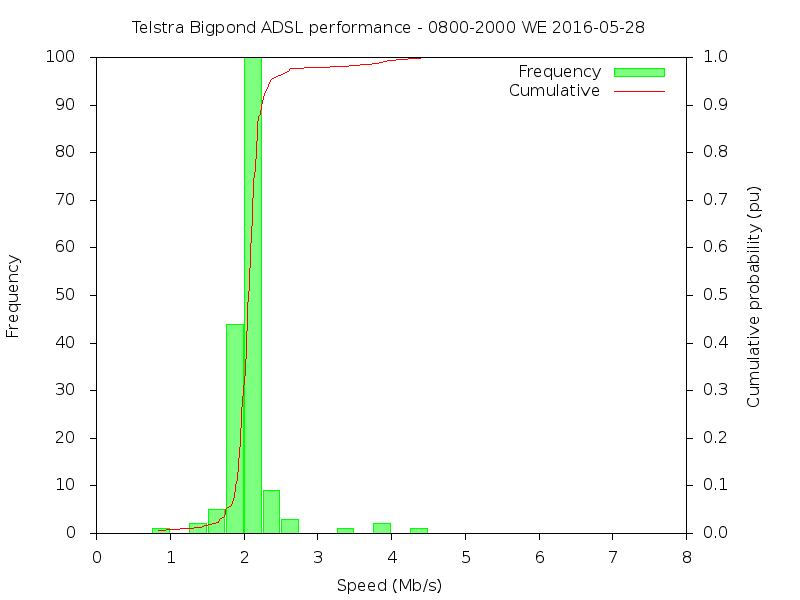 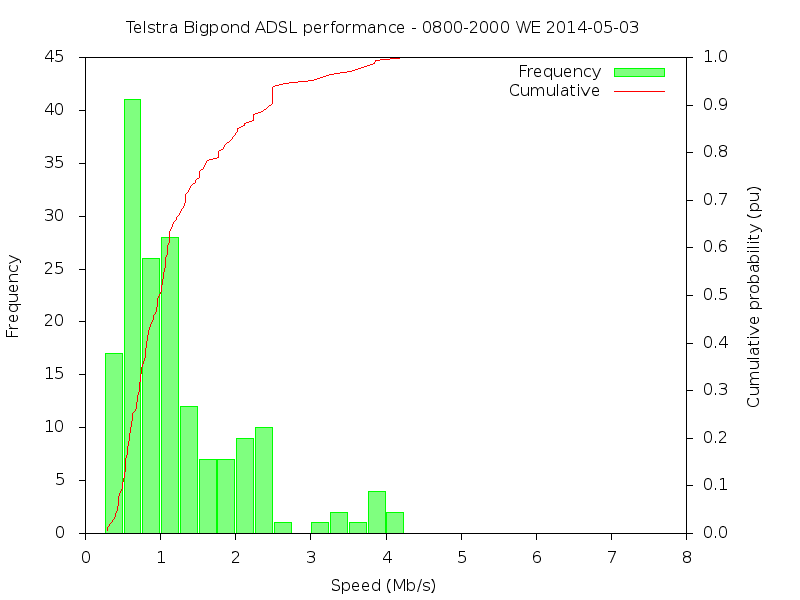 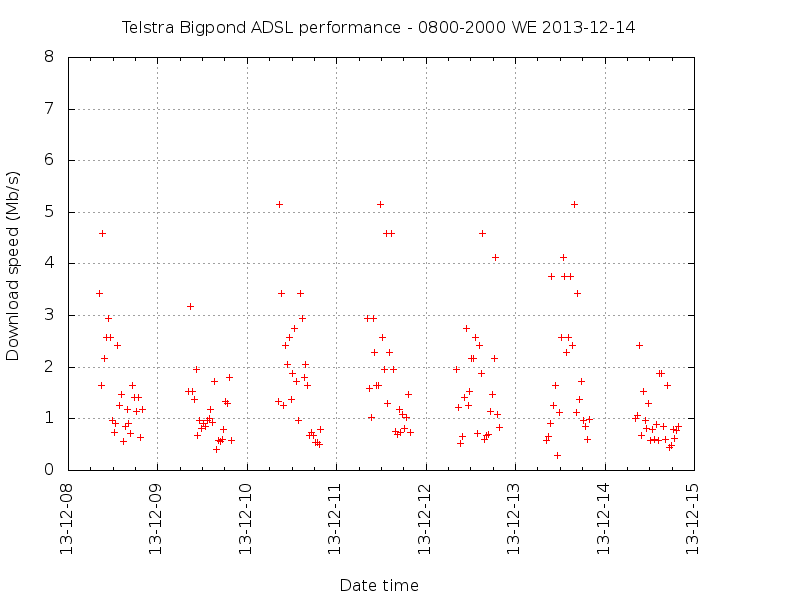 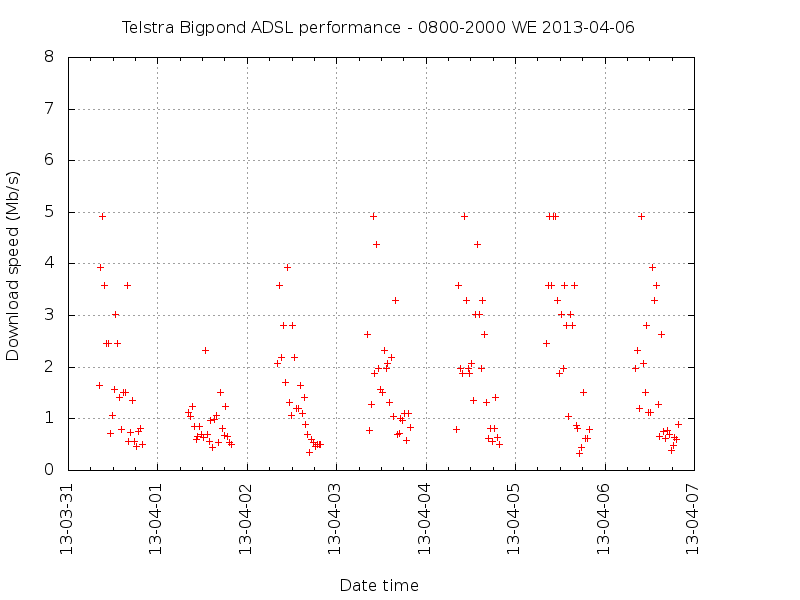 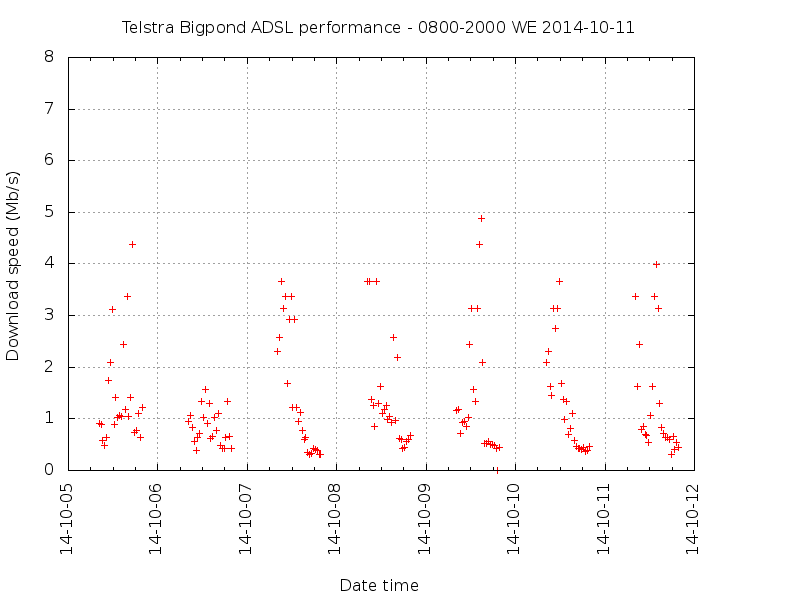 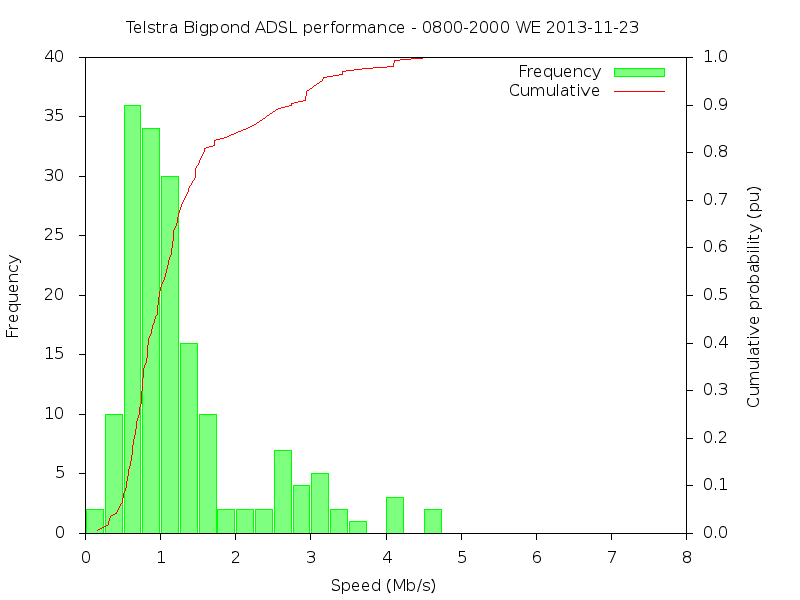 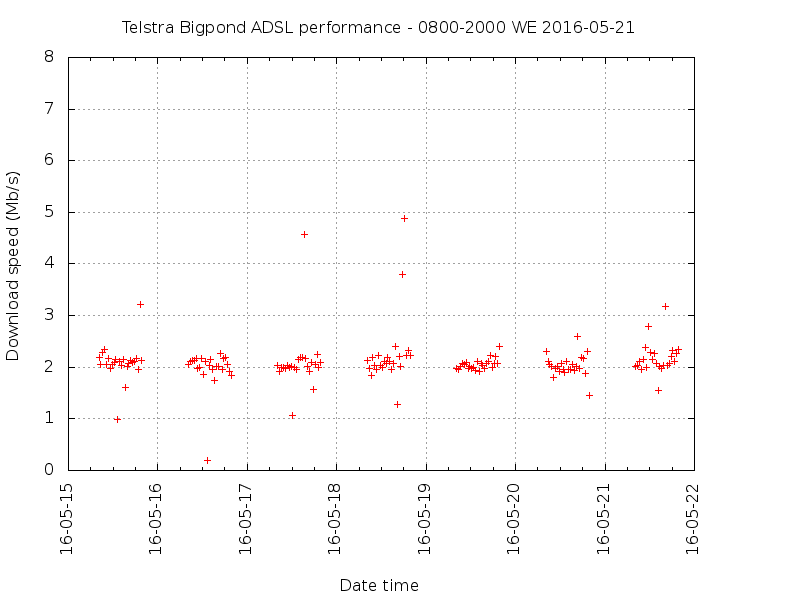 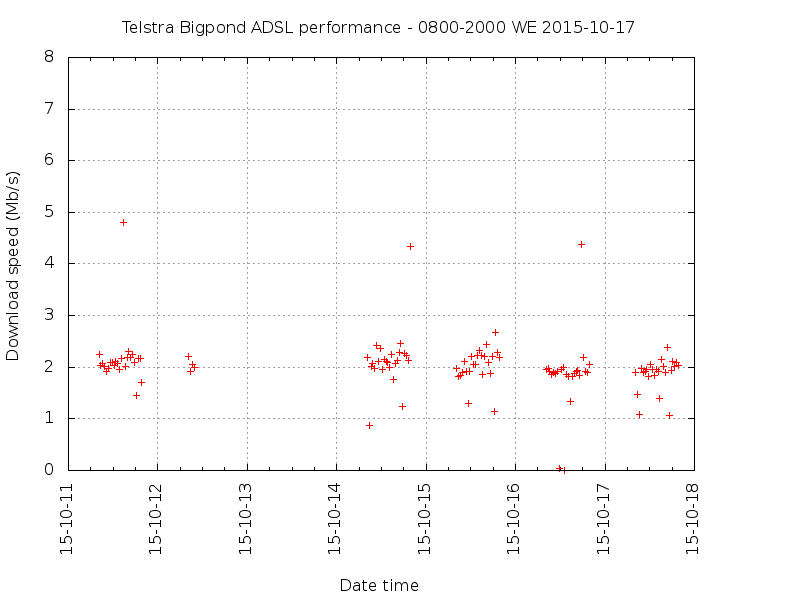 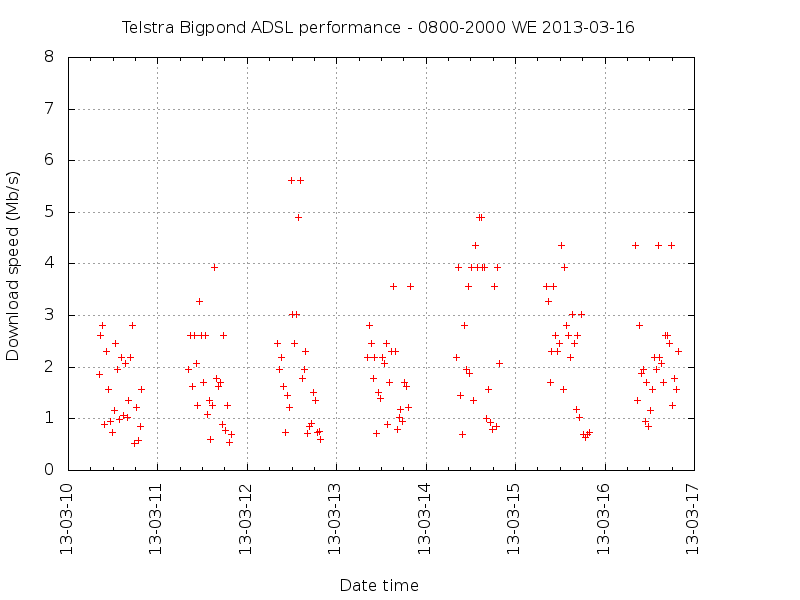 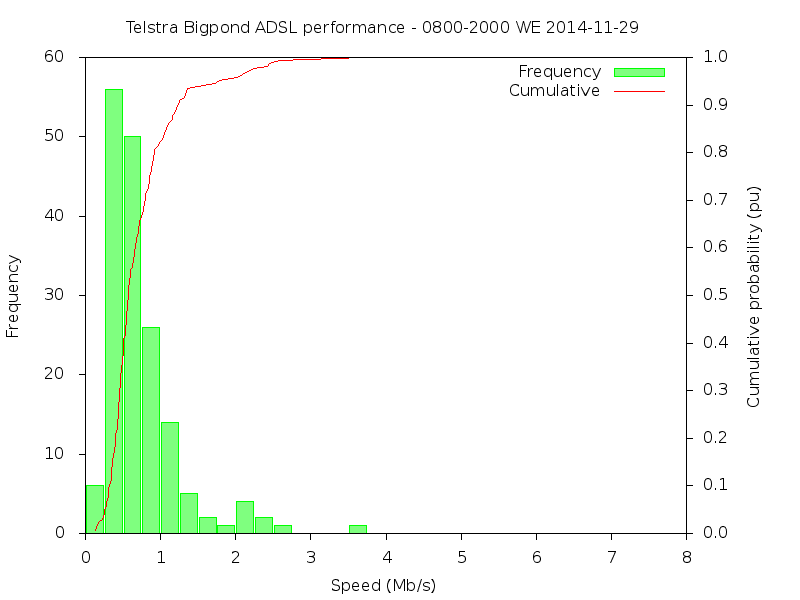 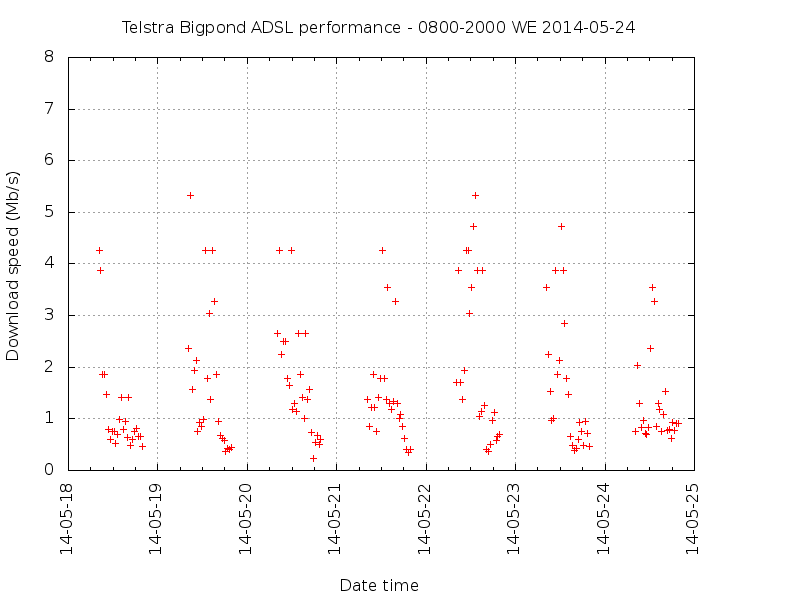 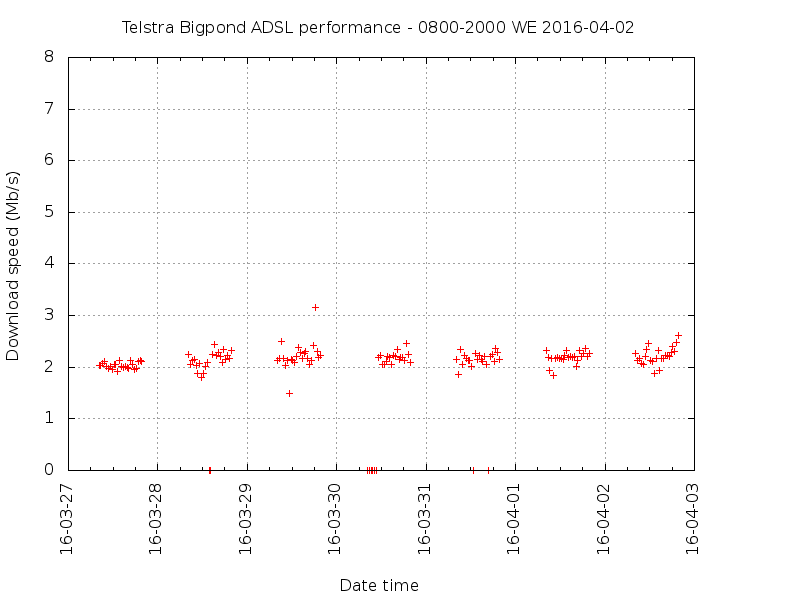 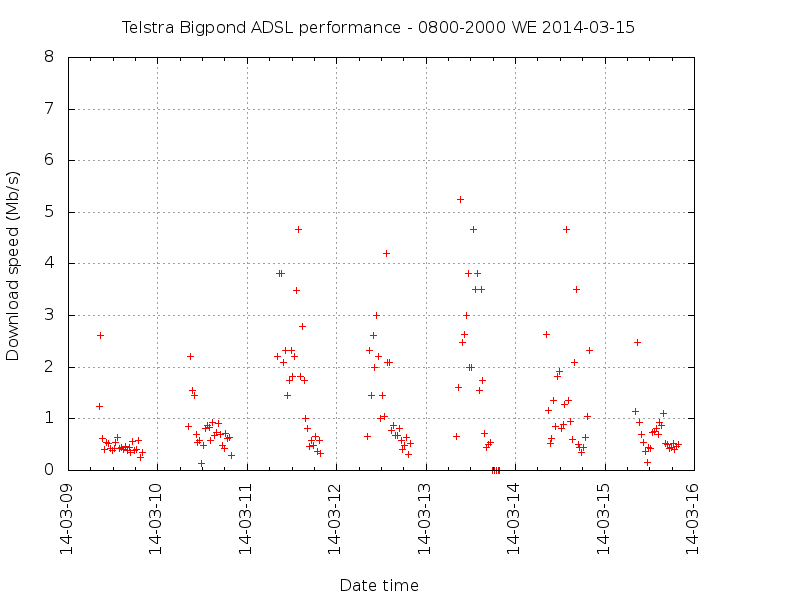 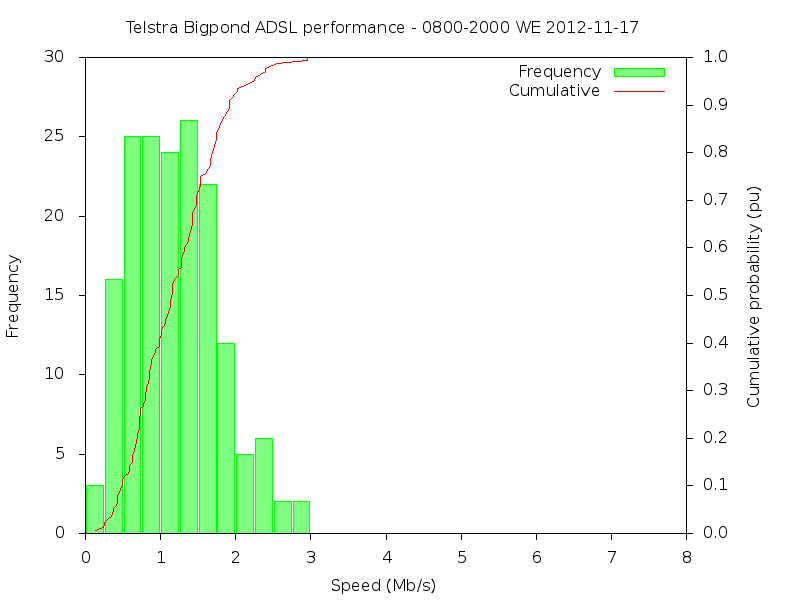 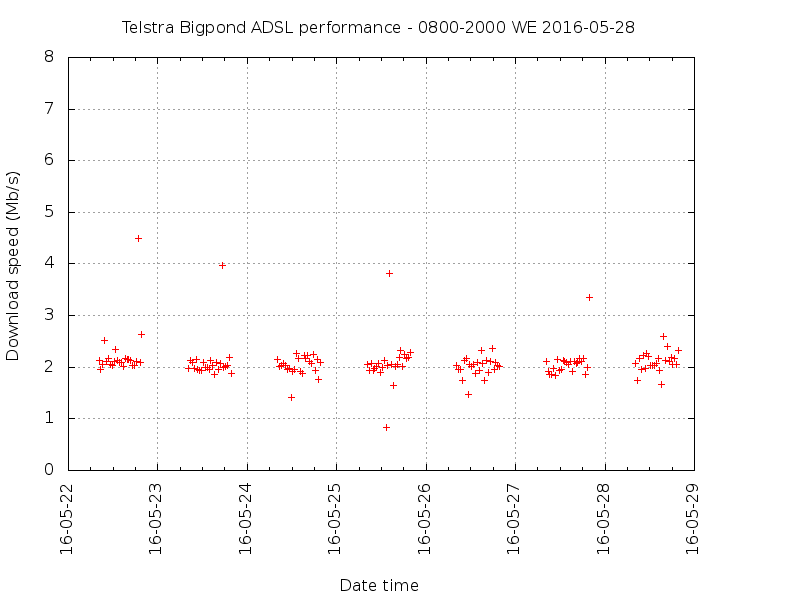 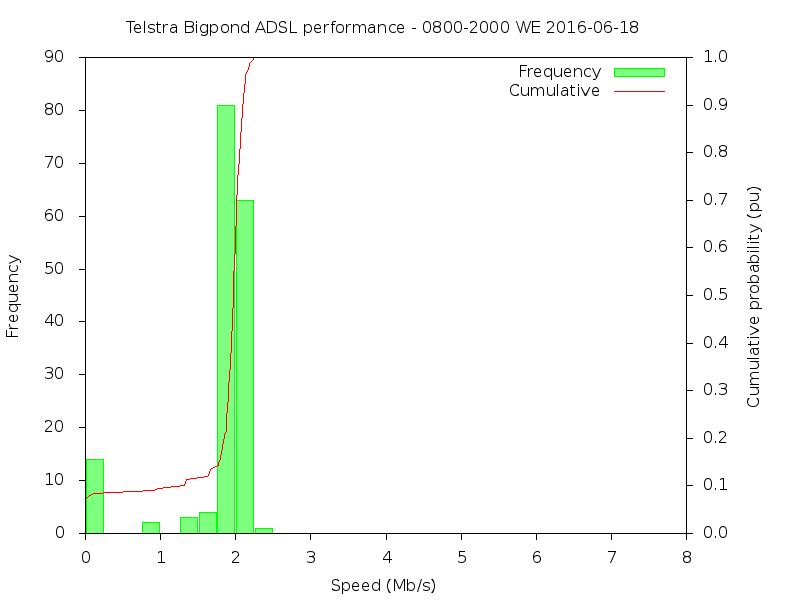 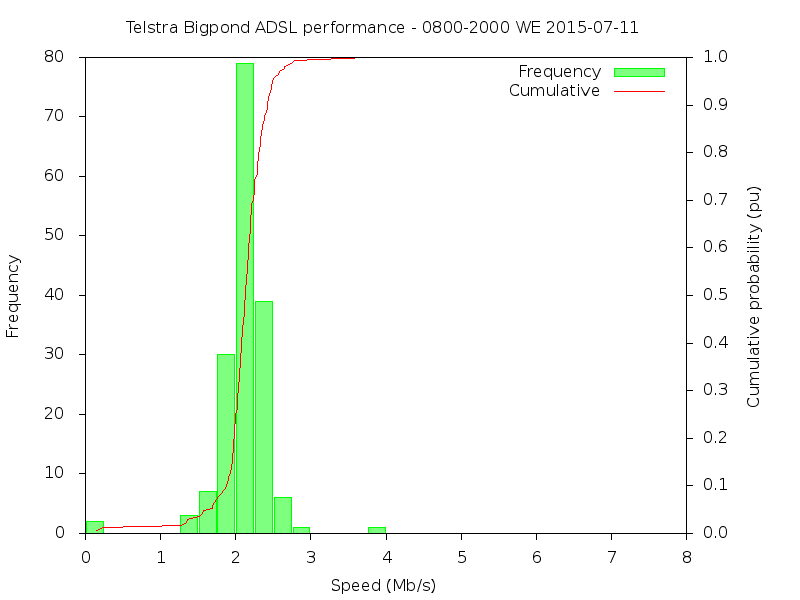 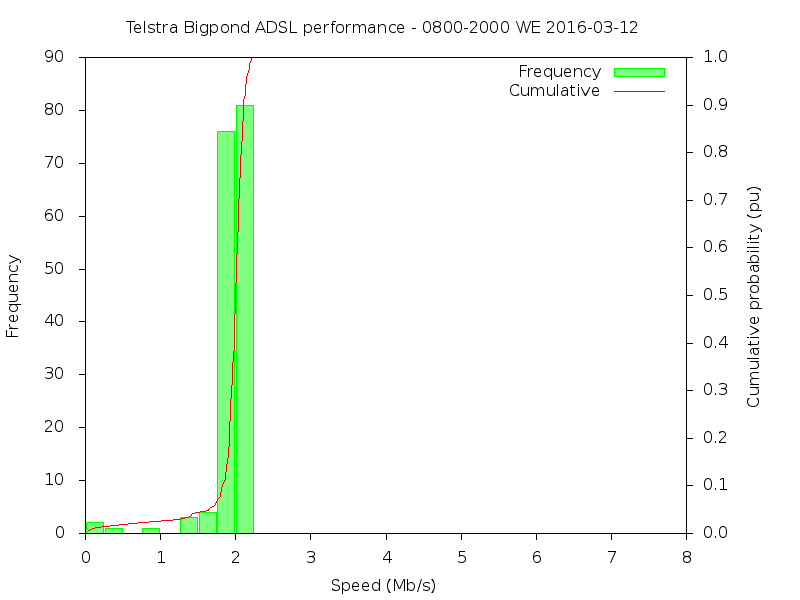 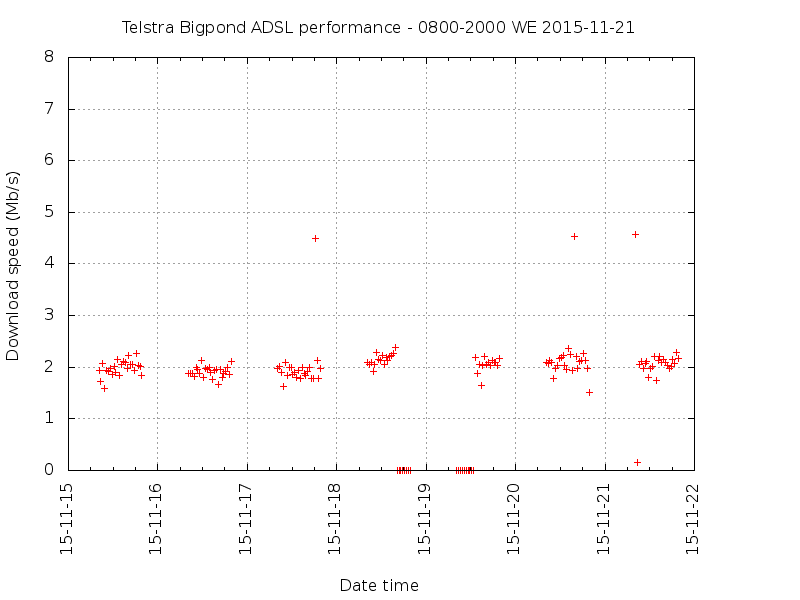 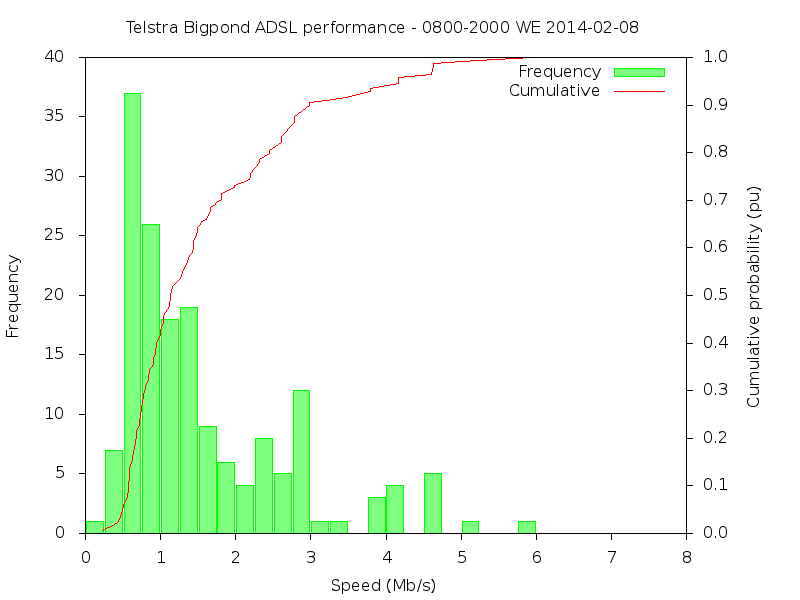 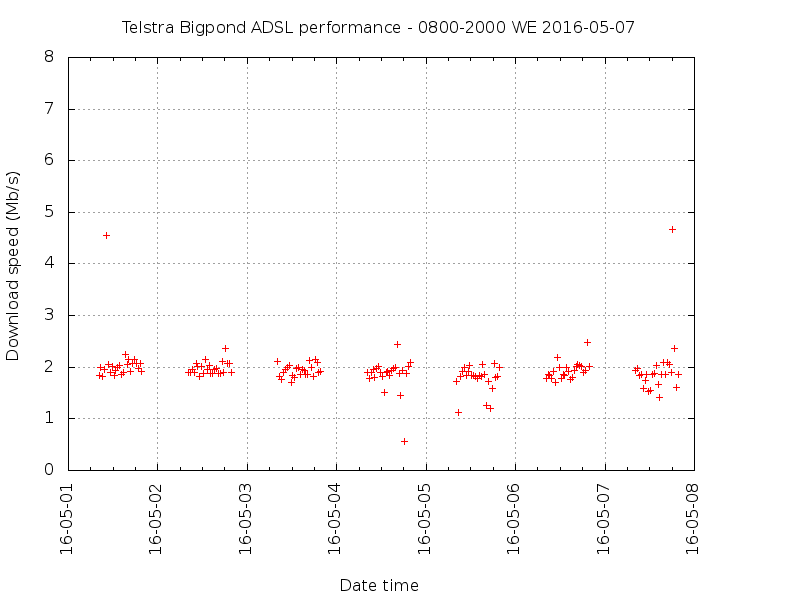 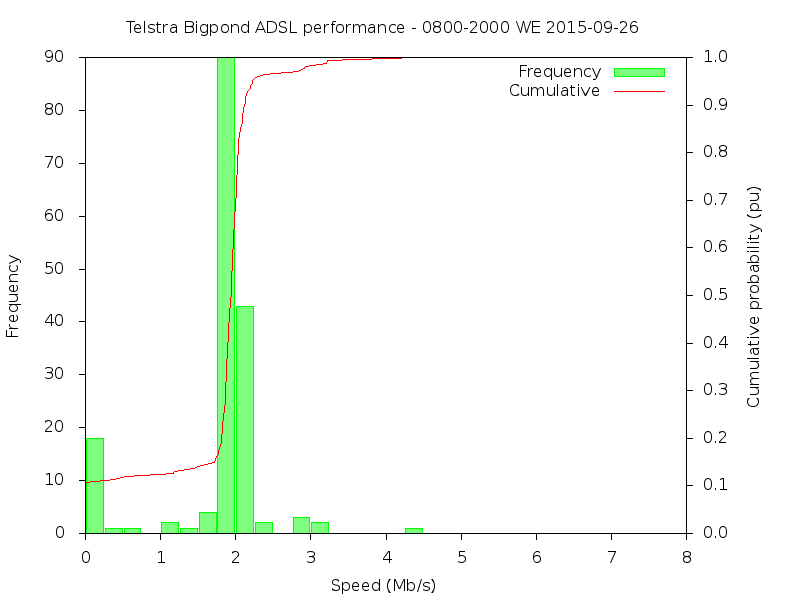 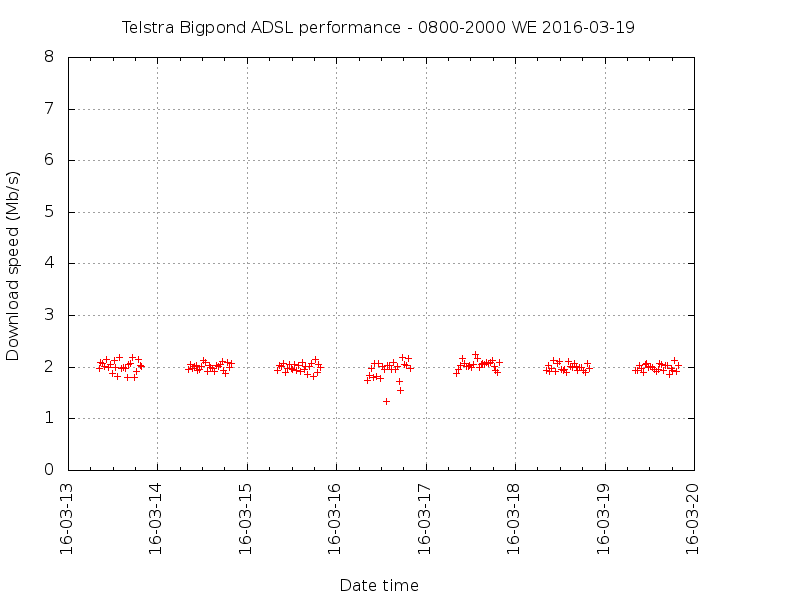 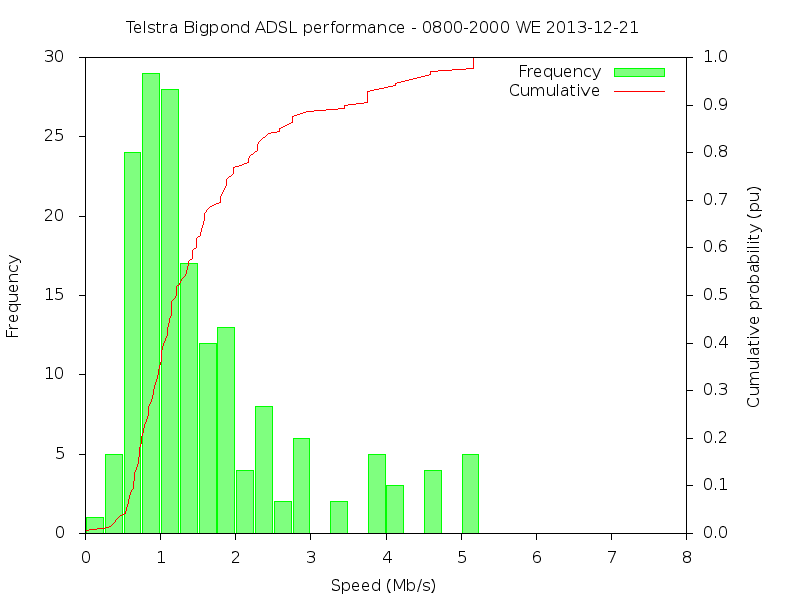 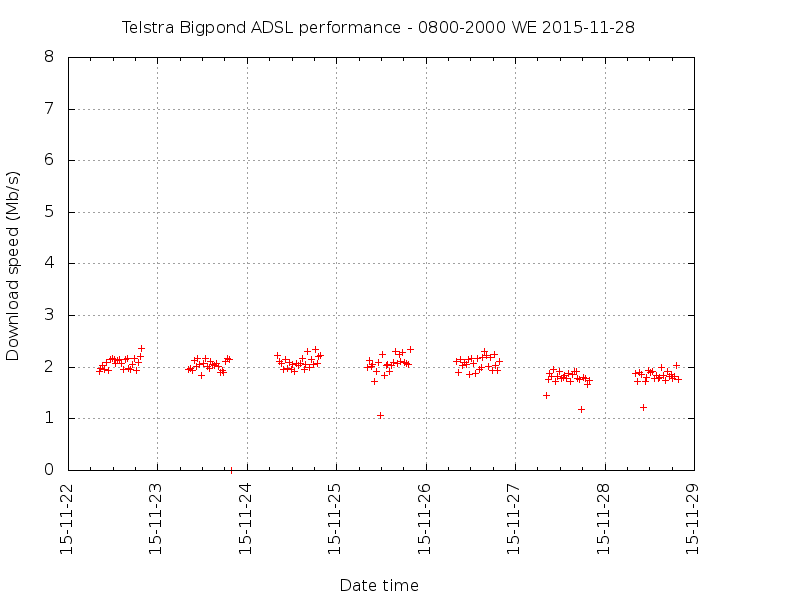 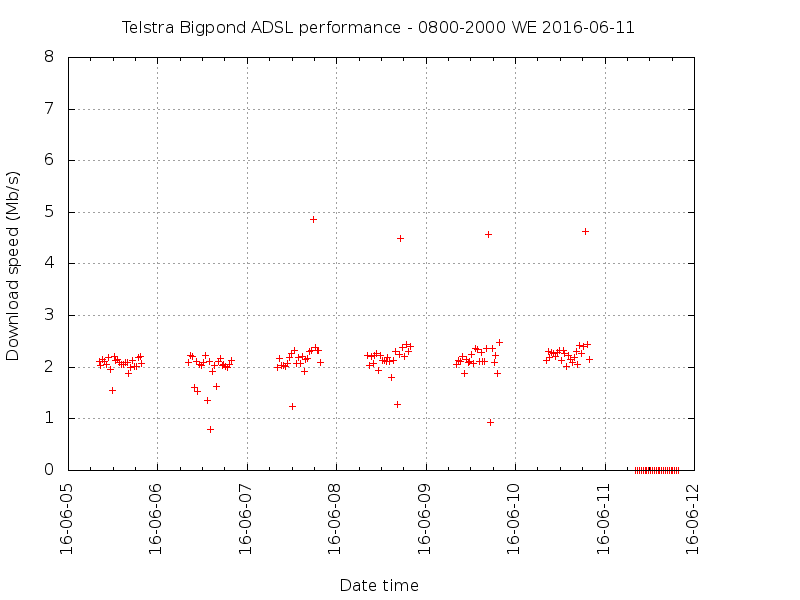 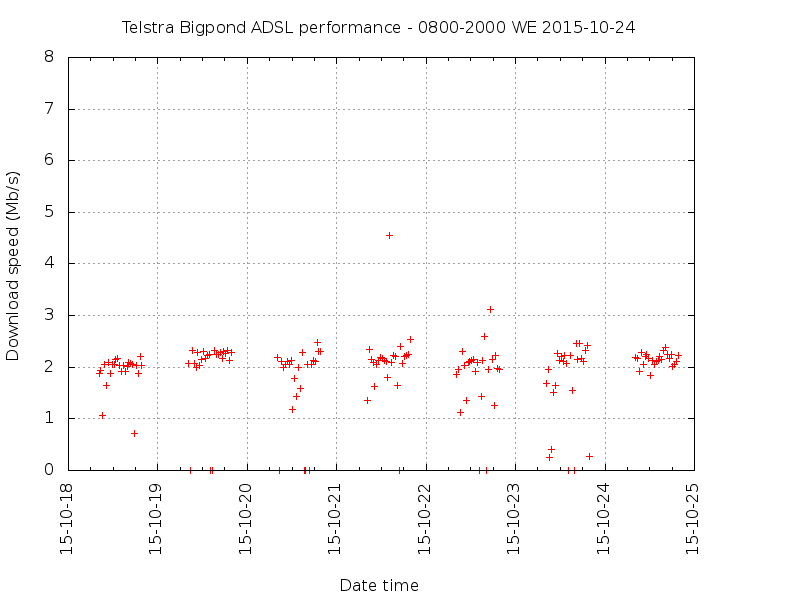 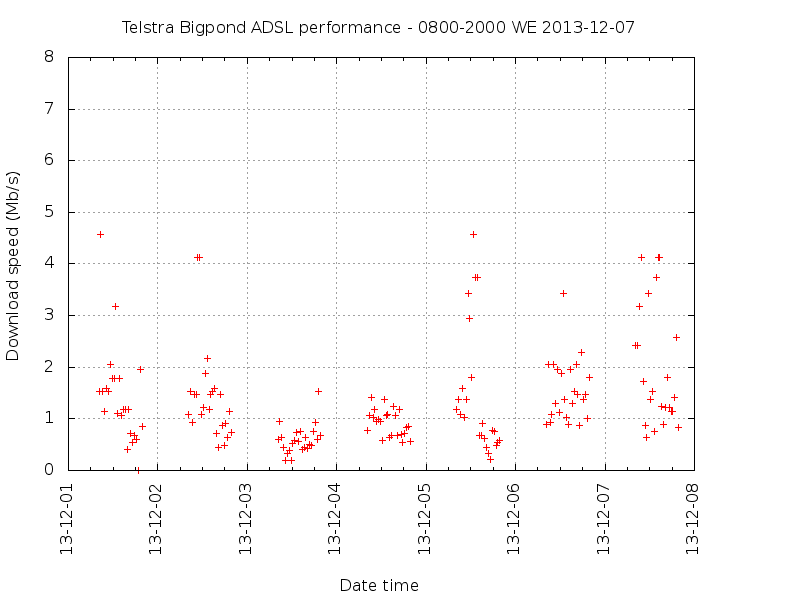 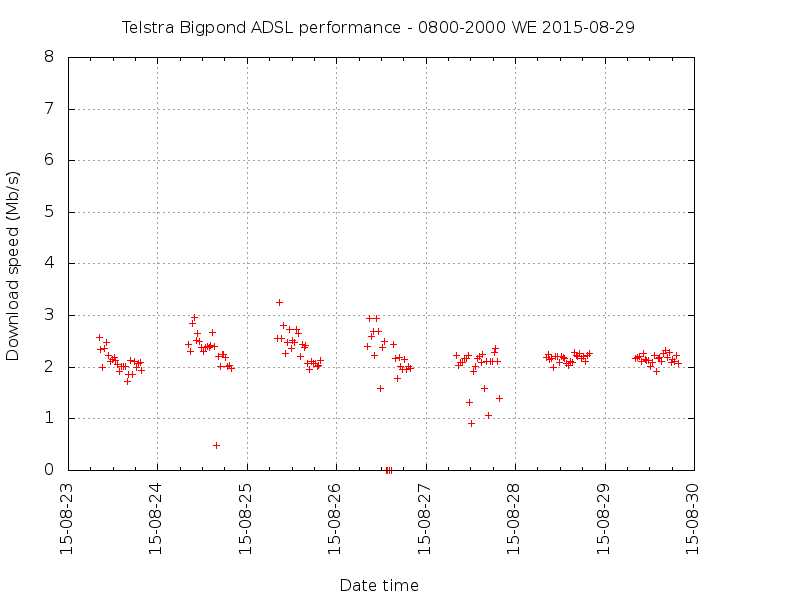 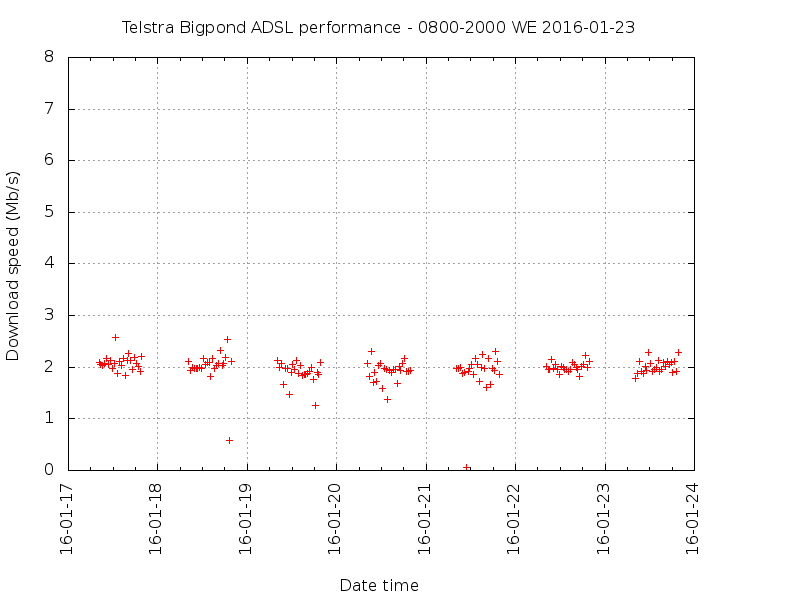 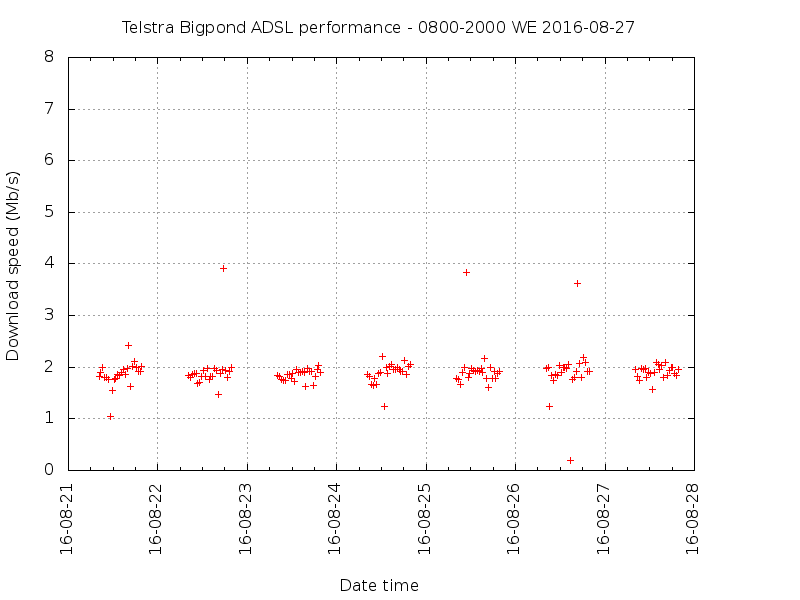 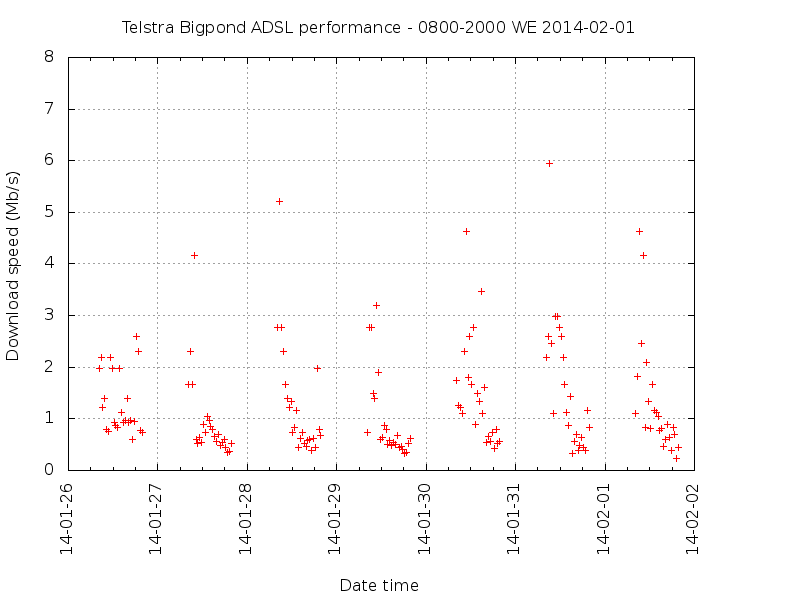 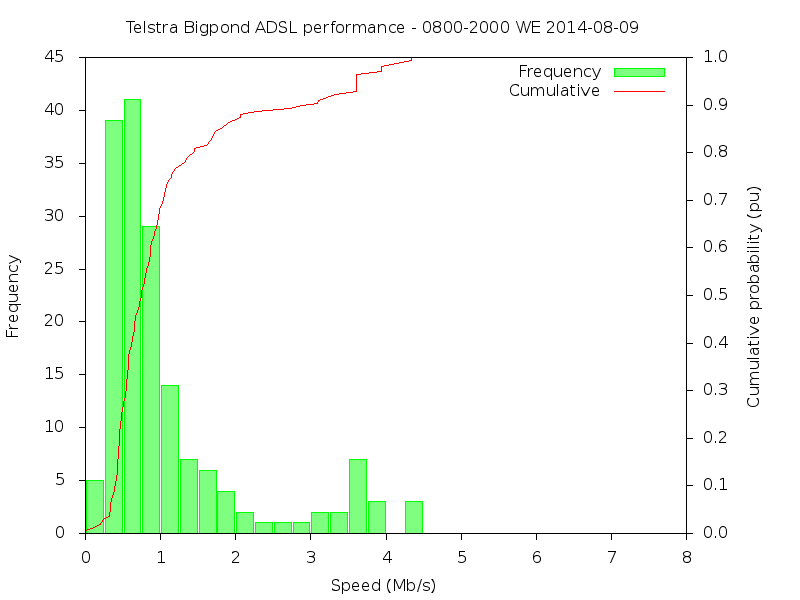 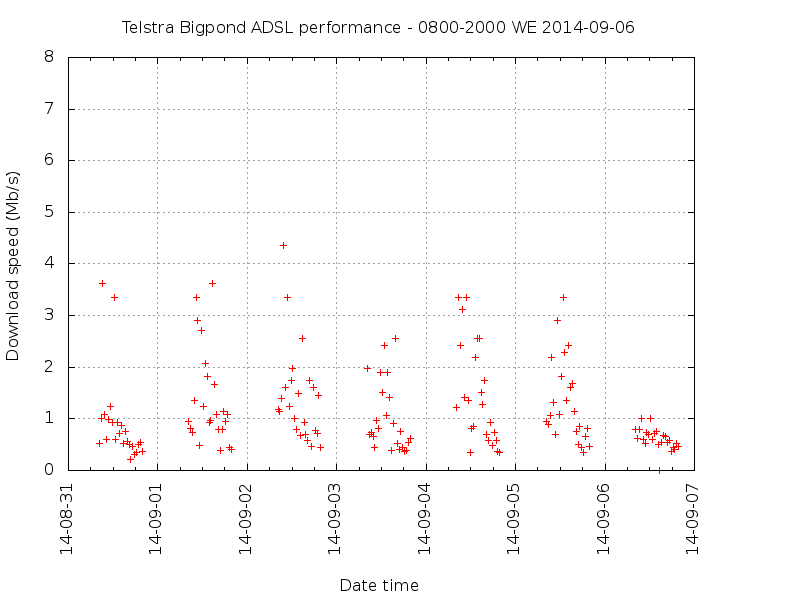 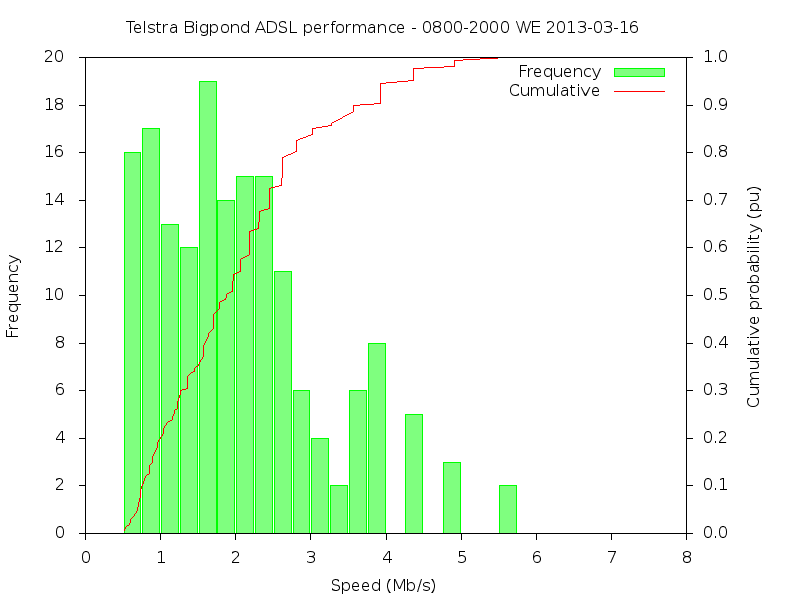 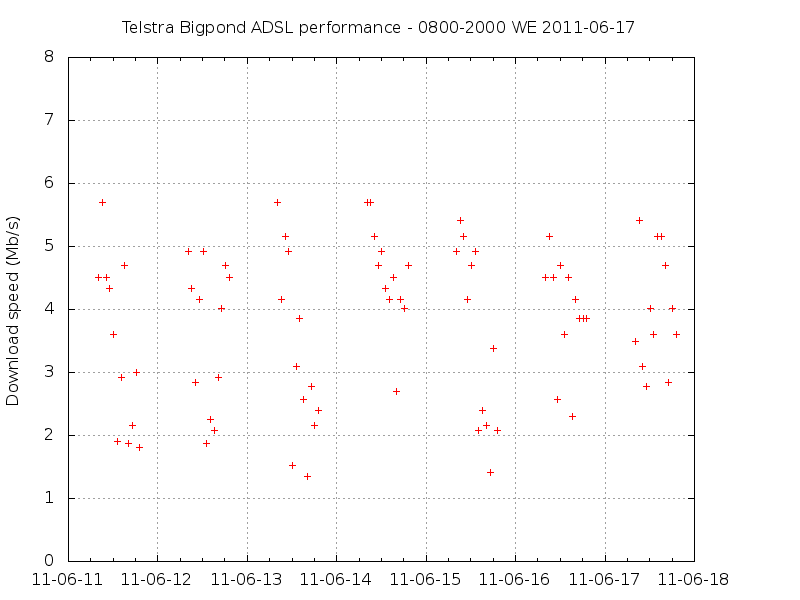 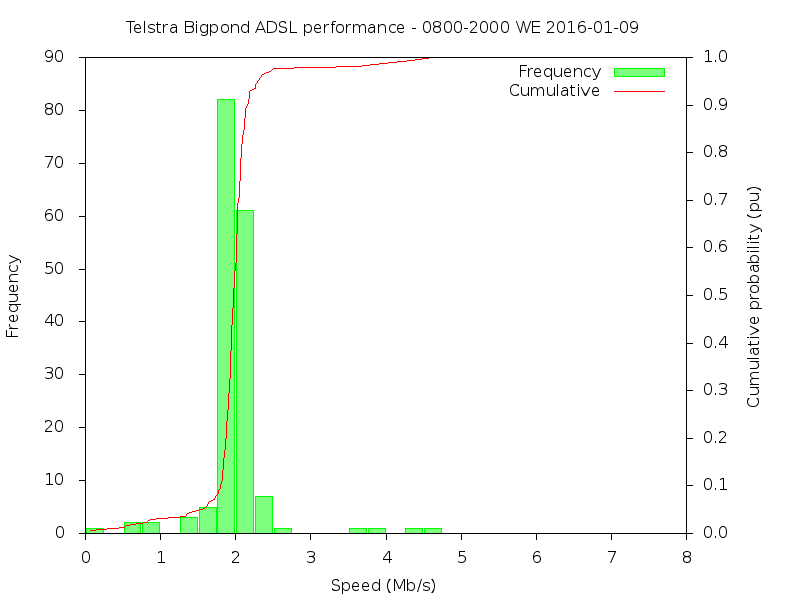 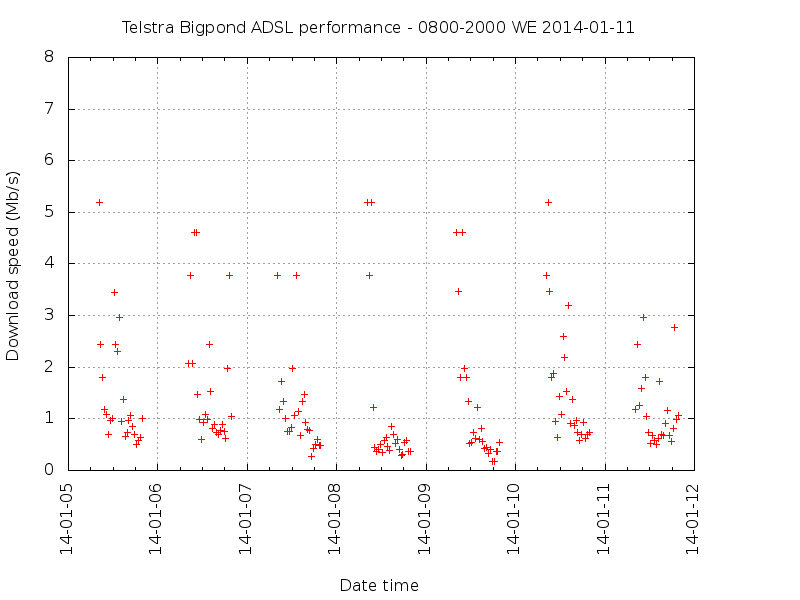 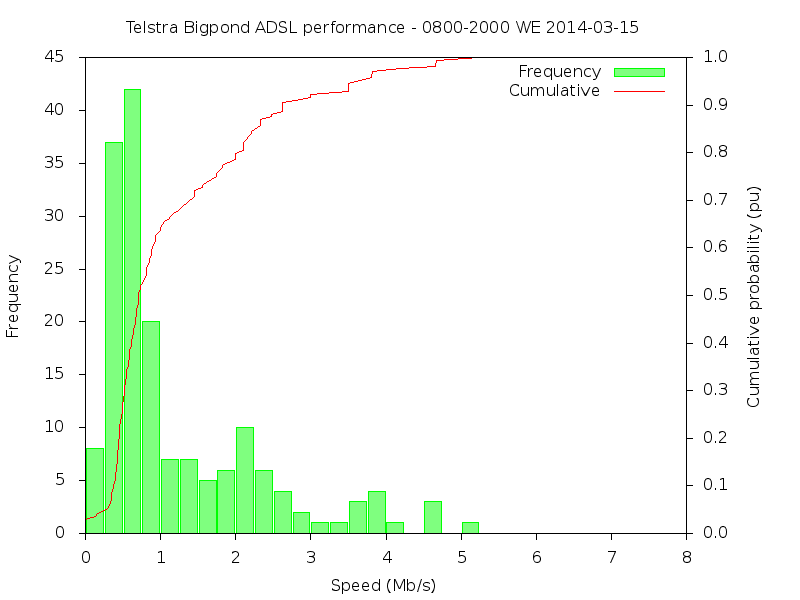 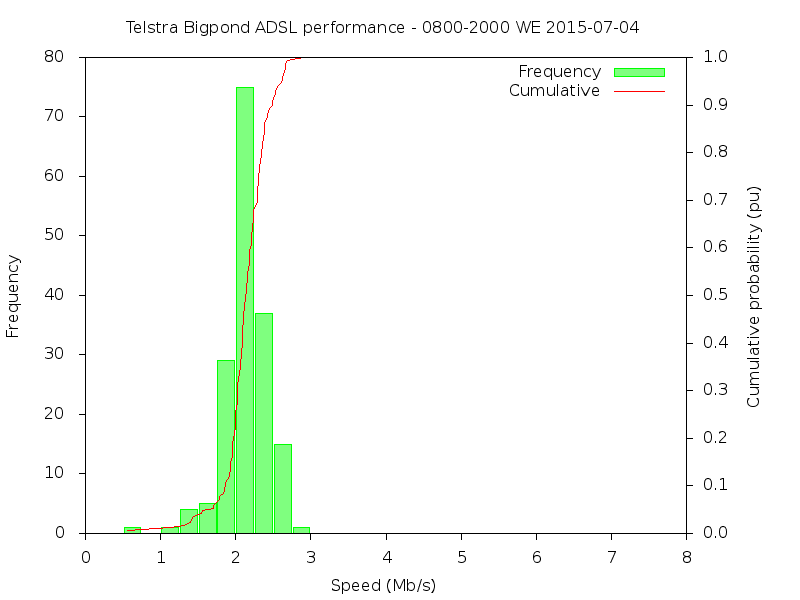 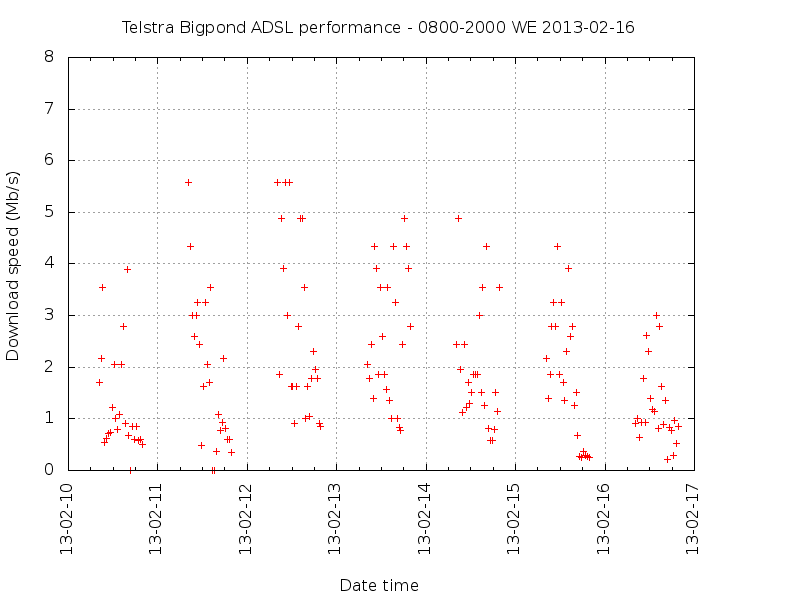 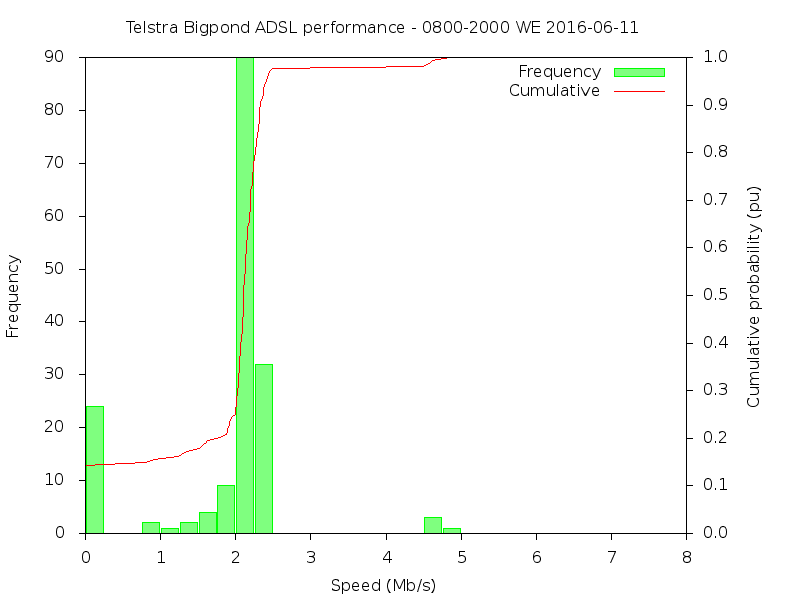 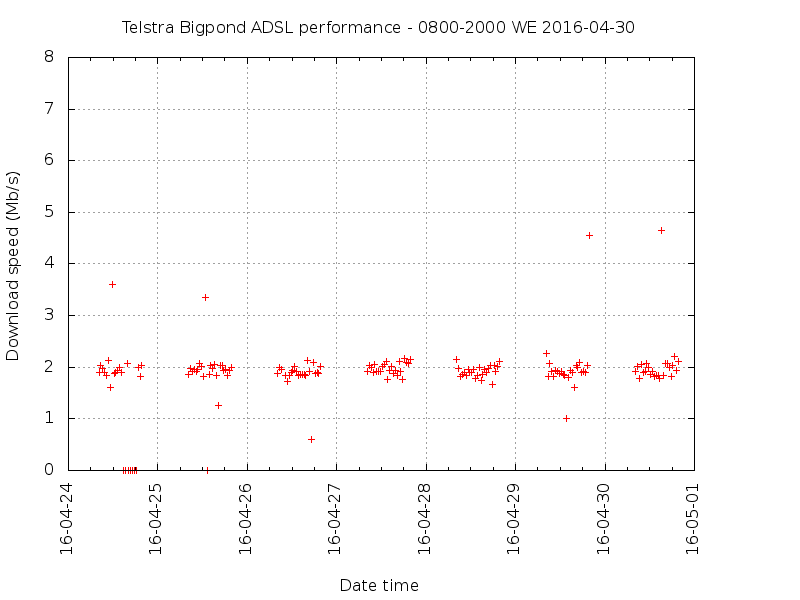 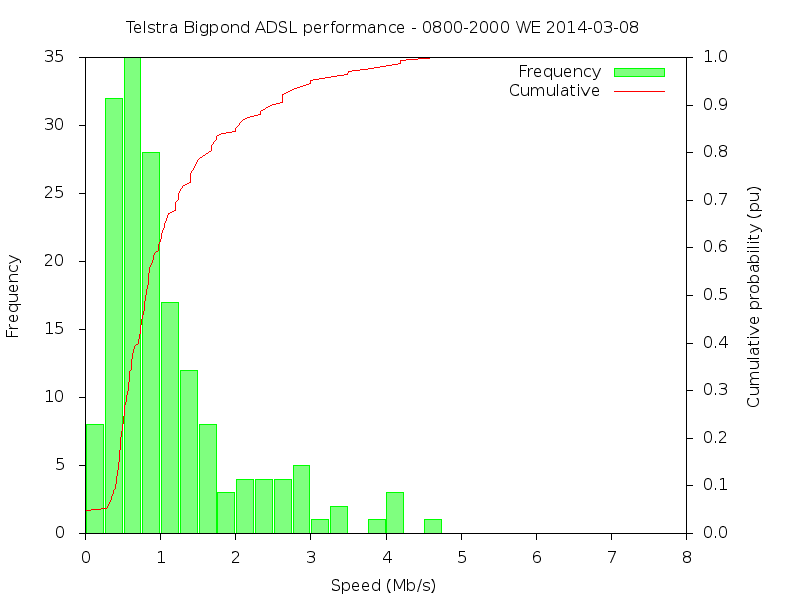 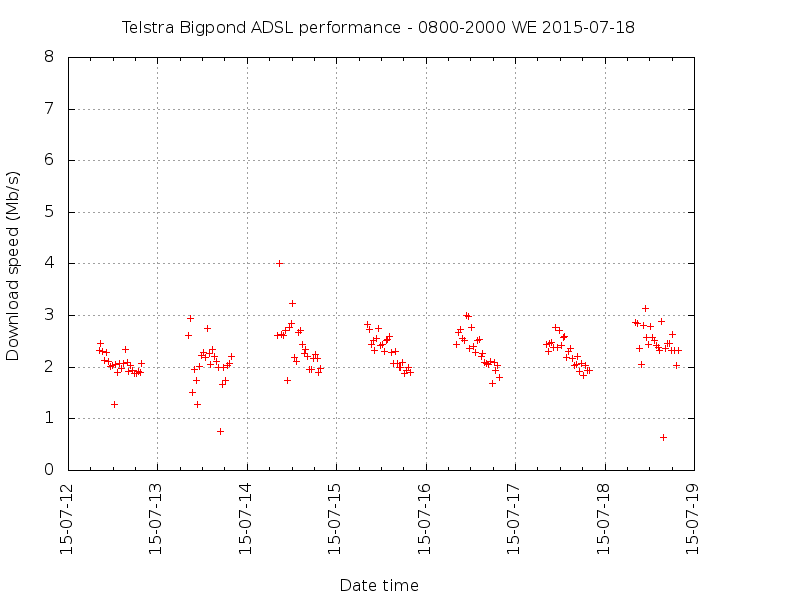 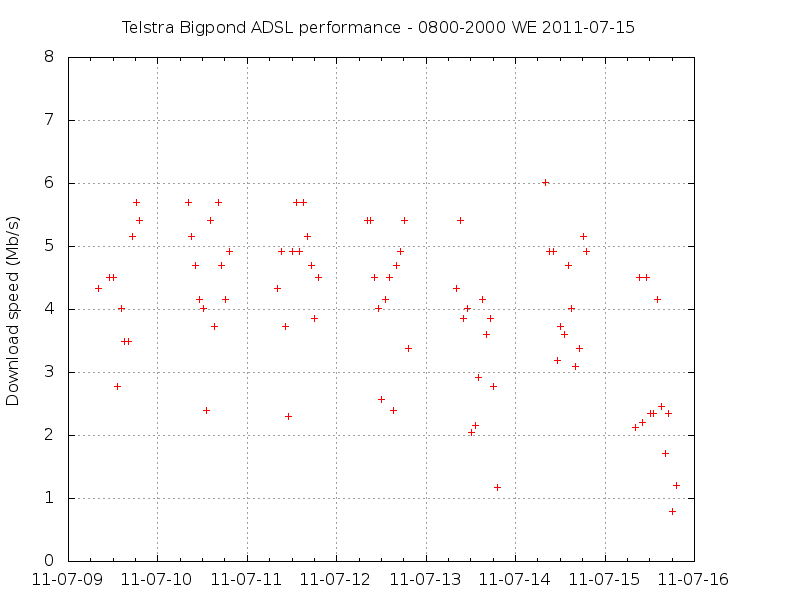 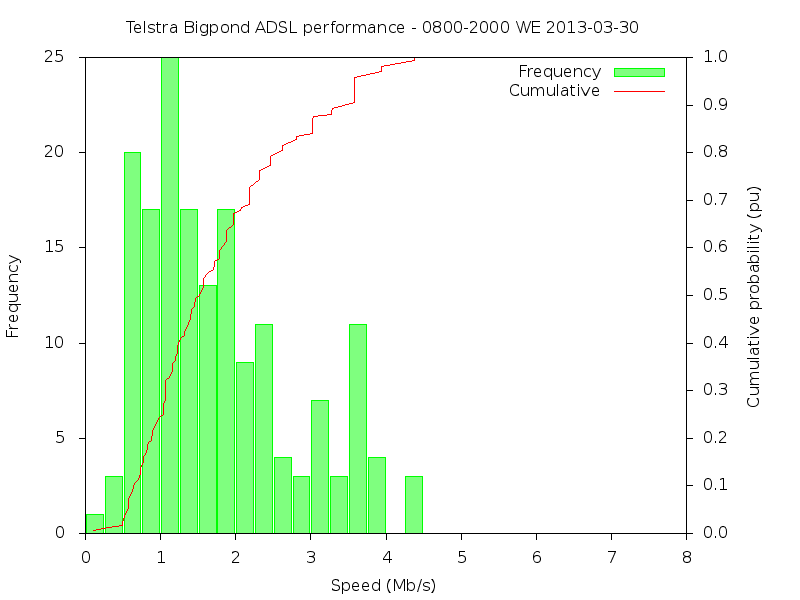 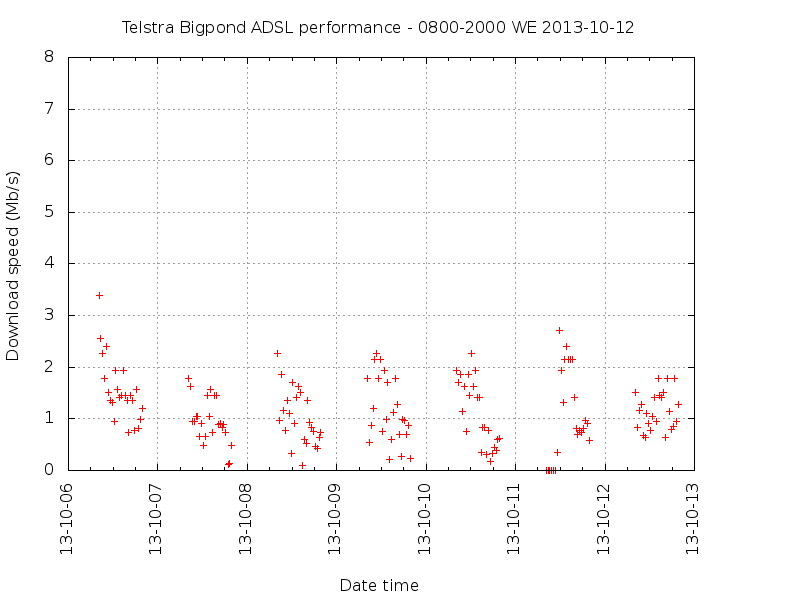 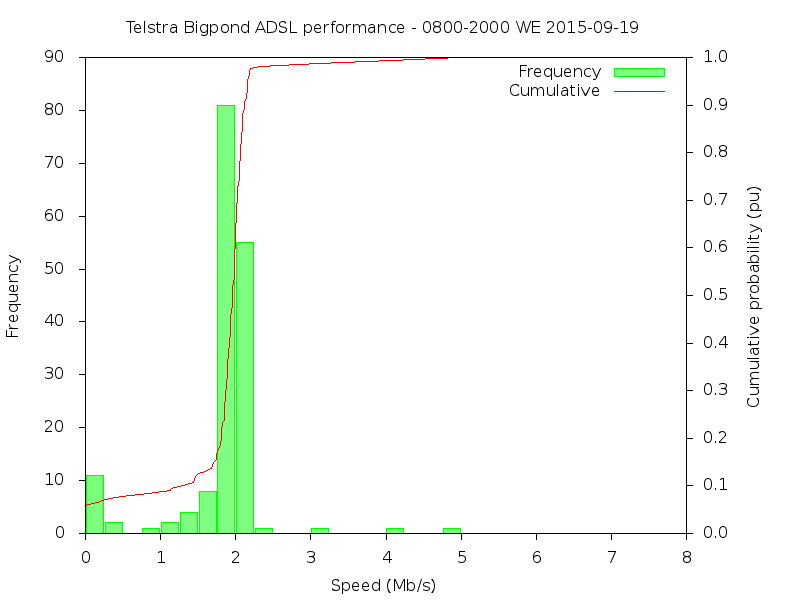 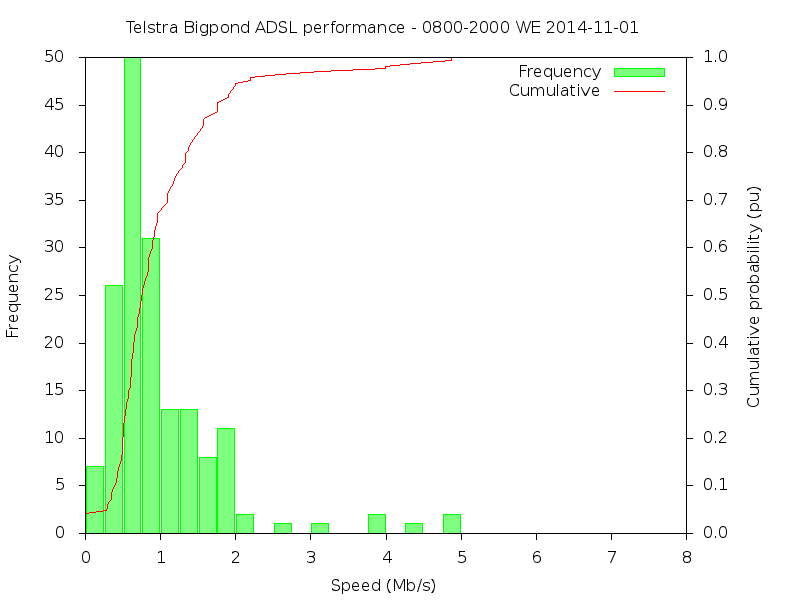 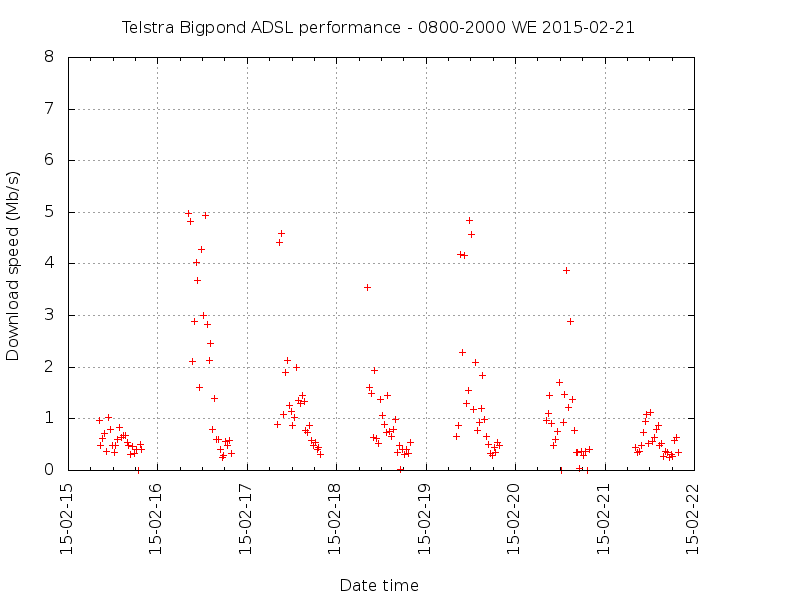 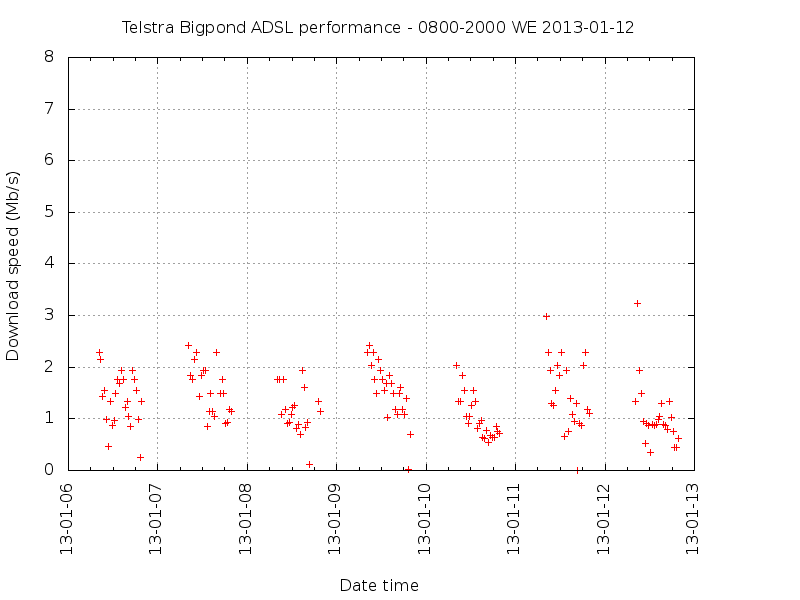 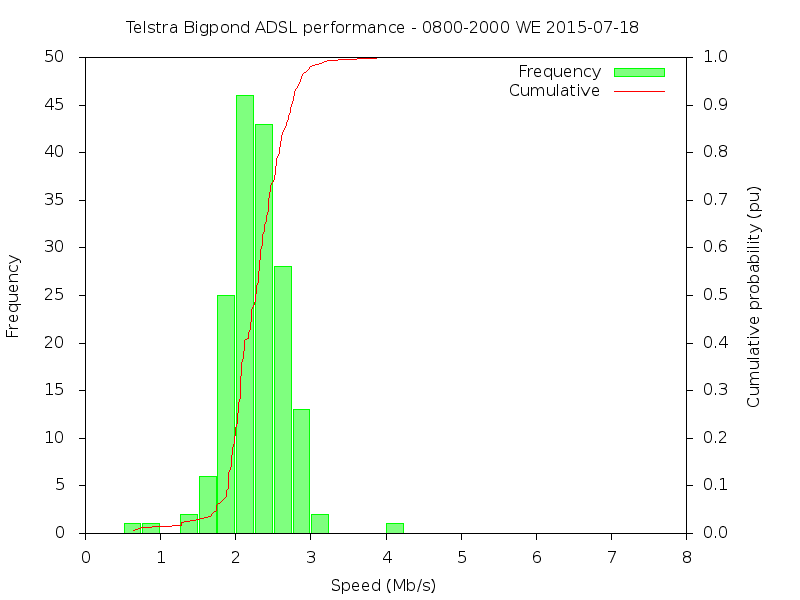 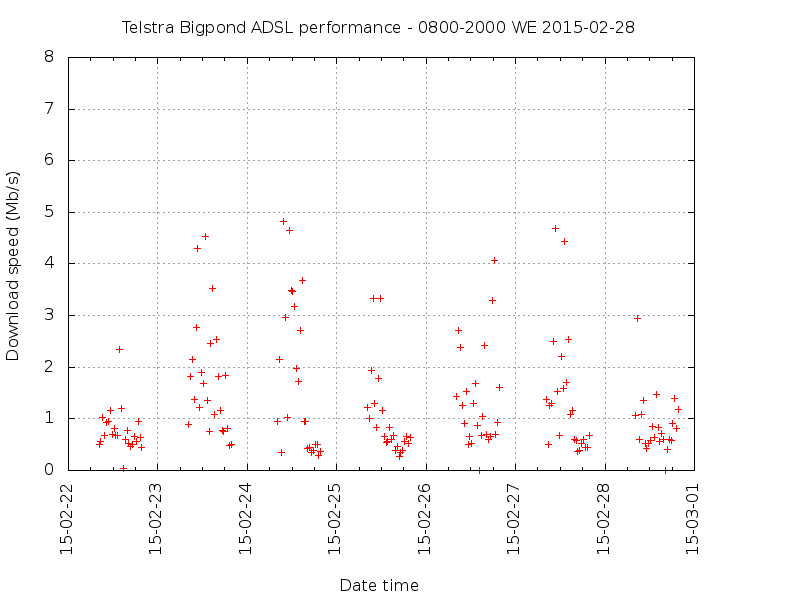 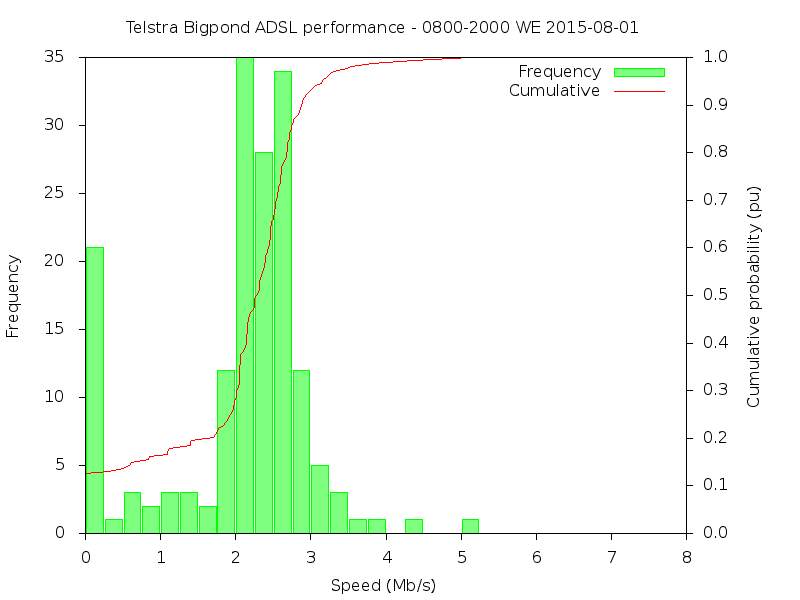 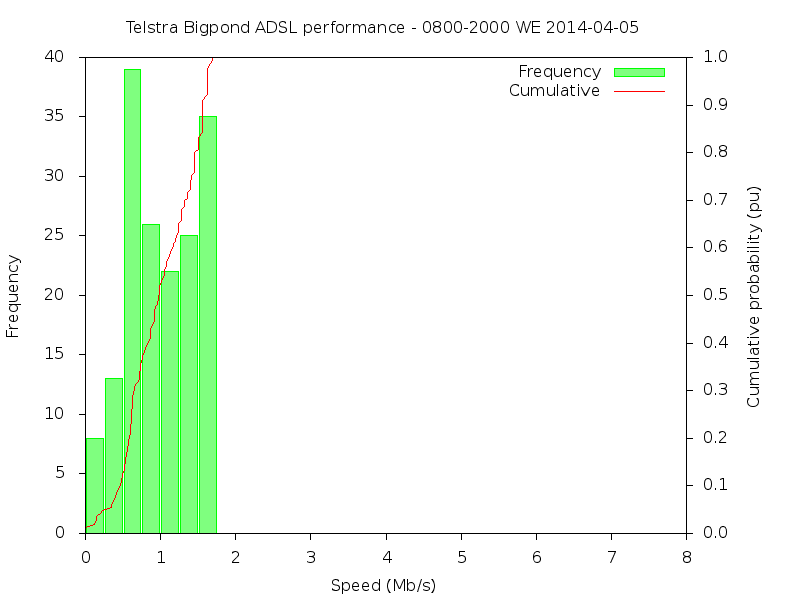 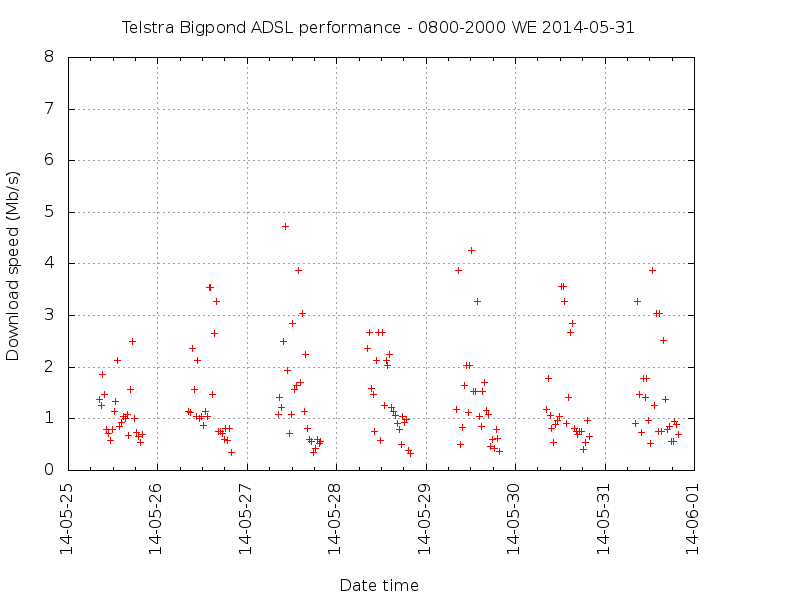 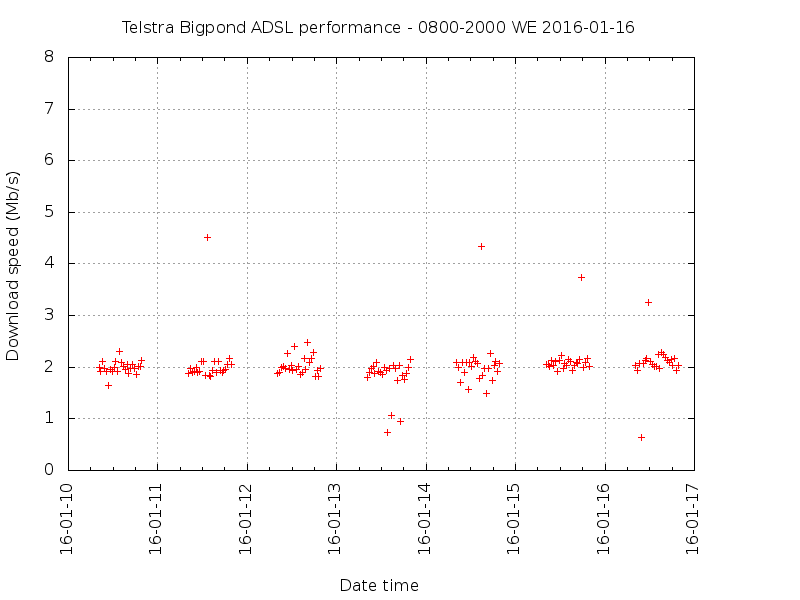 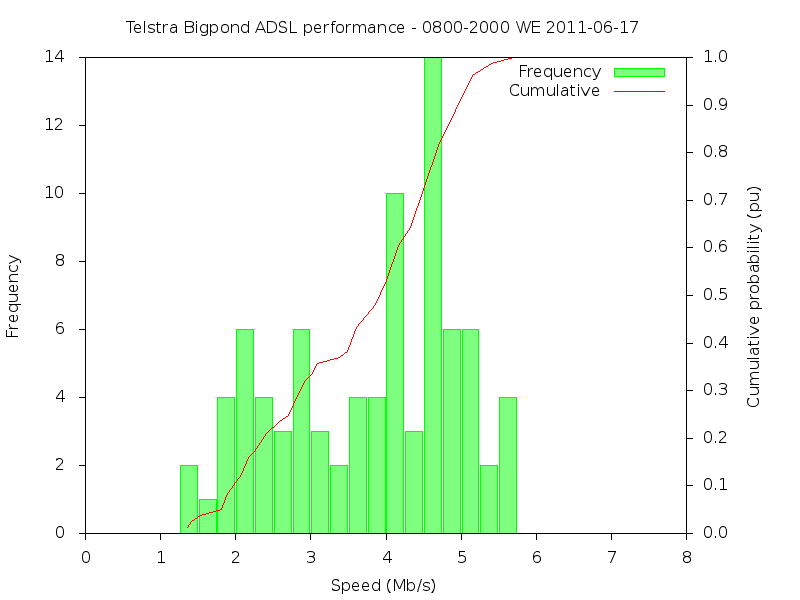 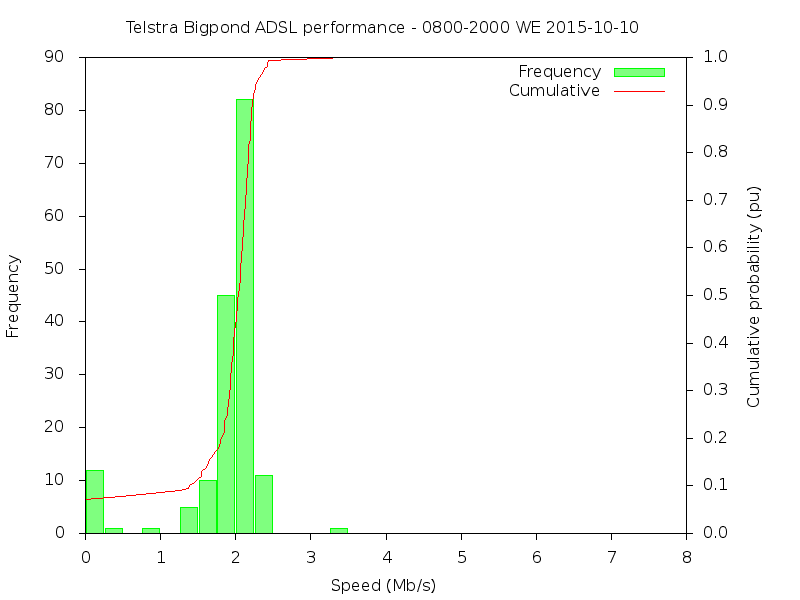 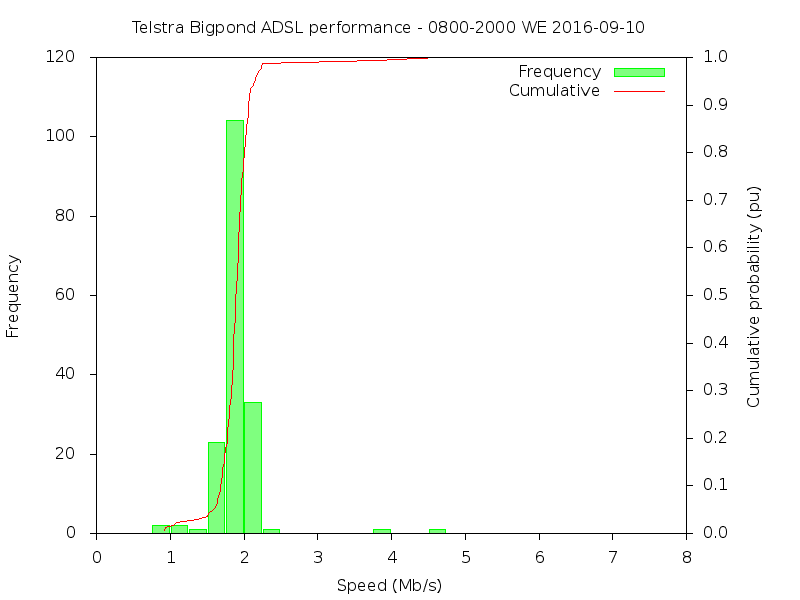 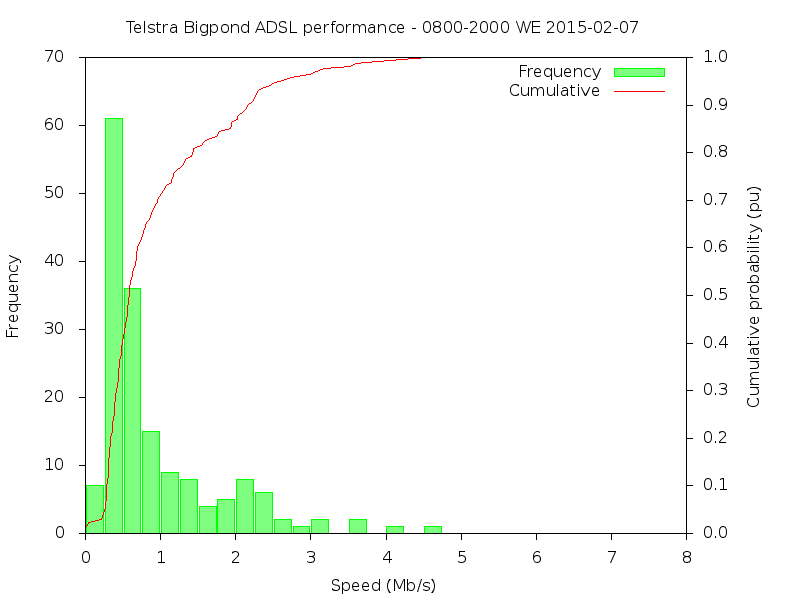 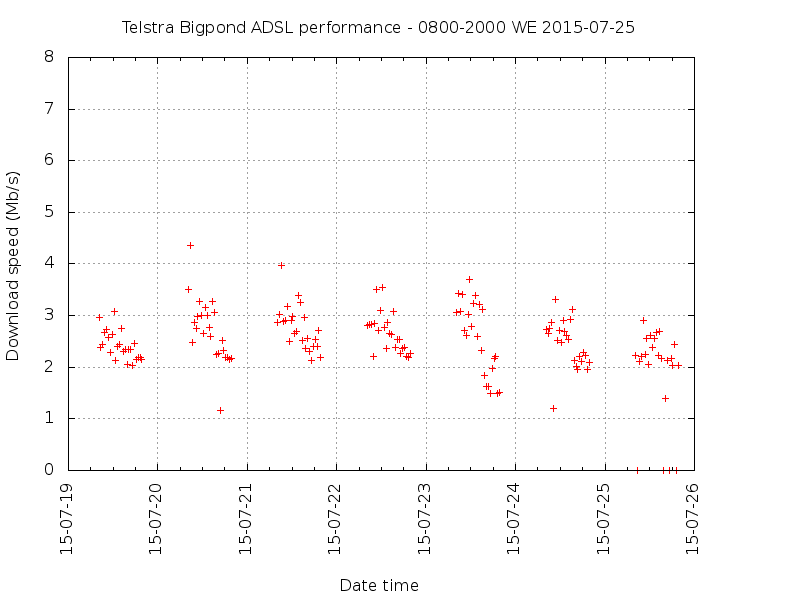 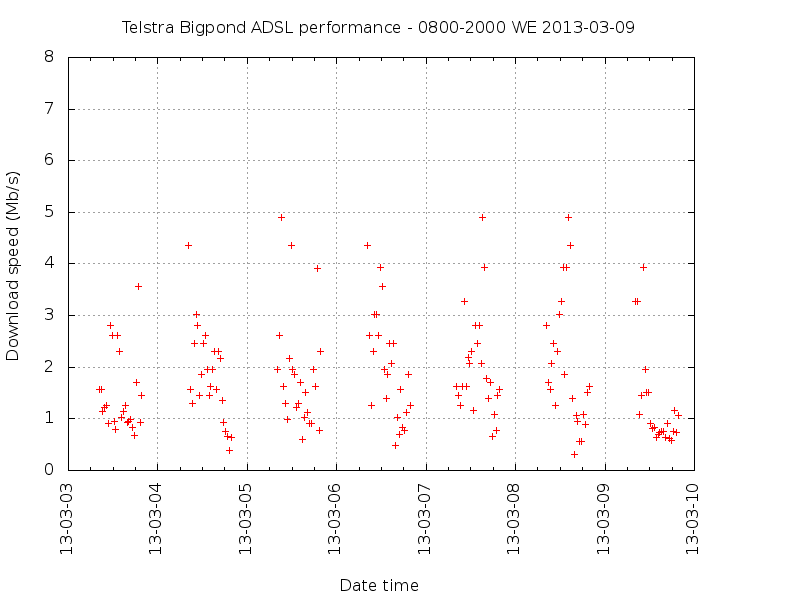 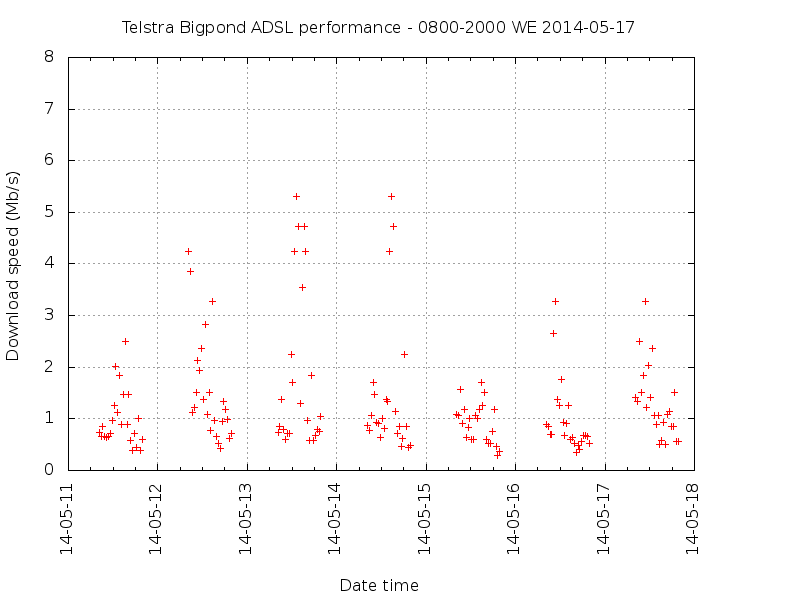 Up to 05/10/2016, the service was an 8,000,000b/s ADSL service from Telstra Bigpond. 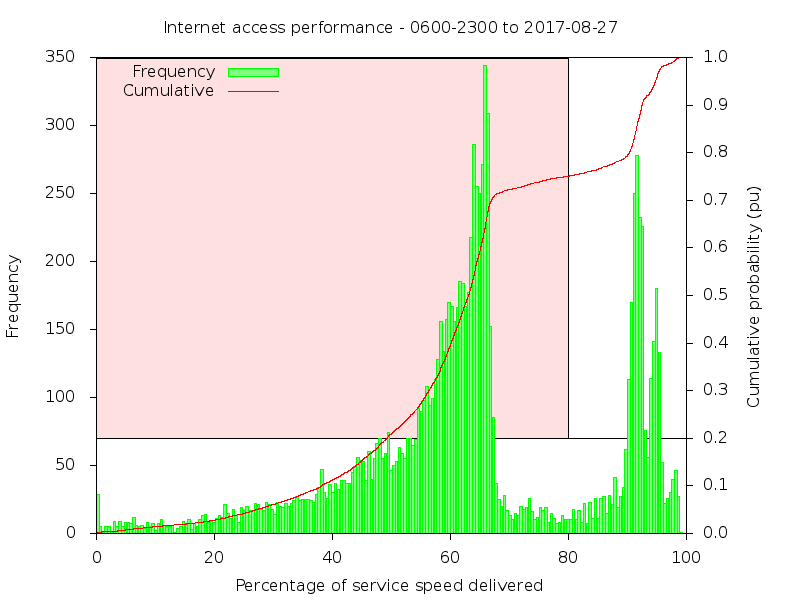 At most times that I want to use it, the speed is less than 10% of the capped speed (8,000,000b/s), and that there is no consumer protection of service levels stands as testament to the failure of successive governments that put their role as operators of a carriage network (again) ahead of consumers. 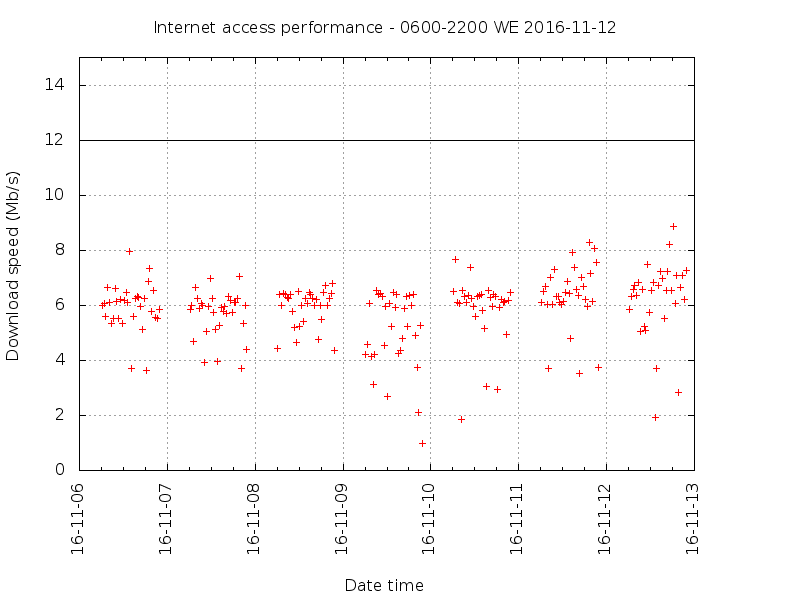 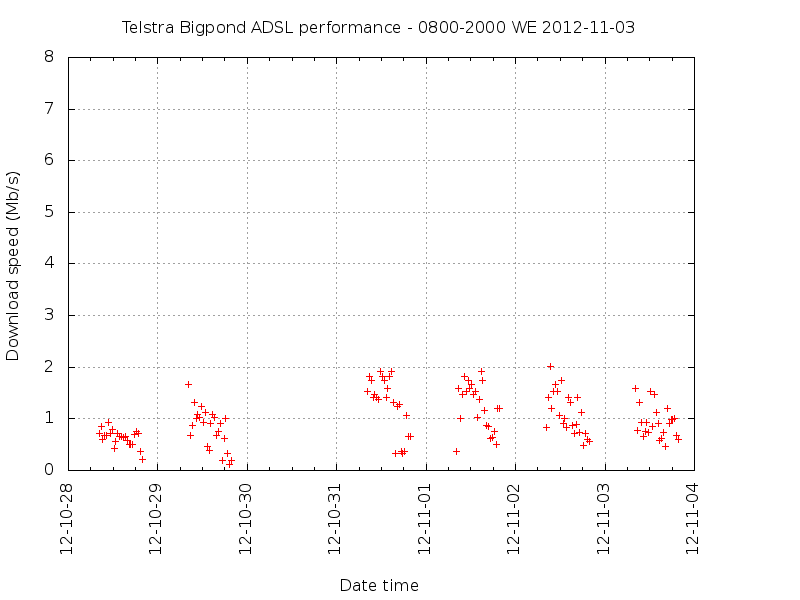 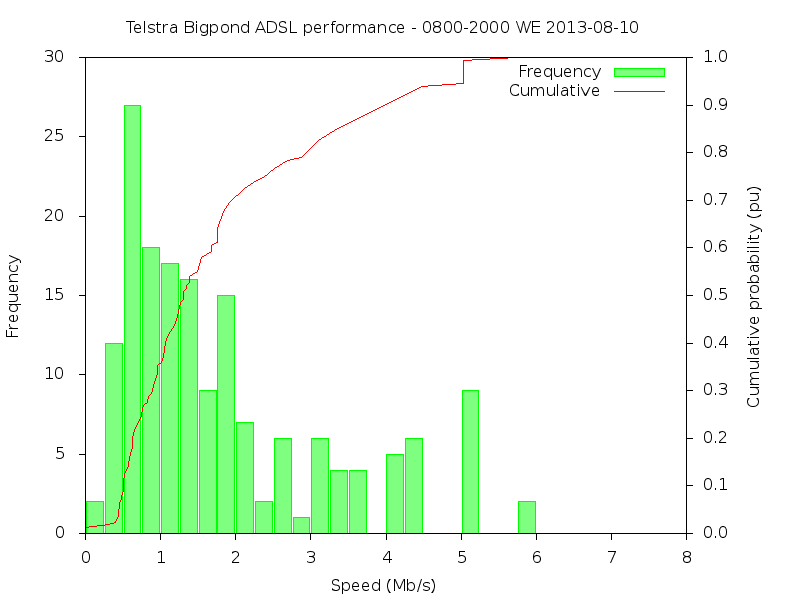 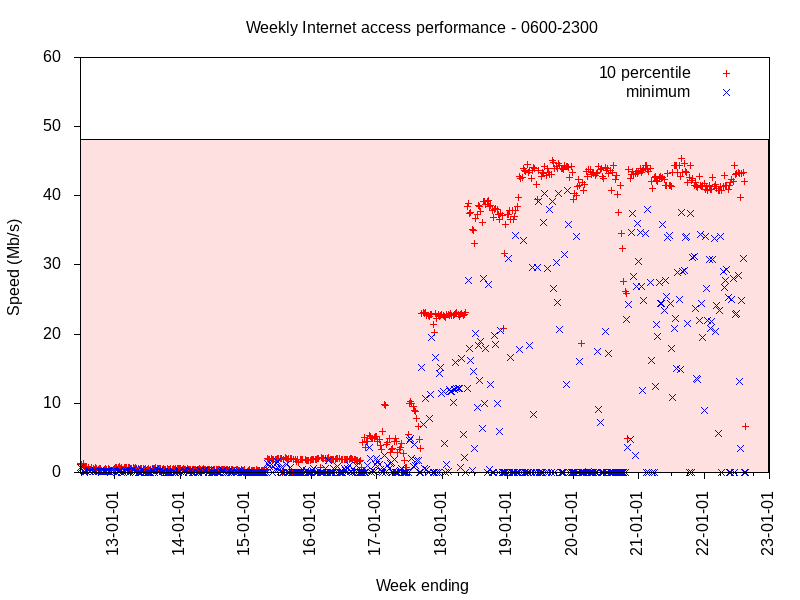 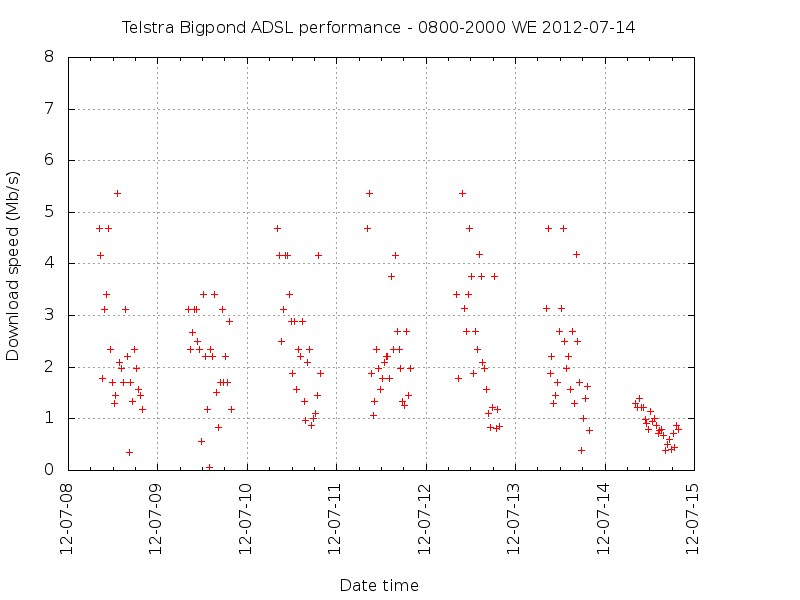 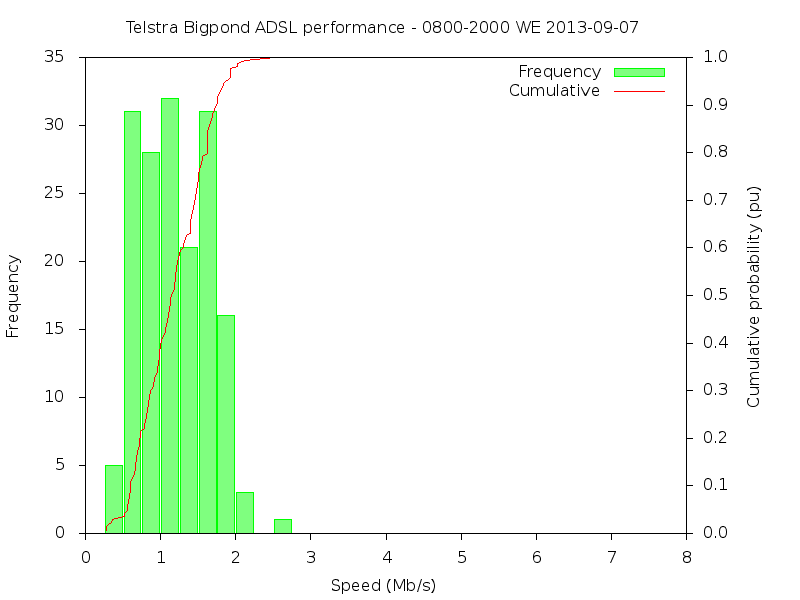 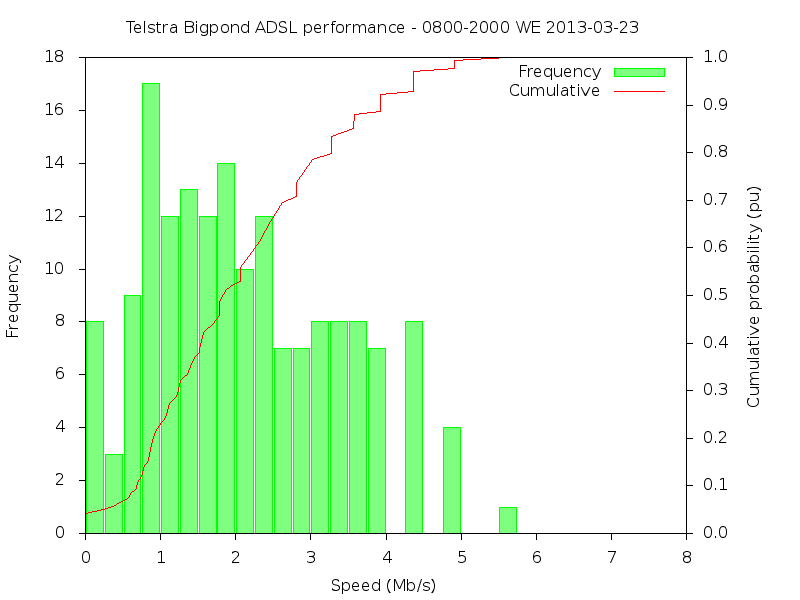 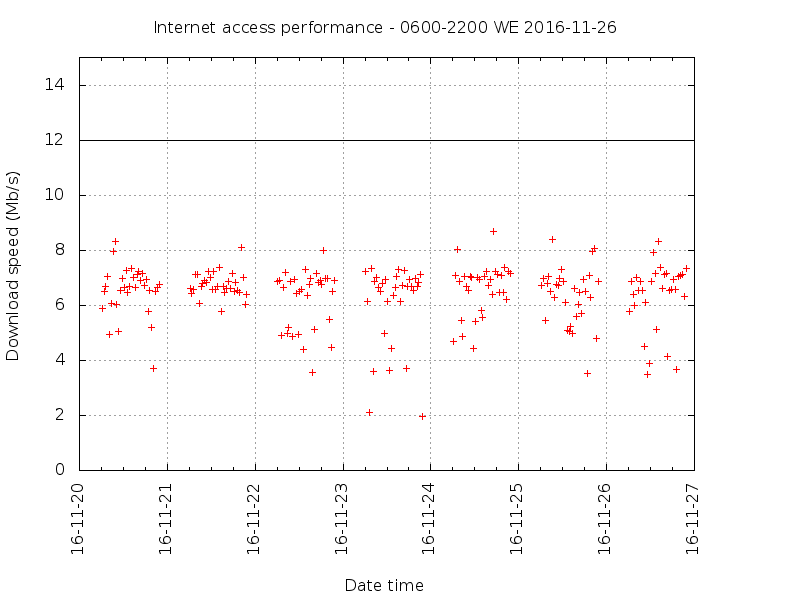 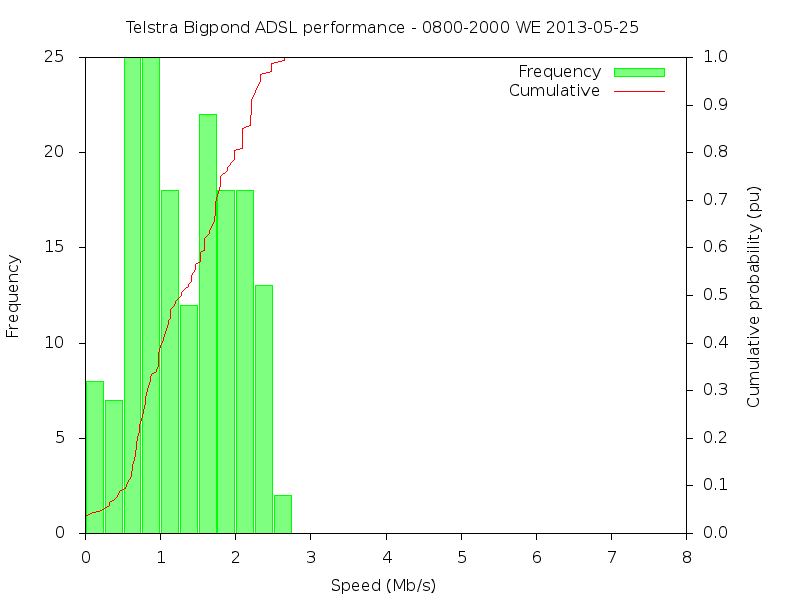 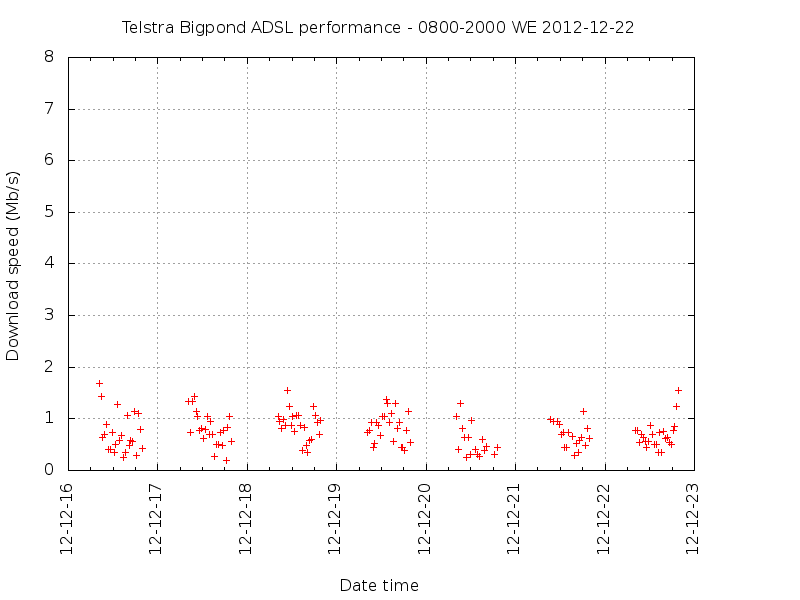 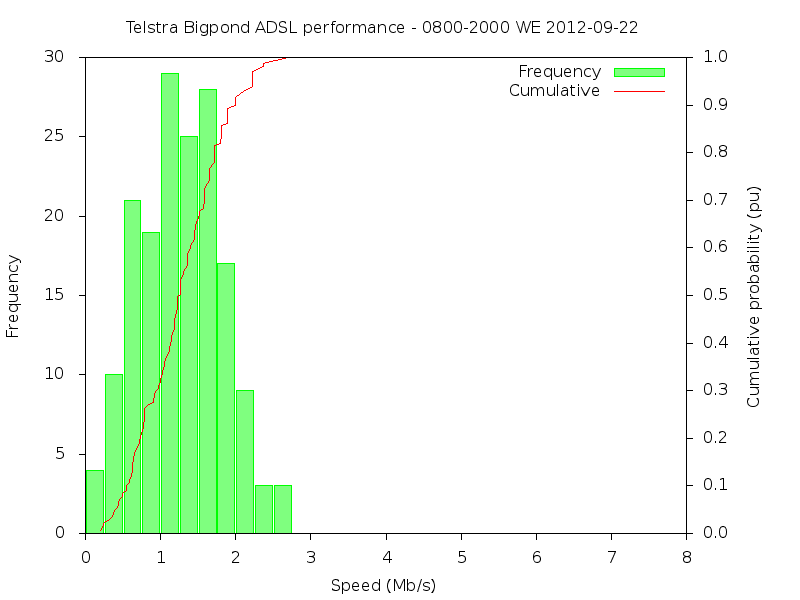 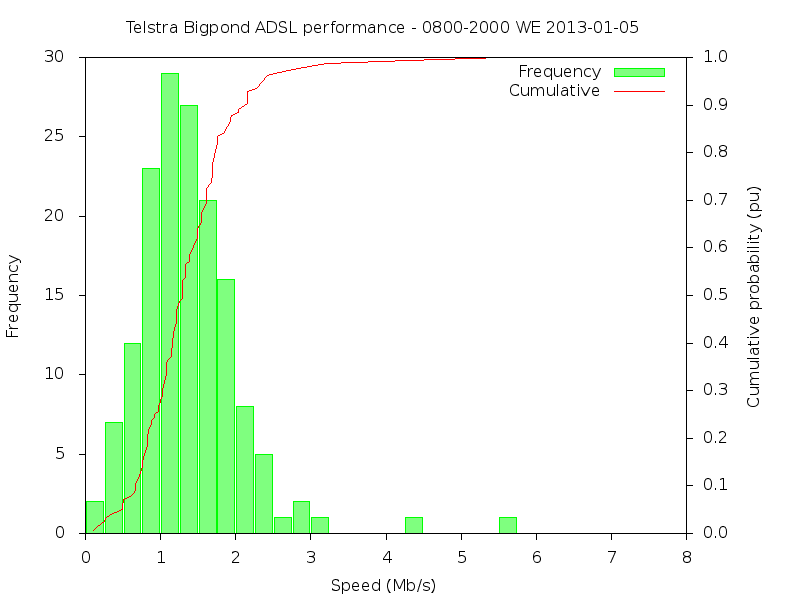 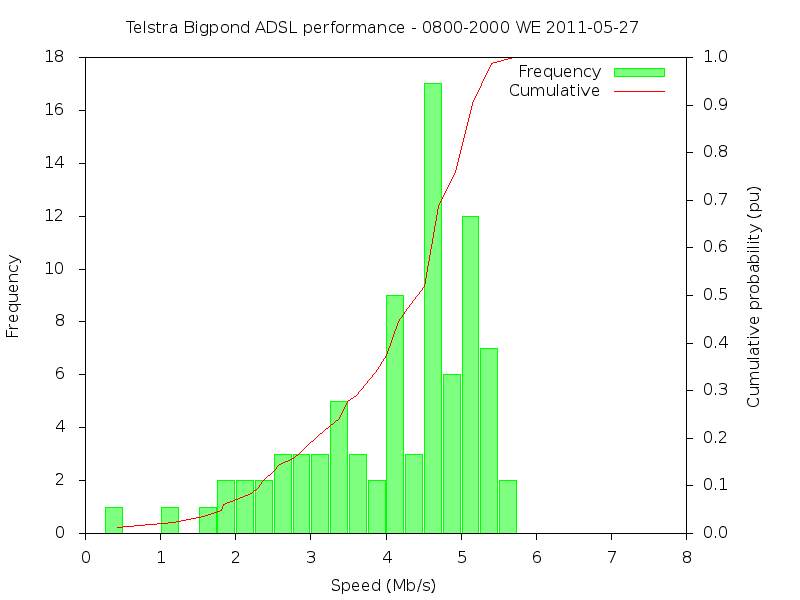 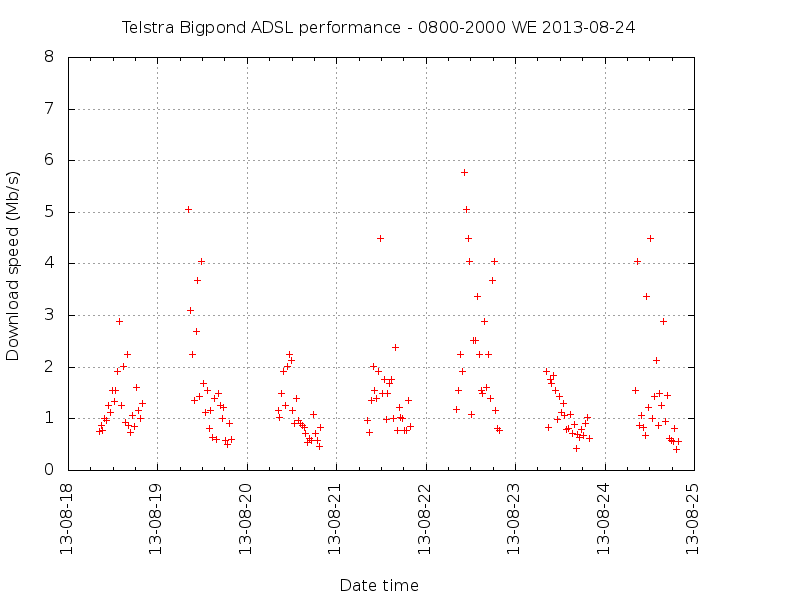 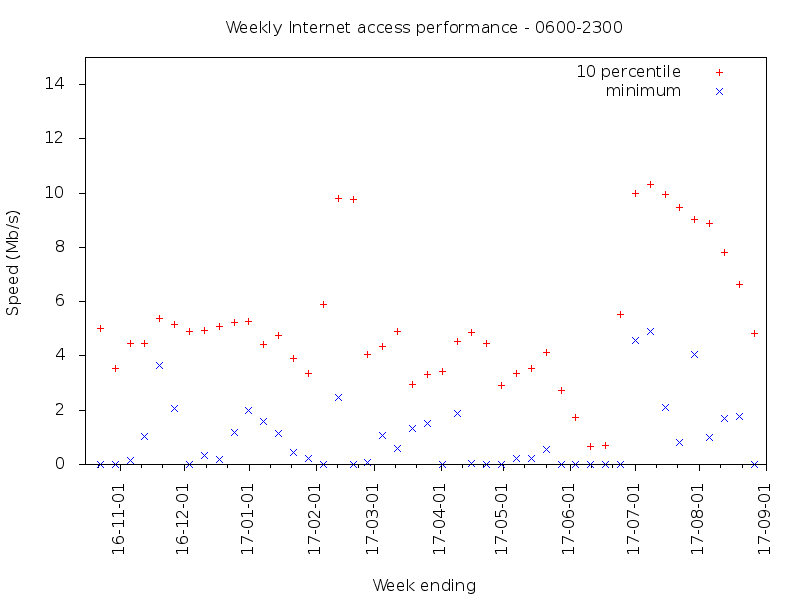 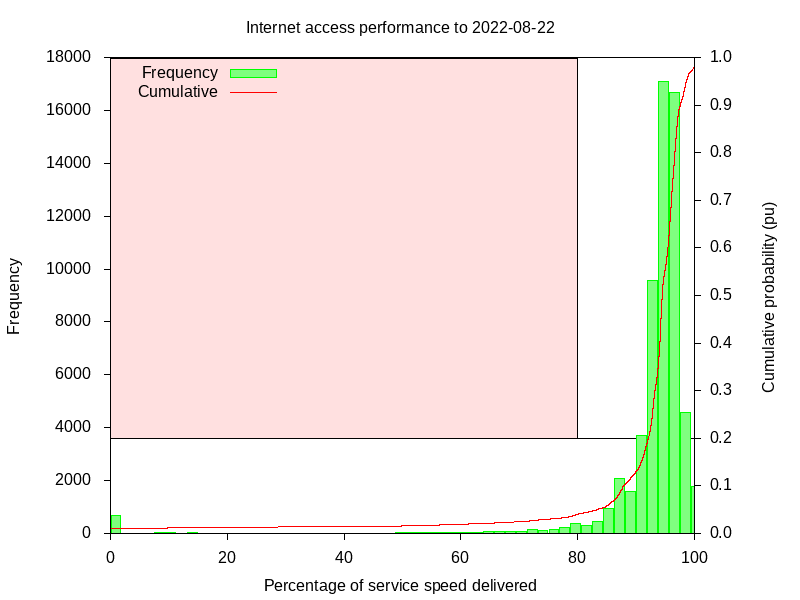 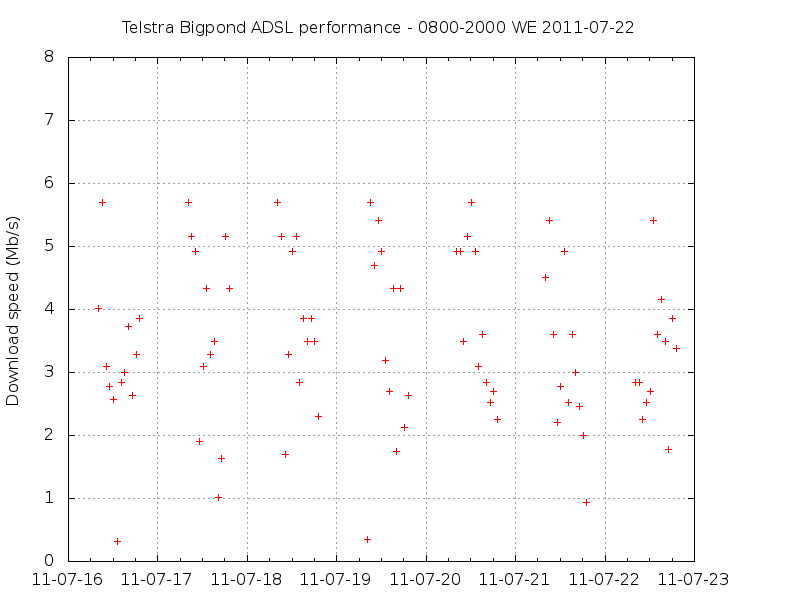 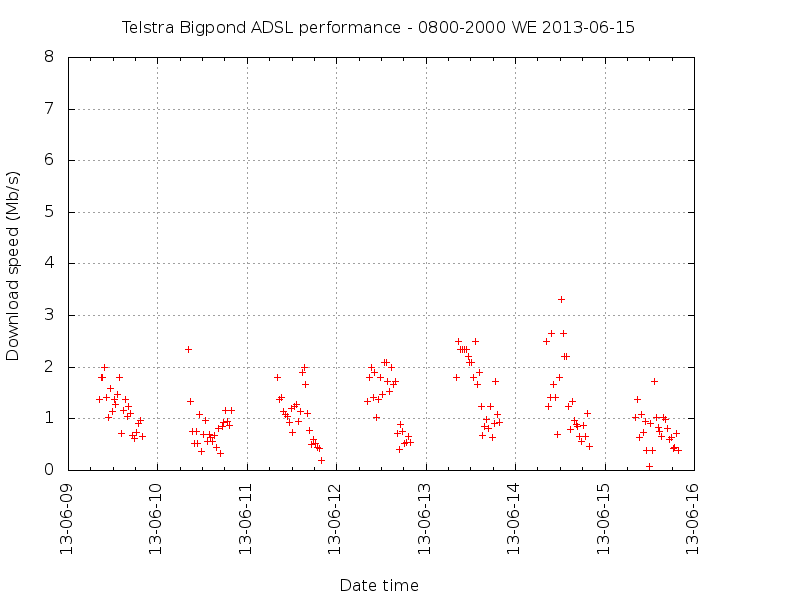 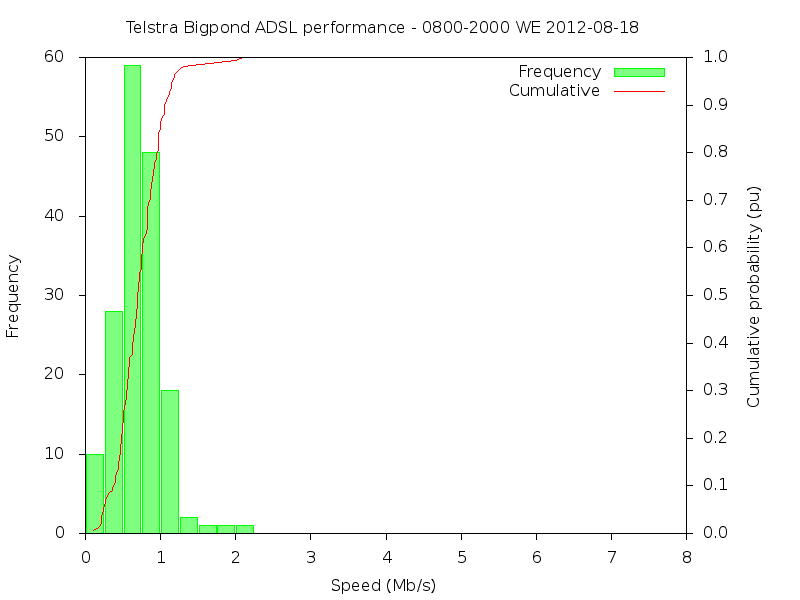 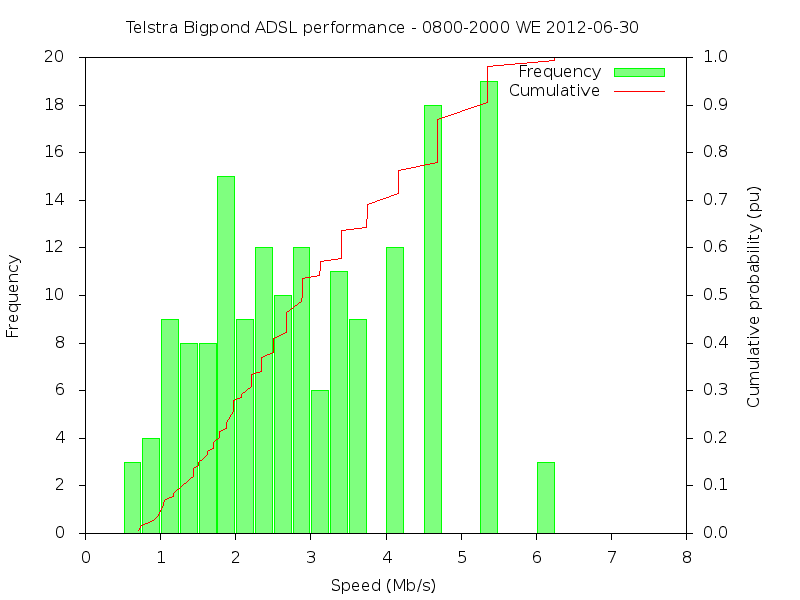 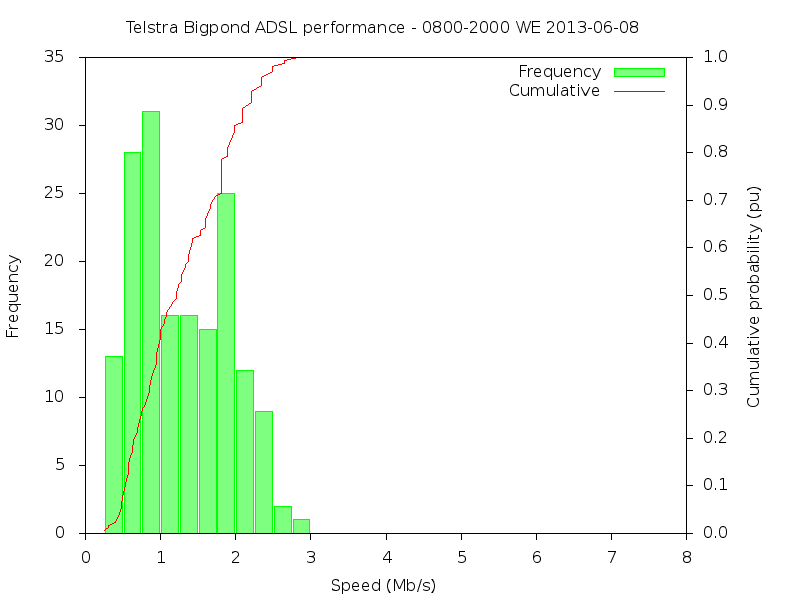 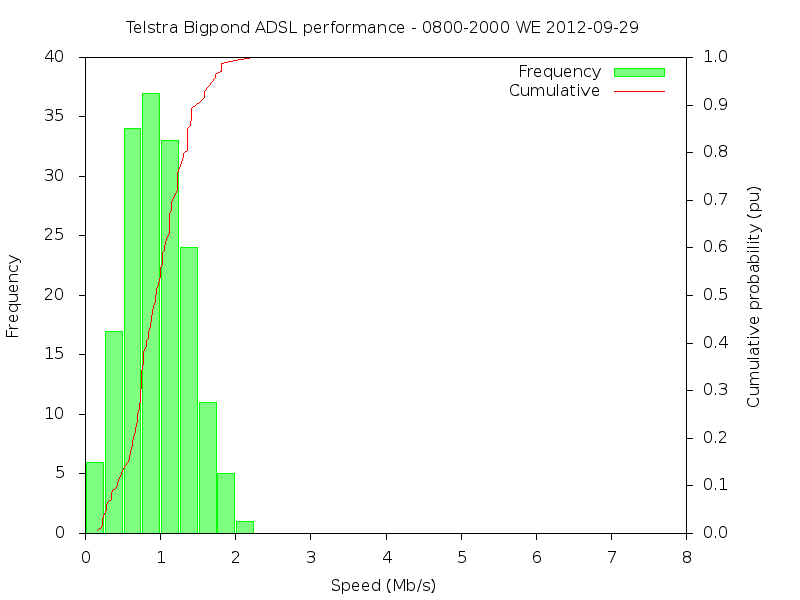 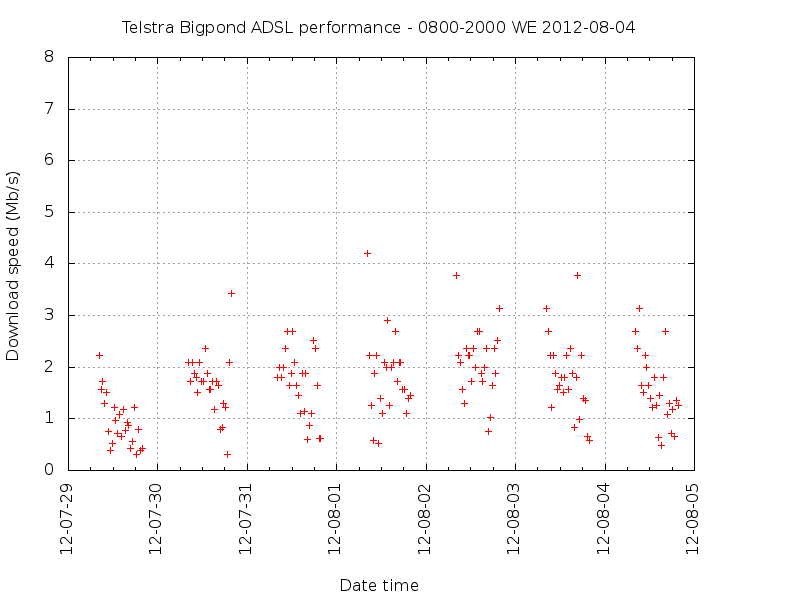 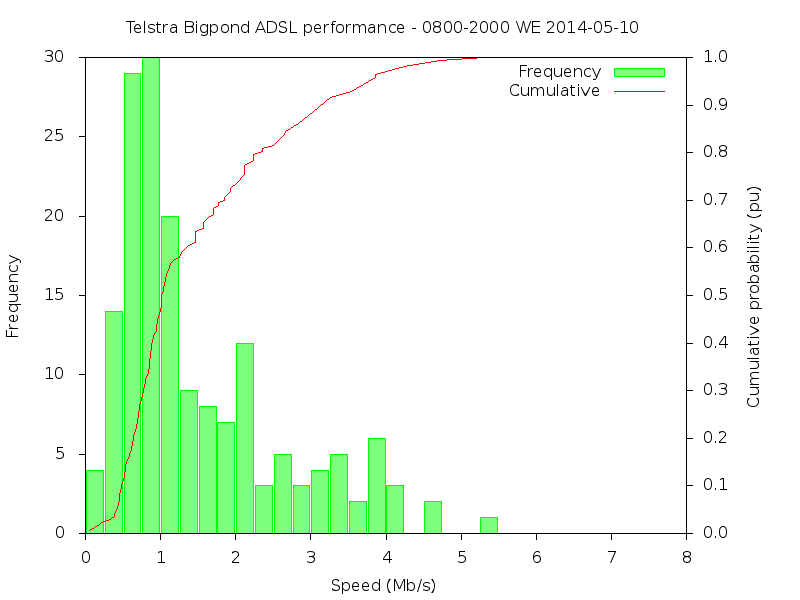 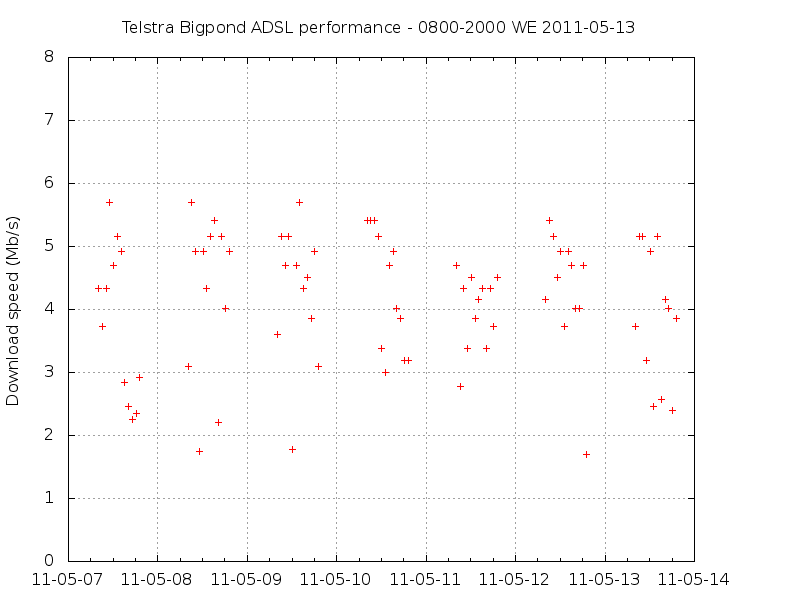 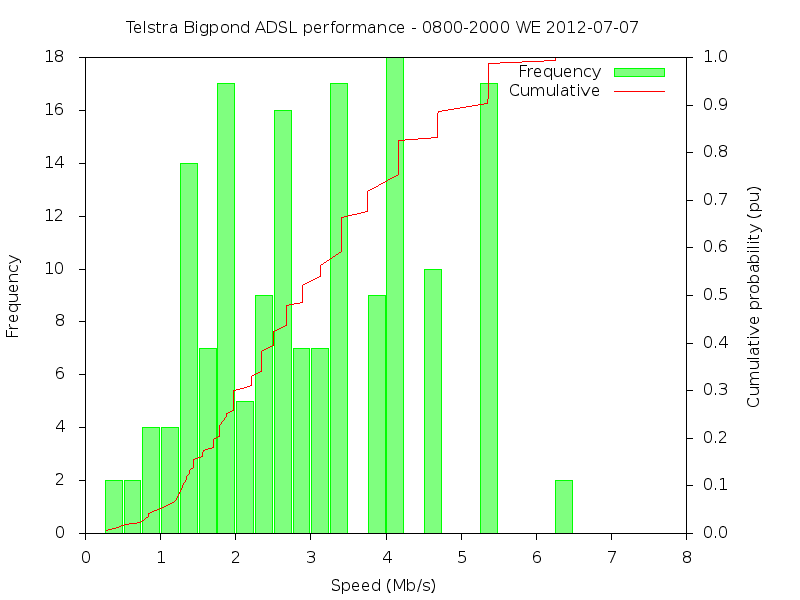 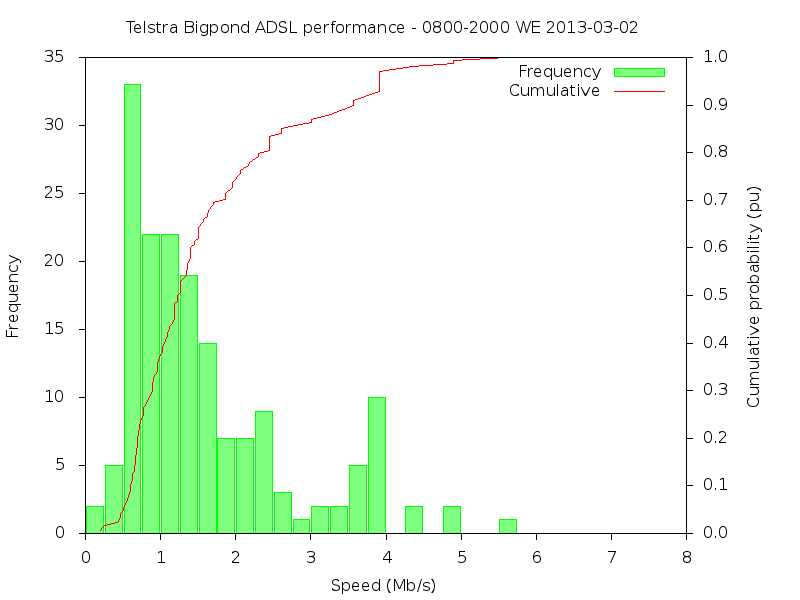 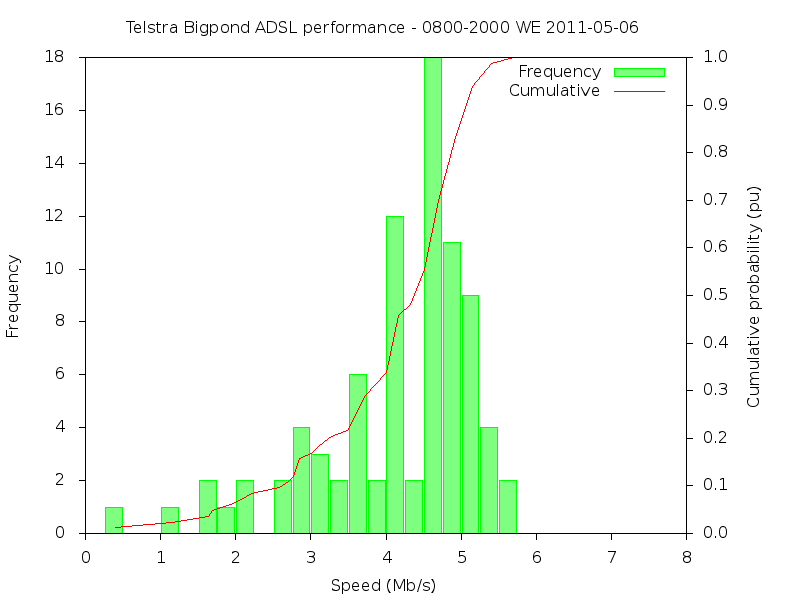 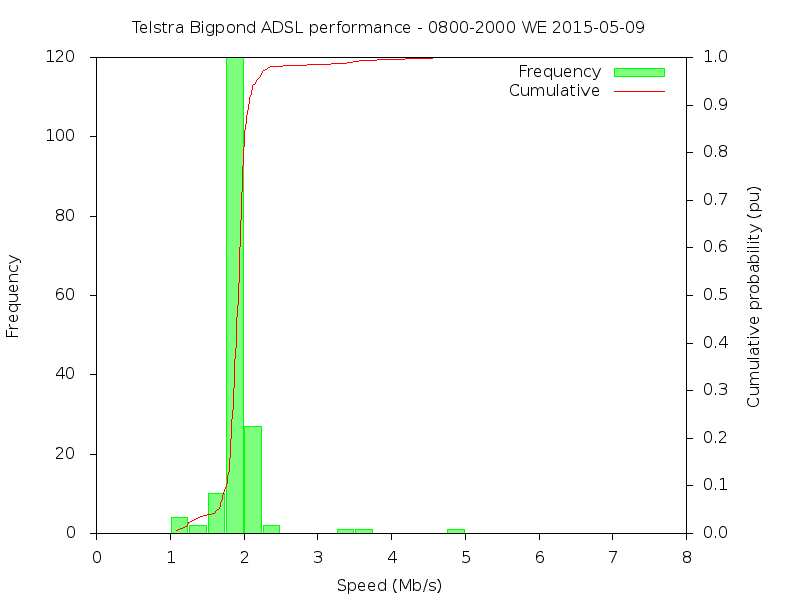 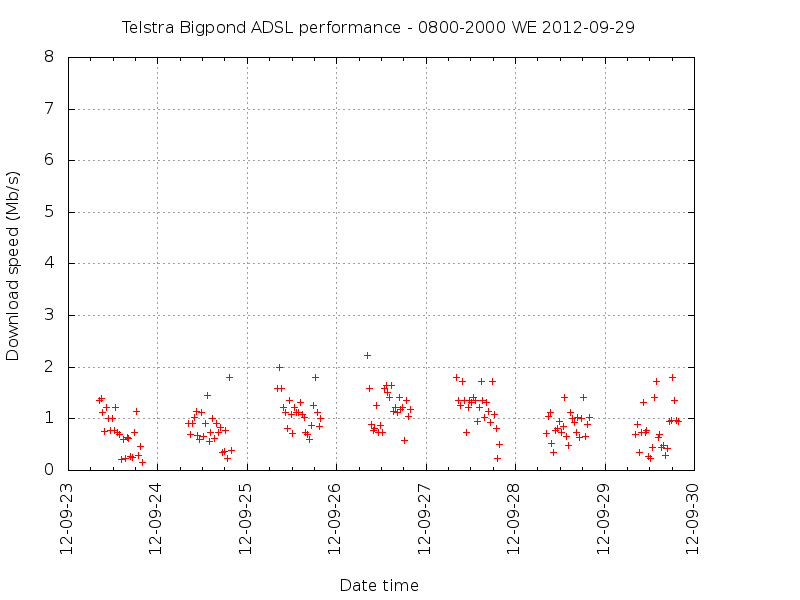 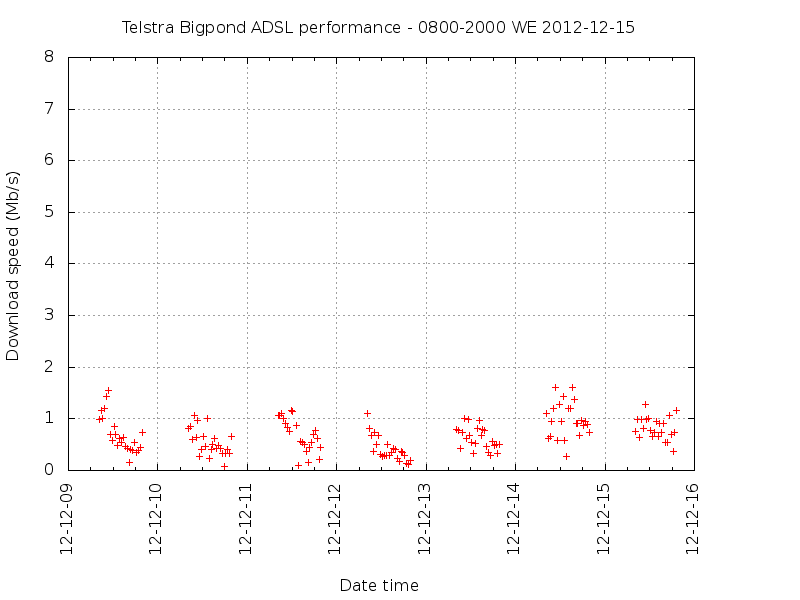 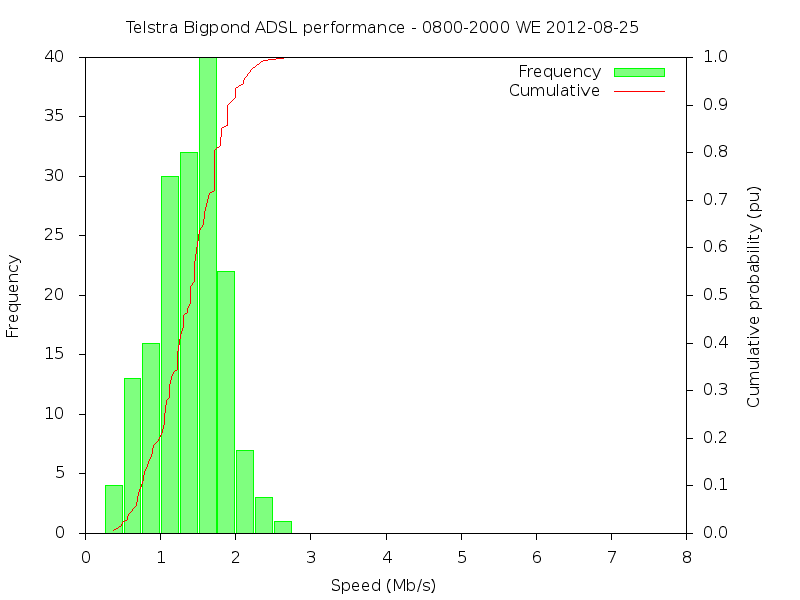 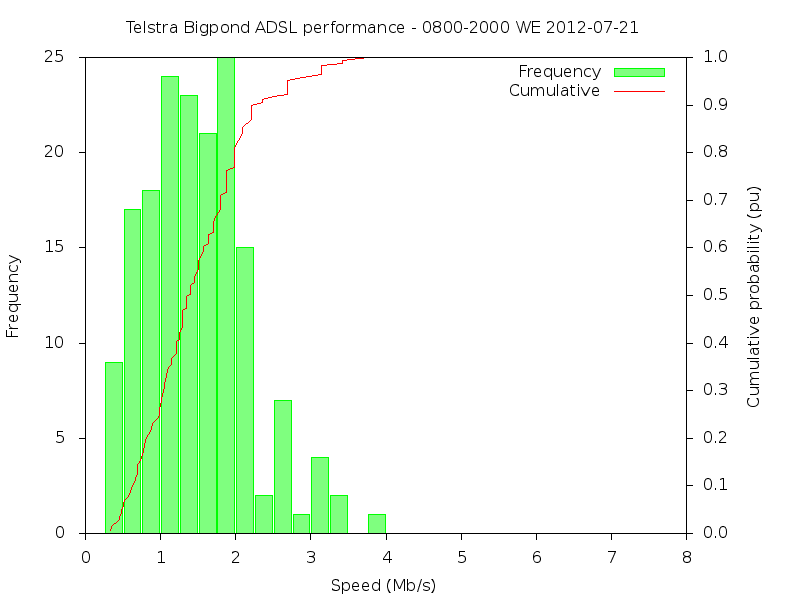 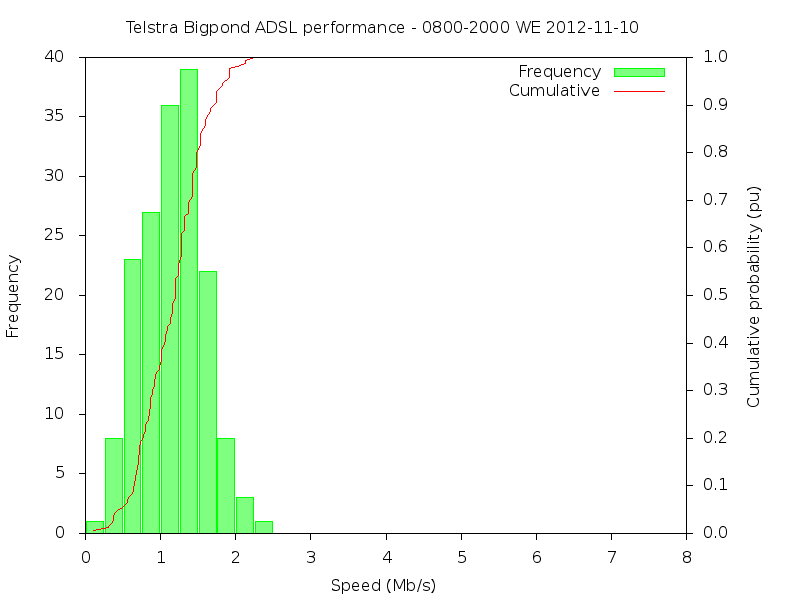 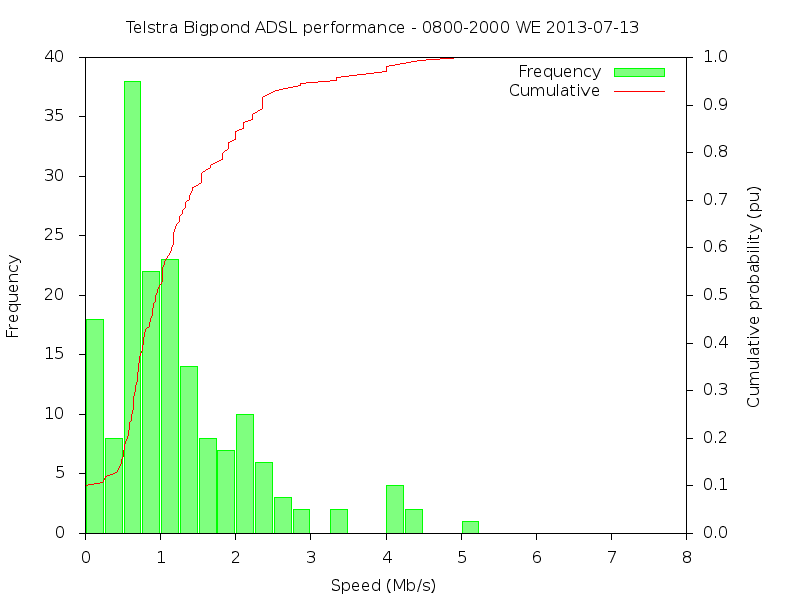 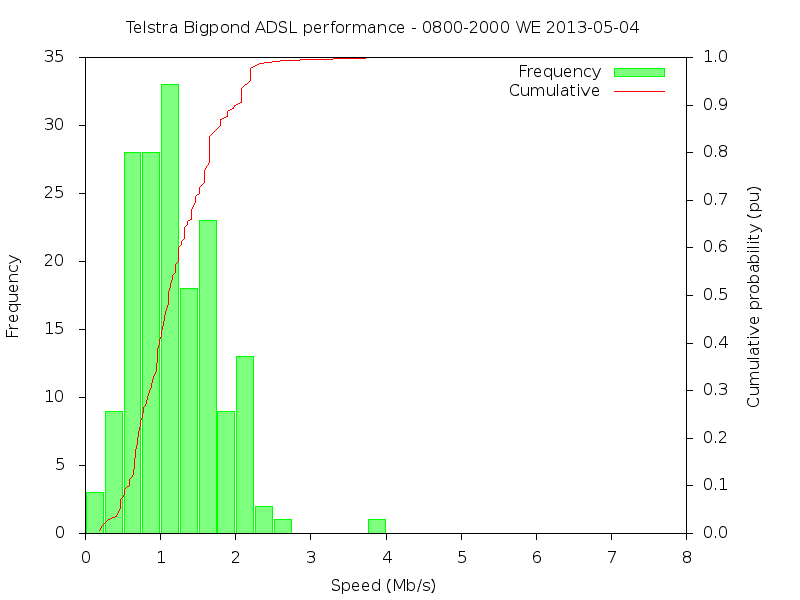 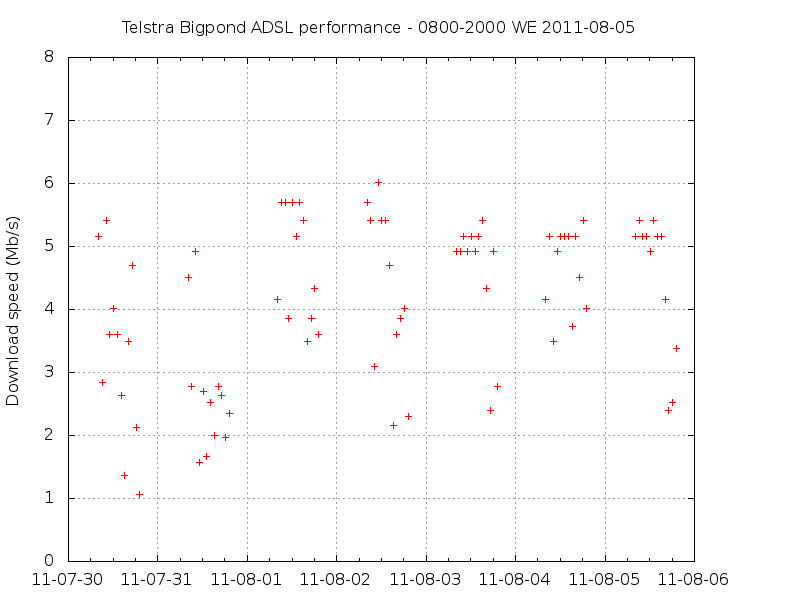 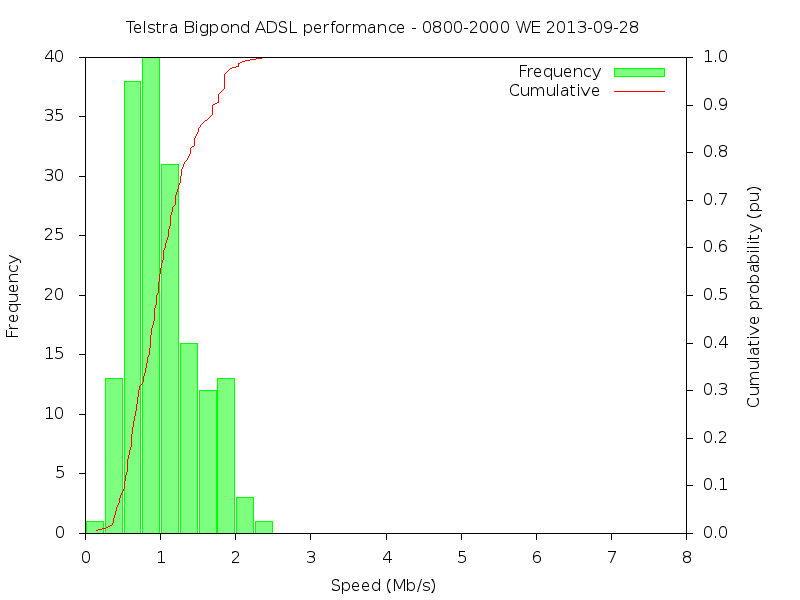 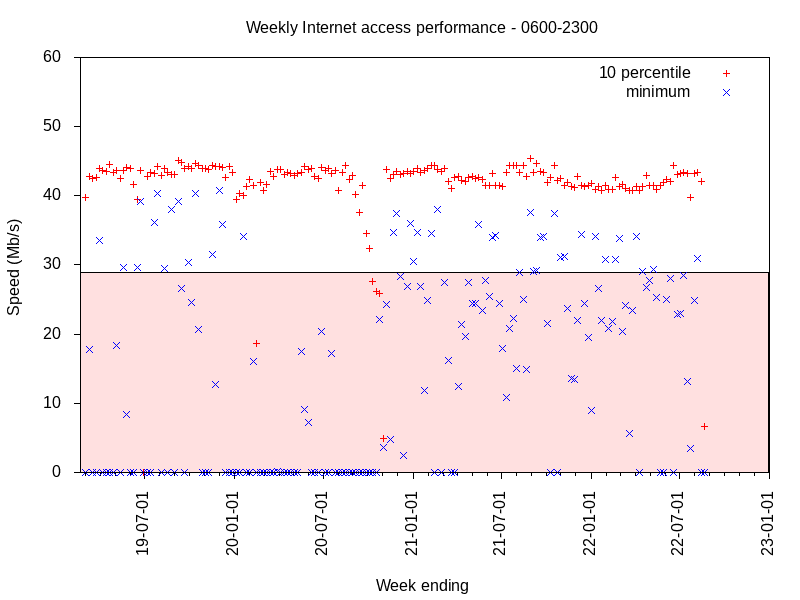 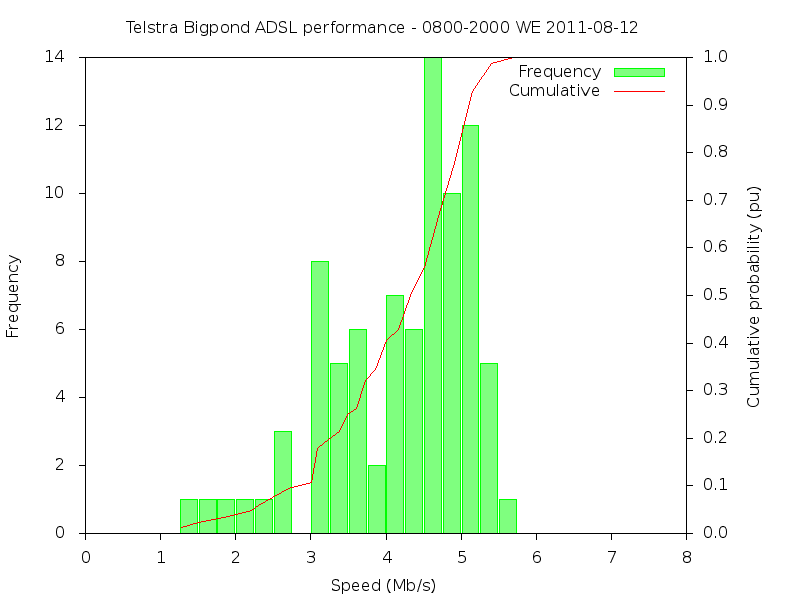 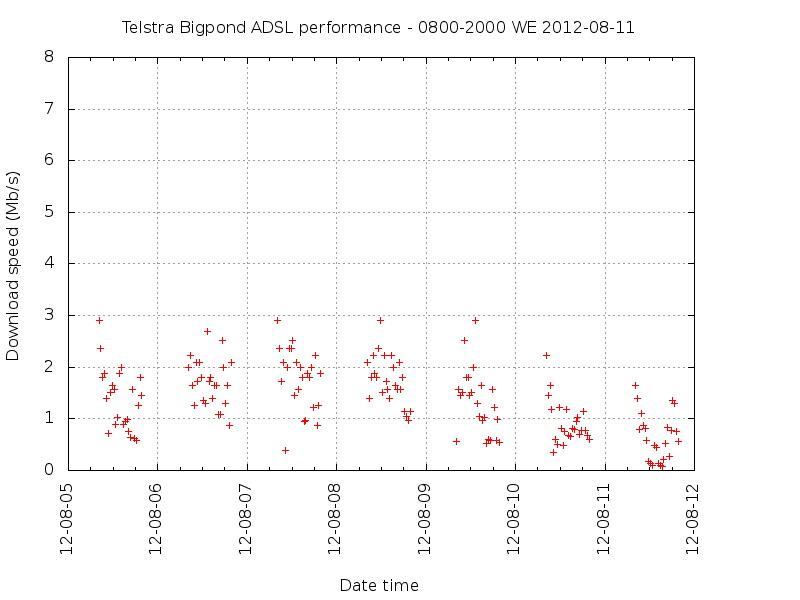 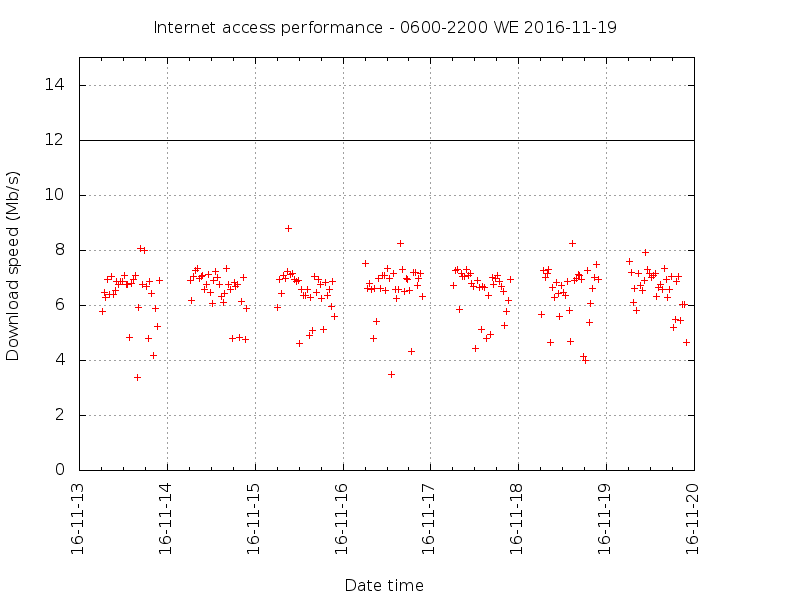 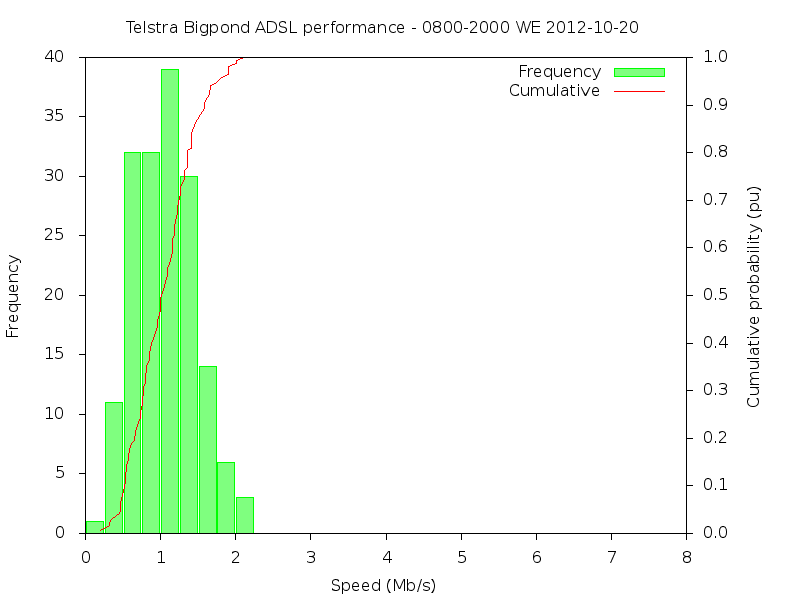 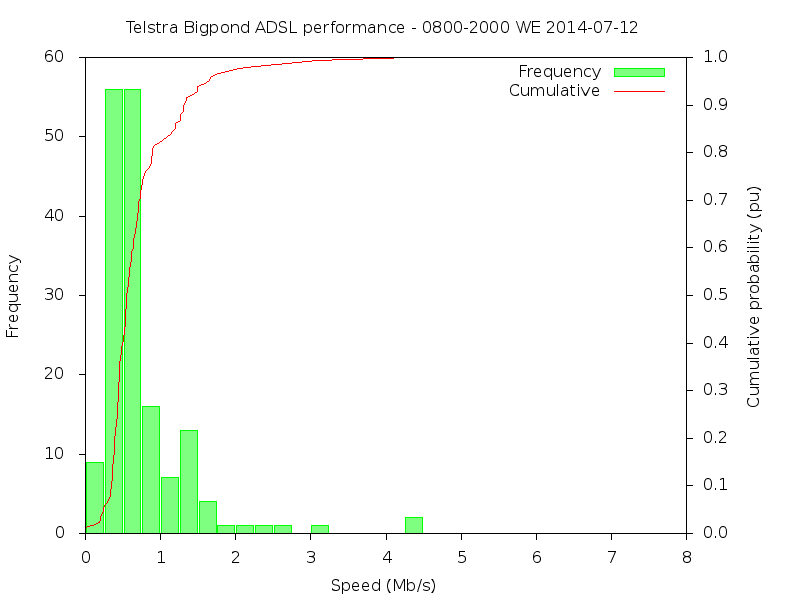 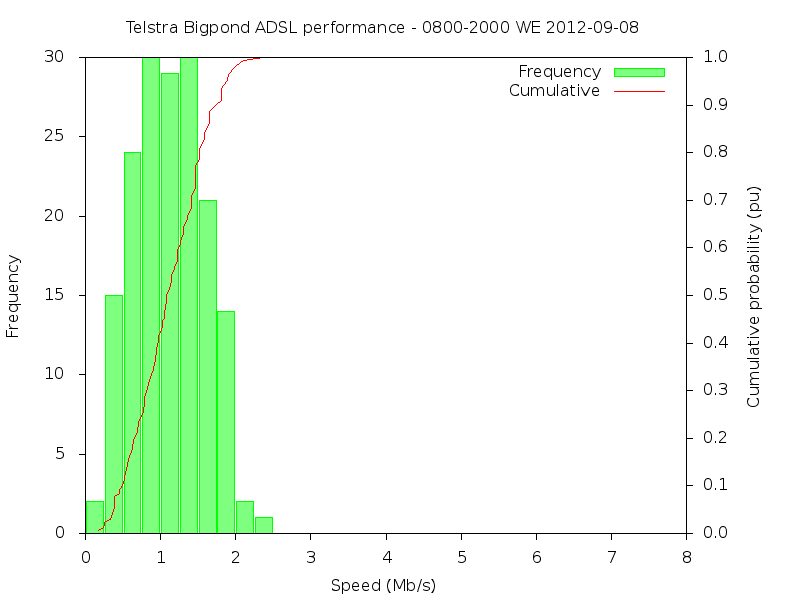 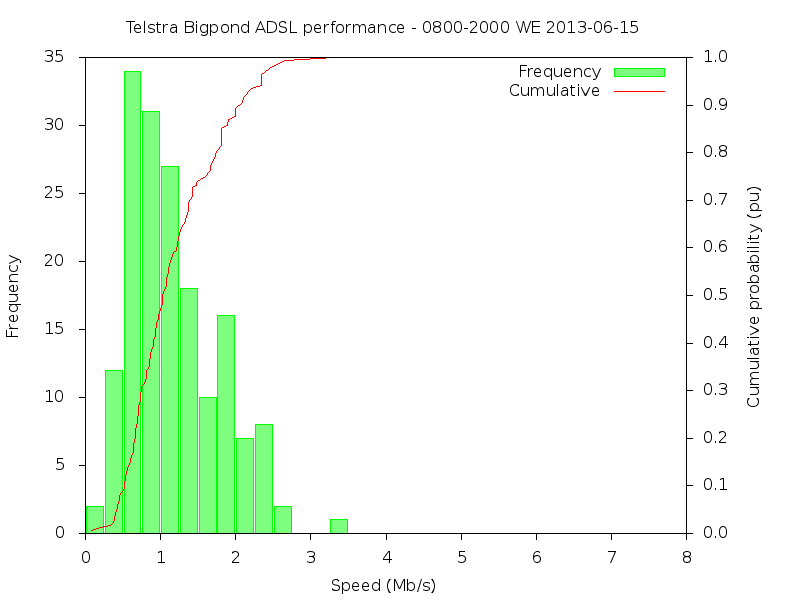 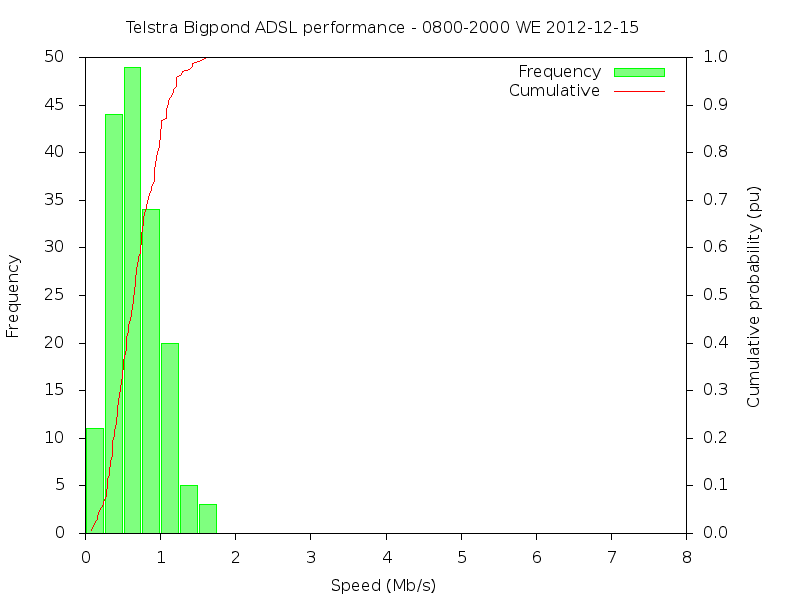 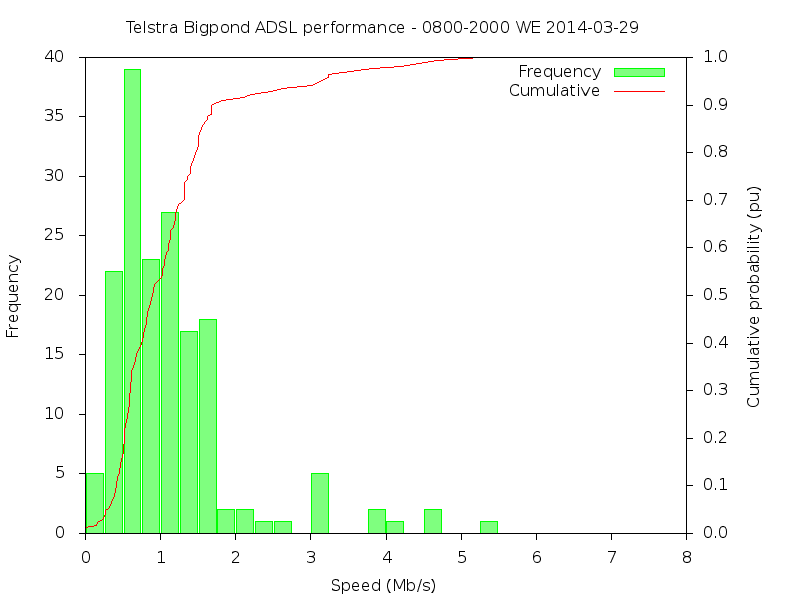 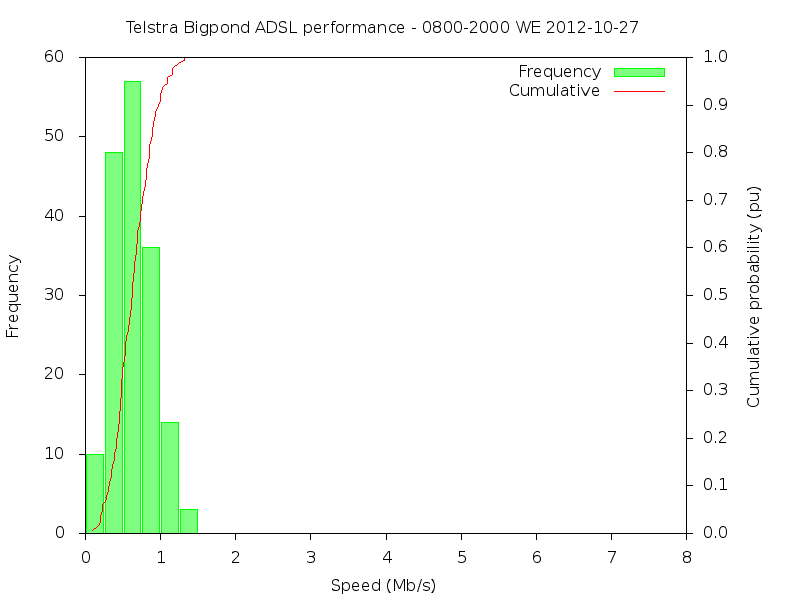 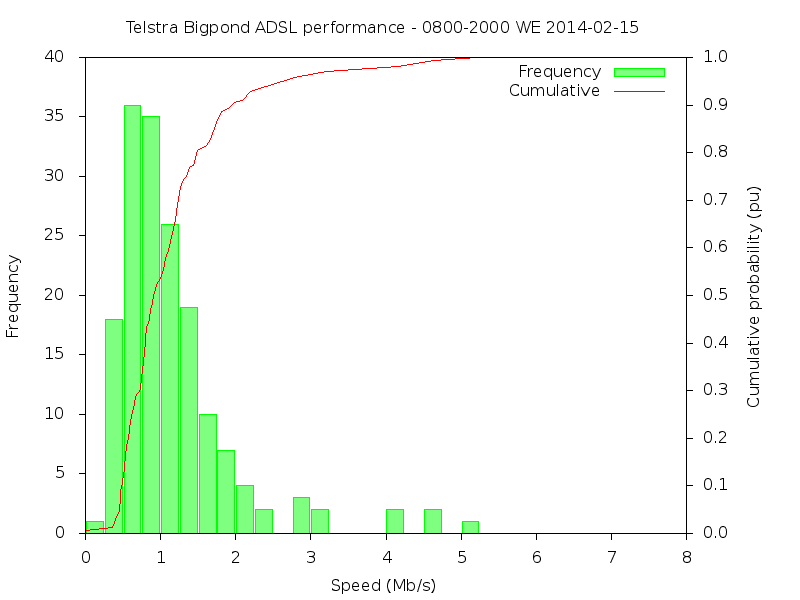 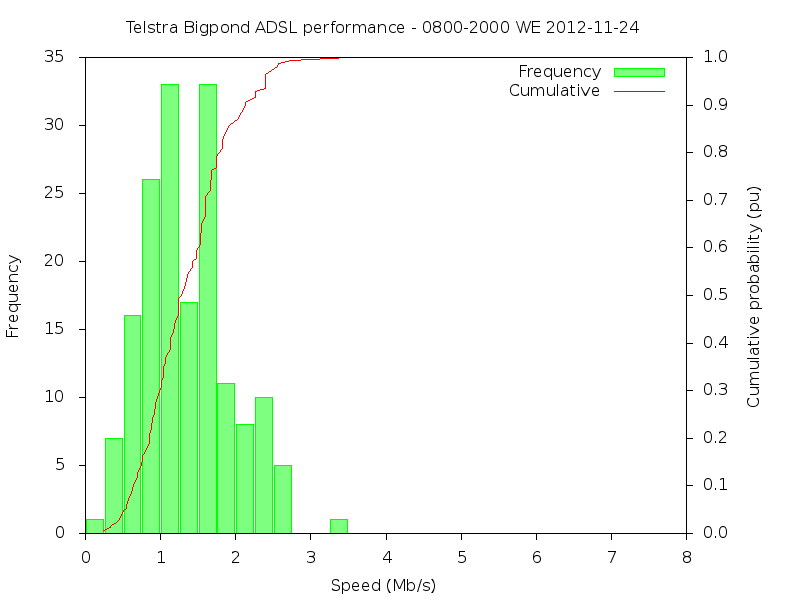 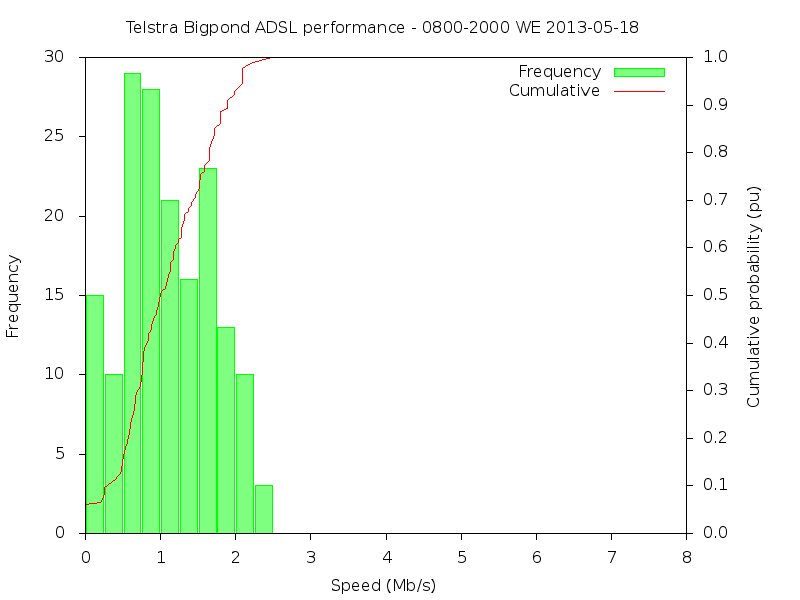 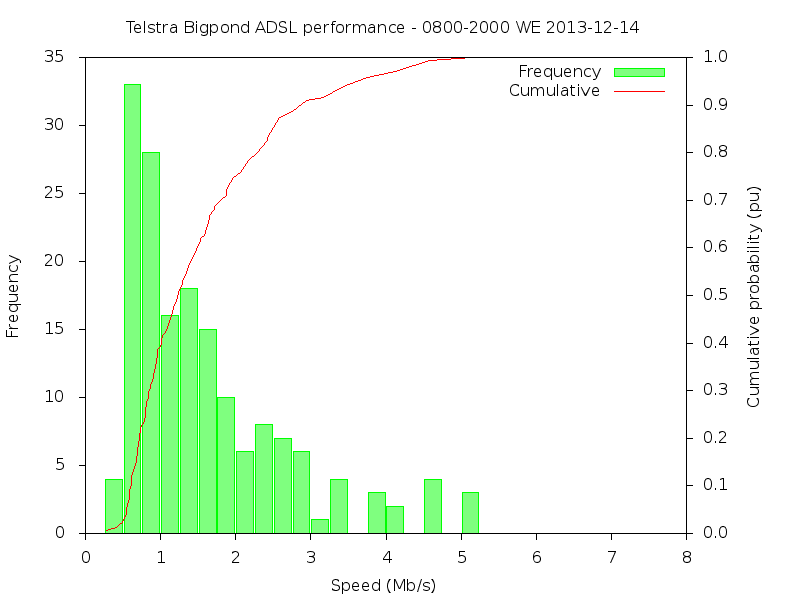 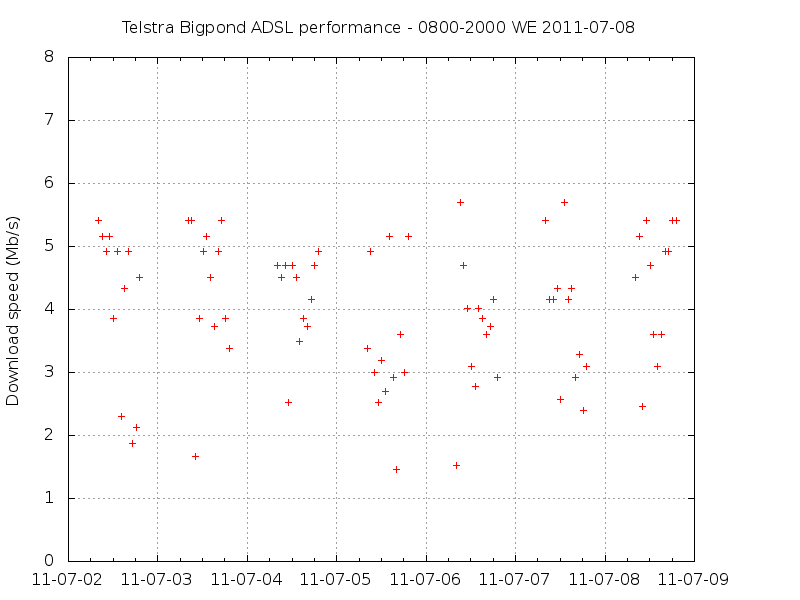 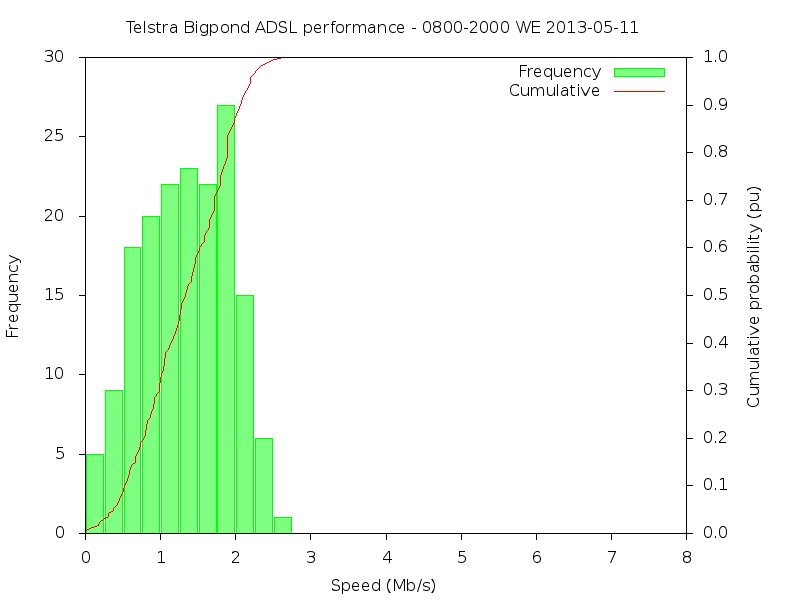 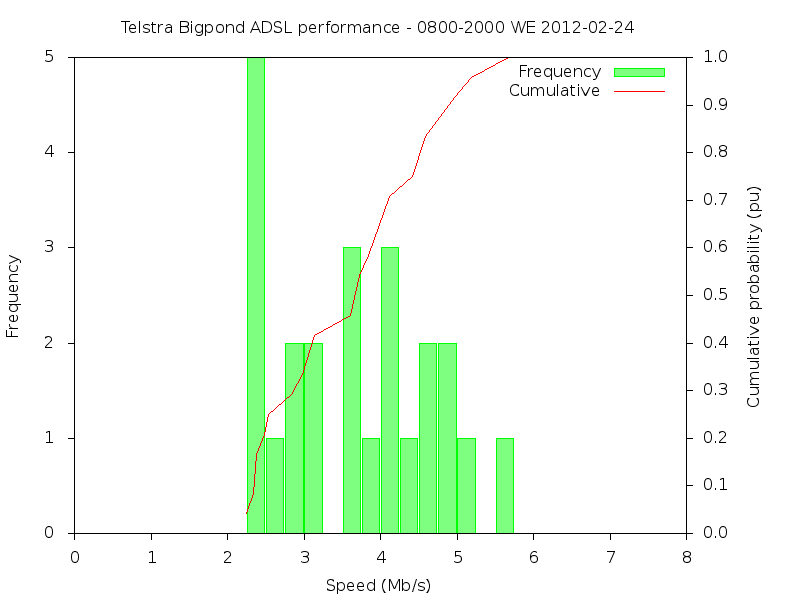 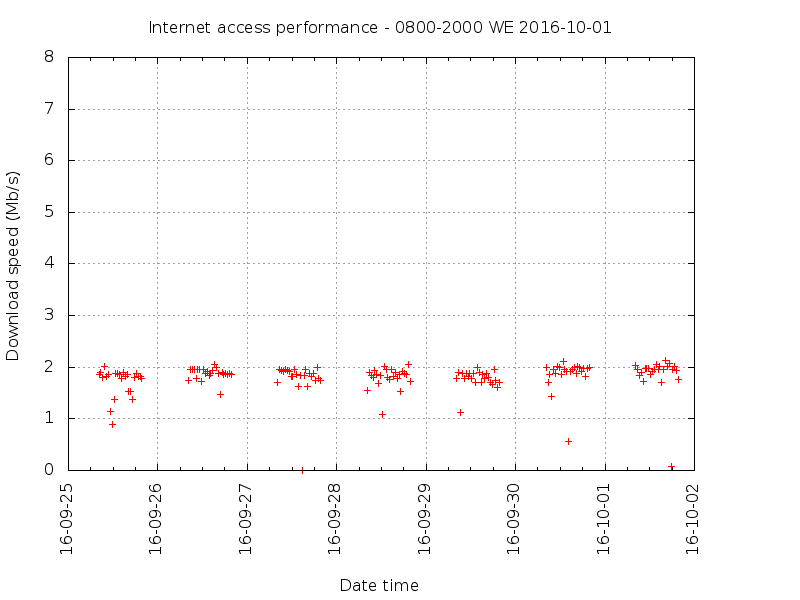 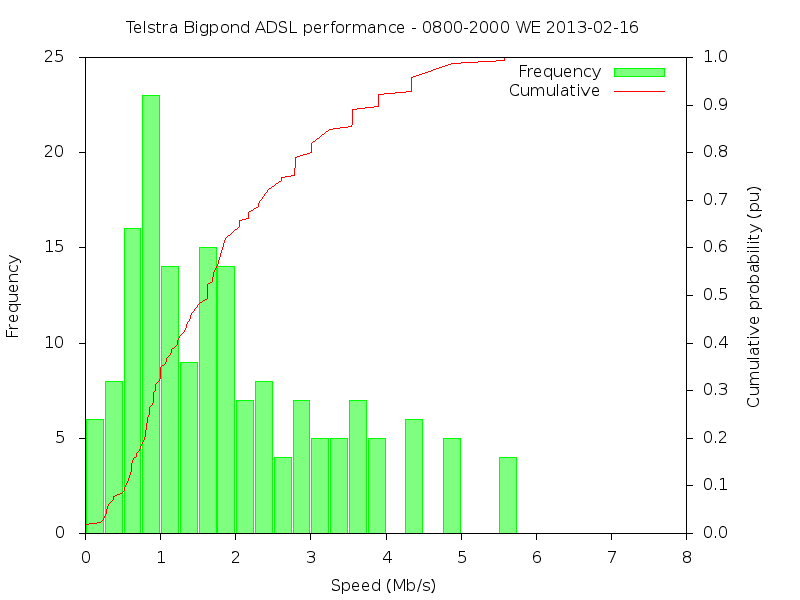 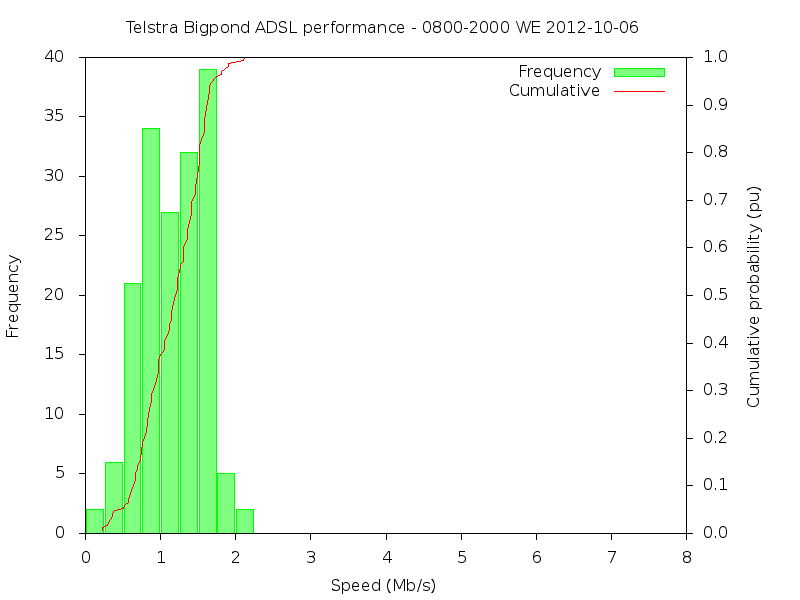 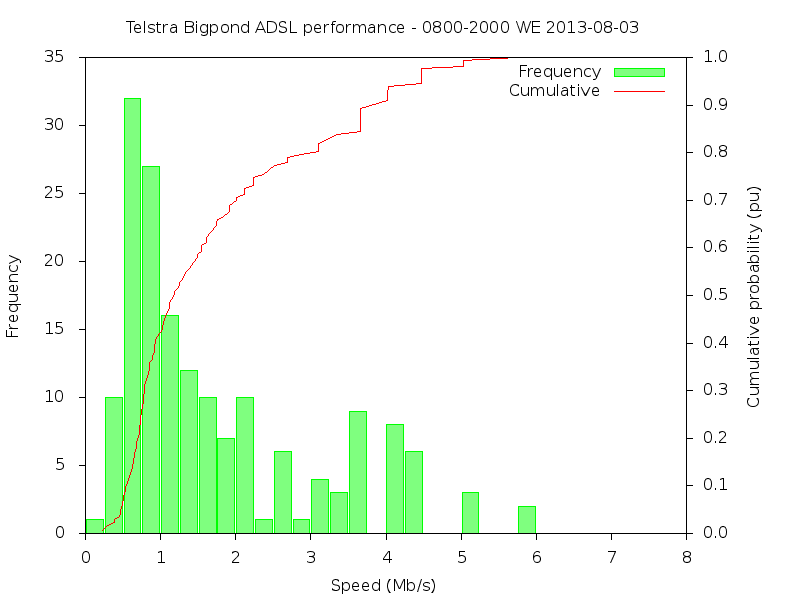 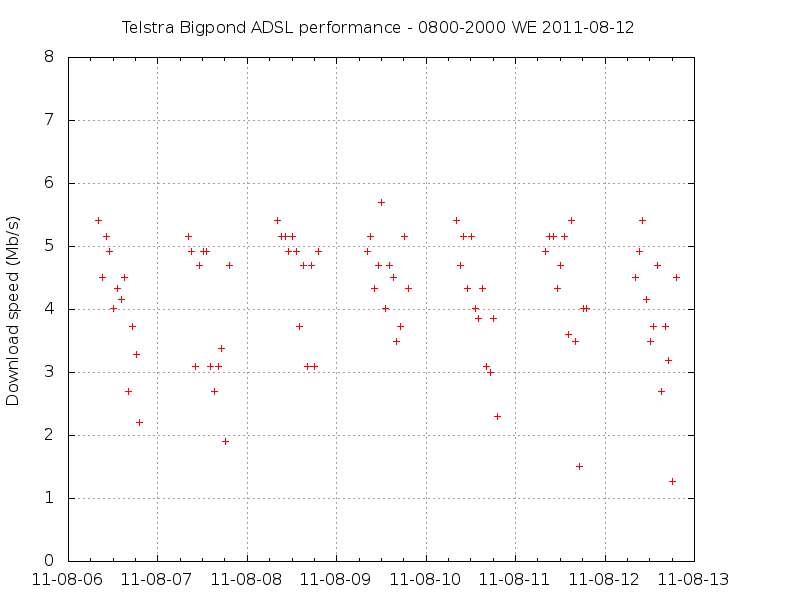 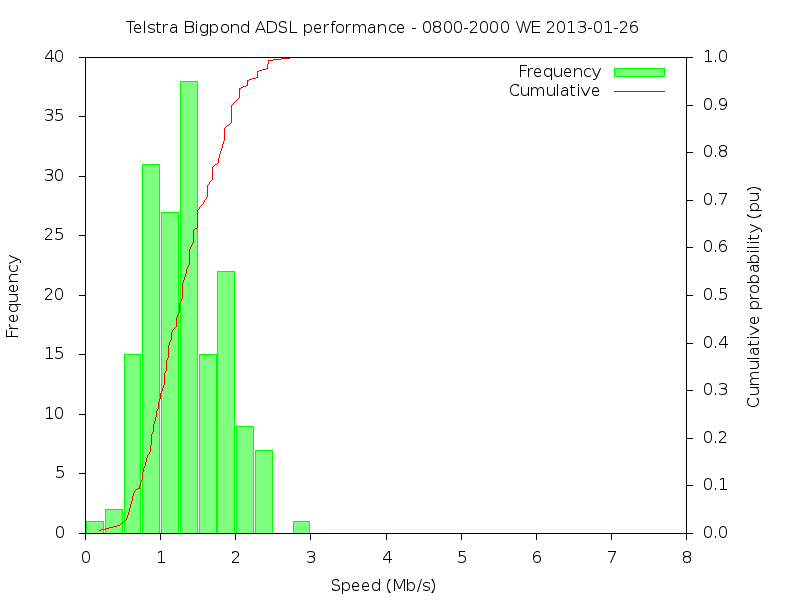 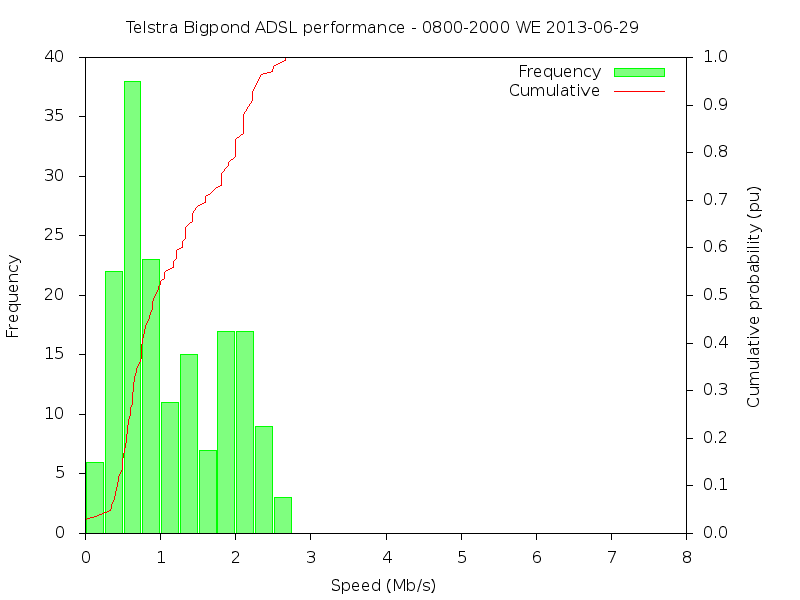 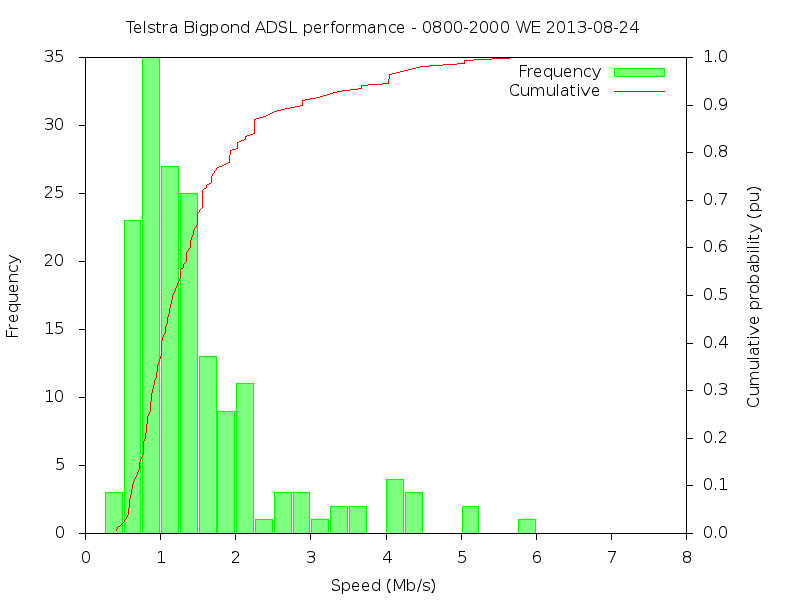 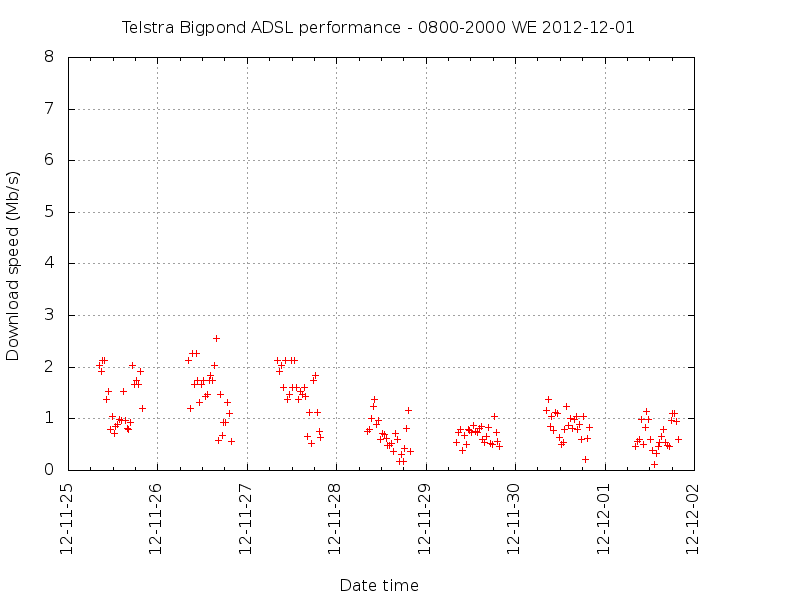 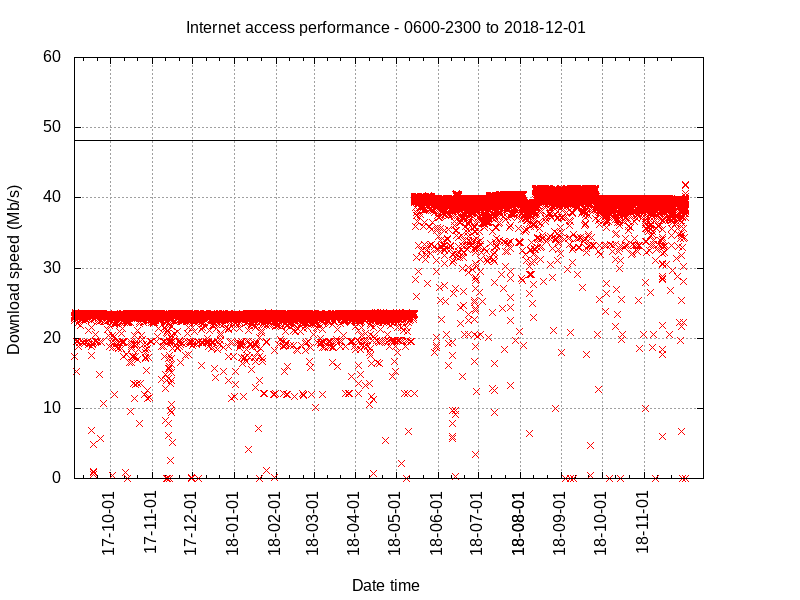 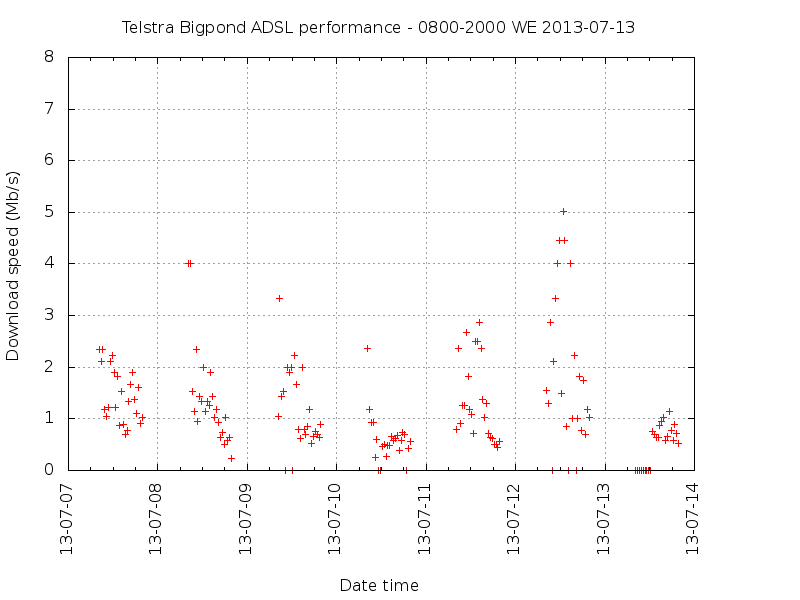 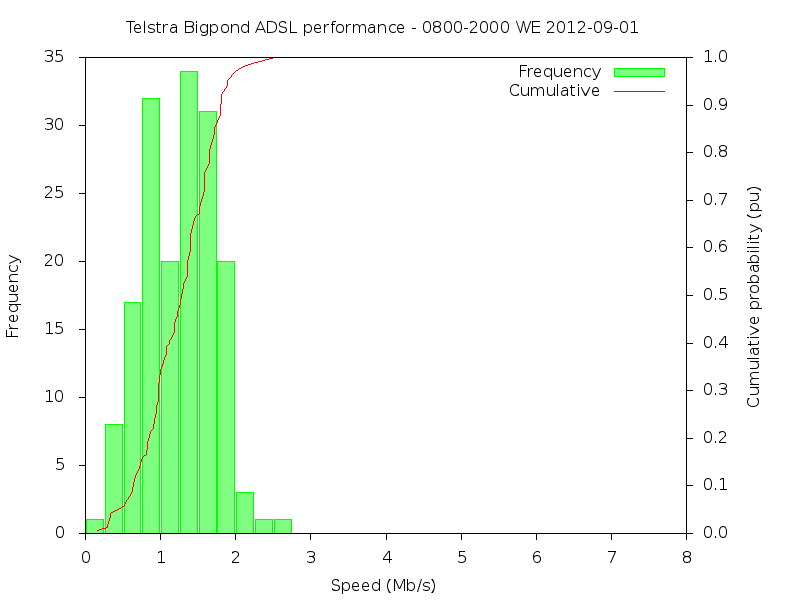 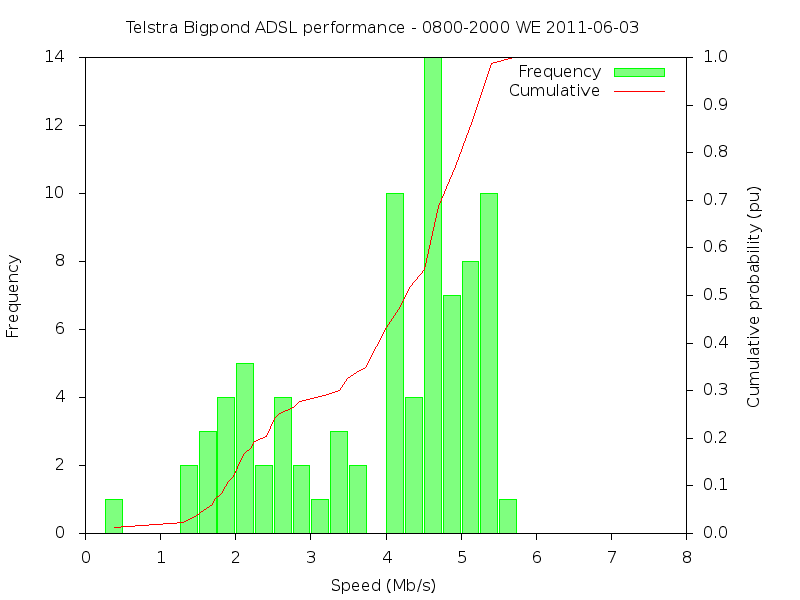 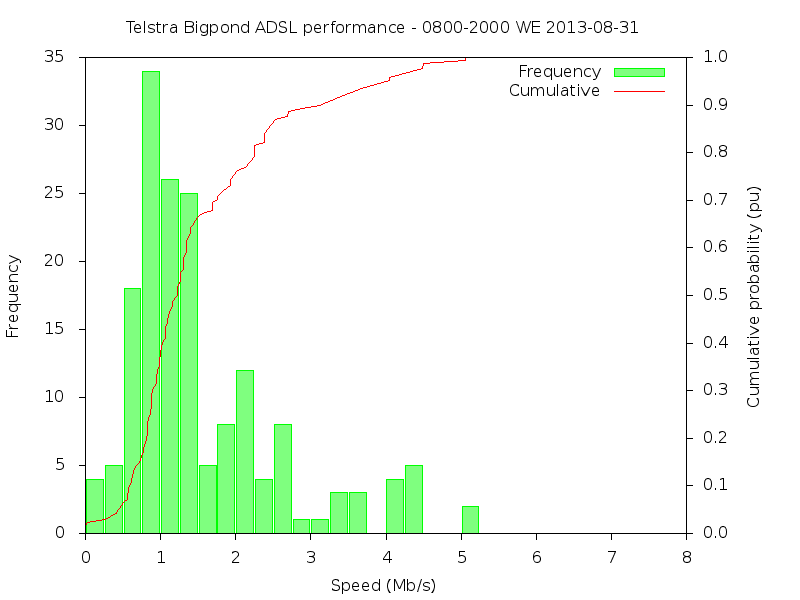 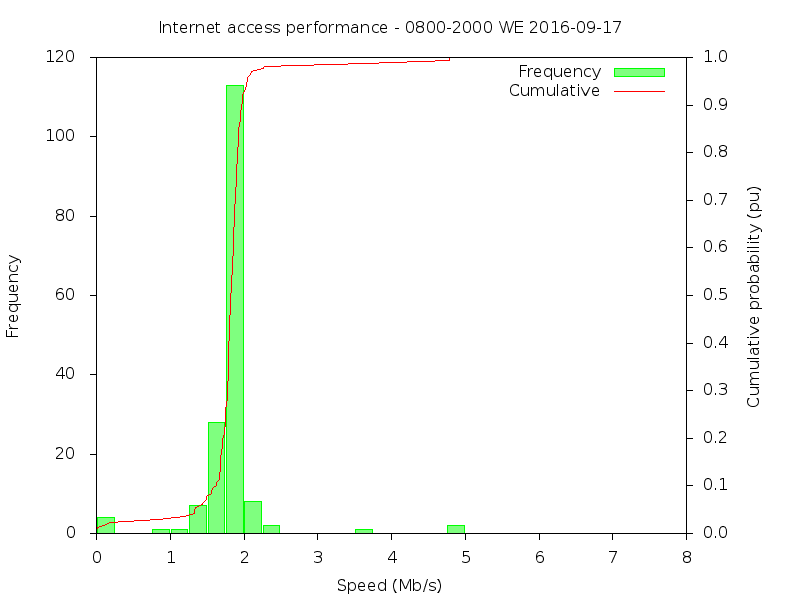 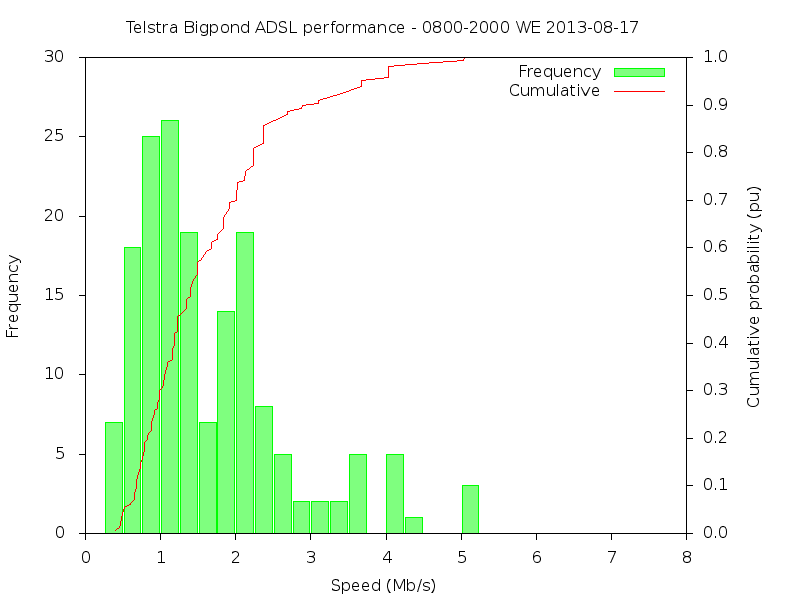 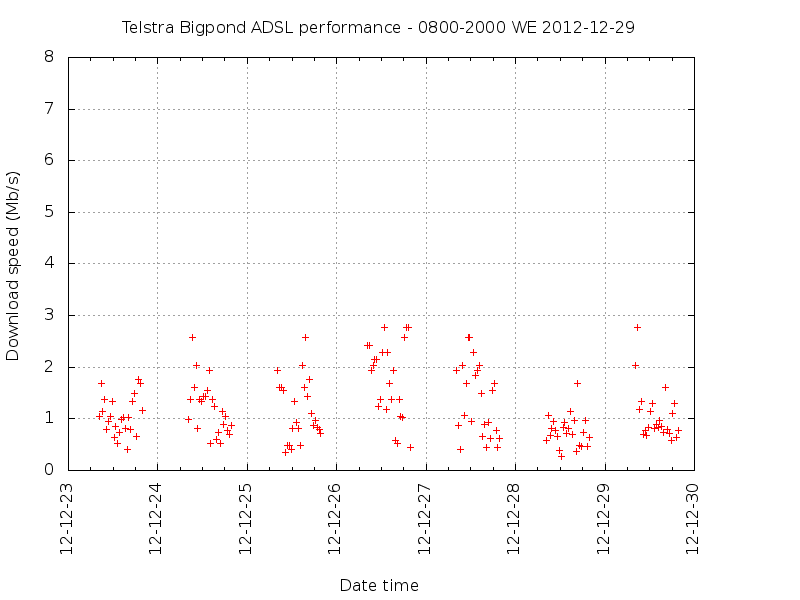 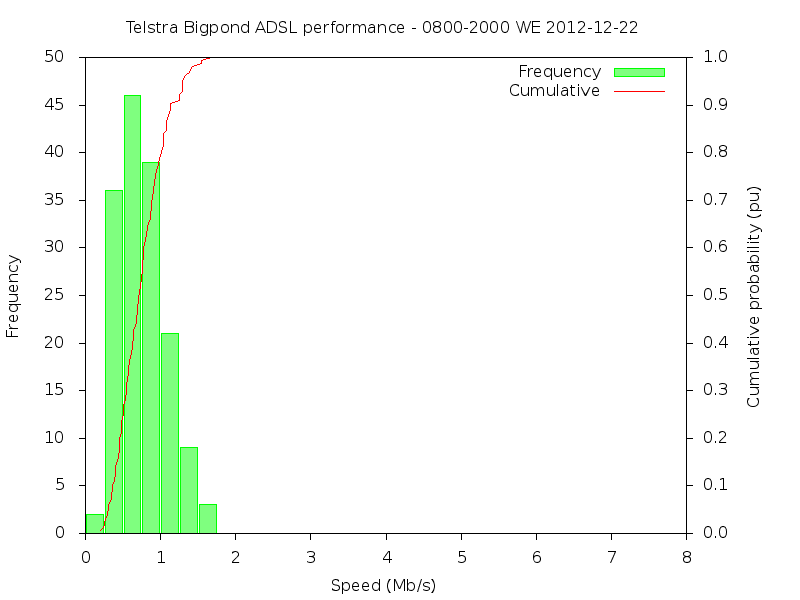 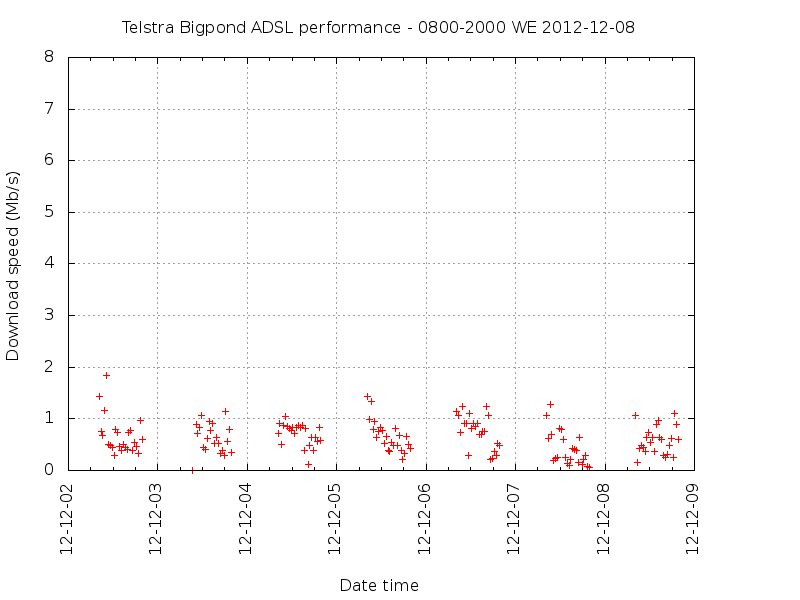 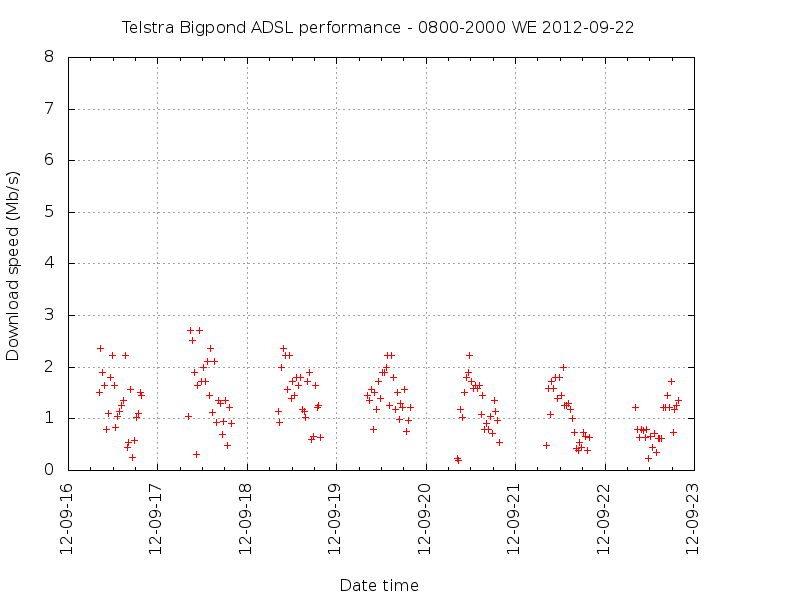 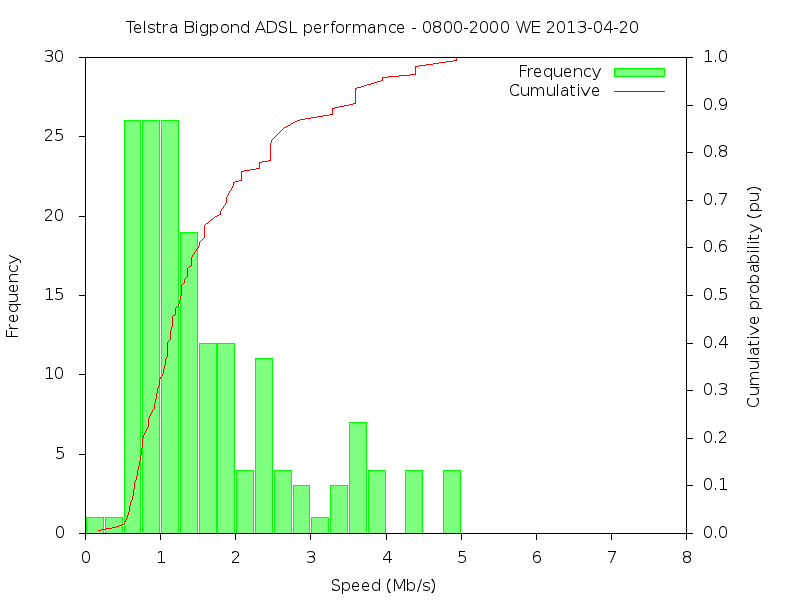 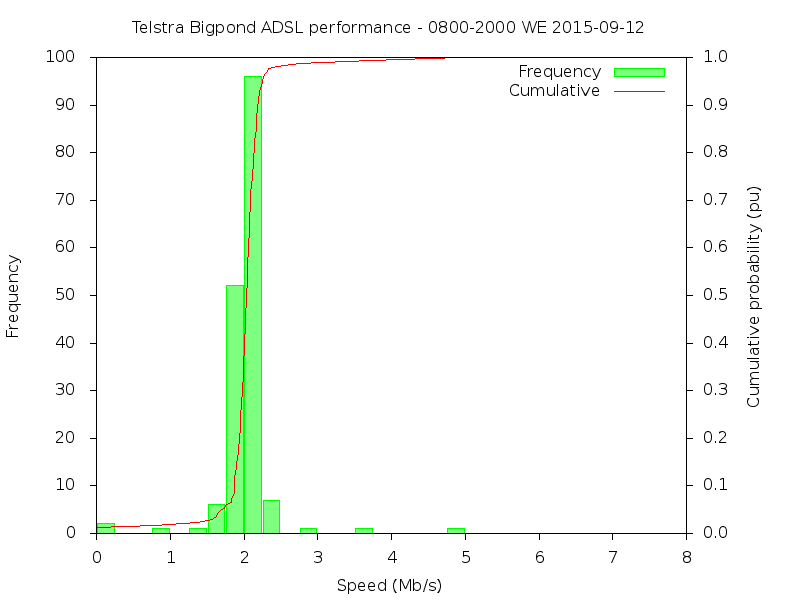 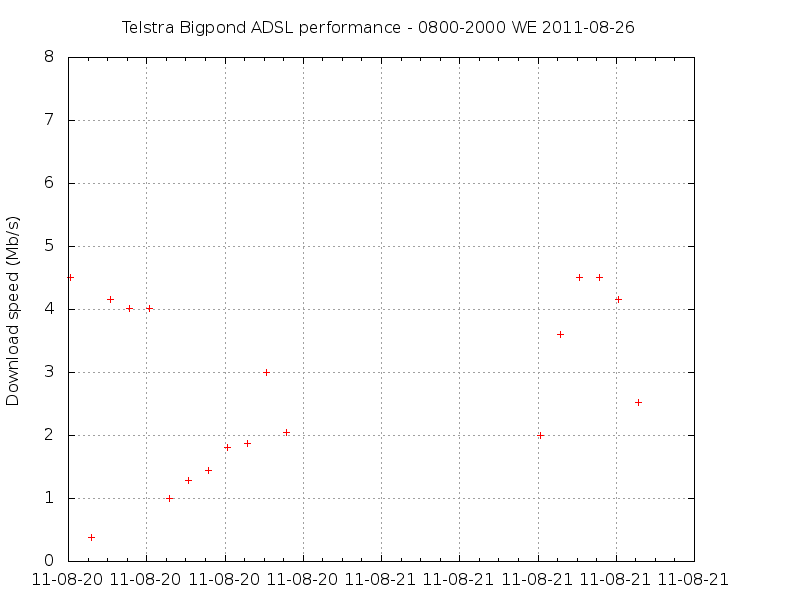 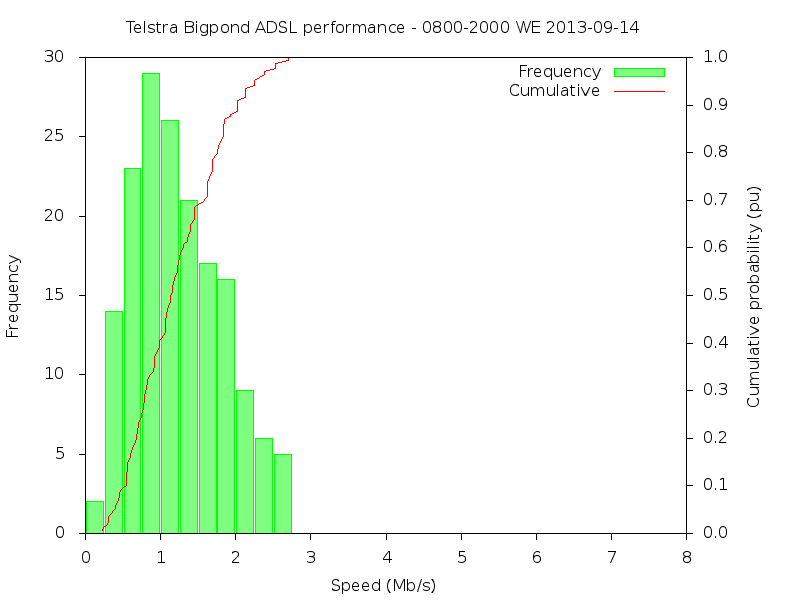 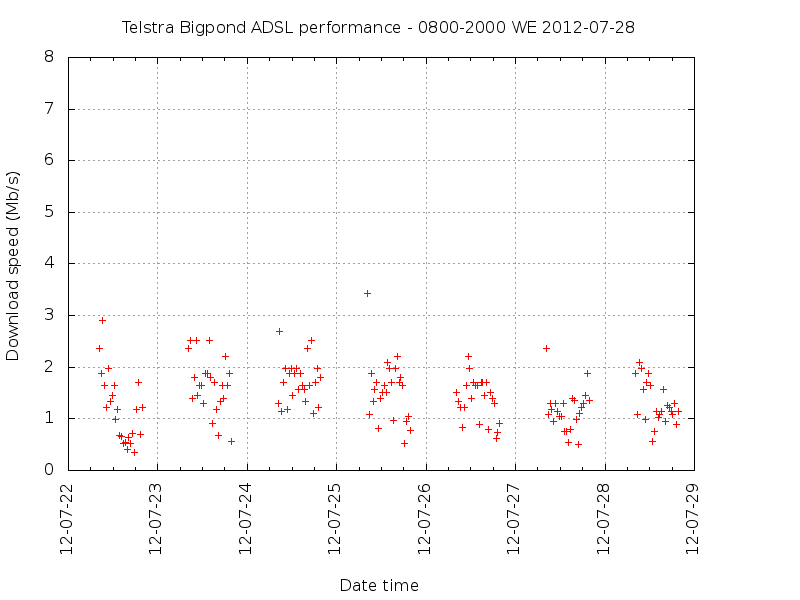 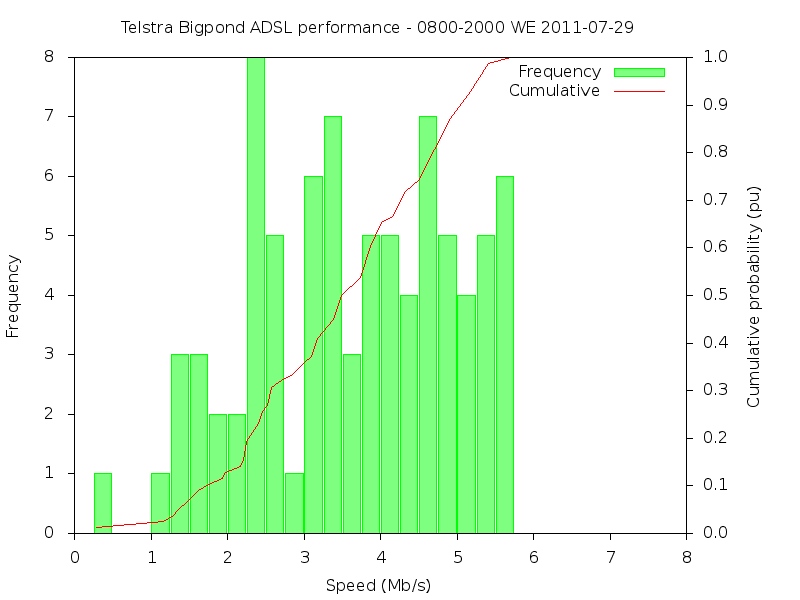 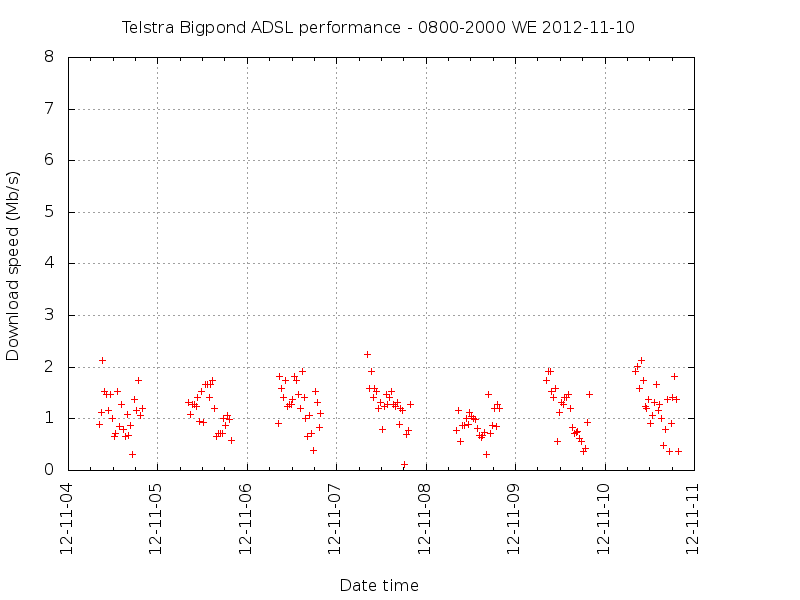 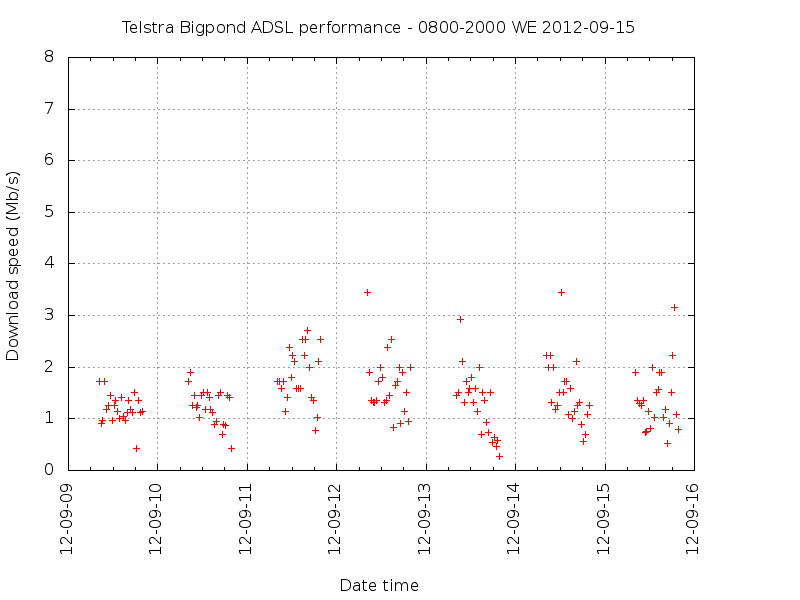 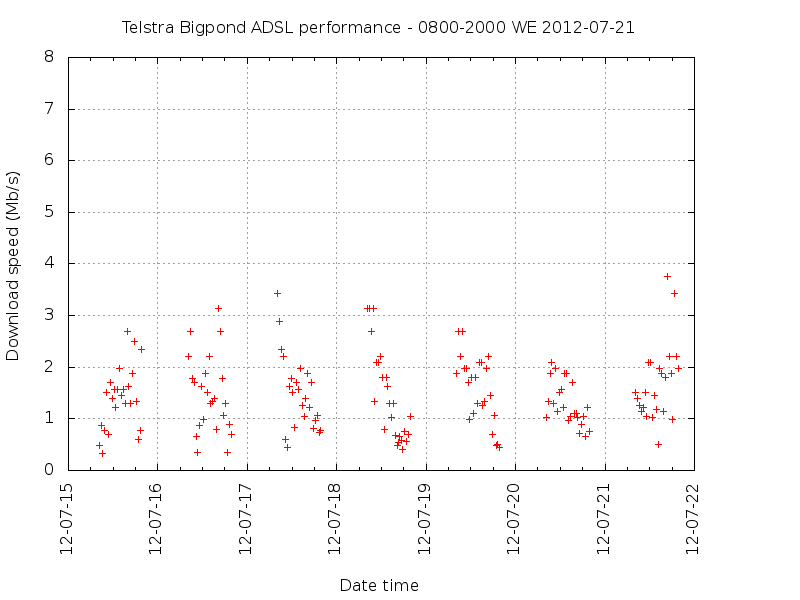 The performance problem here is not copper based, but in the fibre backhaul. 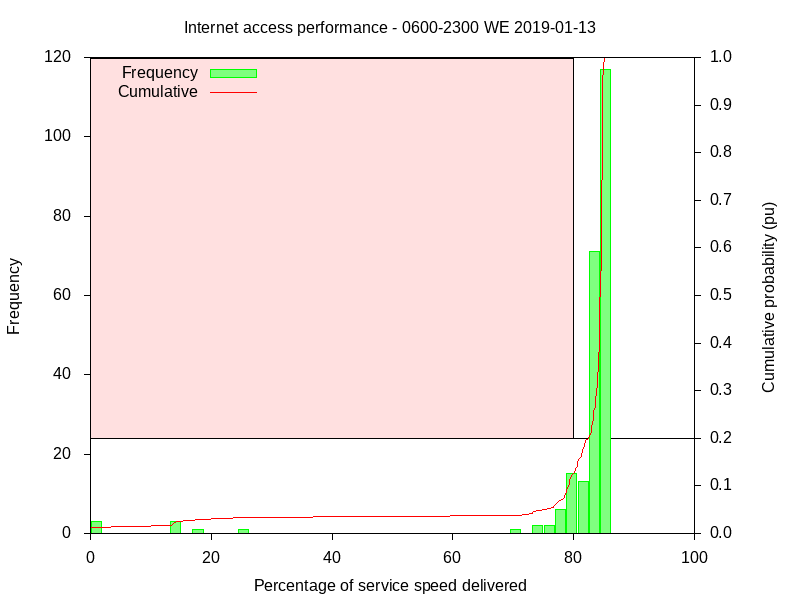 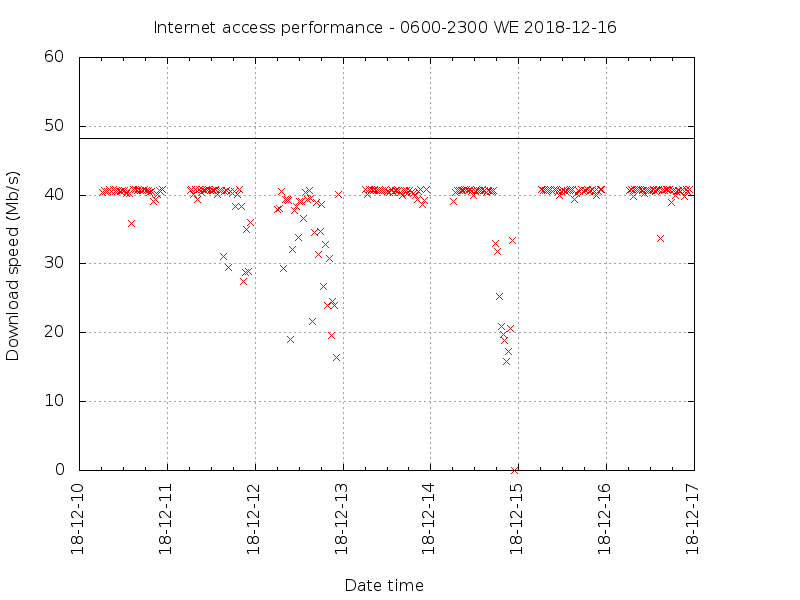 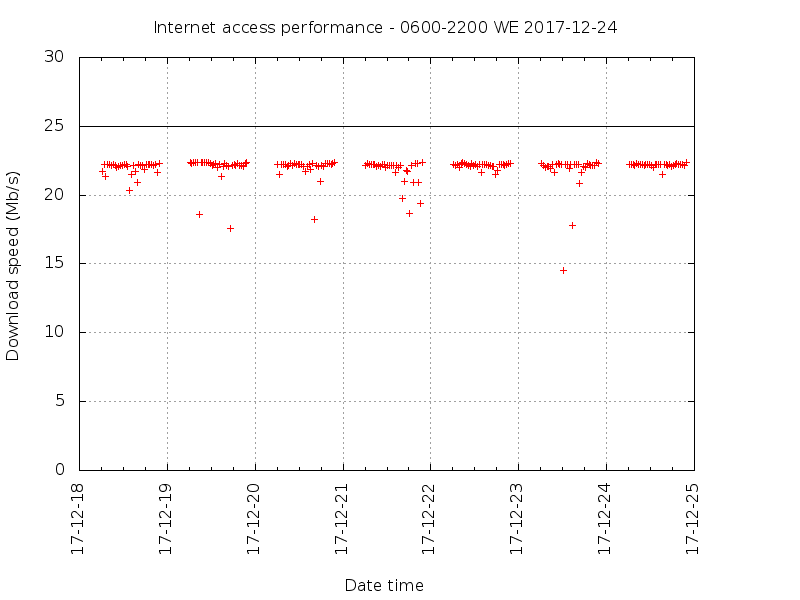 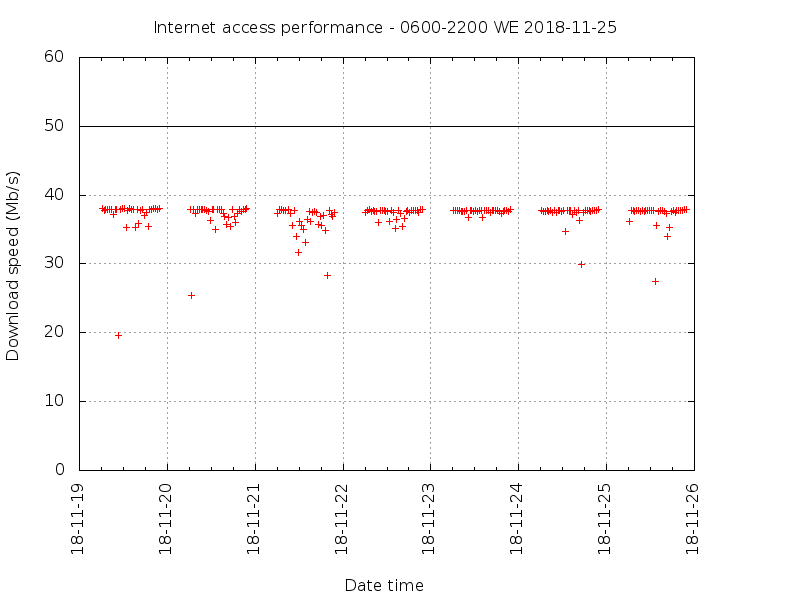 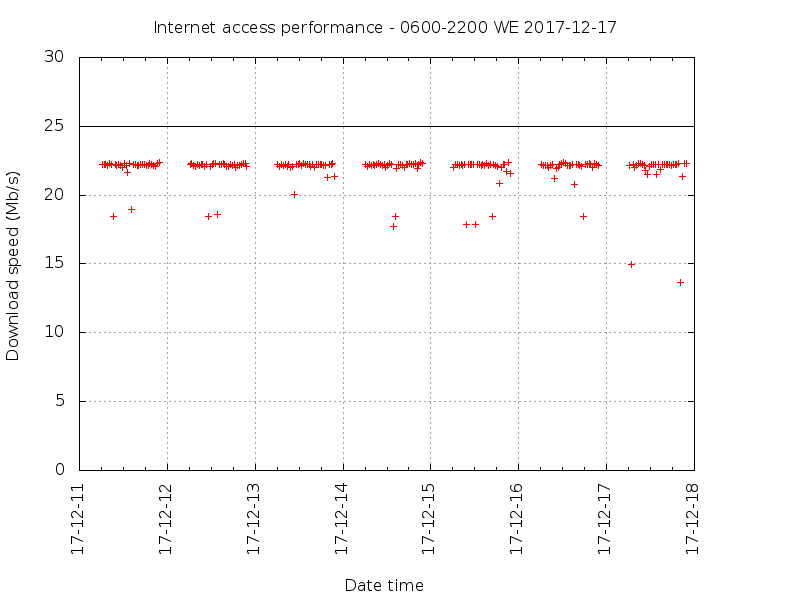 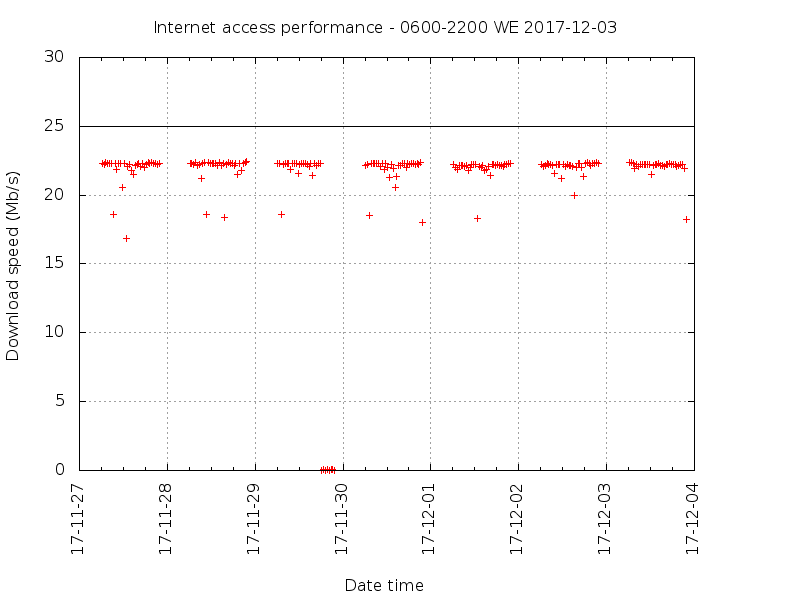 Though these measurements are of a single ADSL service, one expects that this performance is widespread, in this case (Jan 2015) the DSLAM accommodates up to 128 subscribers on a STM-1 (155,000,000b/s) backhaul and we might expect it has more than 100 subscribers, and these DSLAMs exist all over the network and whilst the NBN is seen as the solution, it is actually the underlying cause. 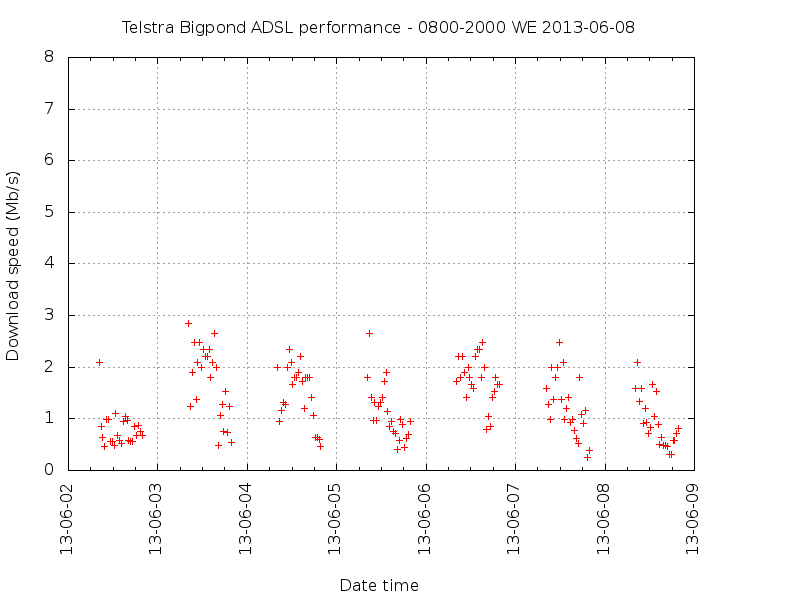 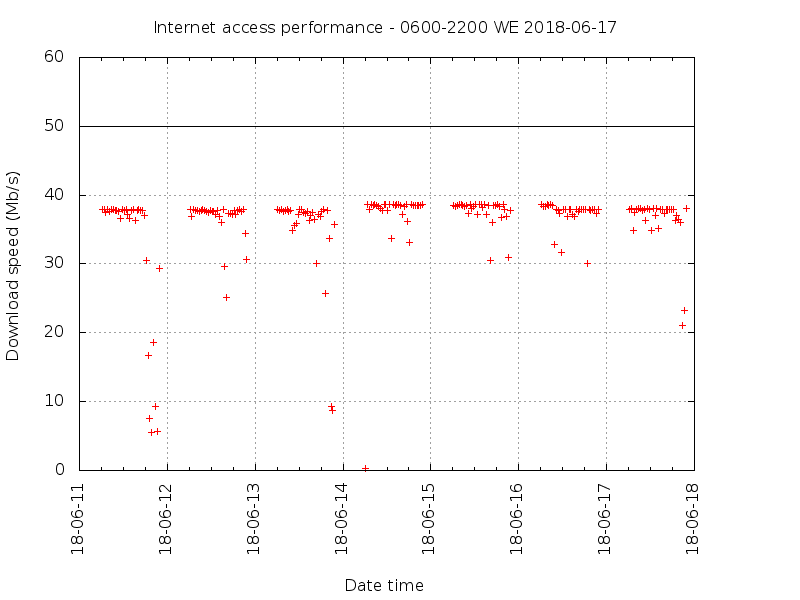 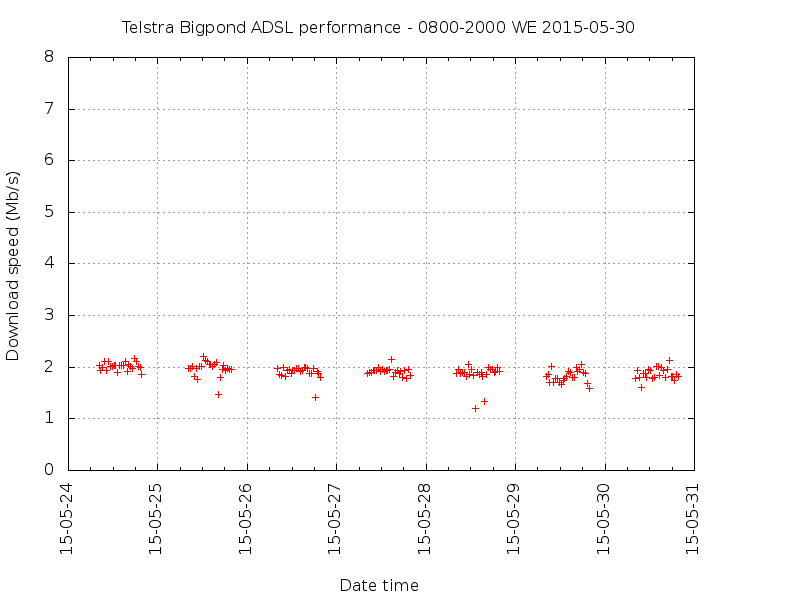 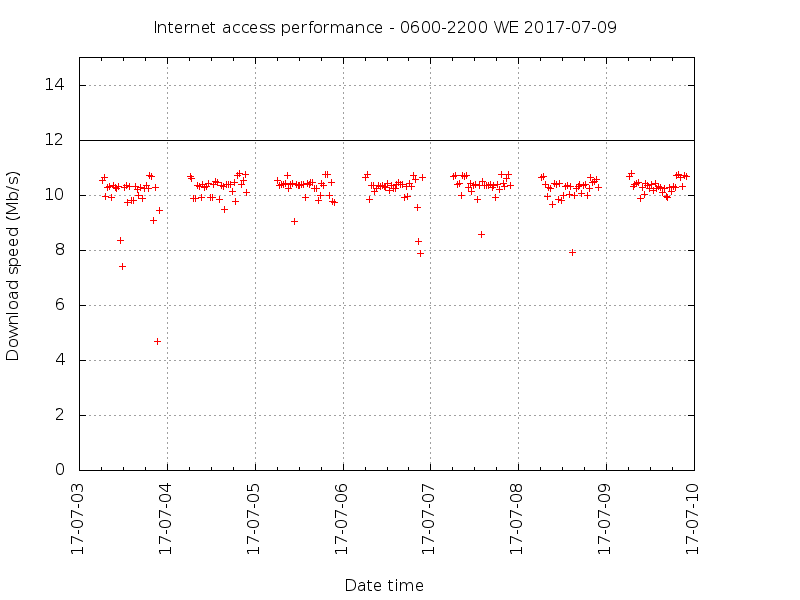 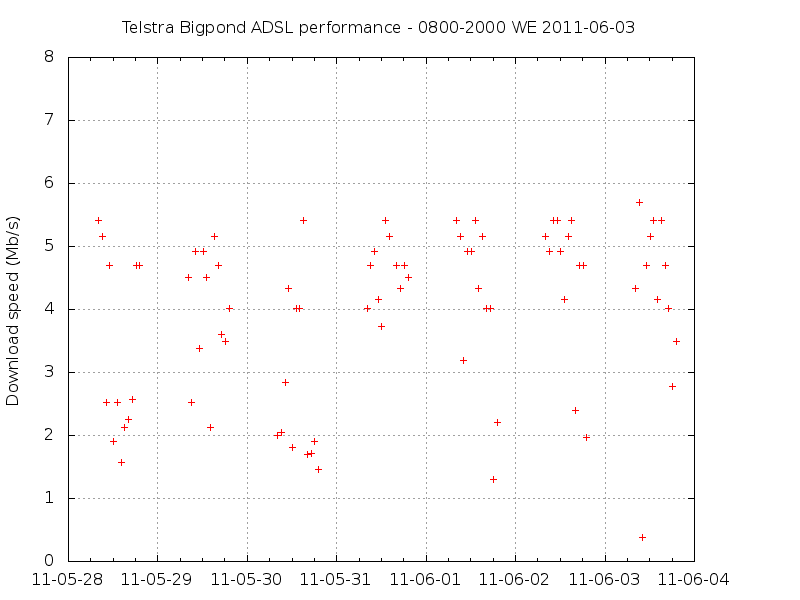 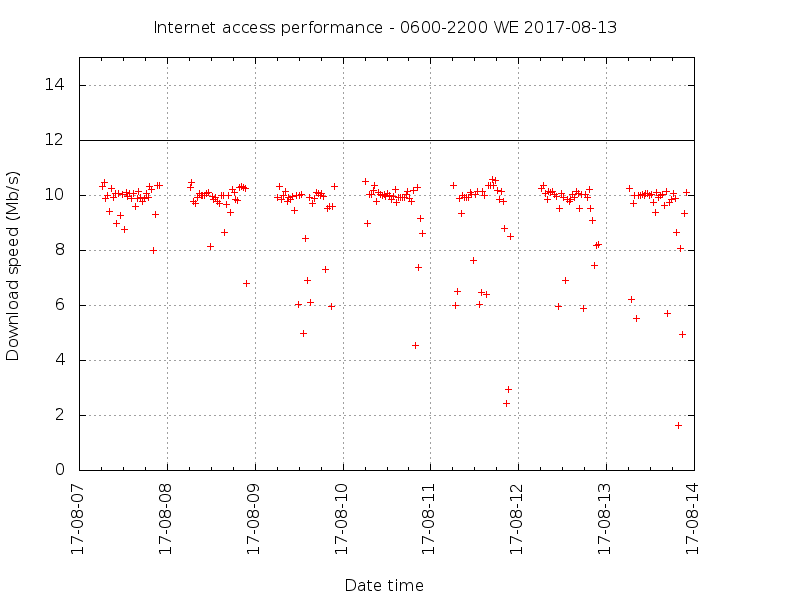 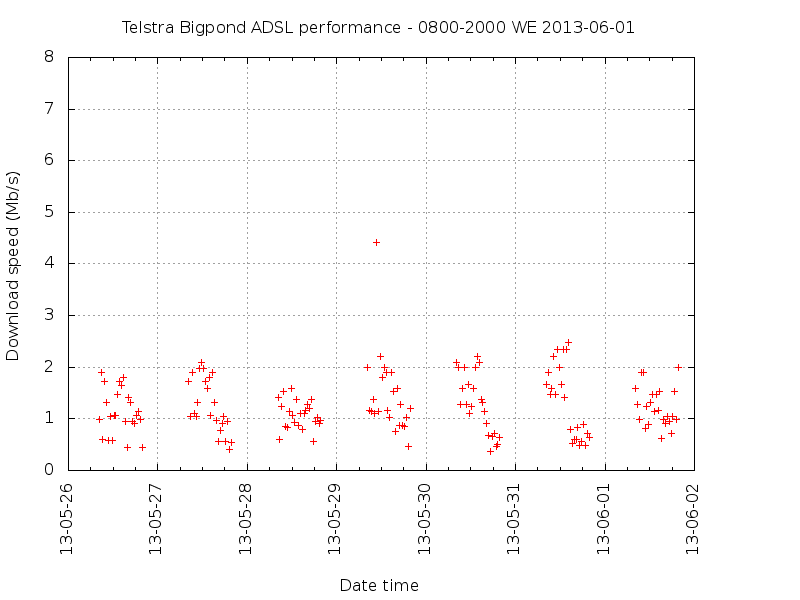 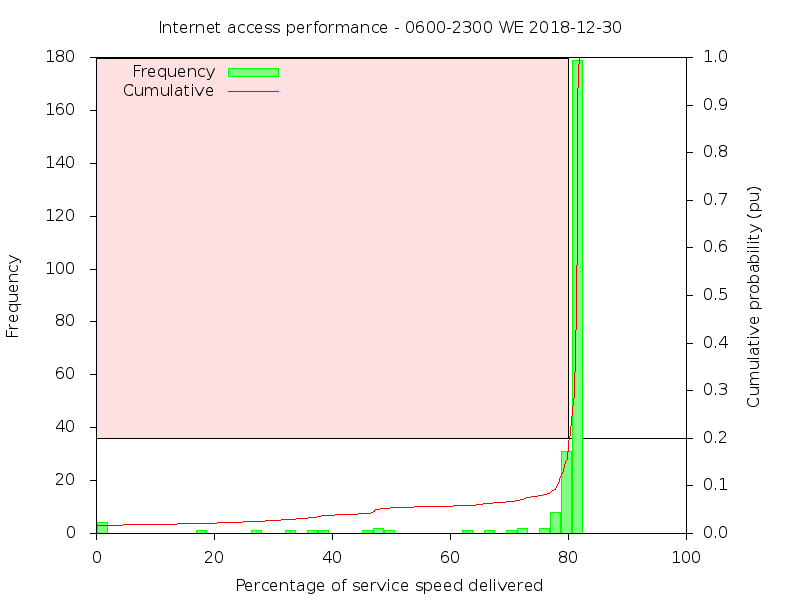 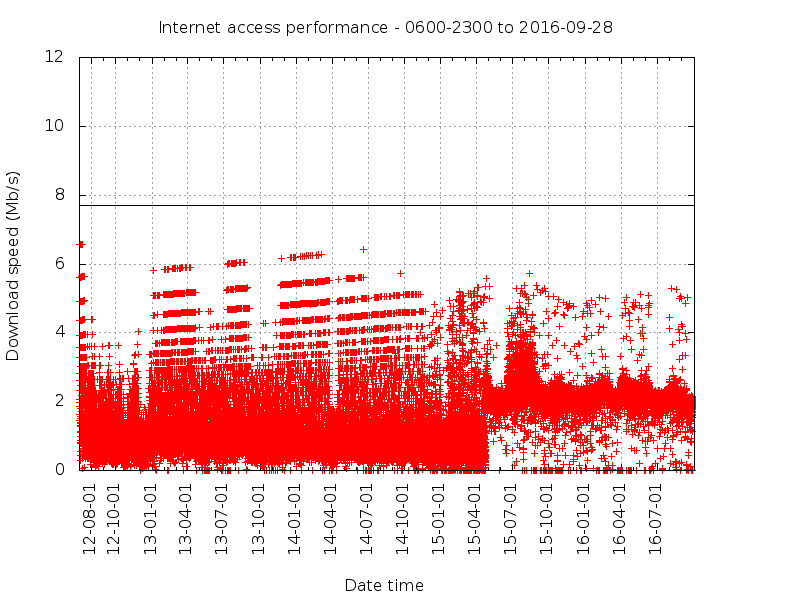 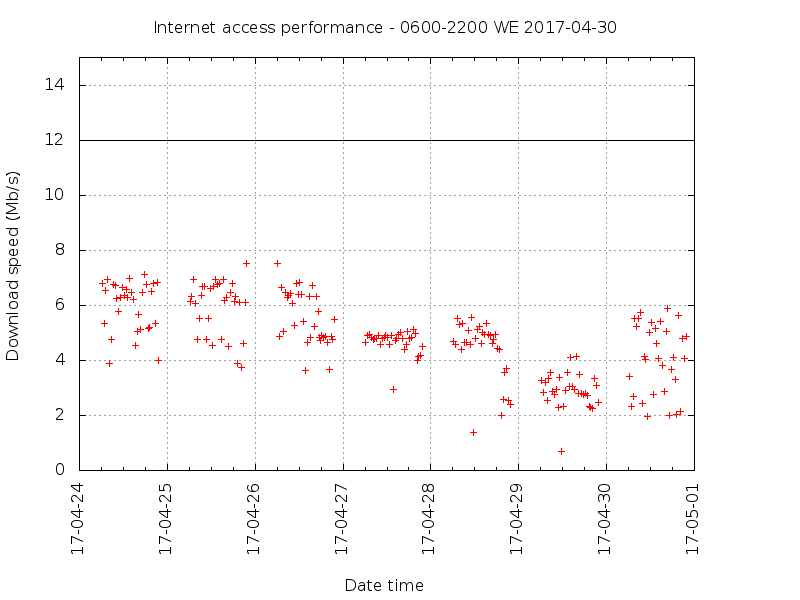 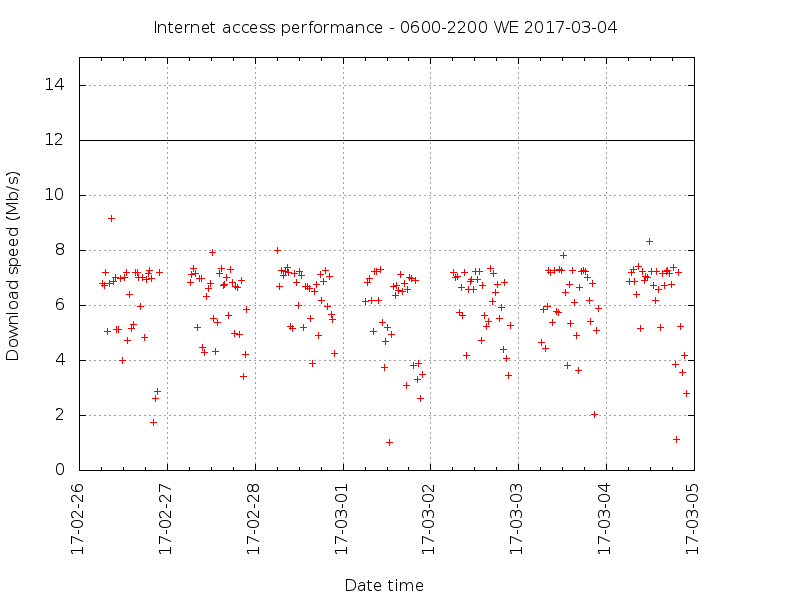 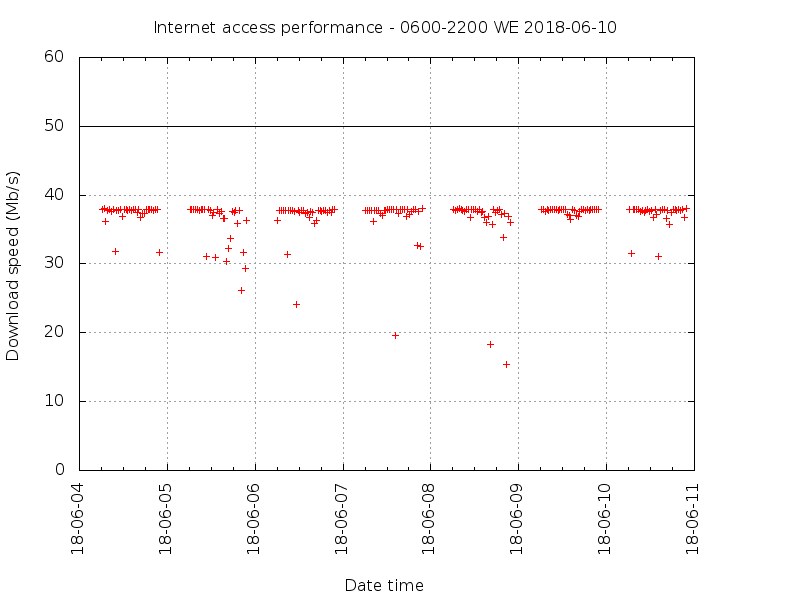 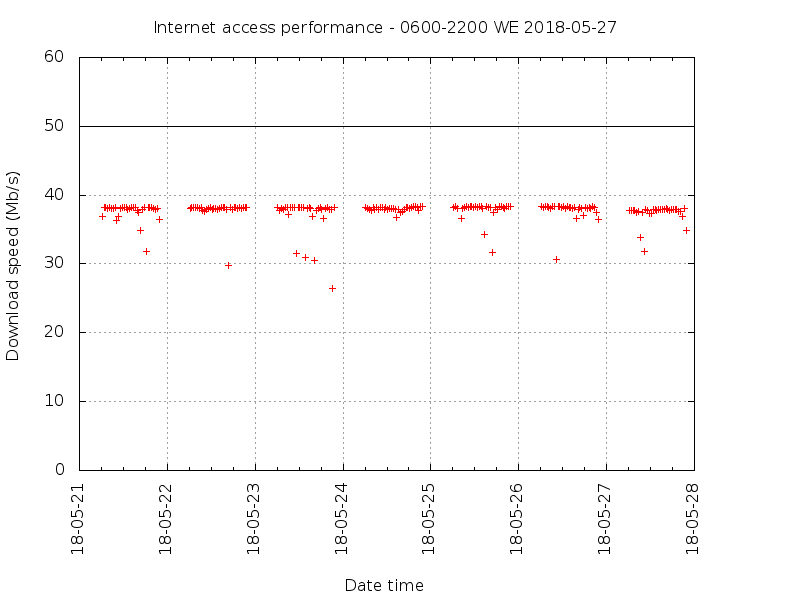 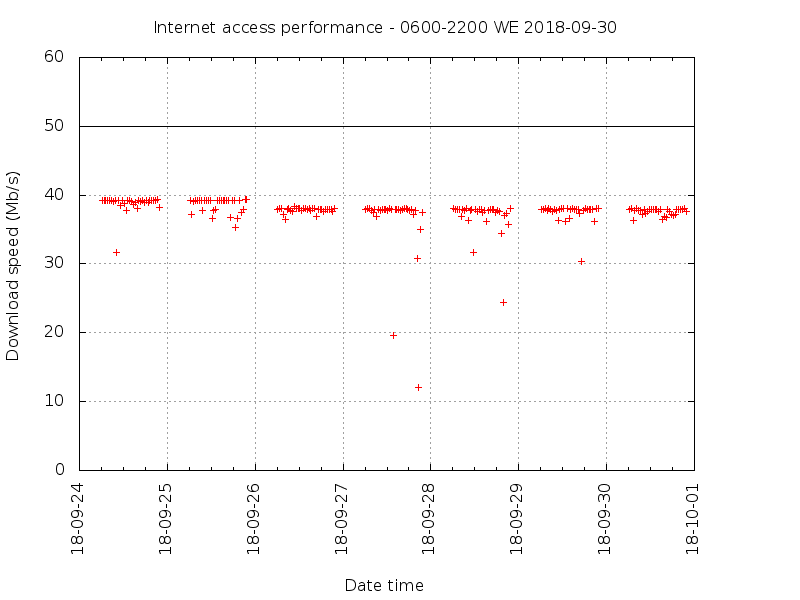 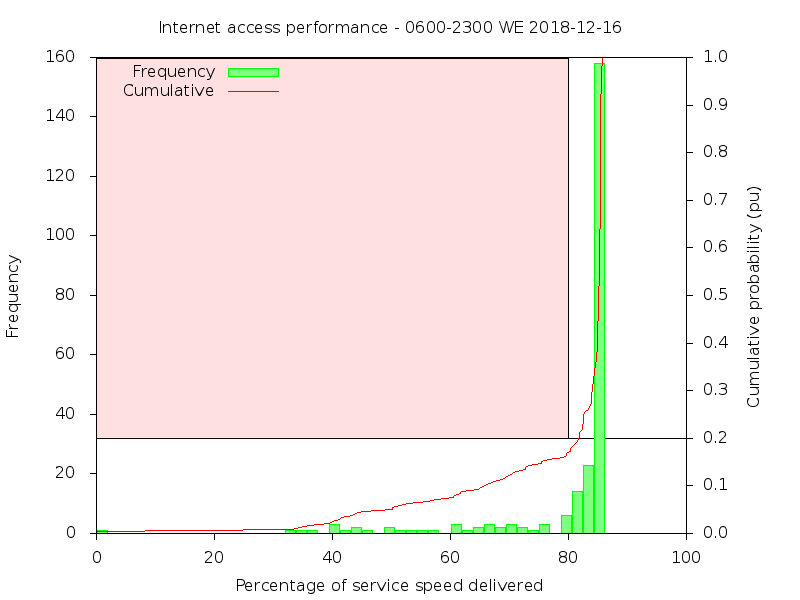 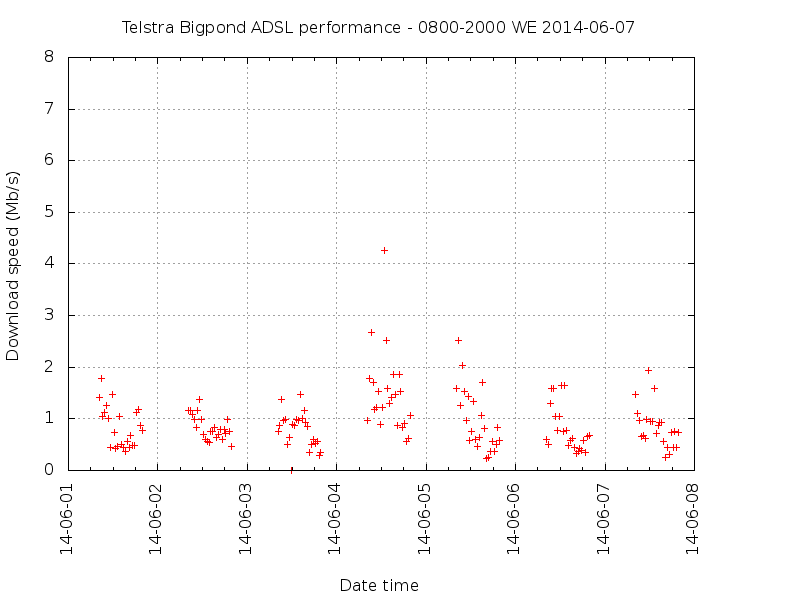 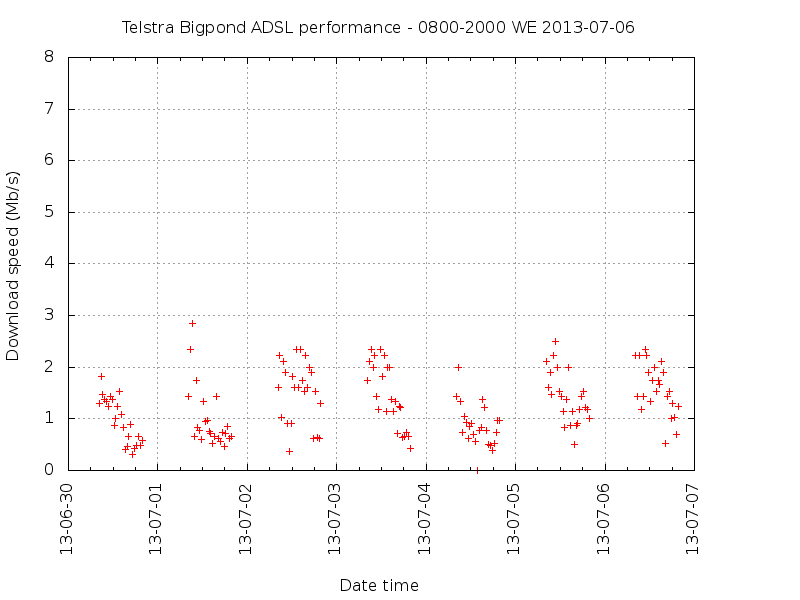 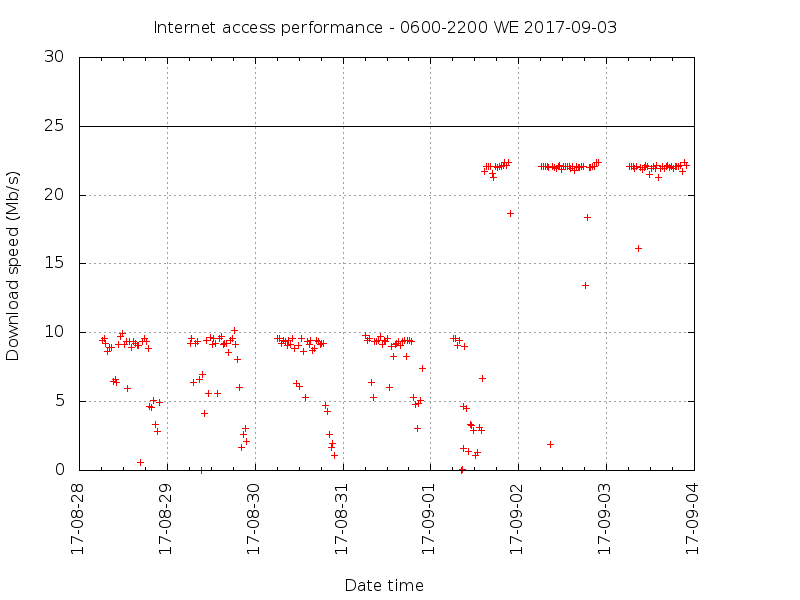 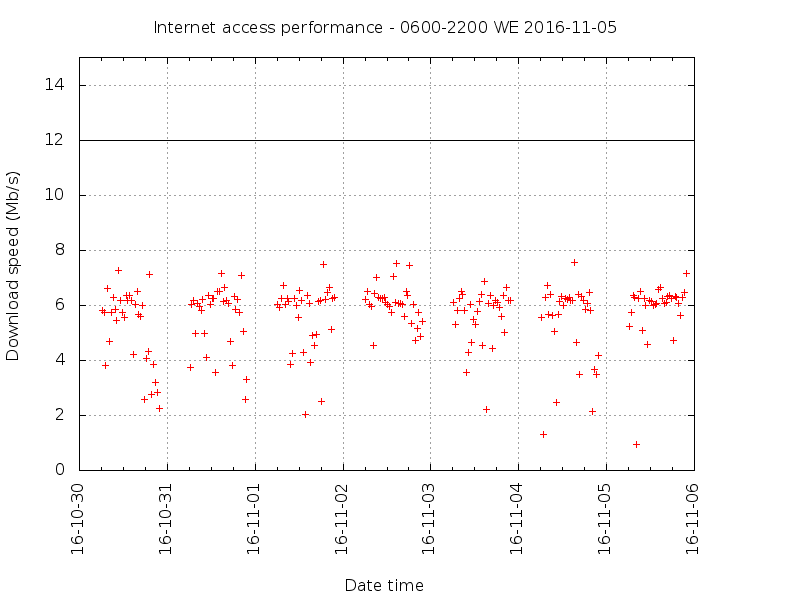 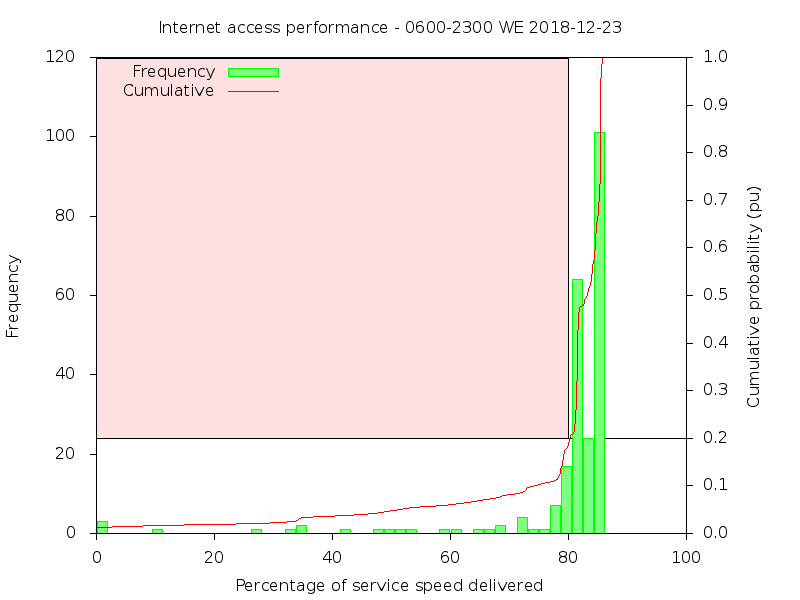 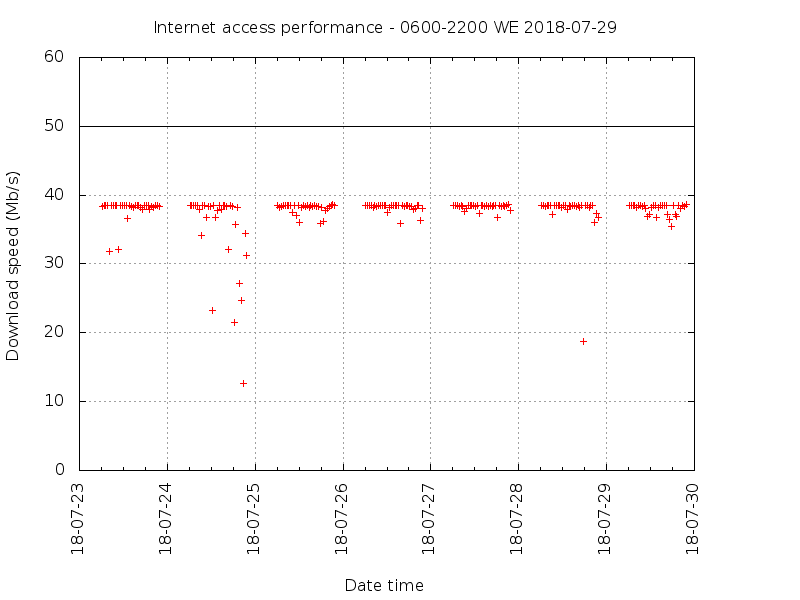 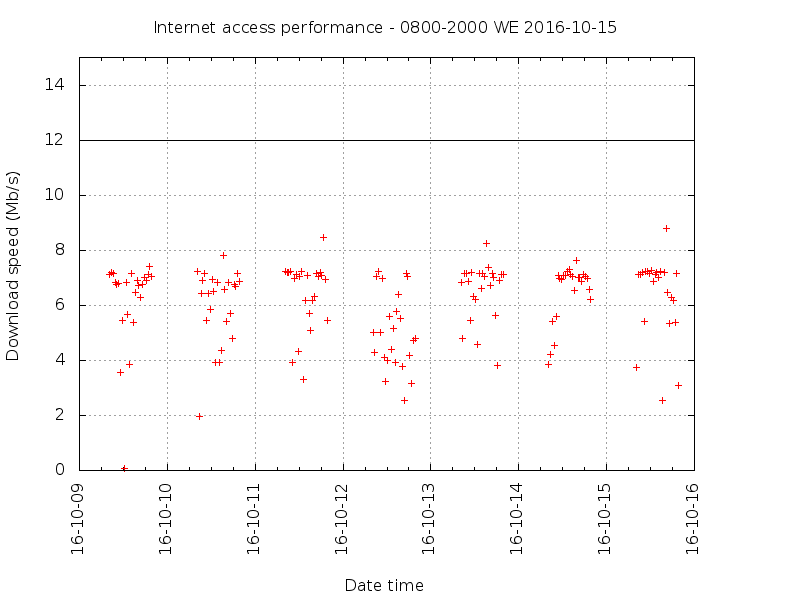 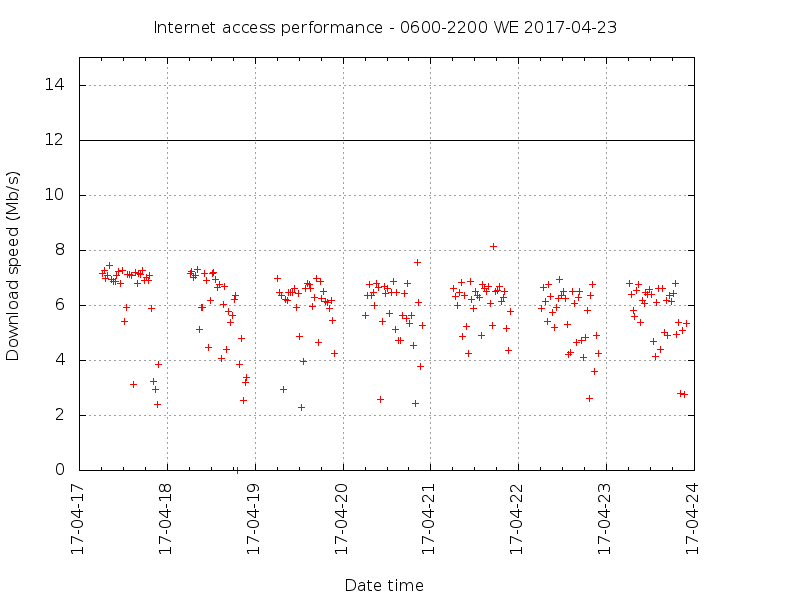 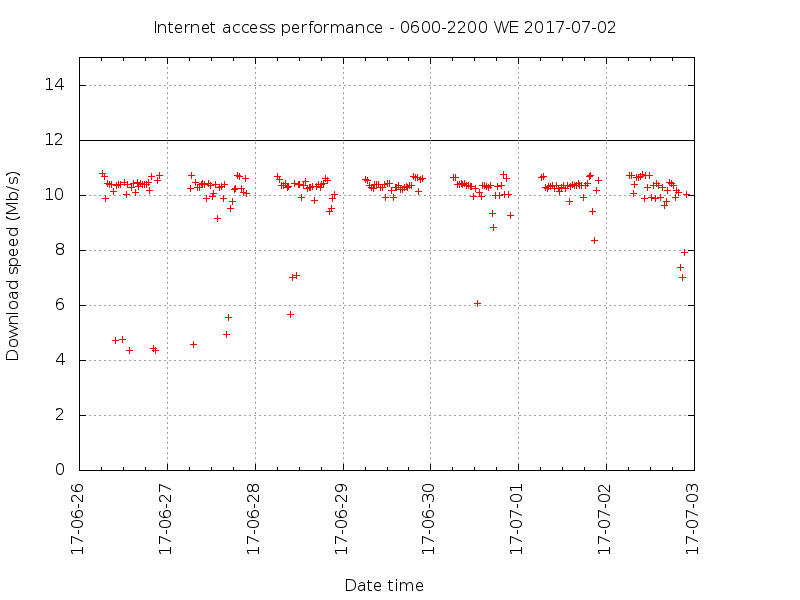 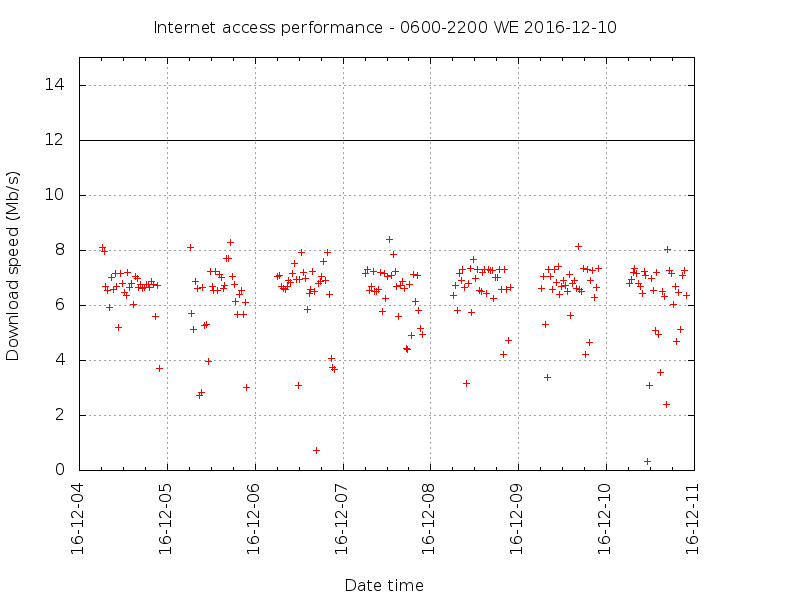 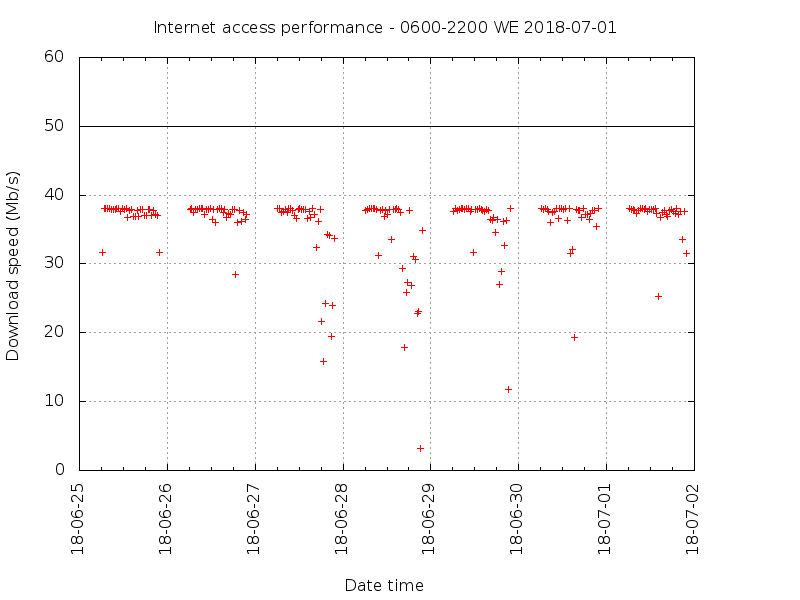 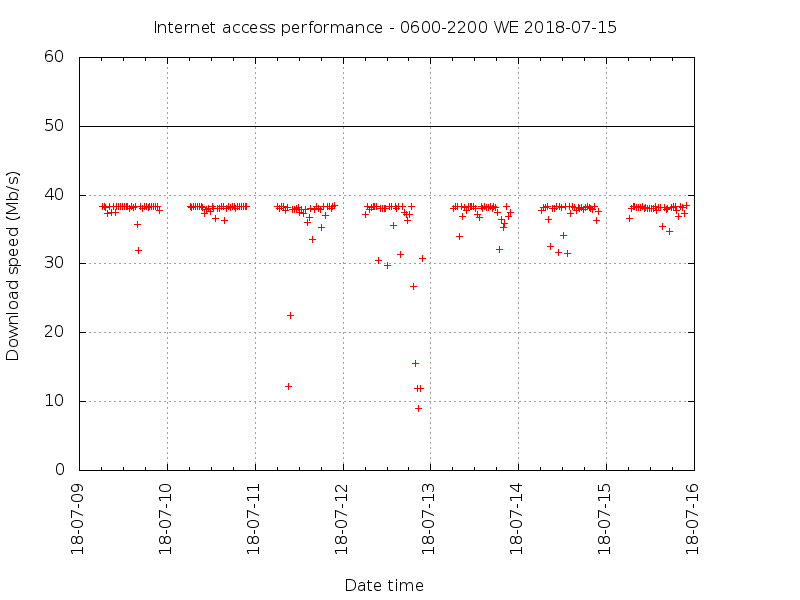 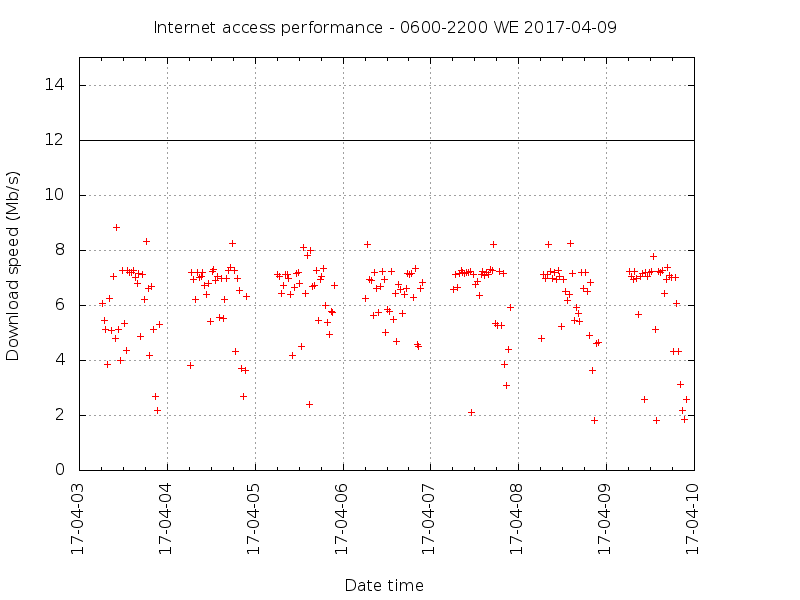 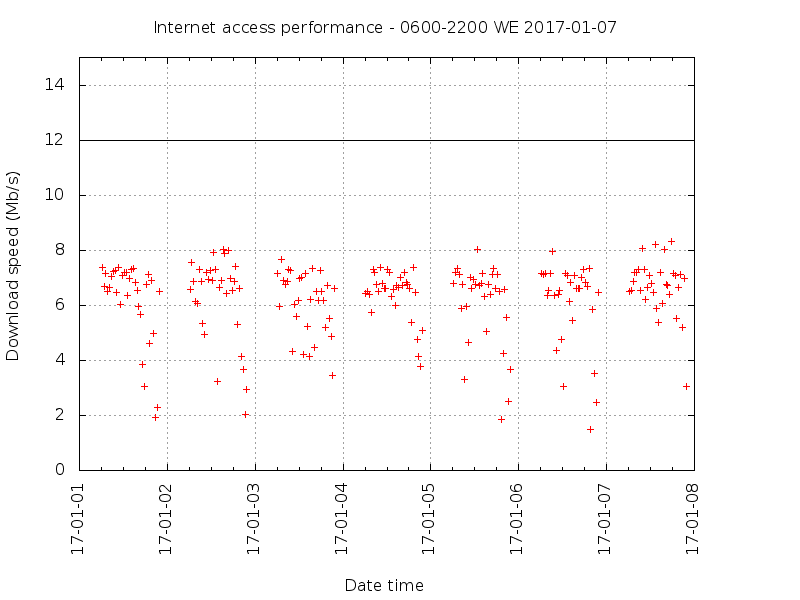 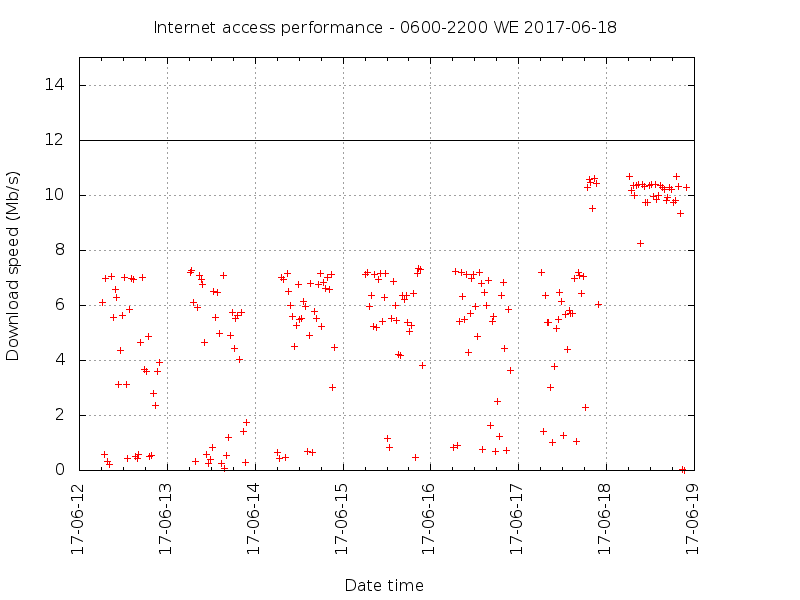 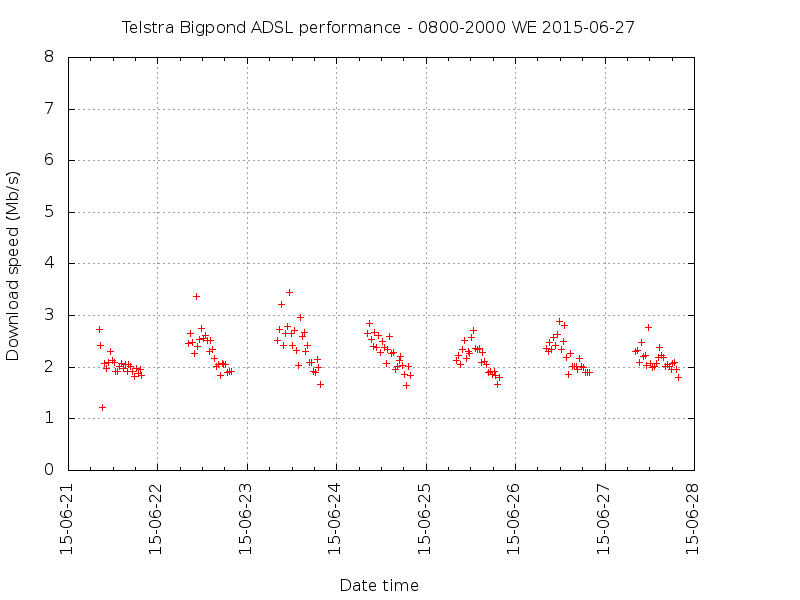 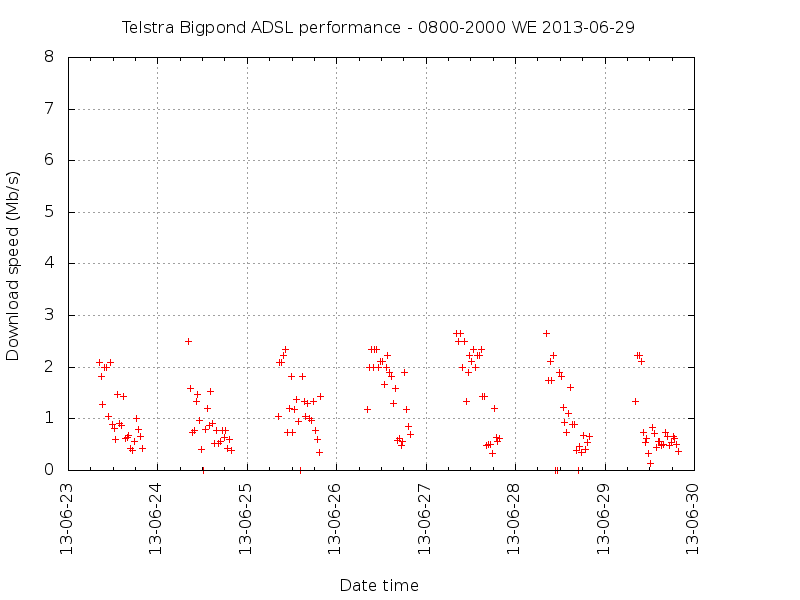 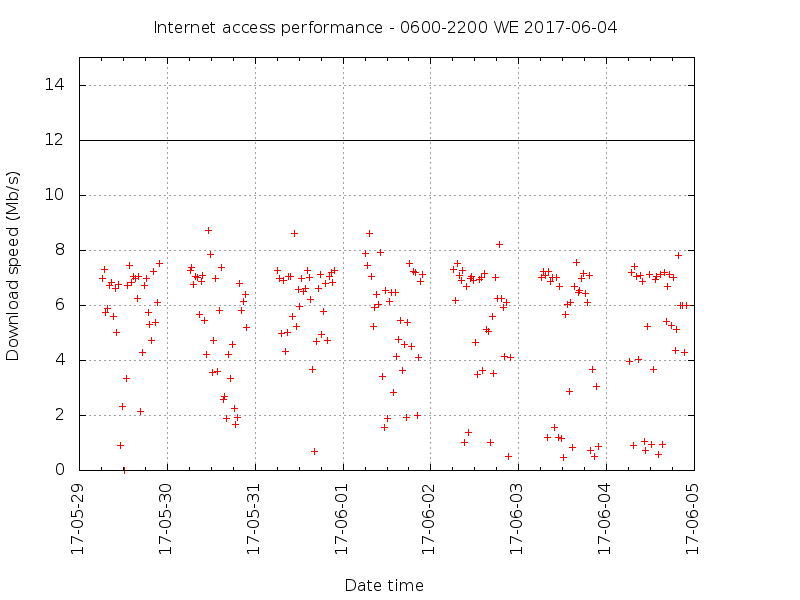 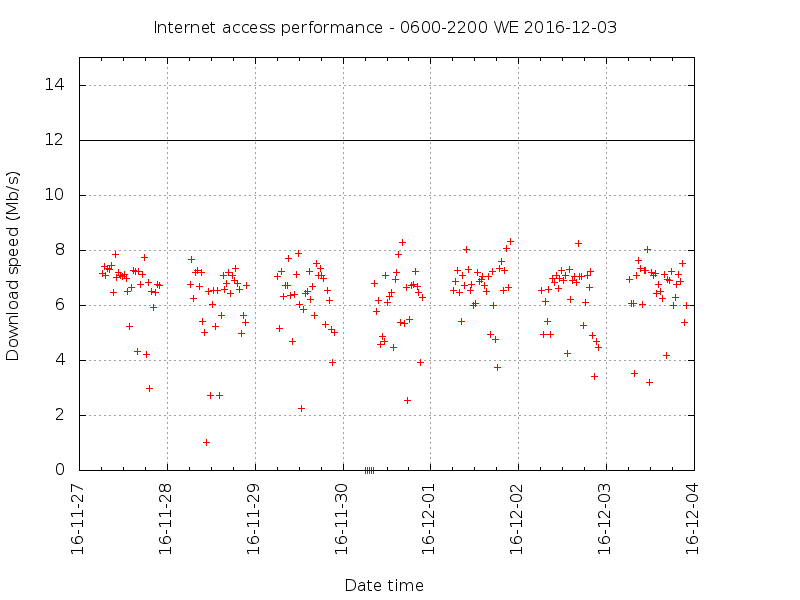 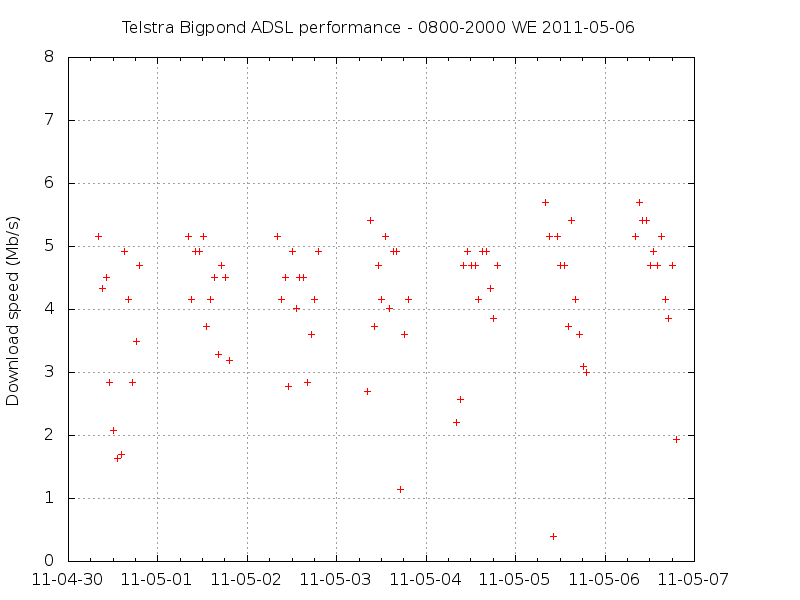 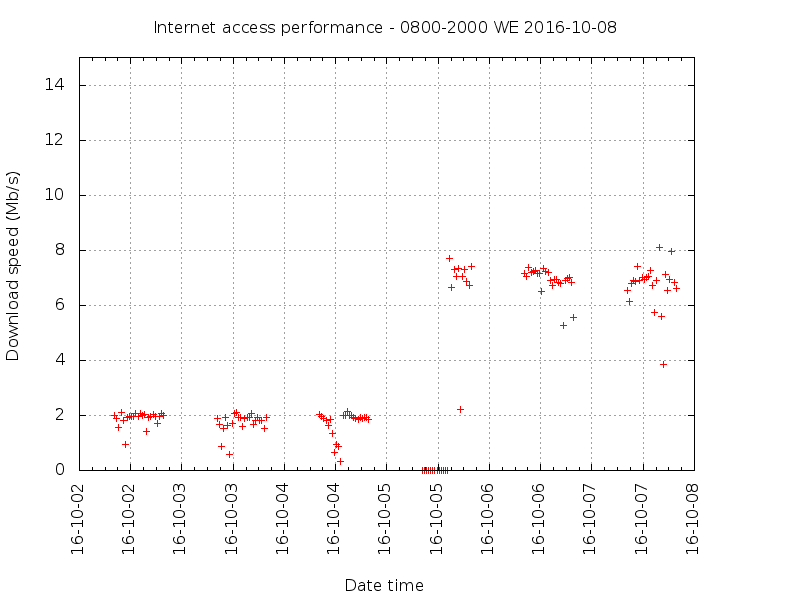 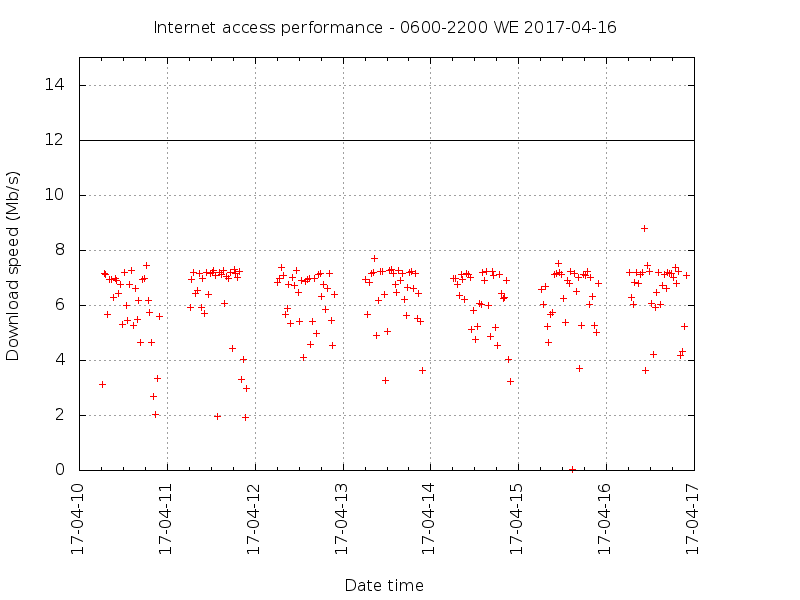 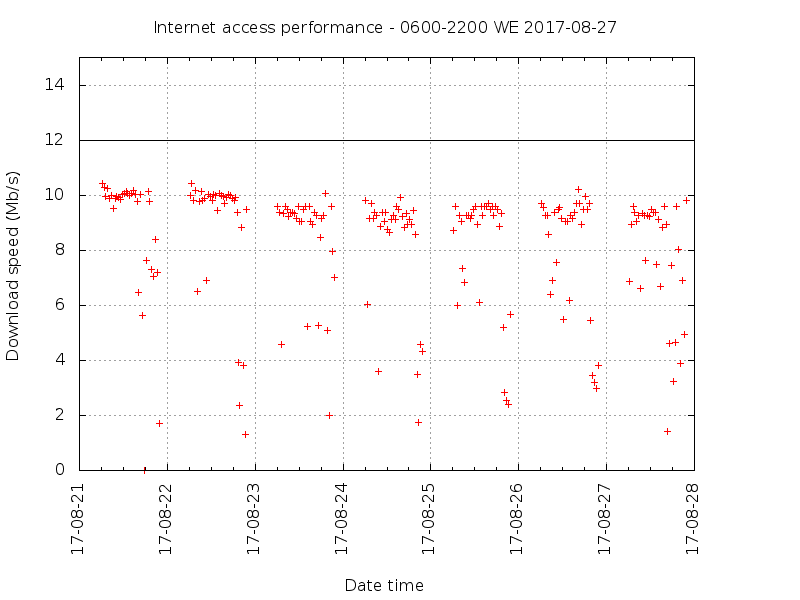 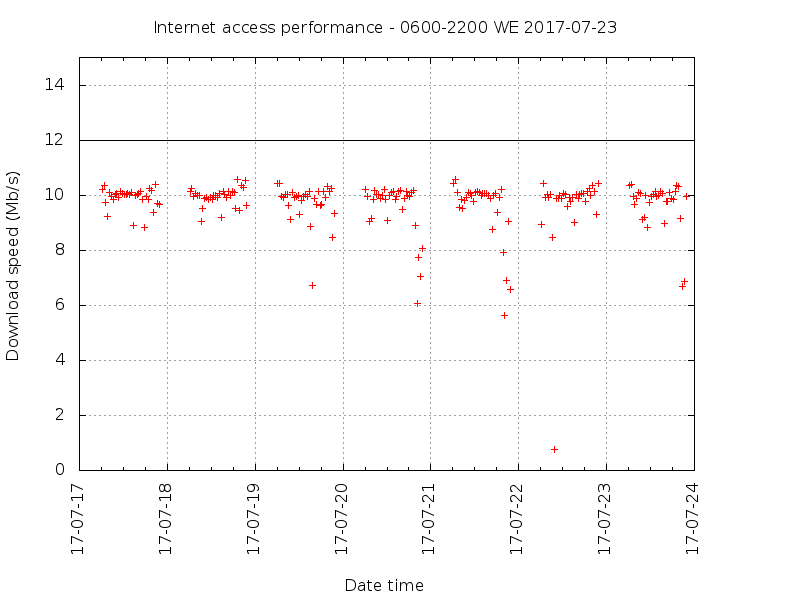 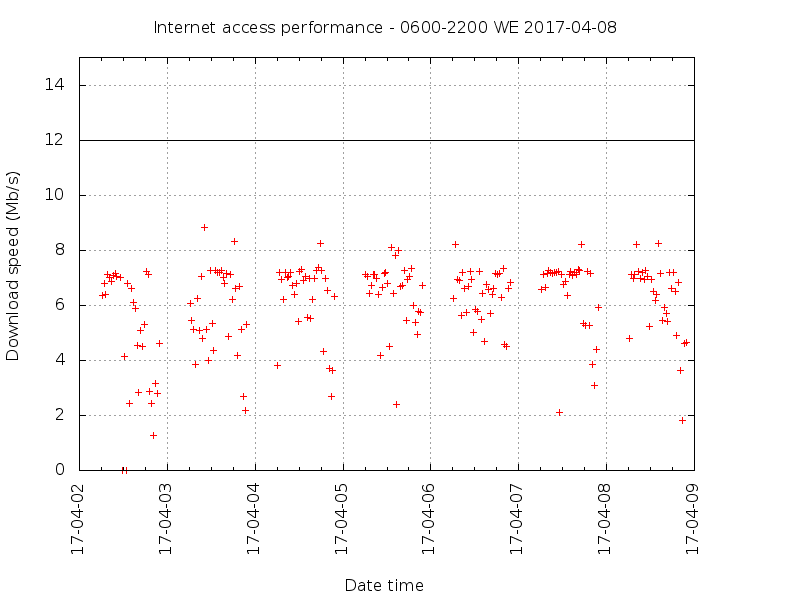 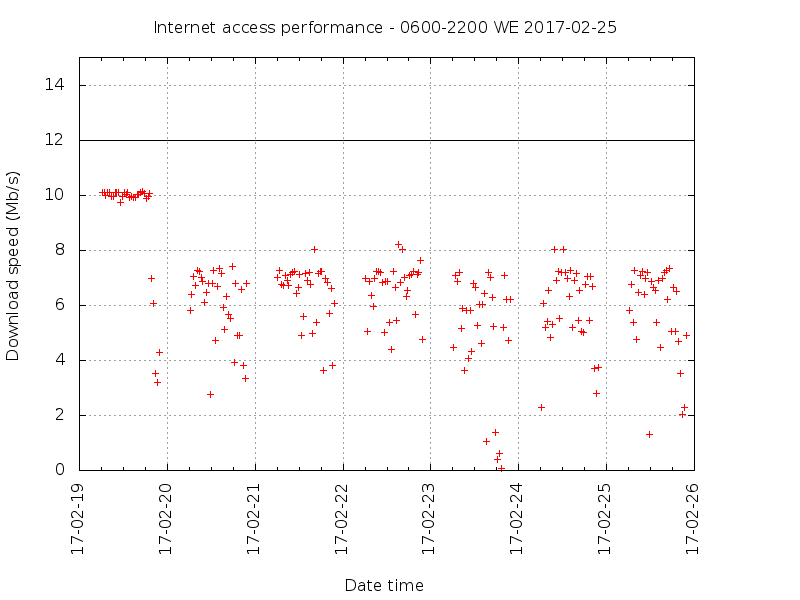 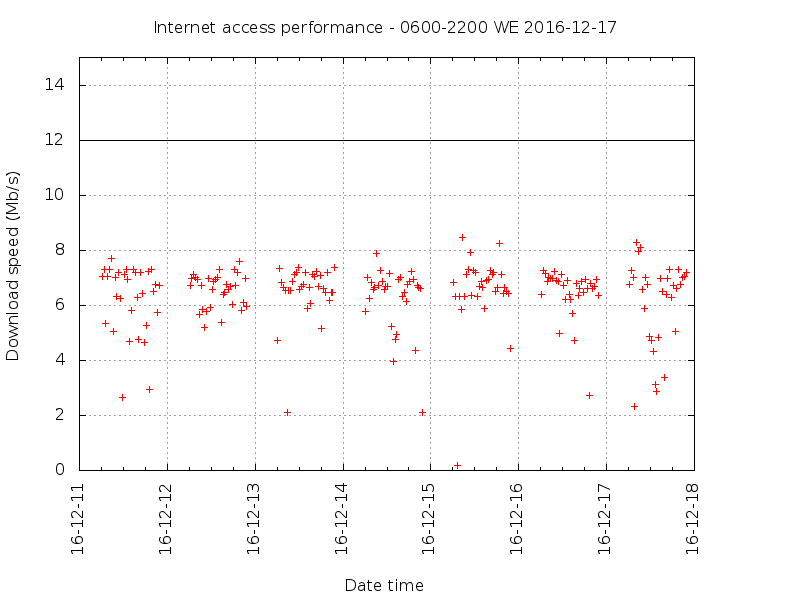 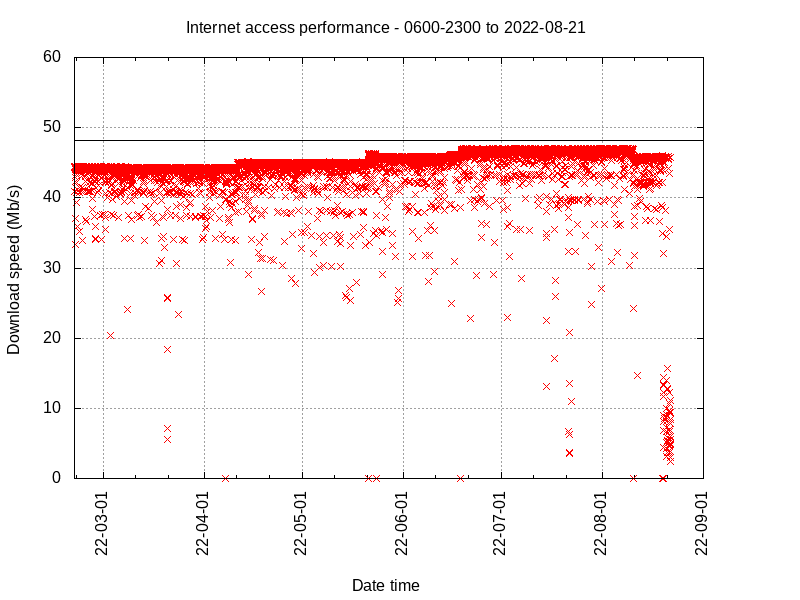 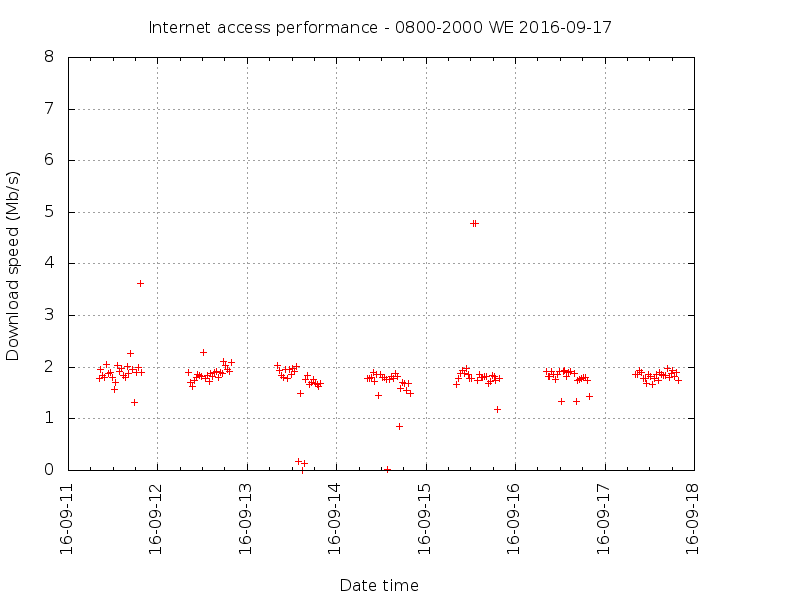 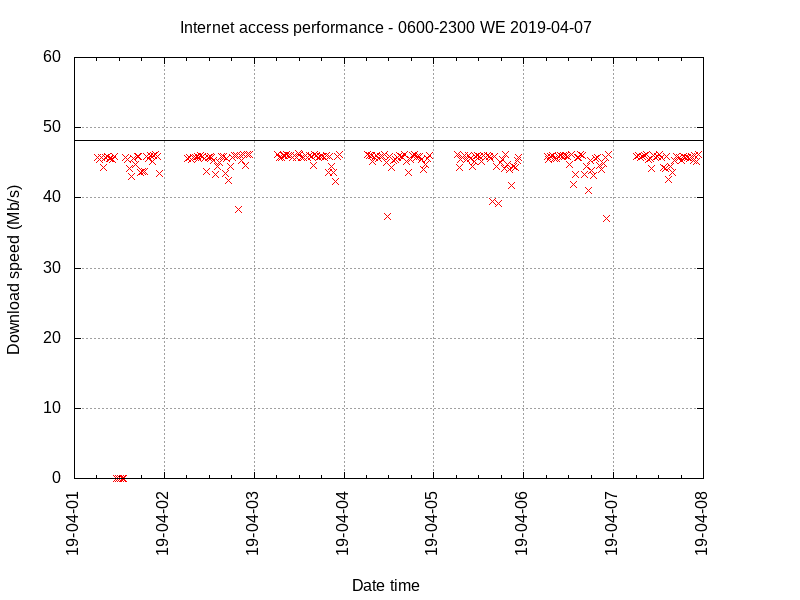 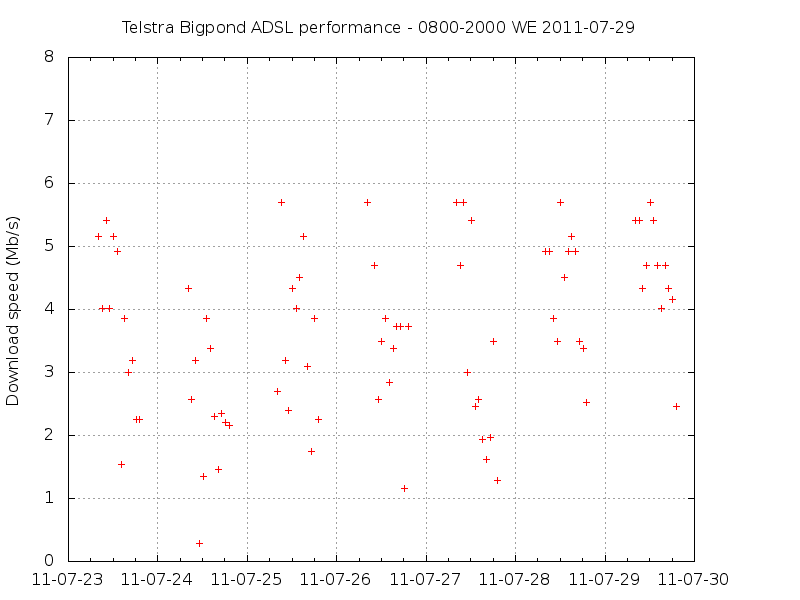 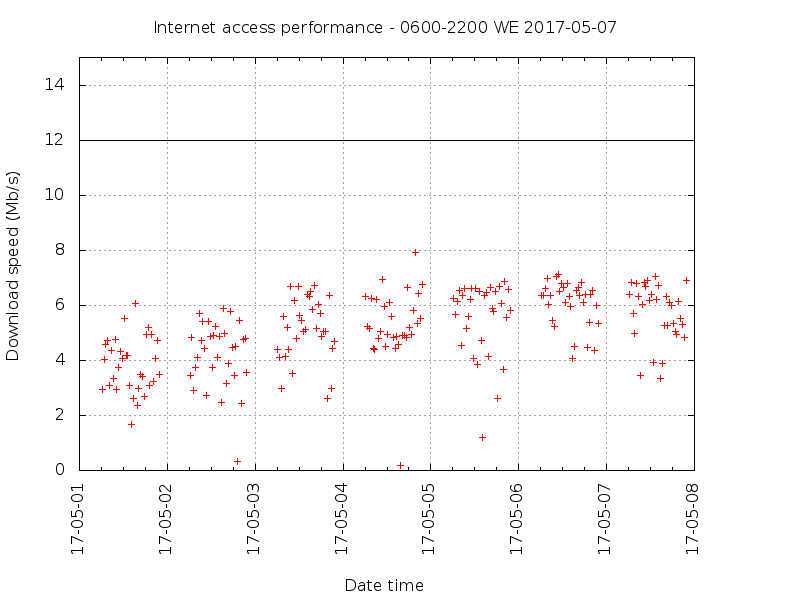 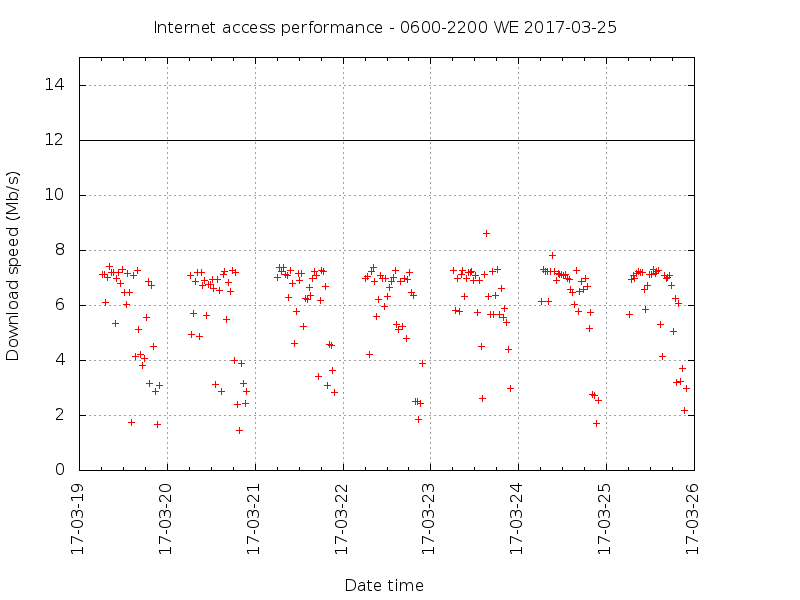 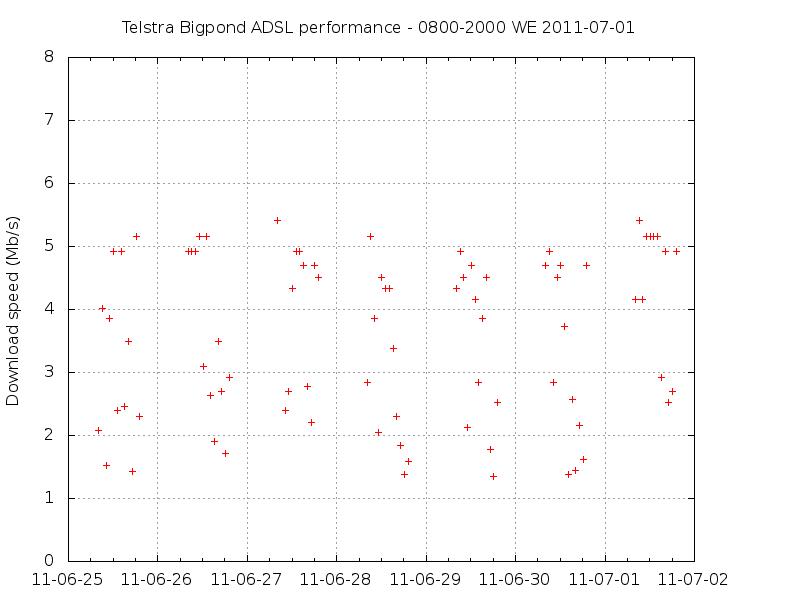 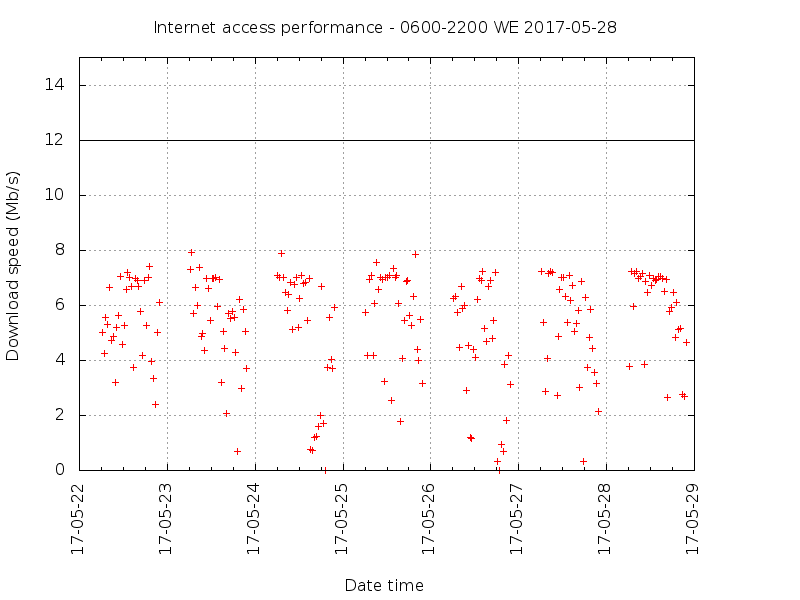 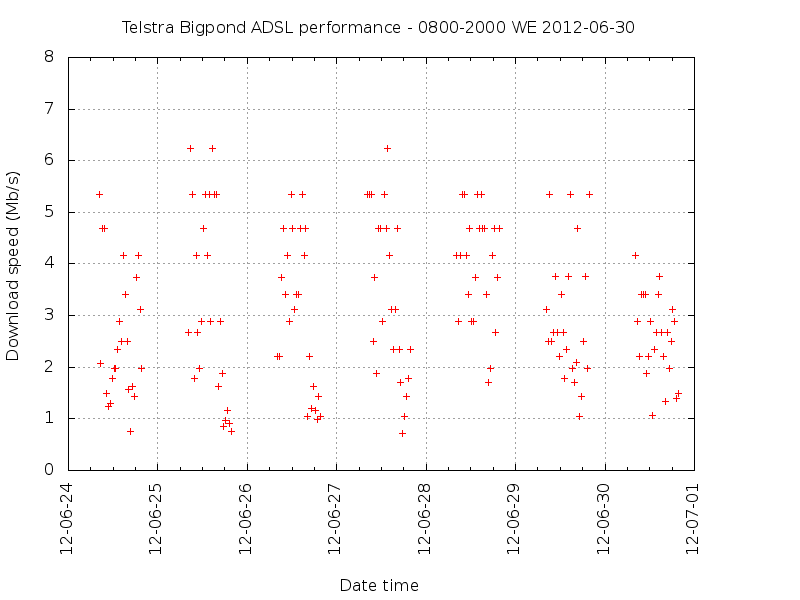 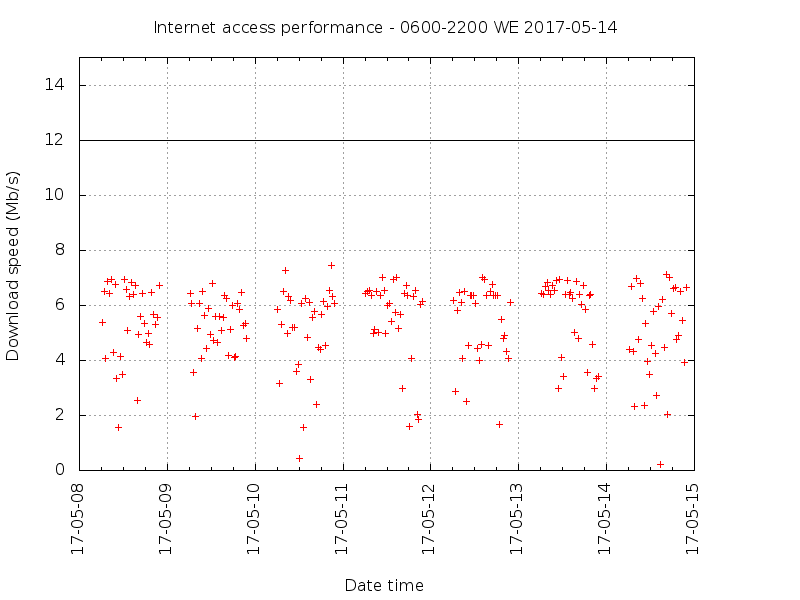 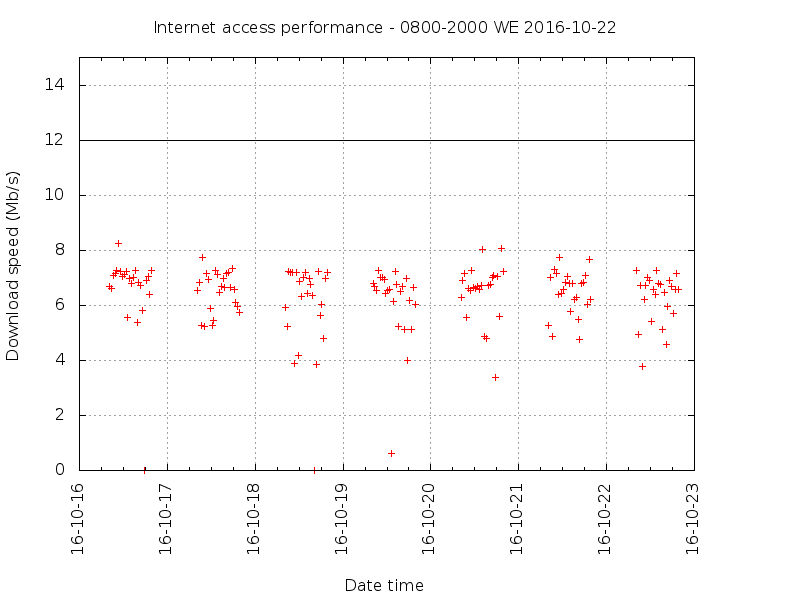 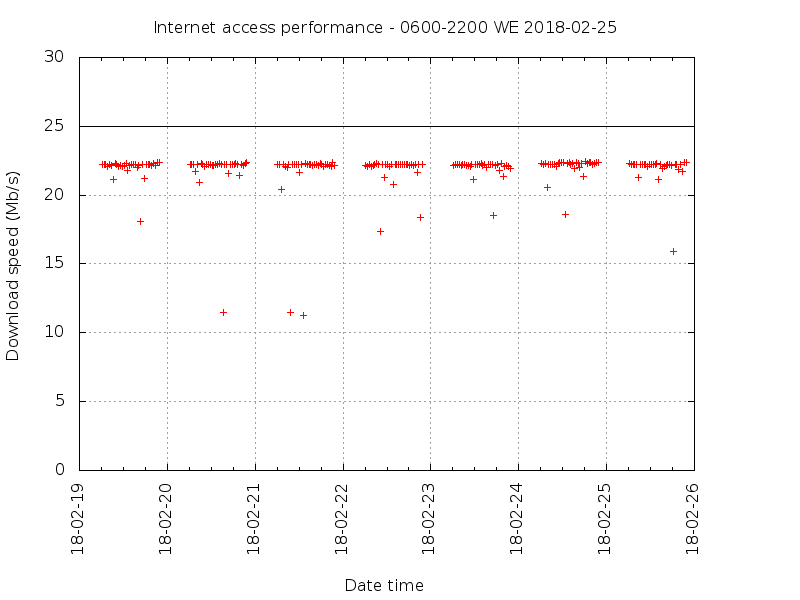 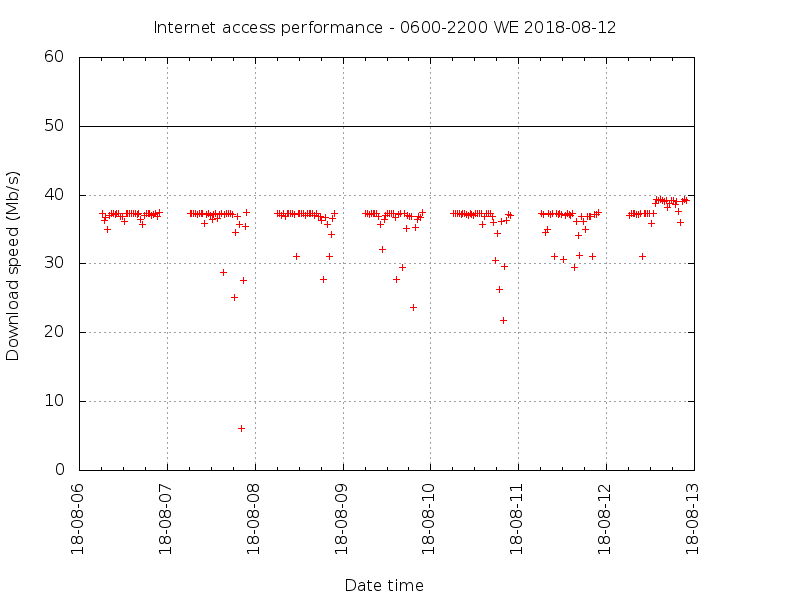 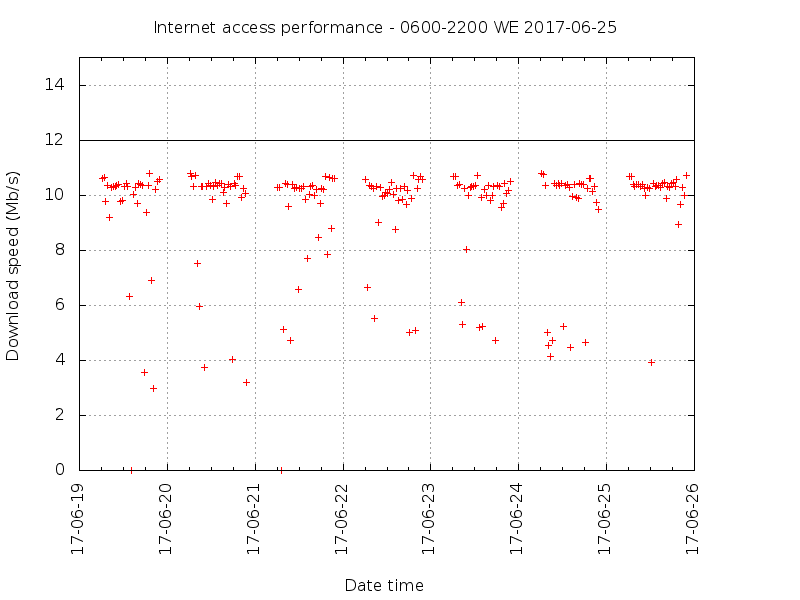 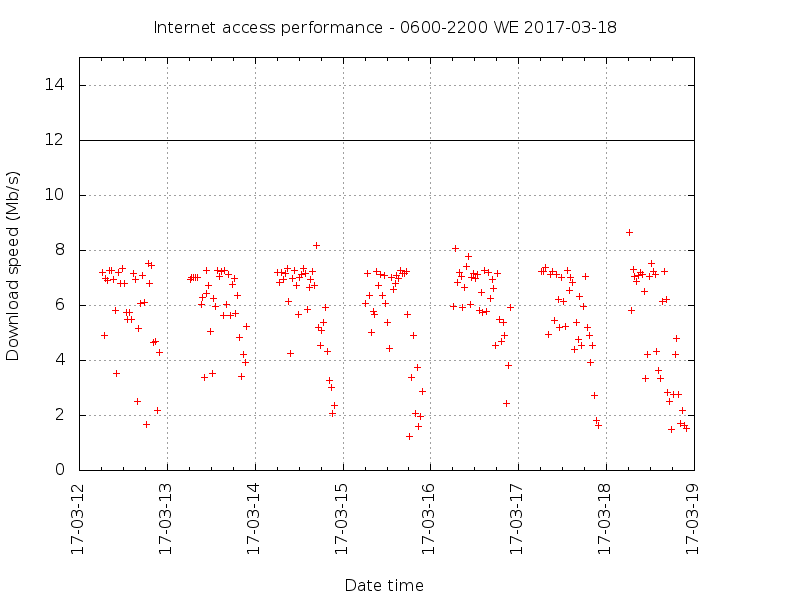 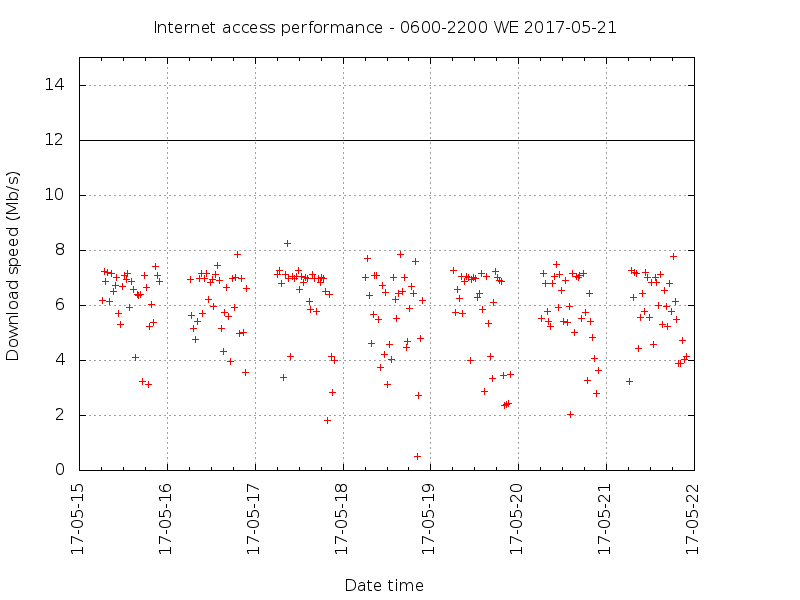 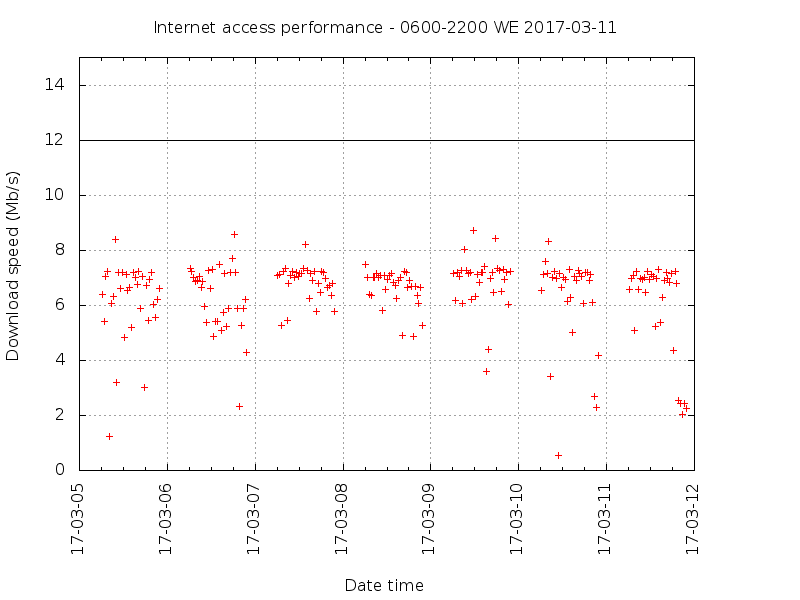 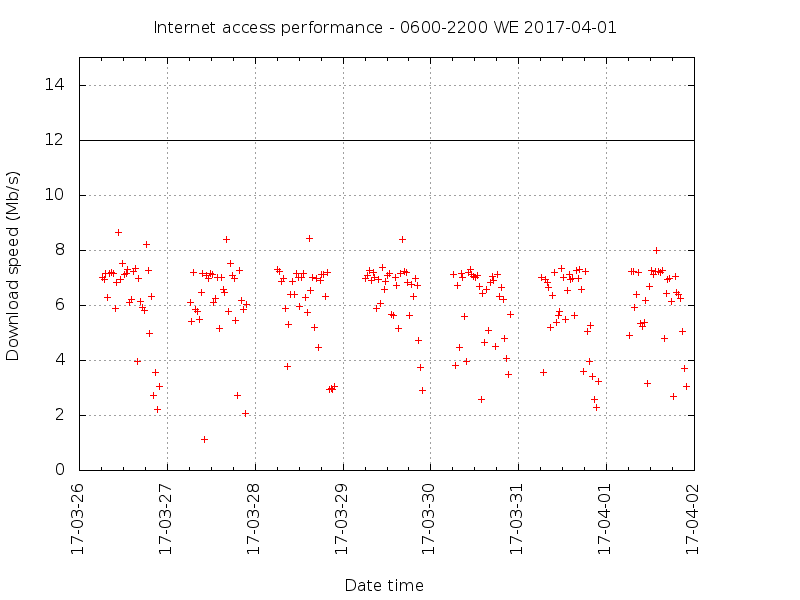 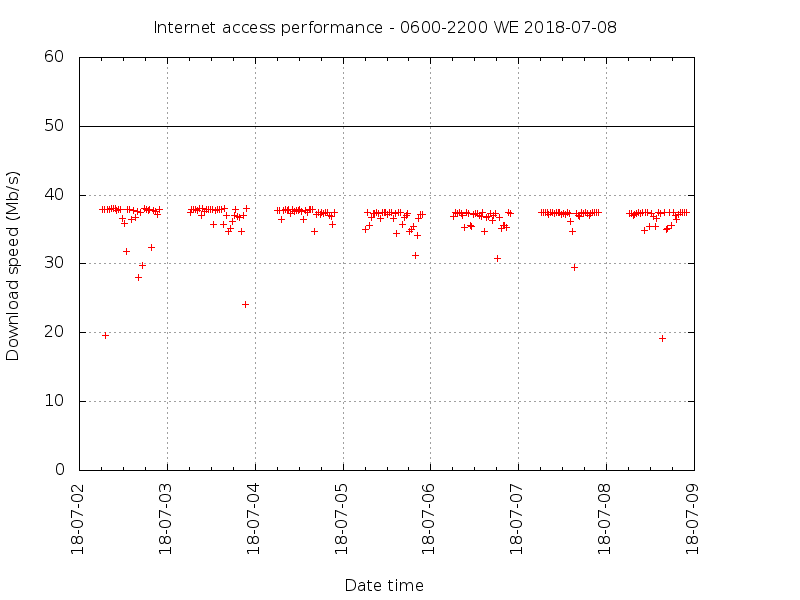 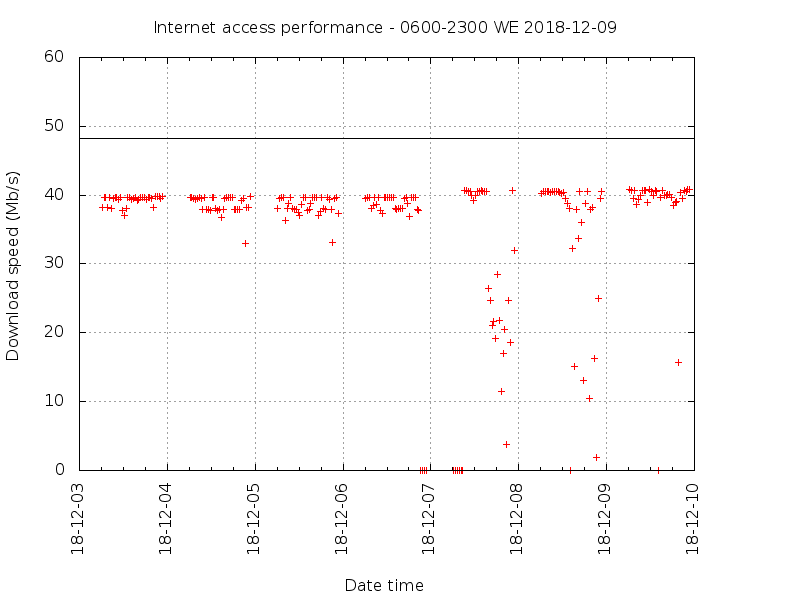 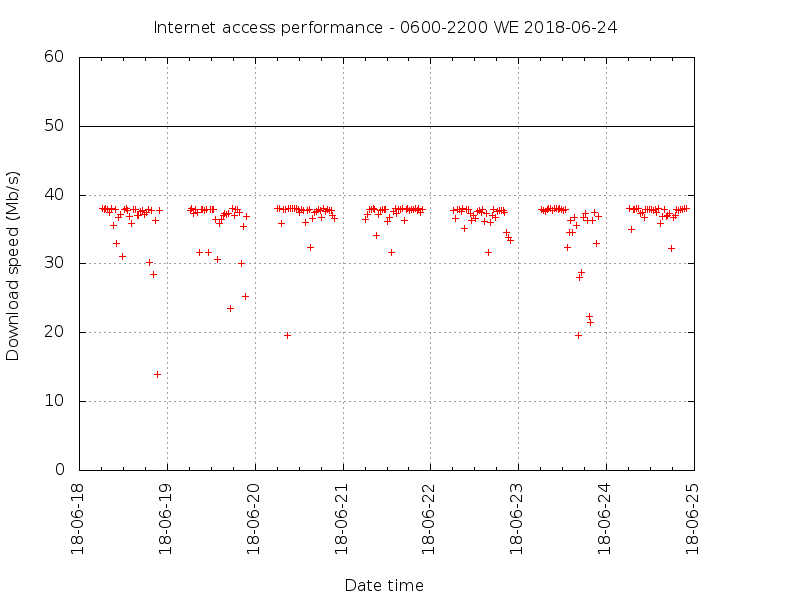 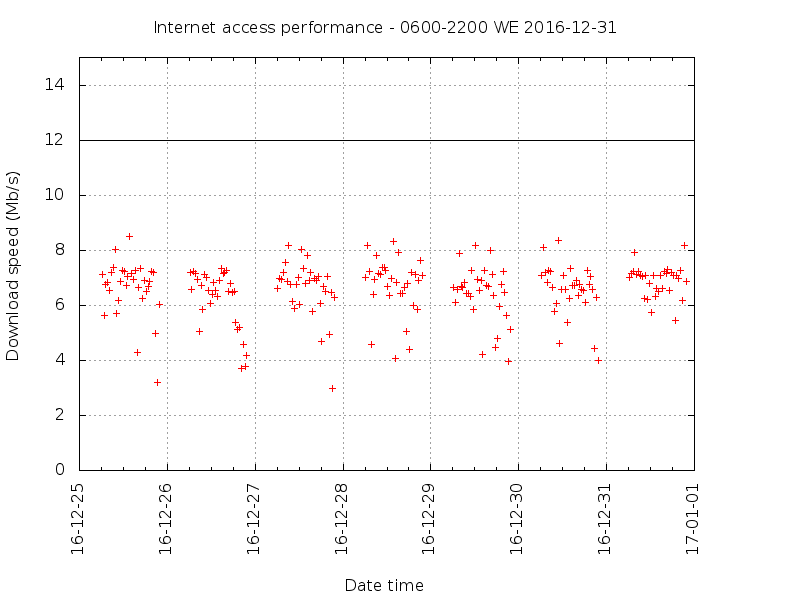 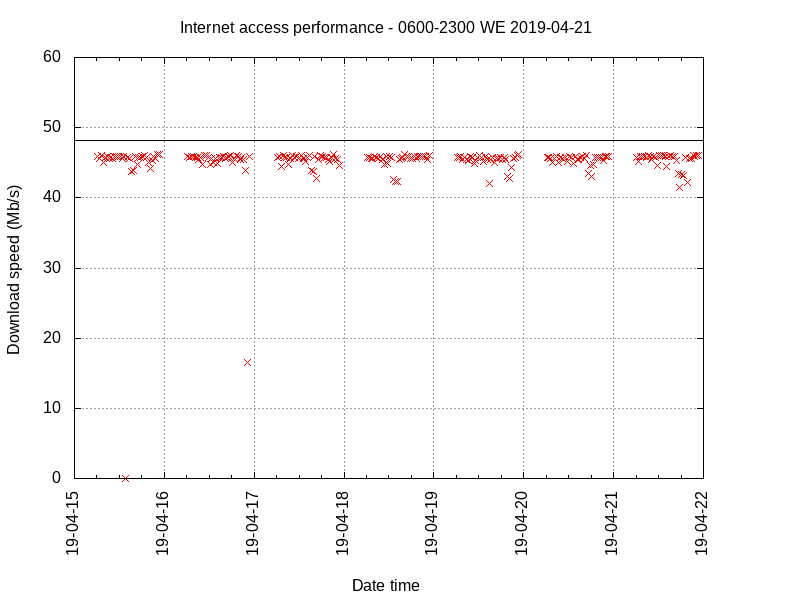 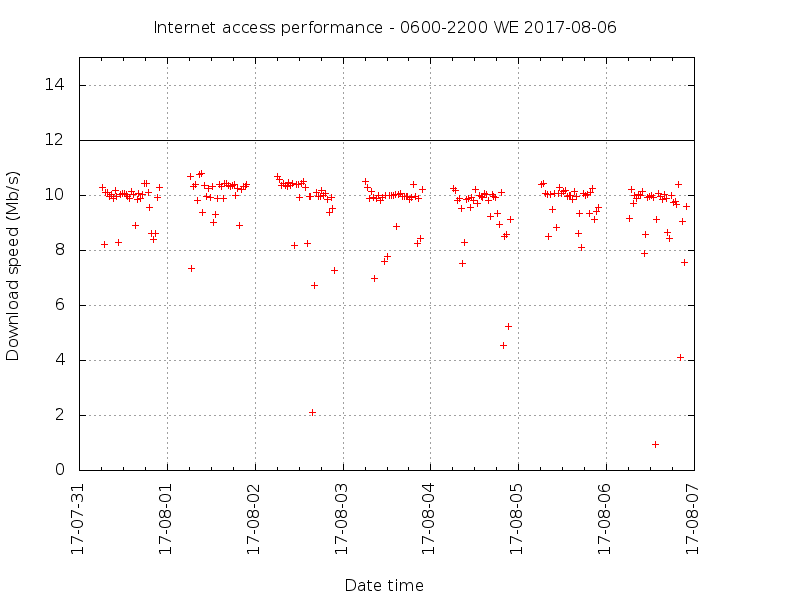 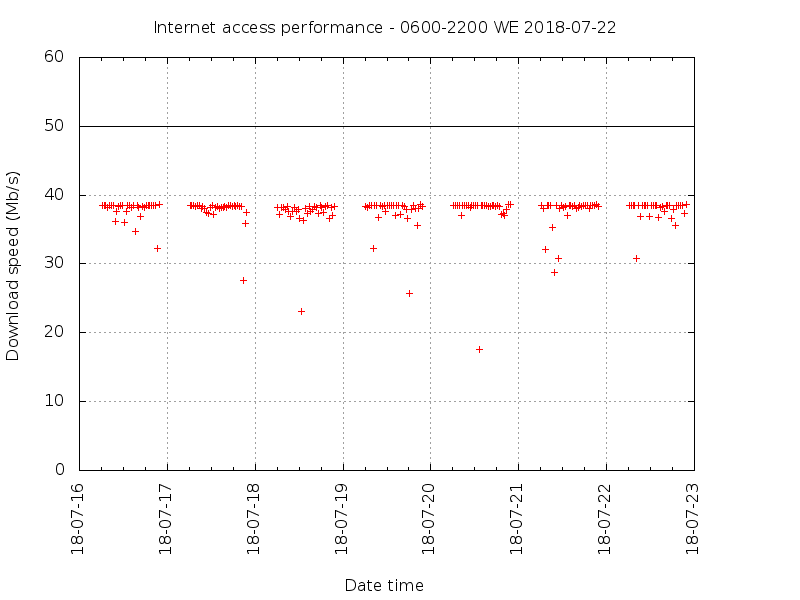 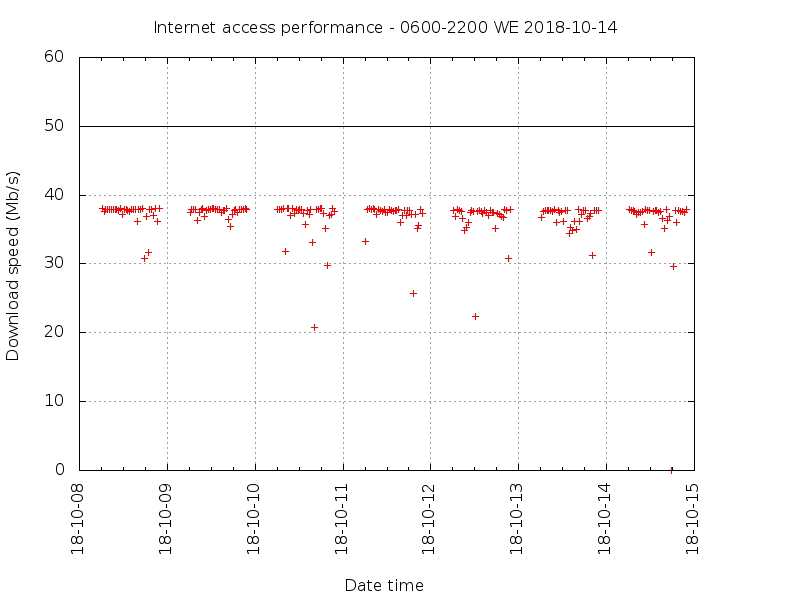 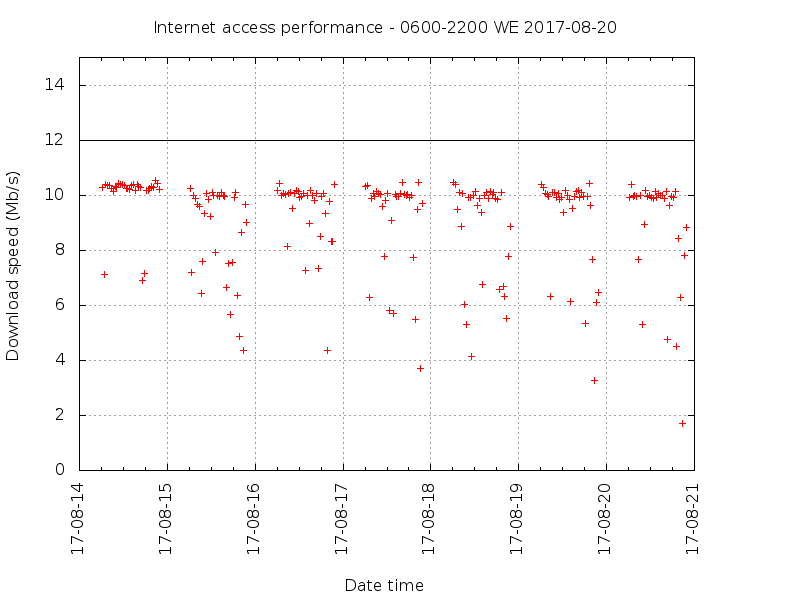 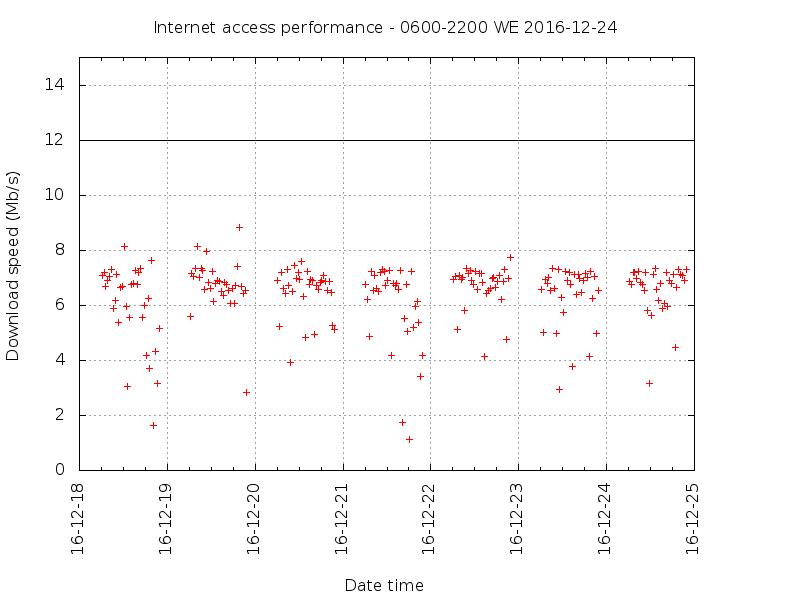 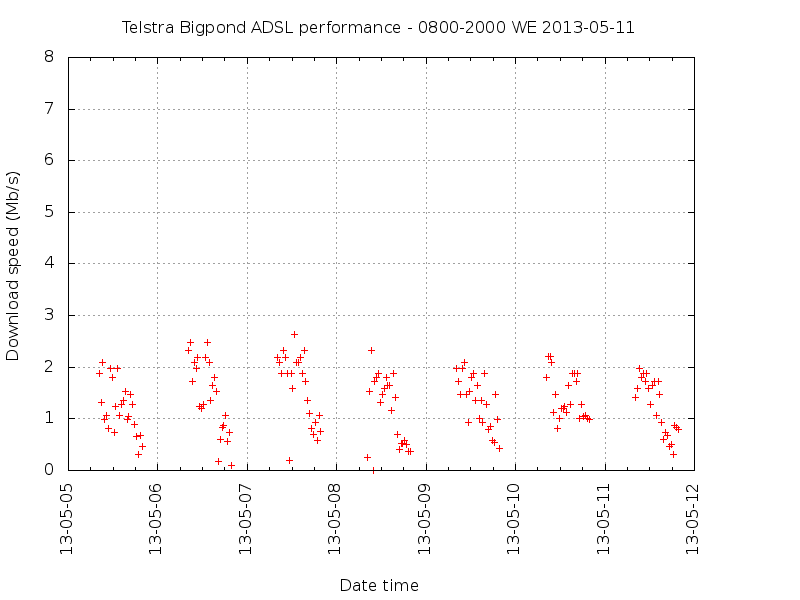 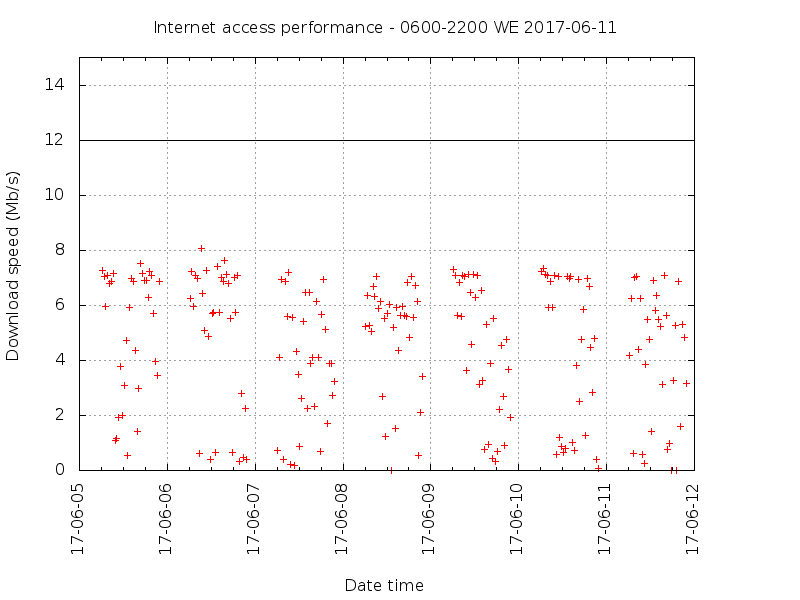 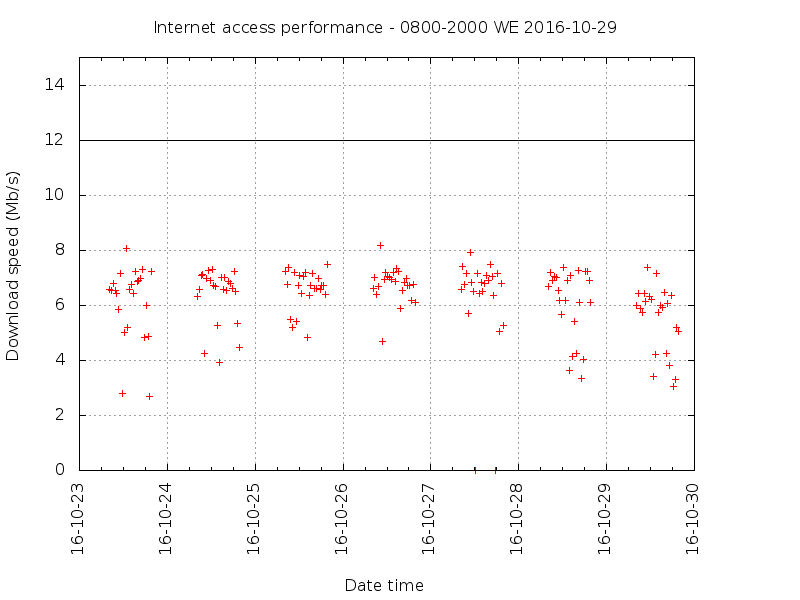 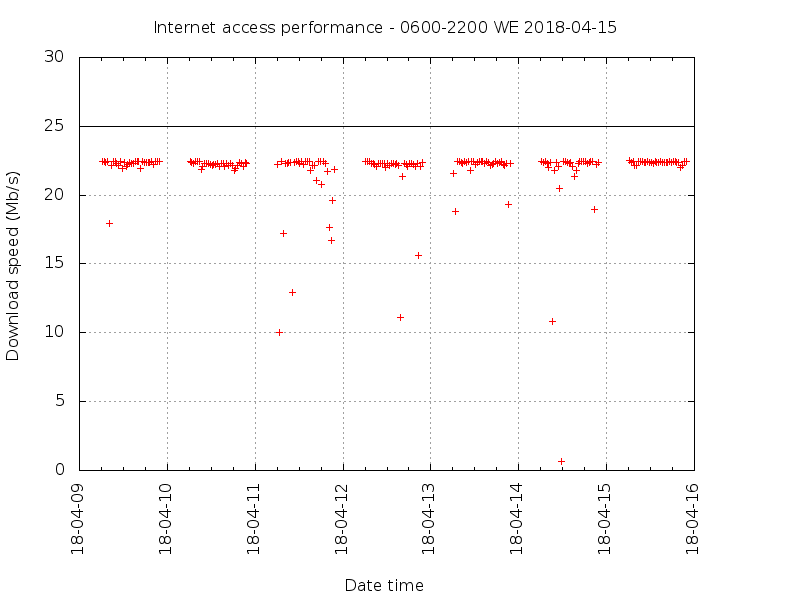 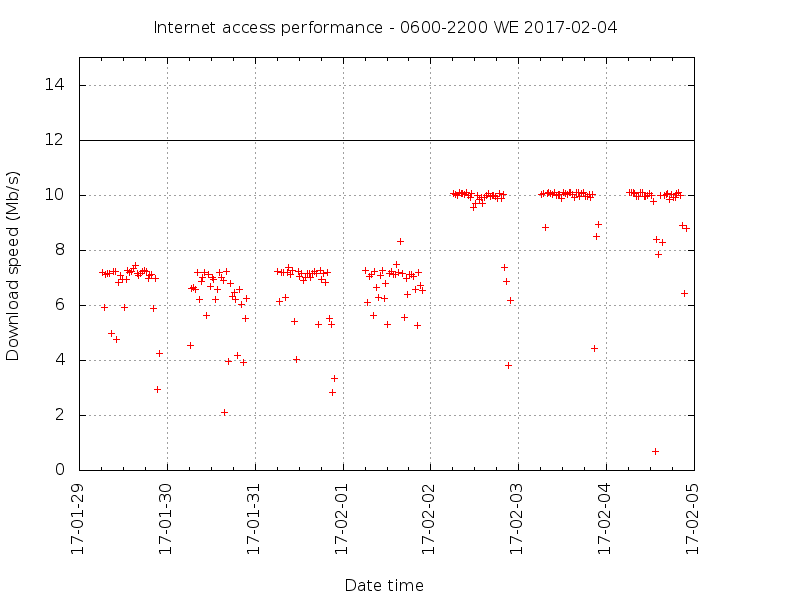 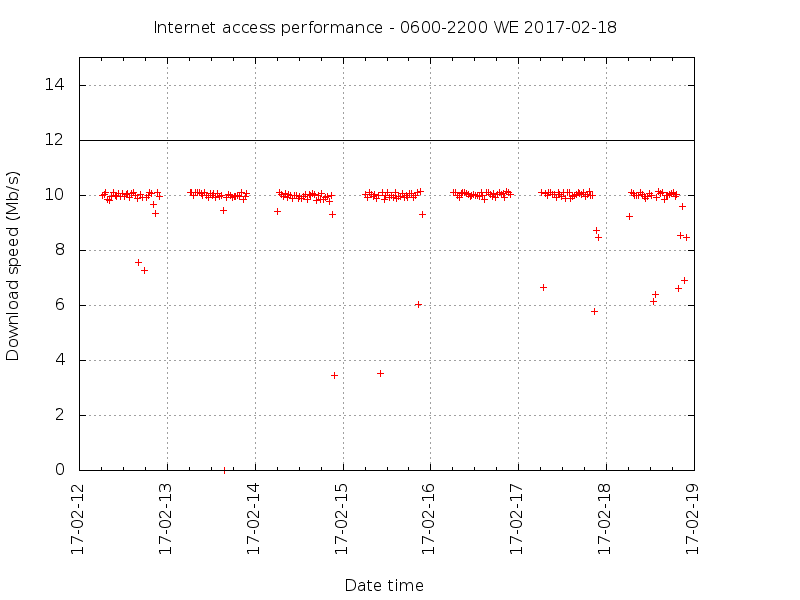 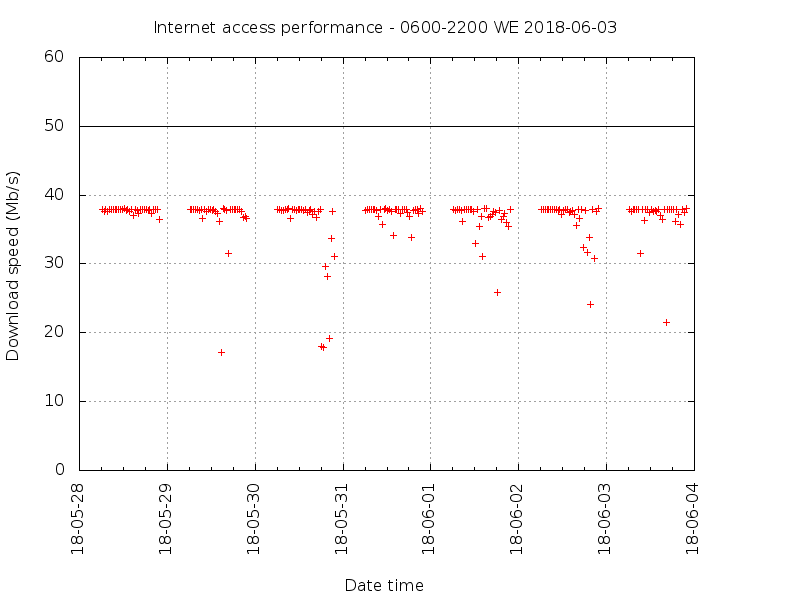 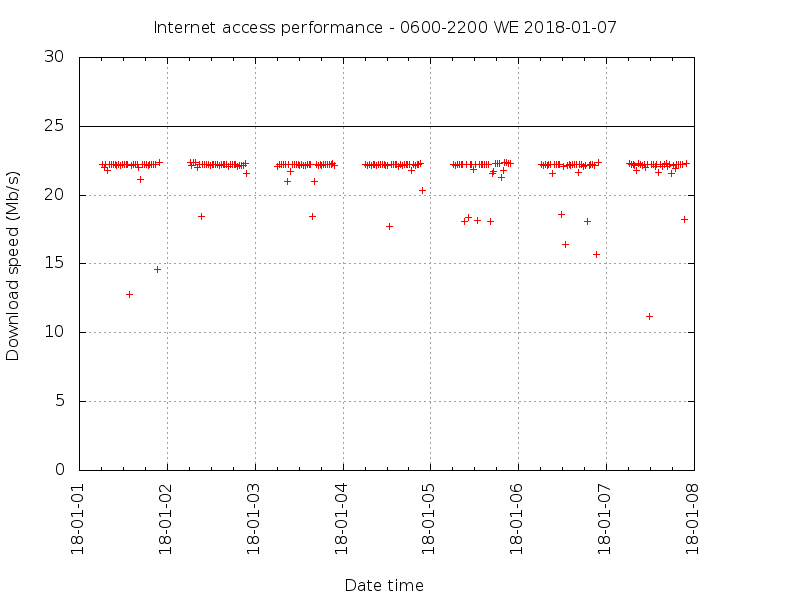 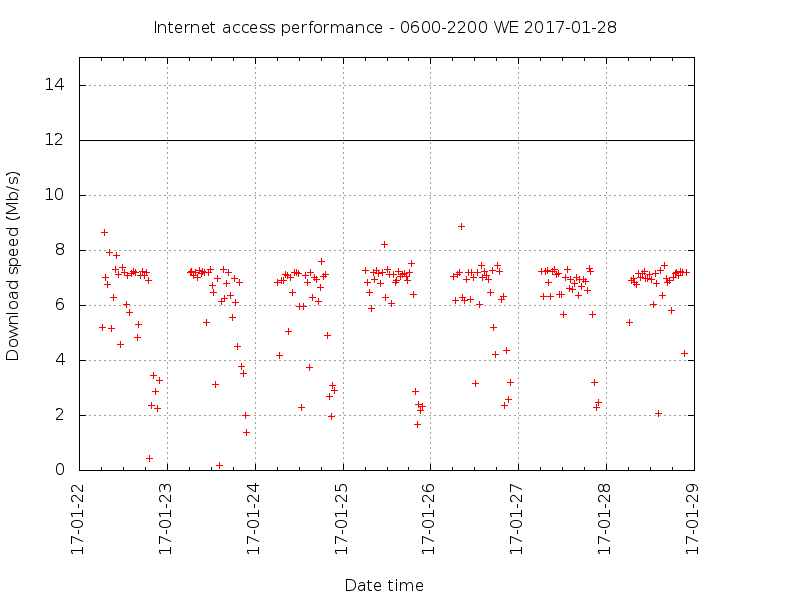 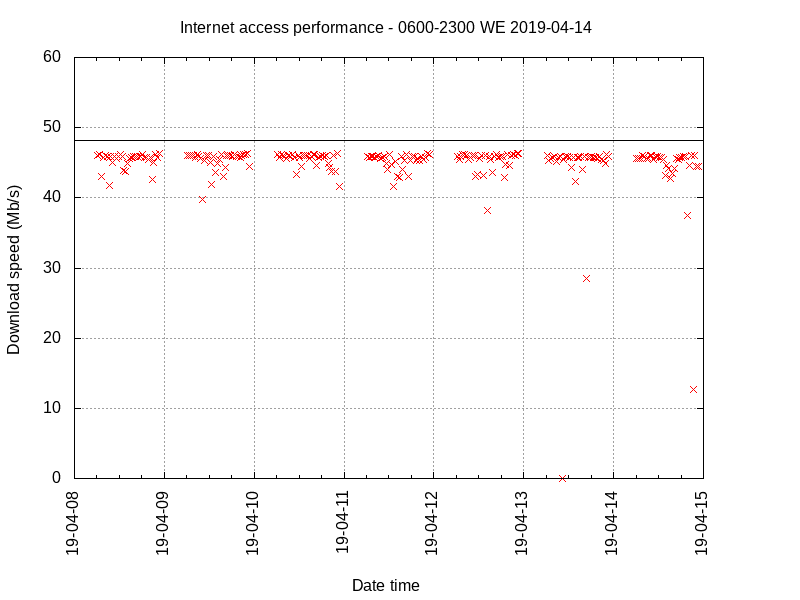 It does appear that some form of backhaul upgrade occurred after a short period of unannounced network unavailability around 03:00 on 24/05/2015. The ACCC sets minimum evening download speed for a set of product names. 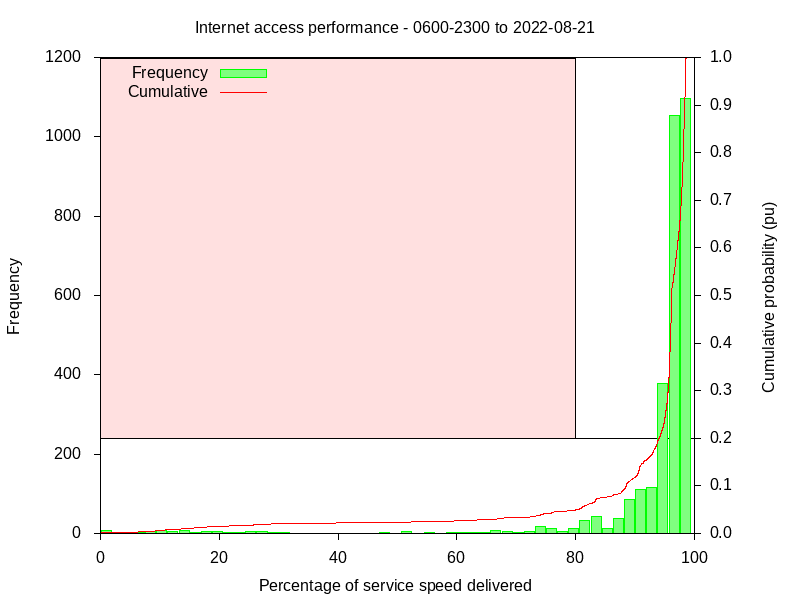 Any speed tests falling in the pink area are failures to meet the required minimum download speed. The threshold shown takes into account the ACCC threshold for the current service and allows the benefit to the RSP of the TCP/IP protocol overhead. The chart starts at the start date of the current service. 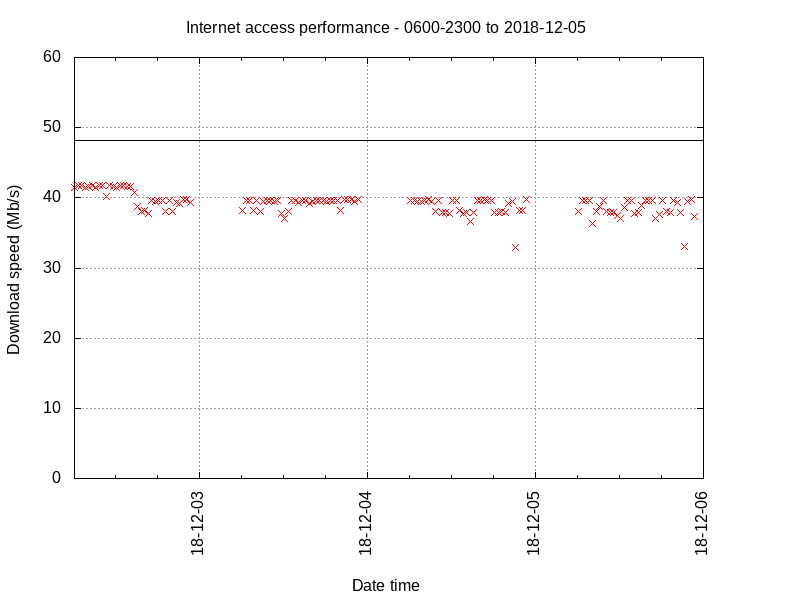 You may need to use the refresh button on your browser to update the graphs for yesterday. 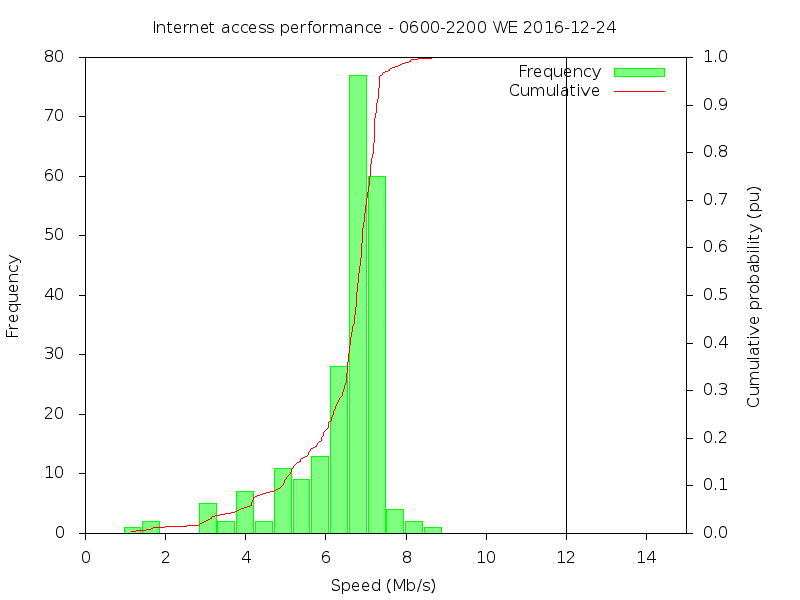 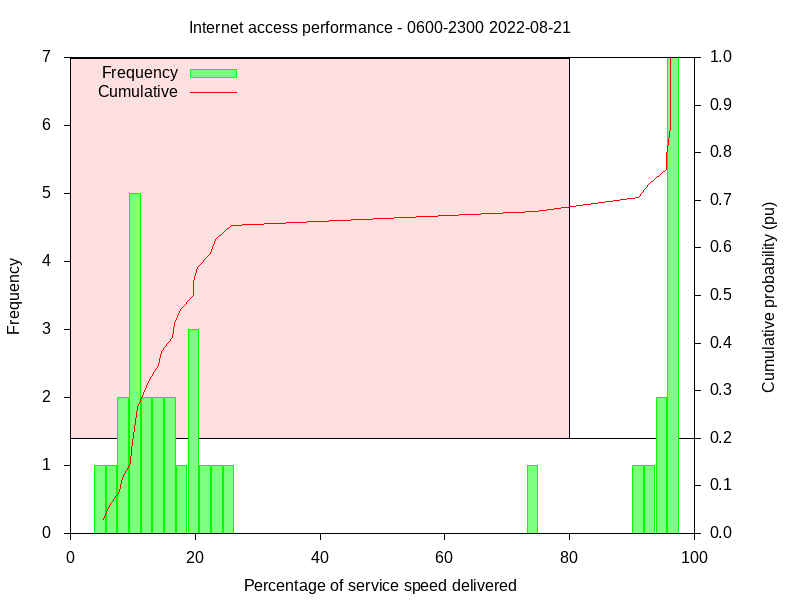 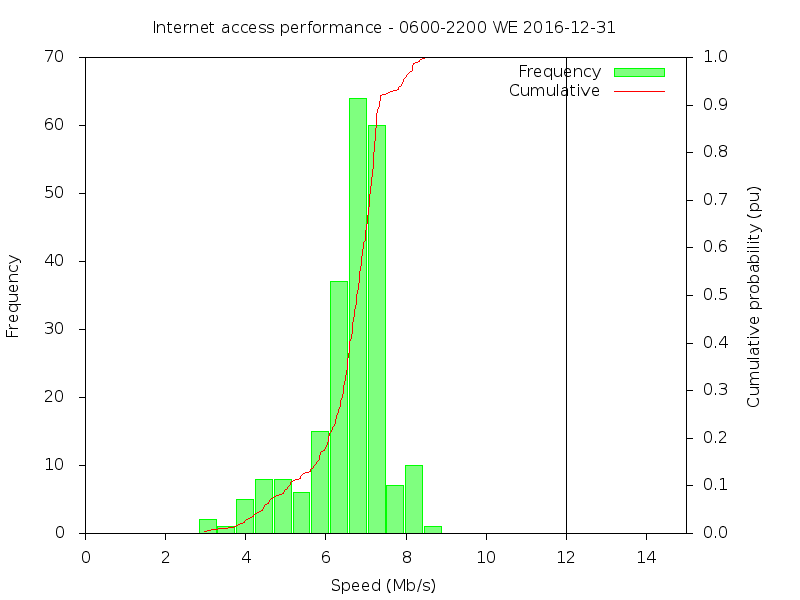 A datum line is shown for the current contracted access speed. Some speed tests may indicate higher values, but they are proprietary in nature and not representative of real network traffic leading typically to inflated speeds under light traffic conditions. The test reported here uses downloads a 'nearby' file using HTTP. 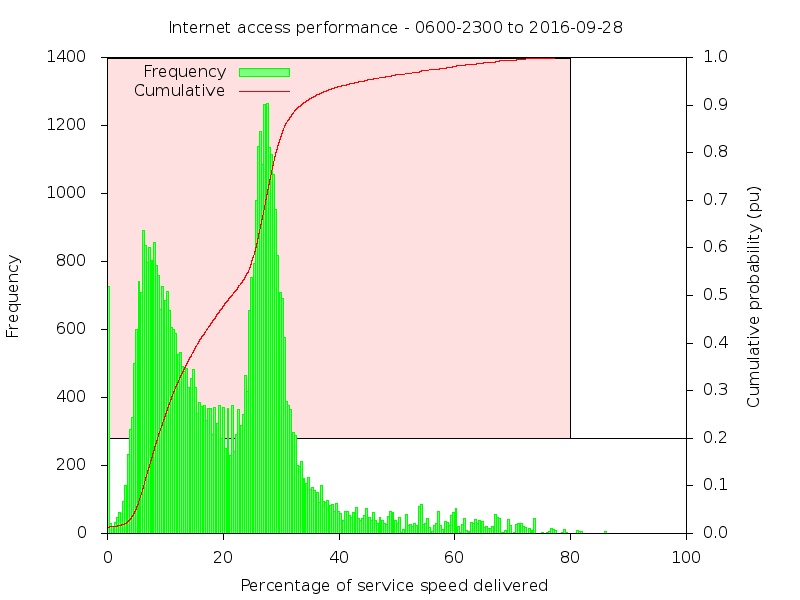 Above, frequency histogram and cumulative probability of download speed yesterday. Yesterday's median speed: Mb/s, % of Mb/s. 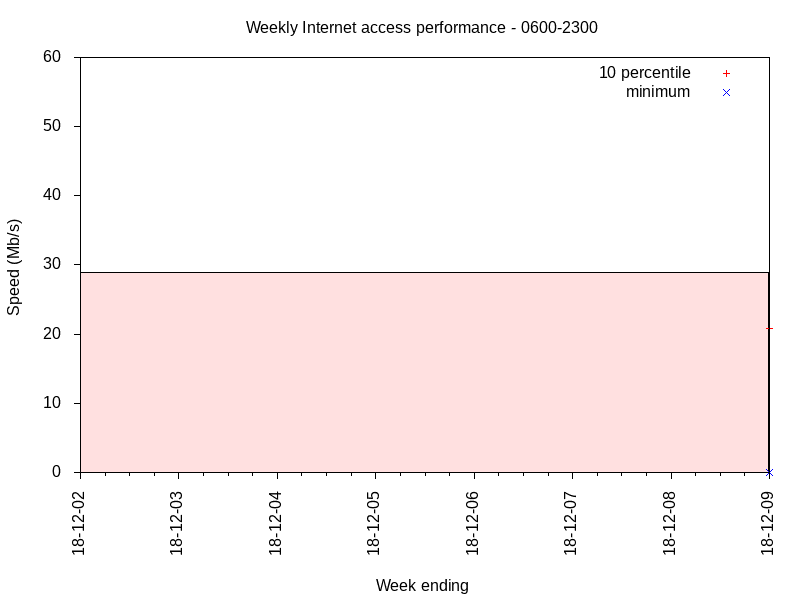 Last week - week ending: . 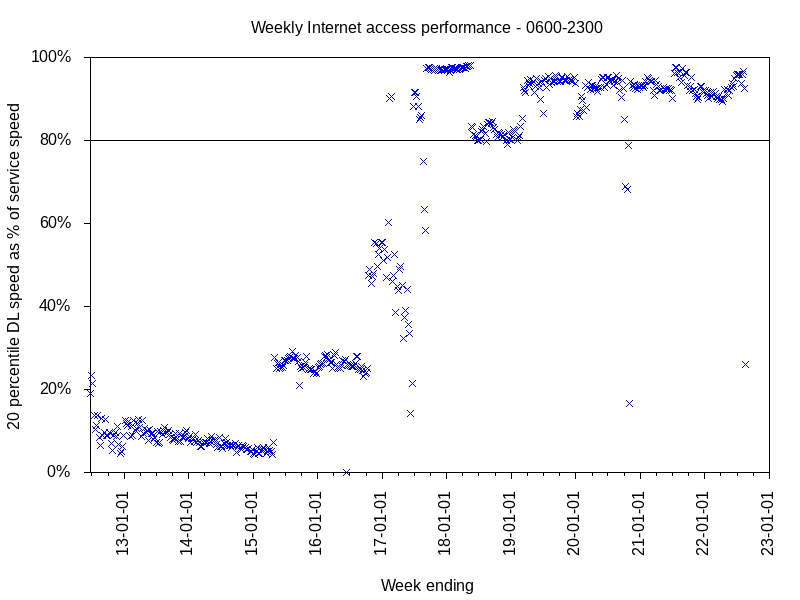 Above, download speed over the week. 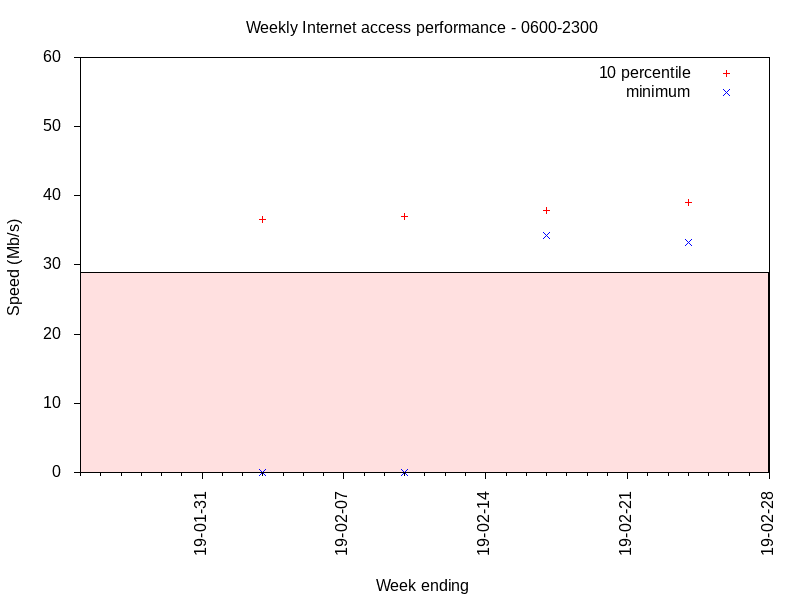 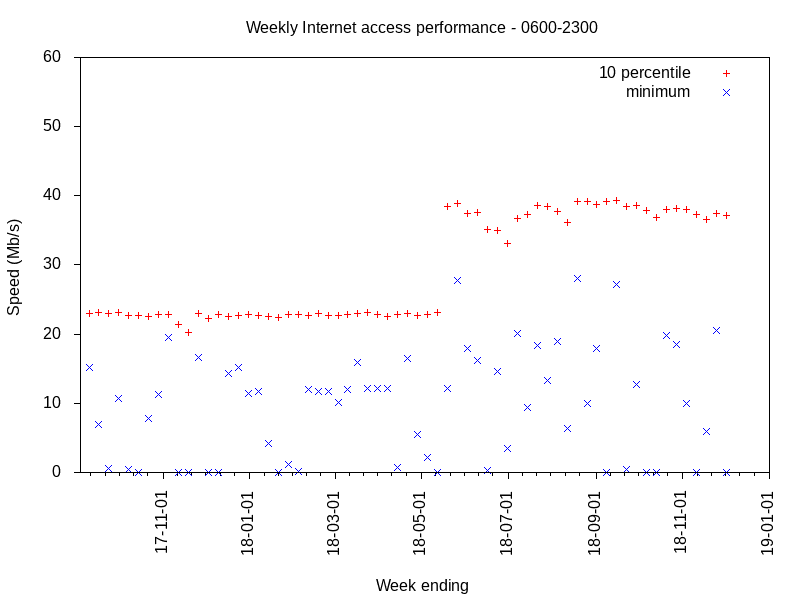 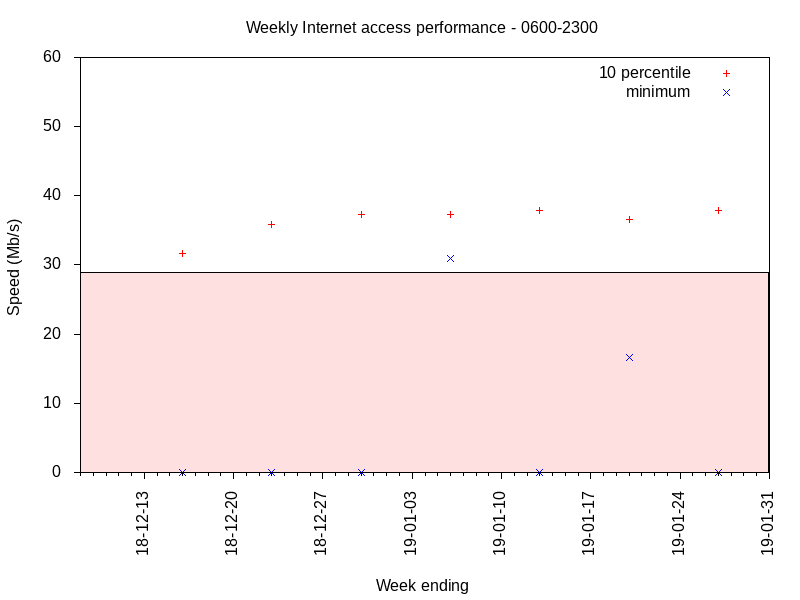 Above, frequency histogram and cumulative probability of download speed over the week. 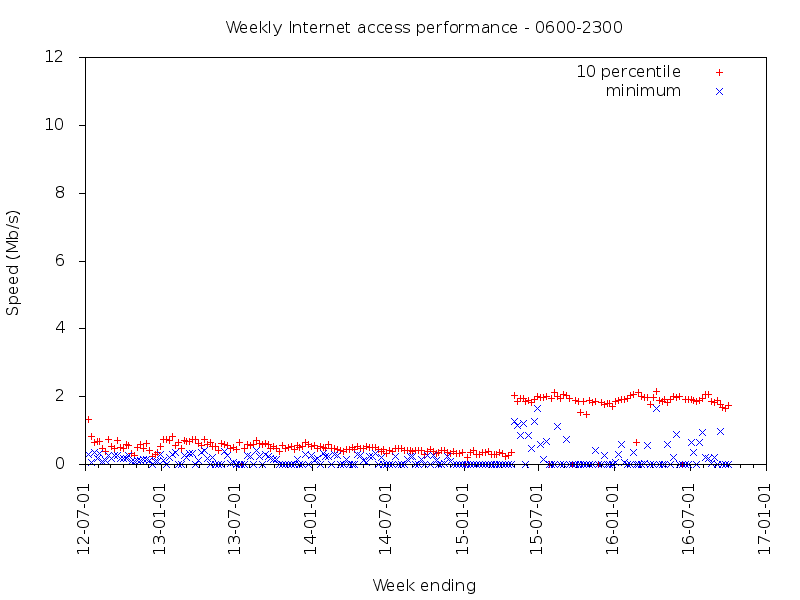 Above, percentile download speed history. 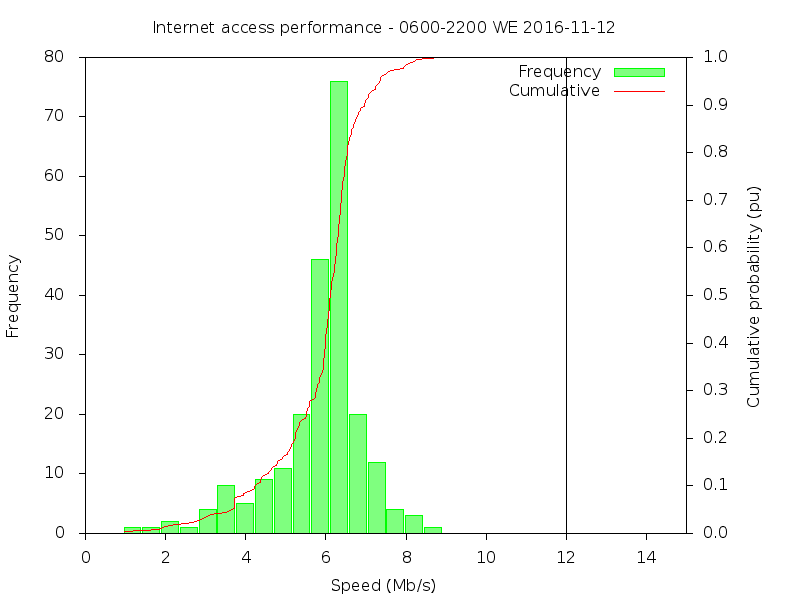 Below is an archive of graphs of speed and frequency distribution.